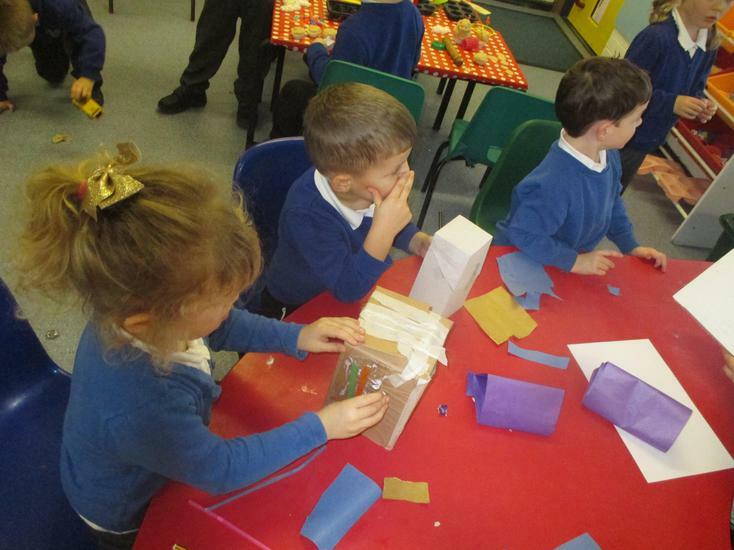 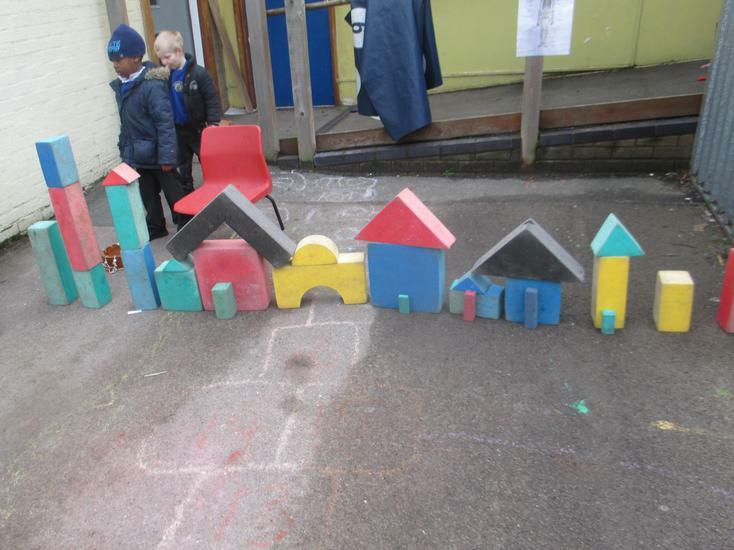 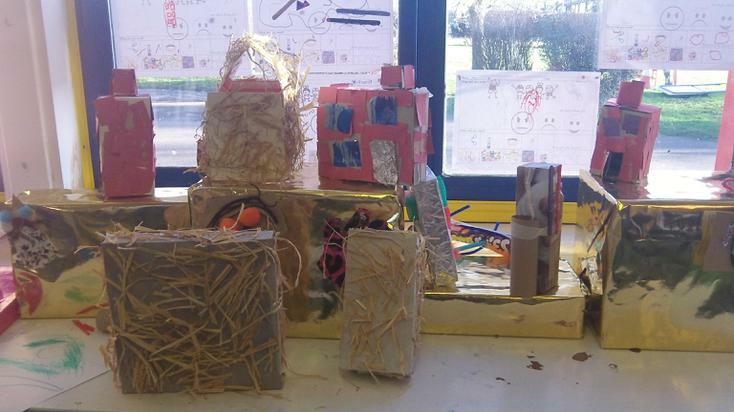 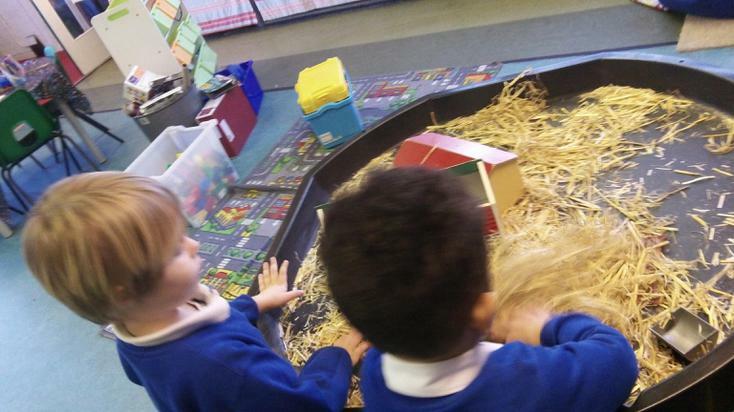 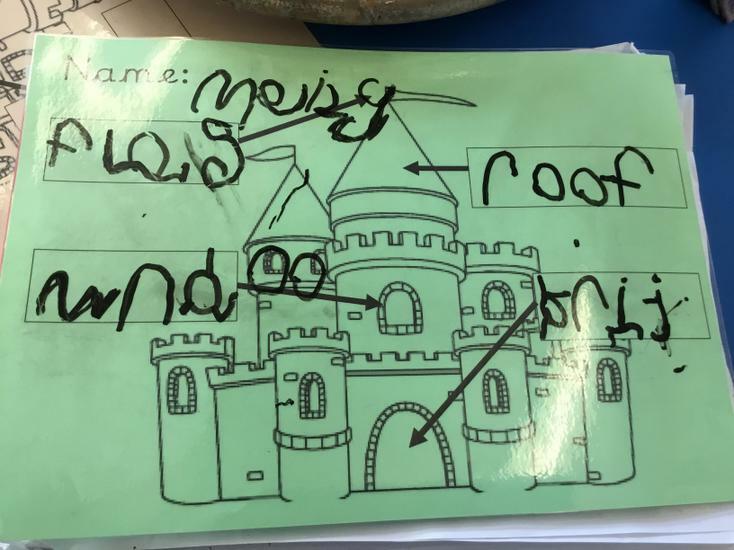 This term we are excited to learn around our topic of 'Houses and Homes'. 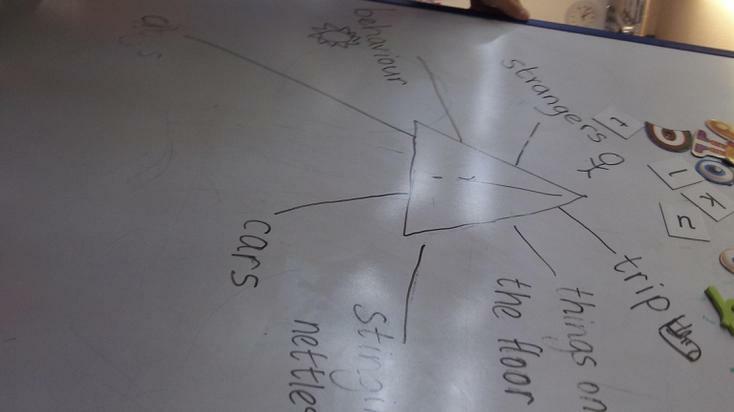 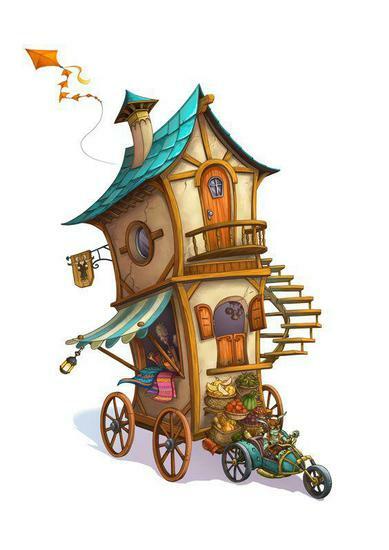 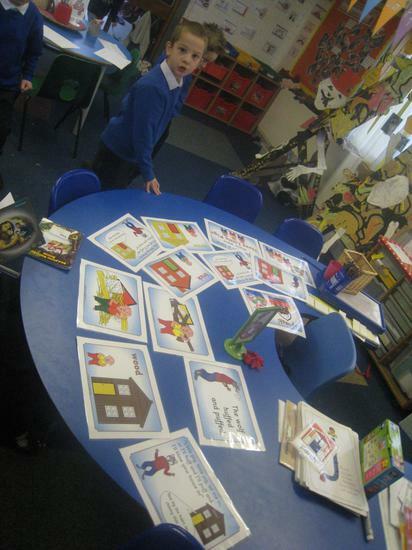 We will start the term by learning an abundance of new vocabulary to describe the homes we learn about. 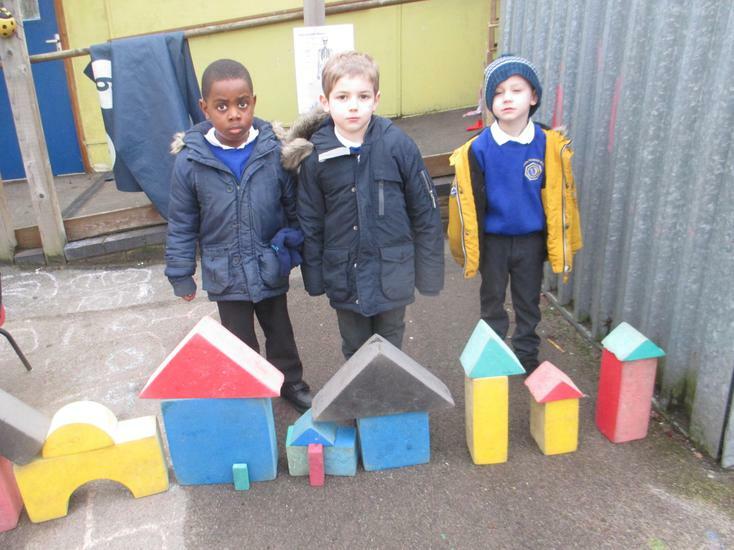 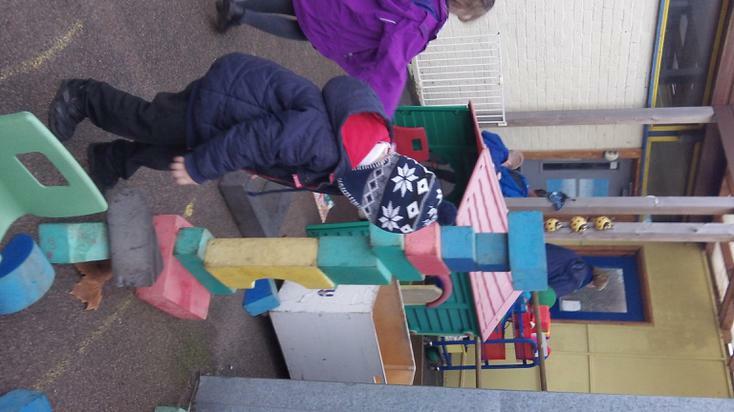 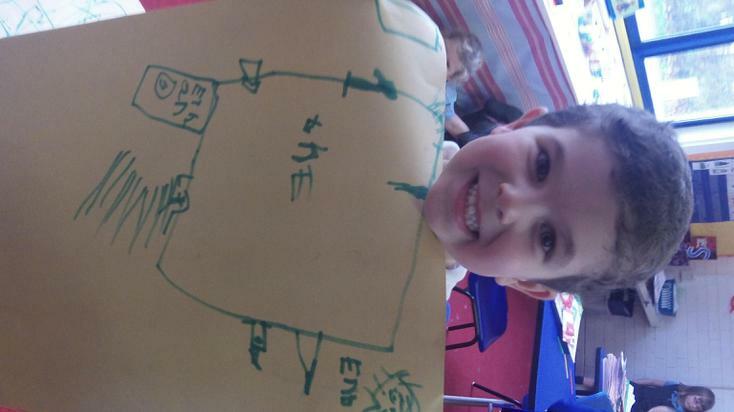 For the first half term we are learning about different types of houses, particularly in our local area. 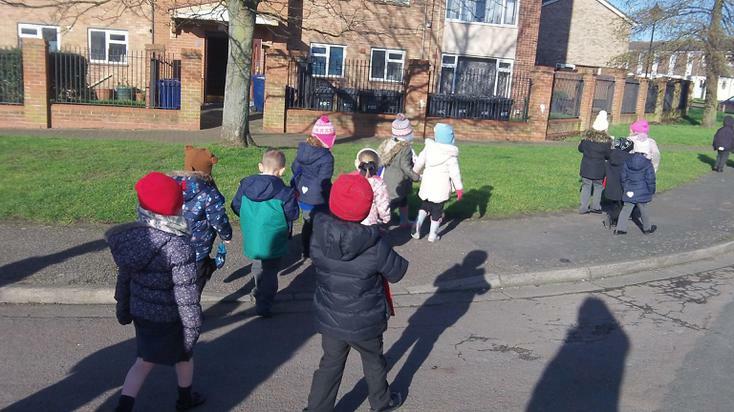 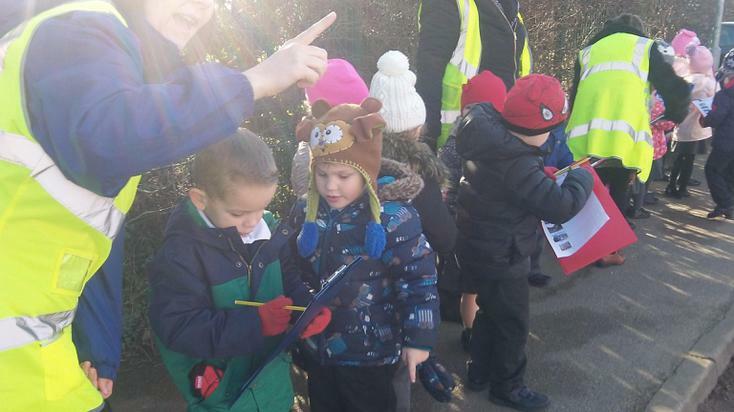 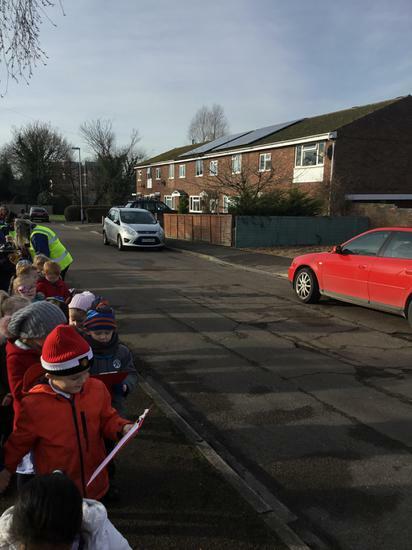 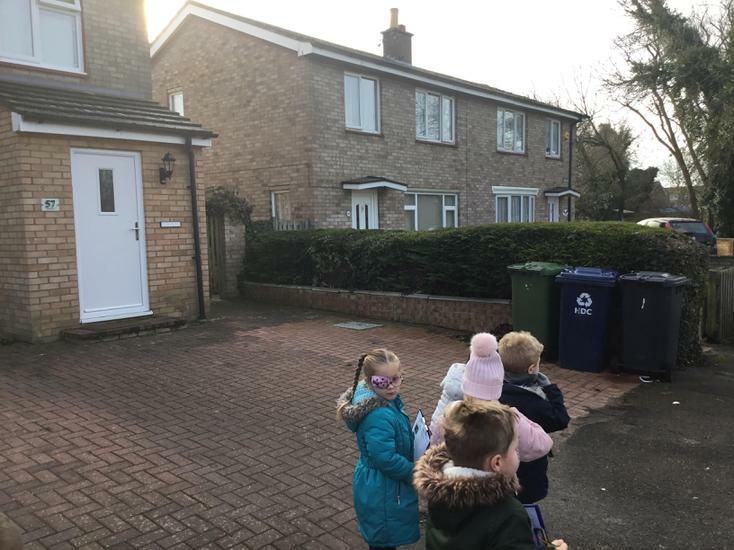 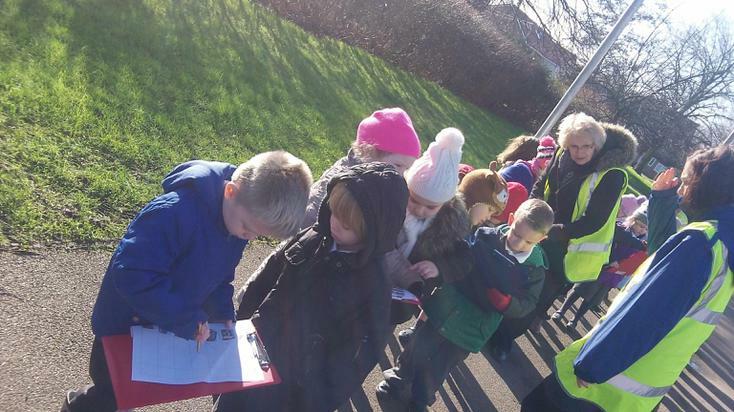 We will be looking closely at different features of houses and taking a walk close to school to discover what is the most popular type of house near Winhills. 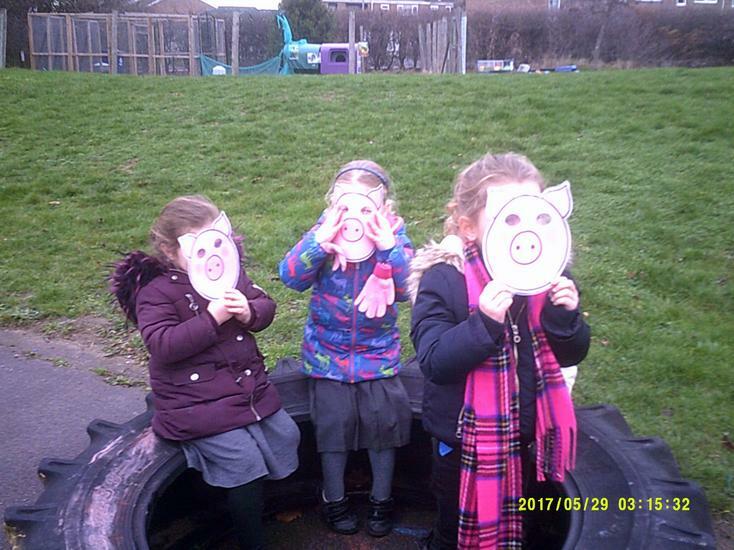 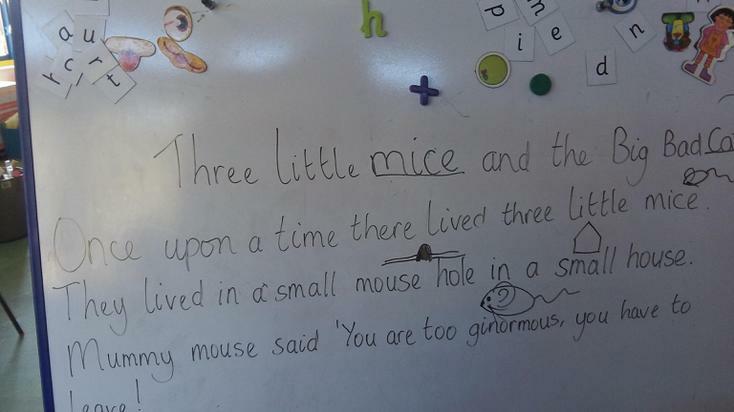 We will revisit one of our favourite fairytales 'The Three Little Pigs' and use our amazing imaginations to innovate our own versions. 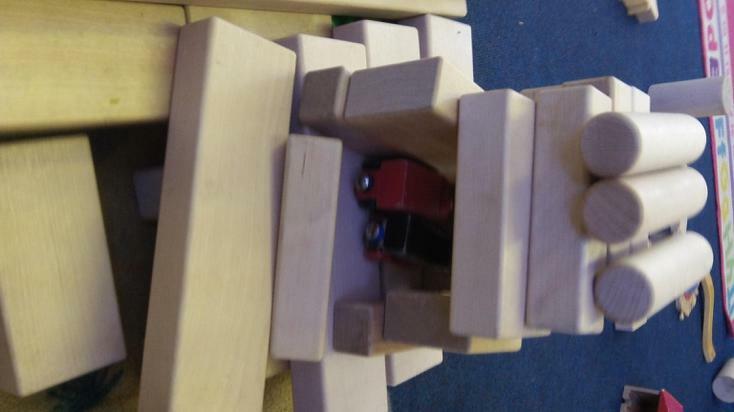 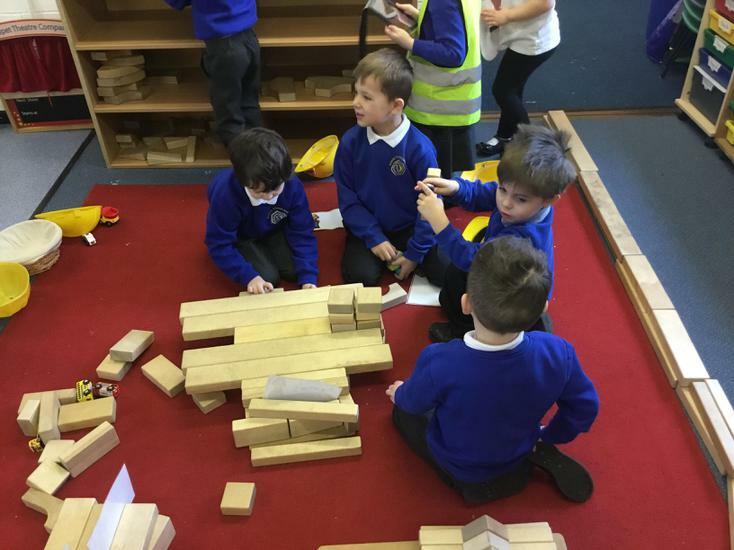 We will be investigating the properties of different building materials by asking questions and finding our own answers. 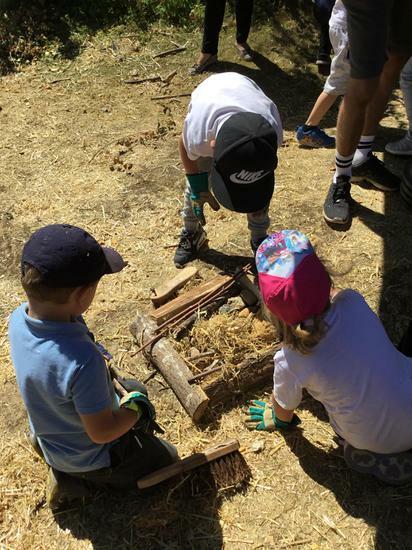 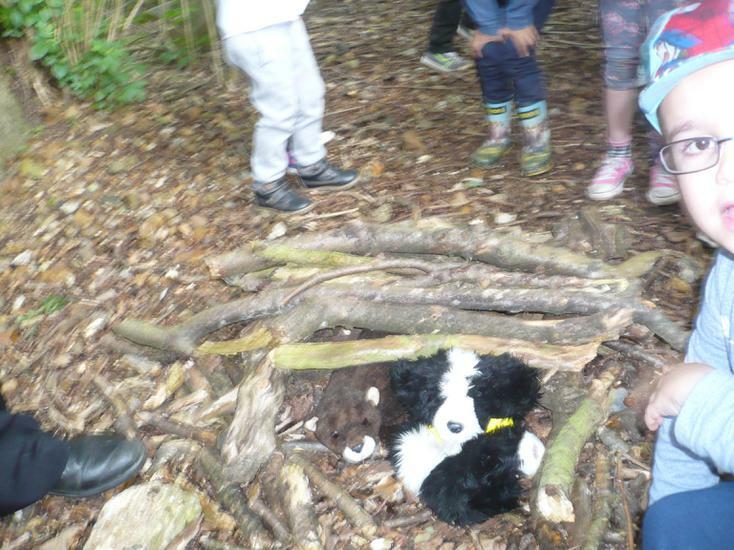 As the weather starts to warm up we will be learning all about the houses and homes of different animals and making bug hotels in the spinney. 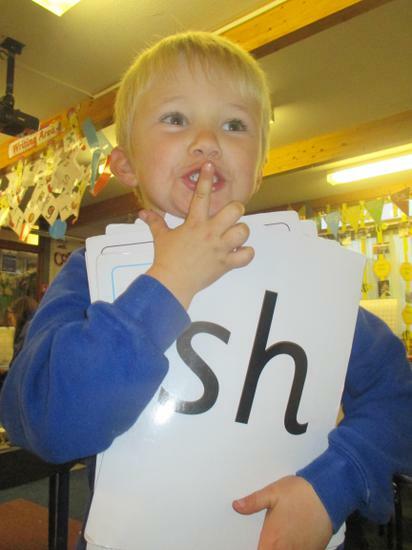 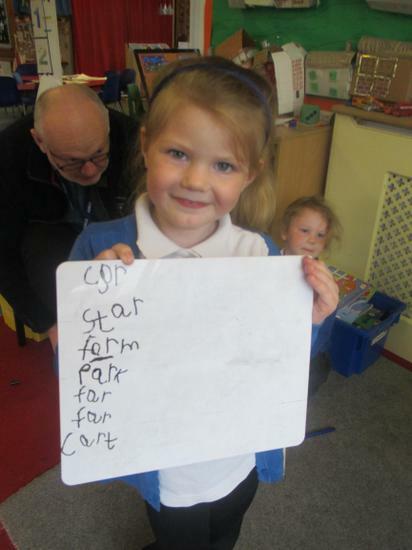 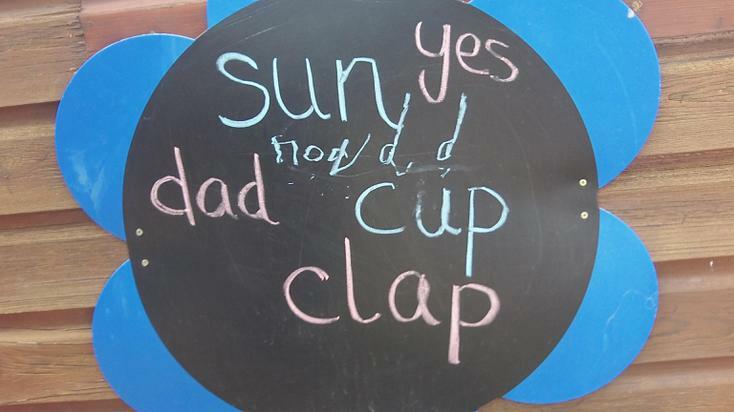 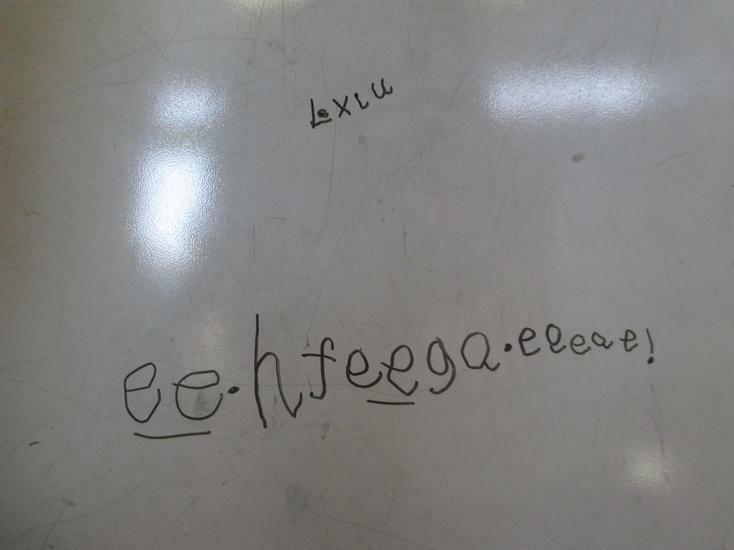 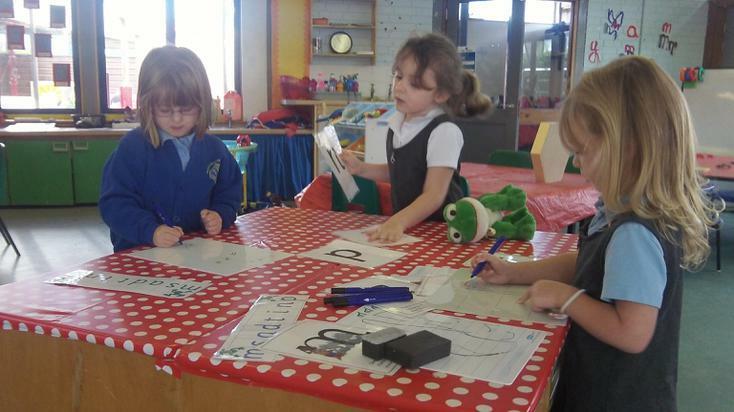 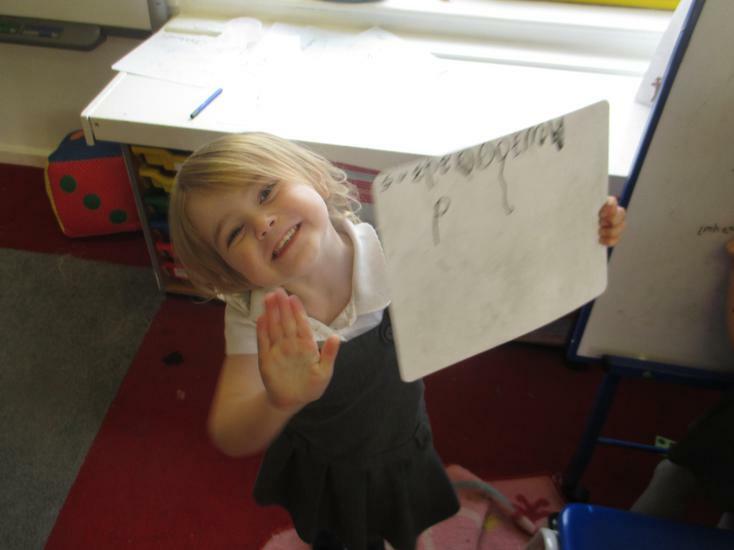 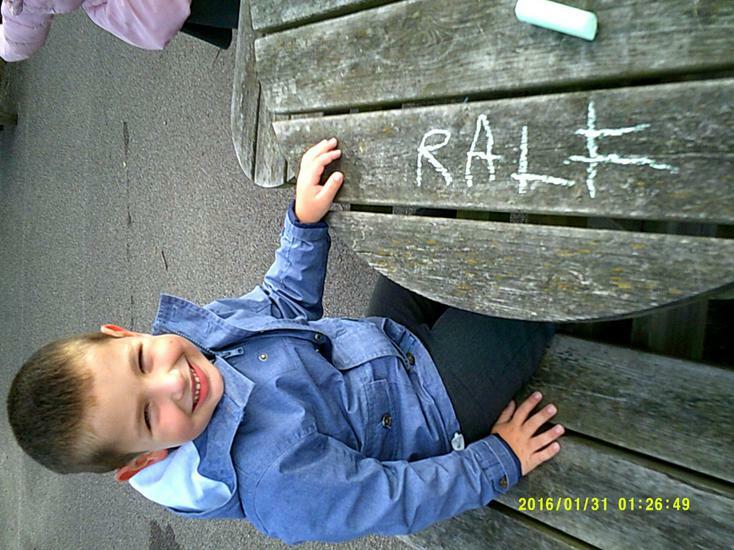 In Phonics we are carrying on with sounding out and blending words, as well as continuing to learn new graphemes. 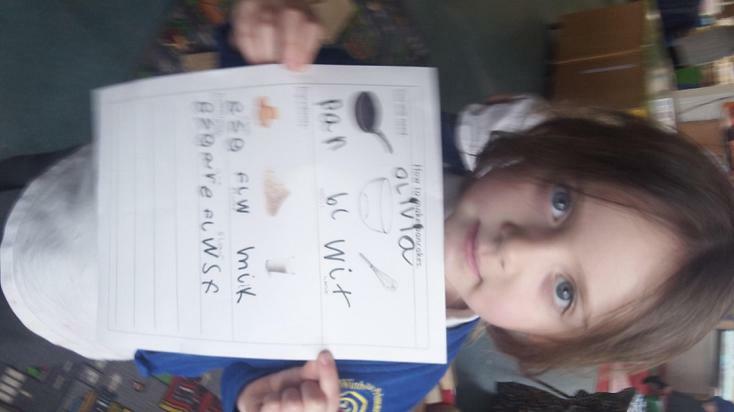 We will be practising our writing skills by writing CVC words and moving on to writing in sentences. 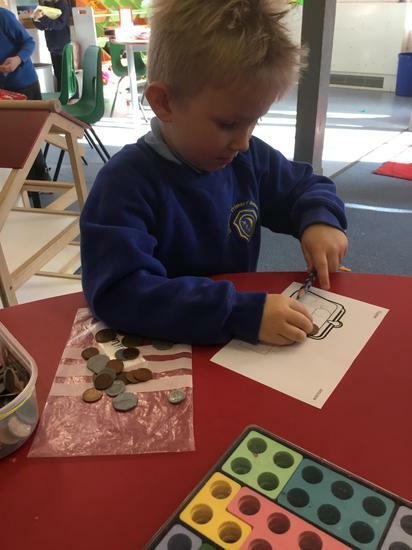 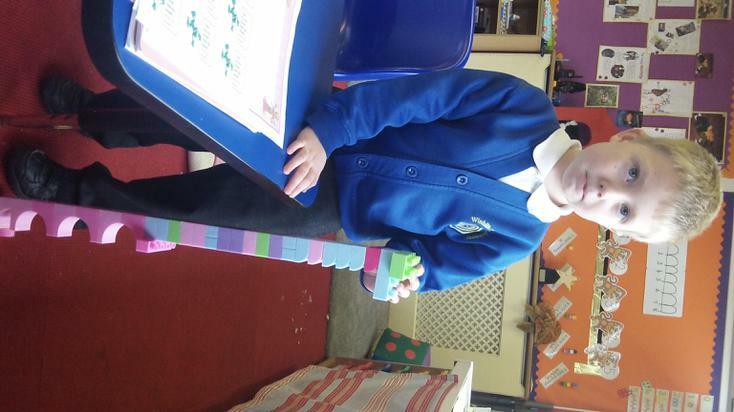 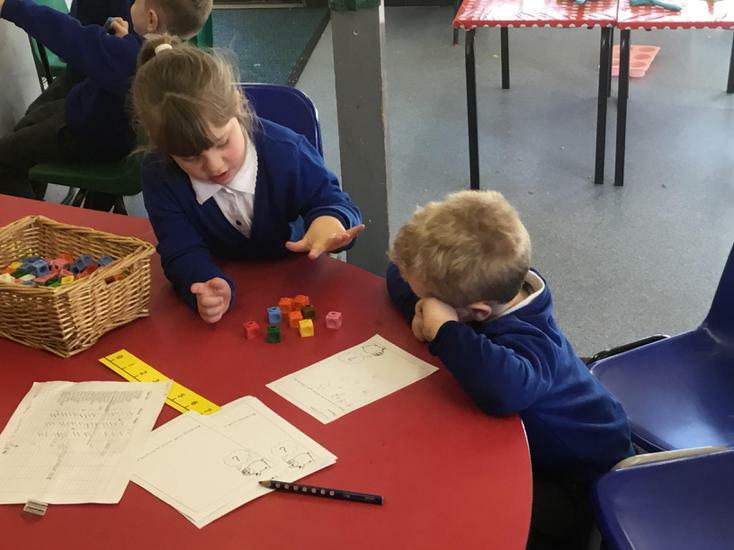 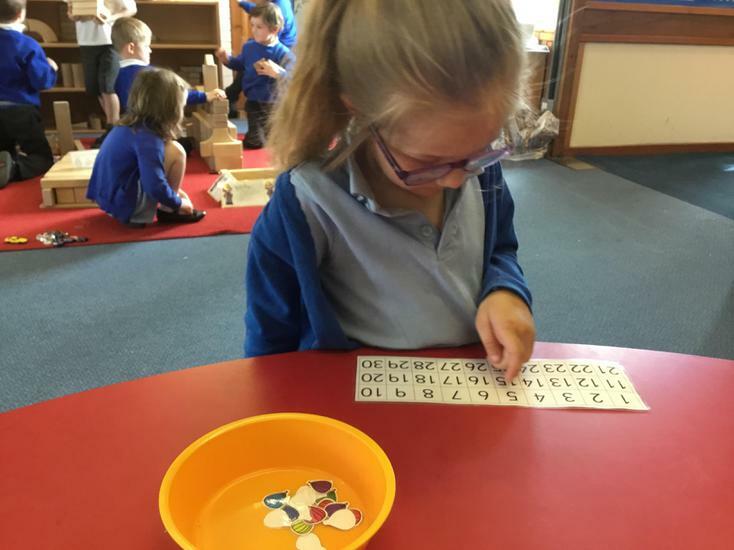 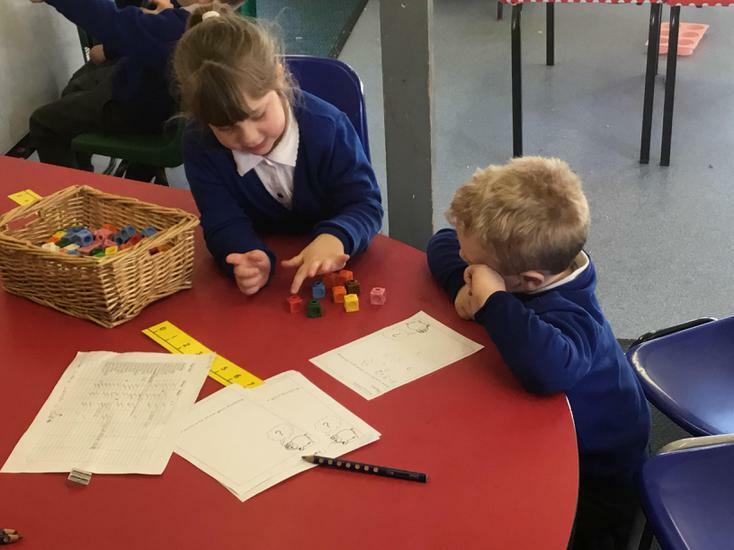 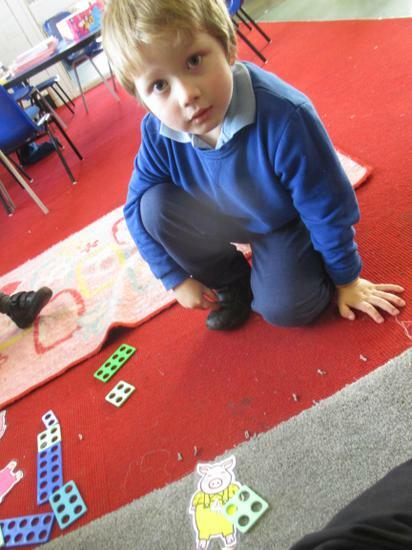 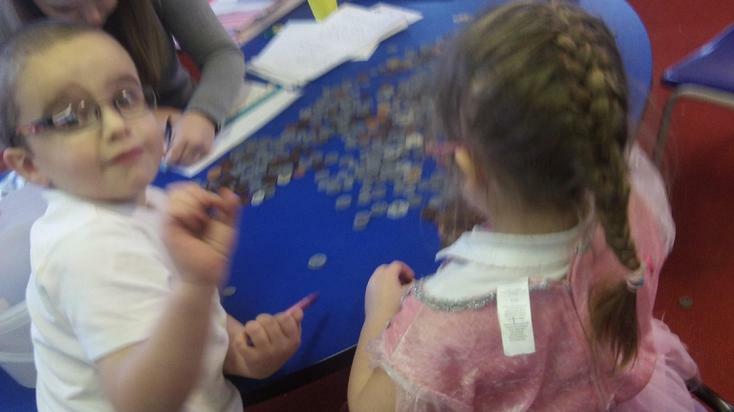 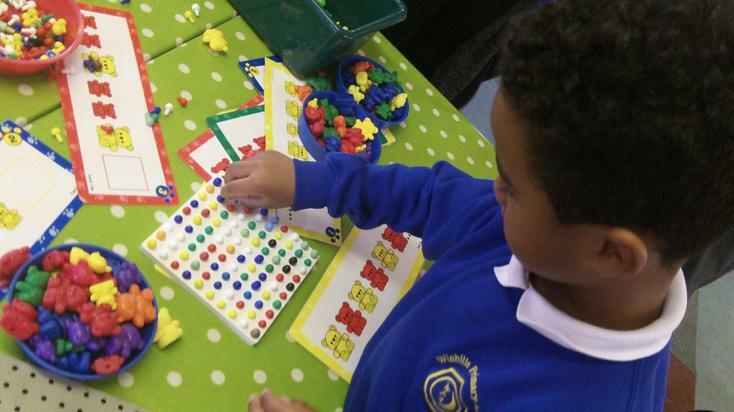 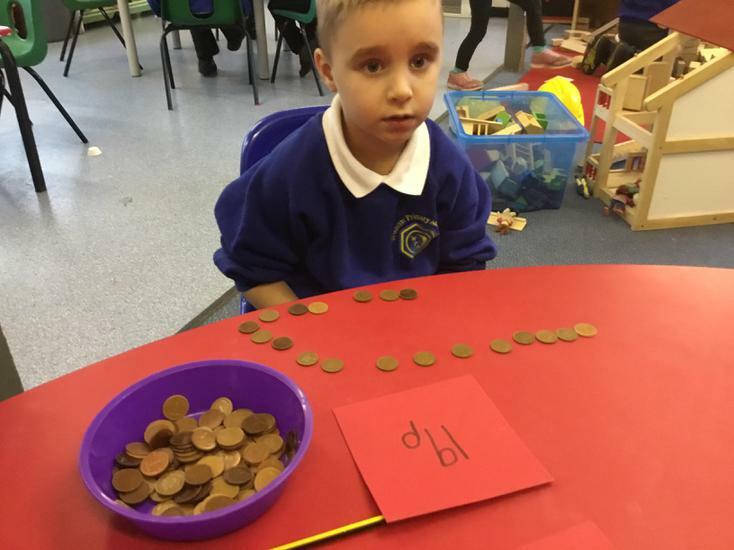 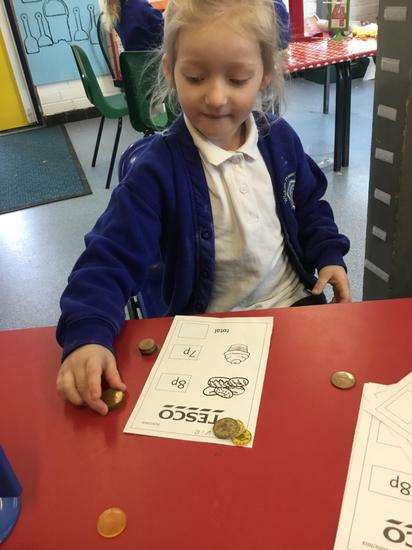 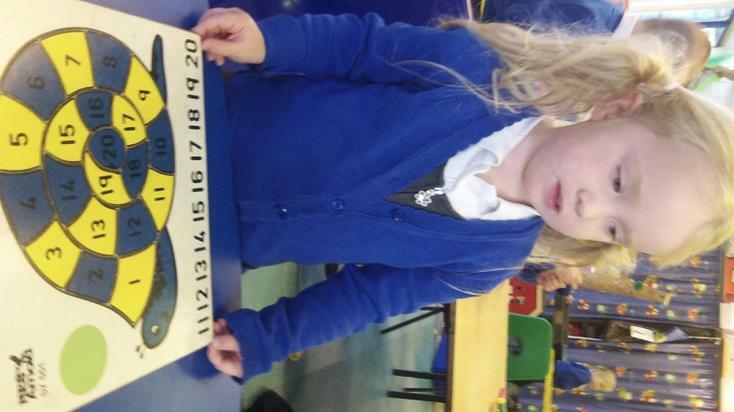 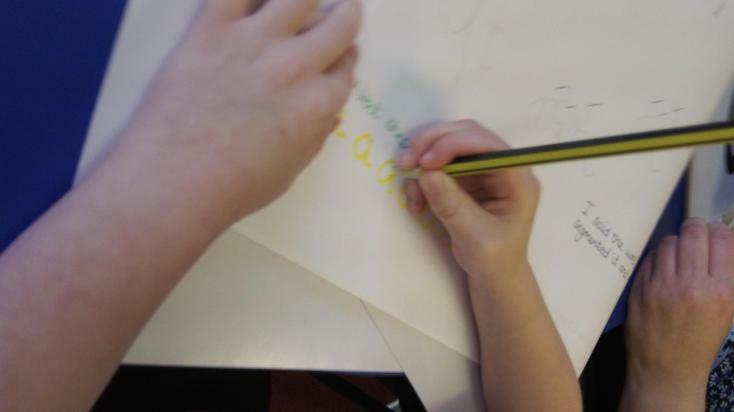 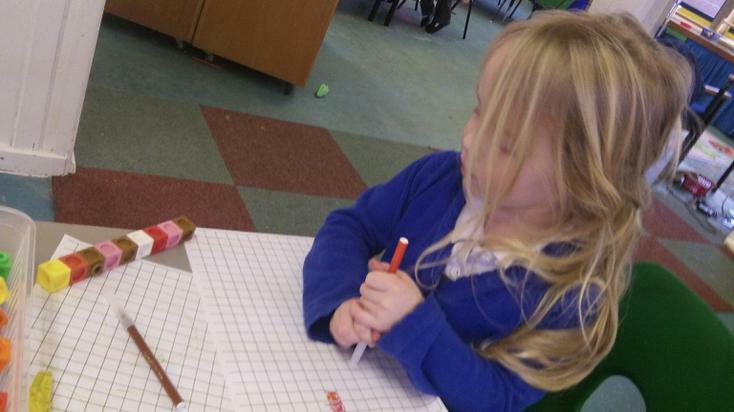 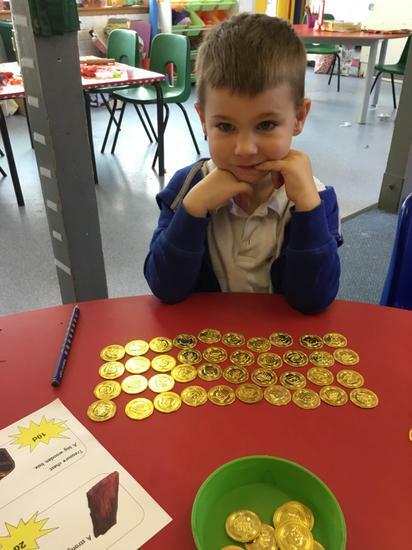 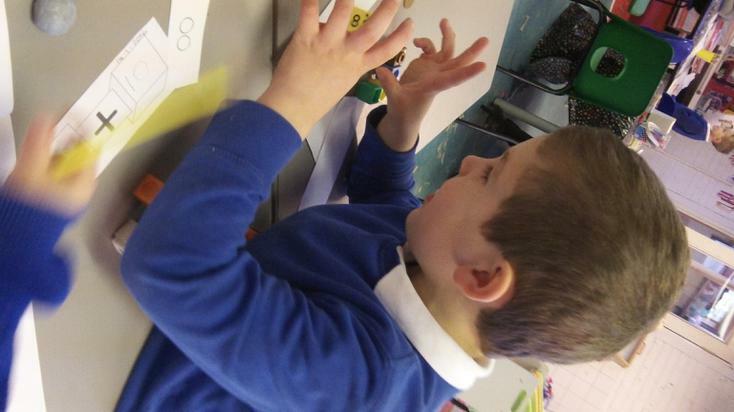 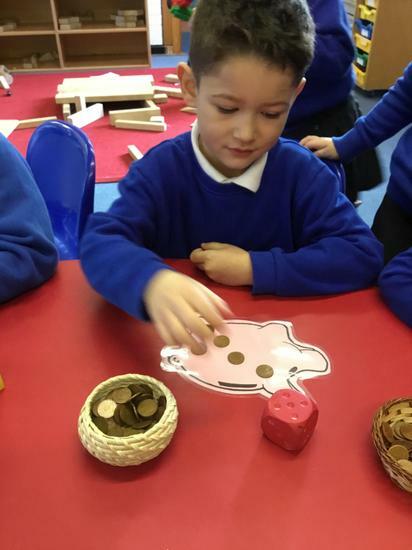 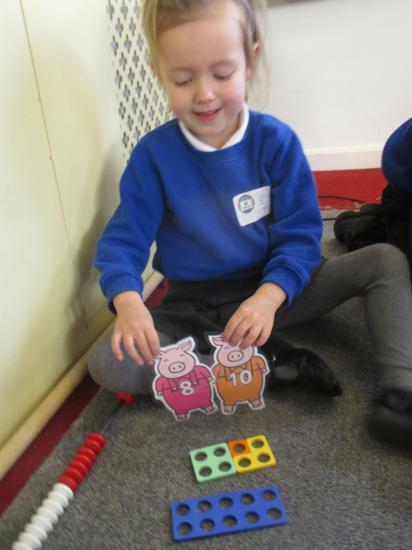 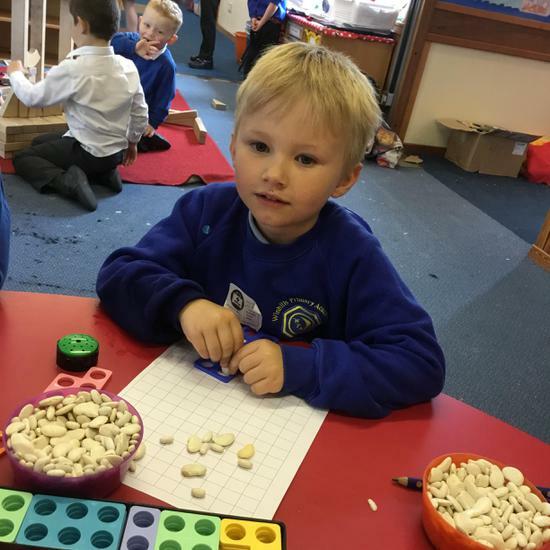 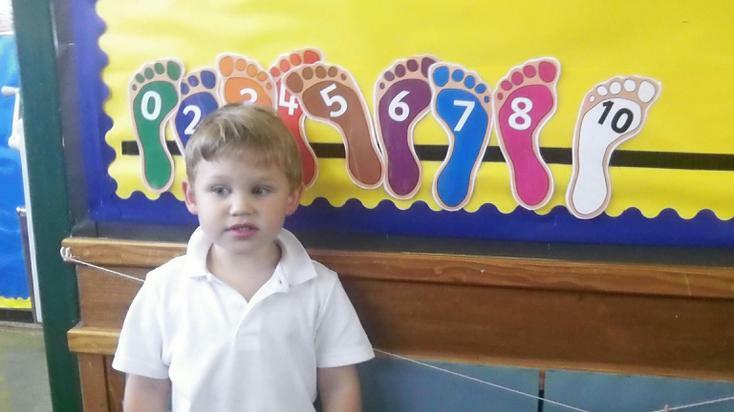 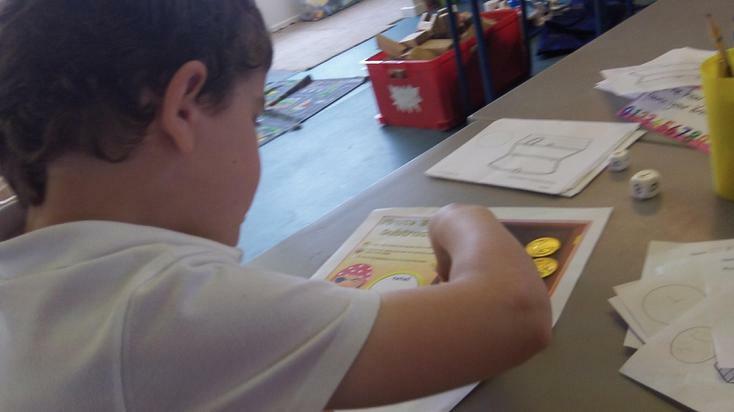 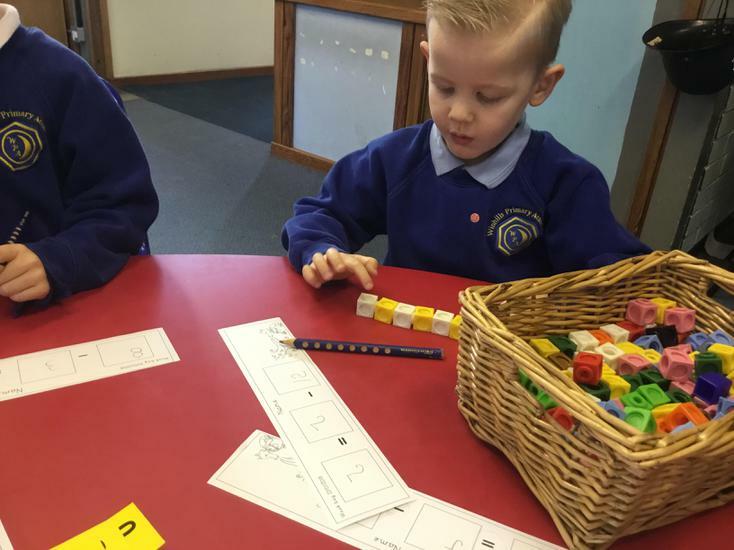 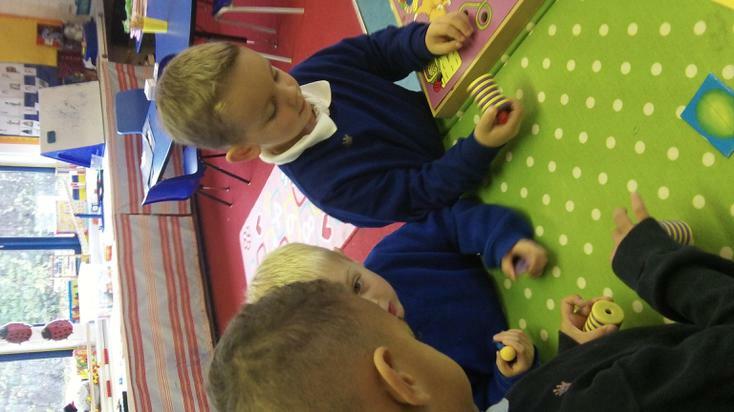 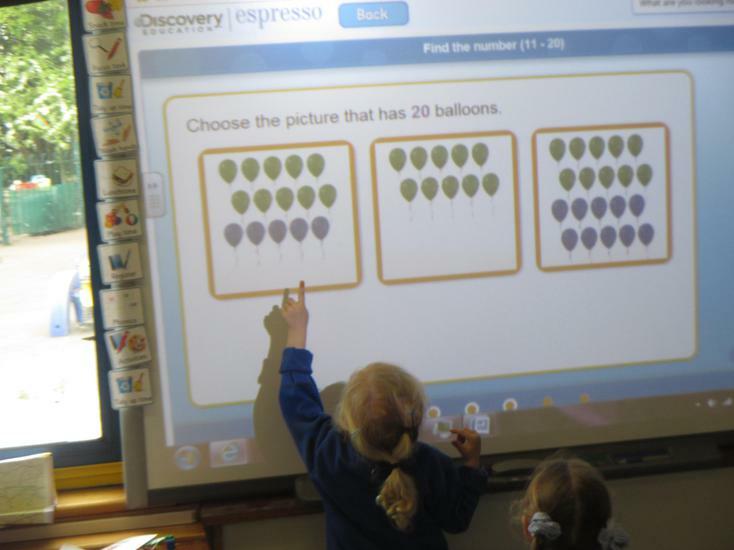 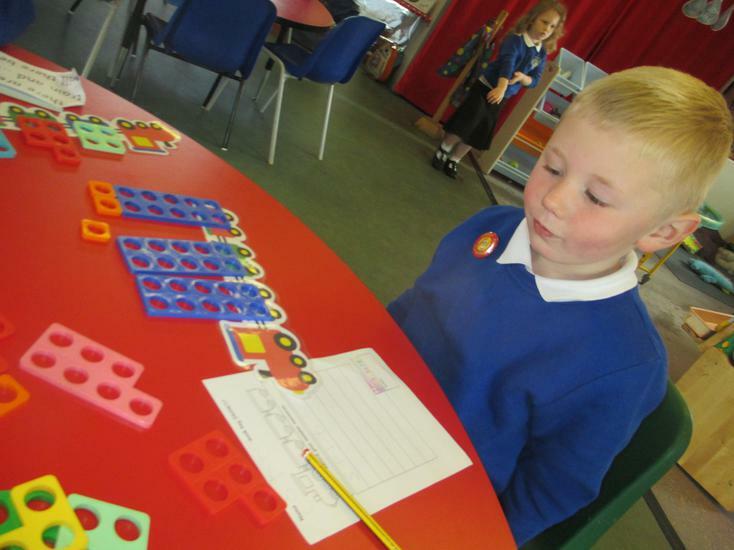 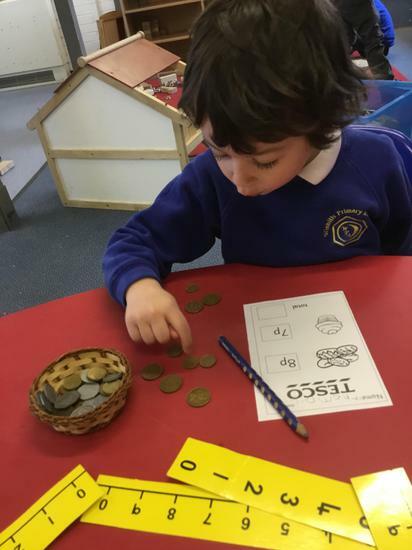 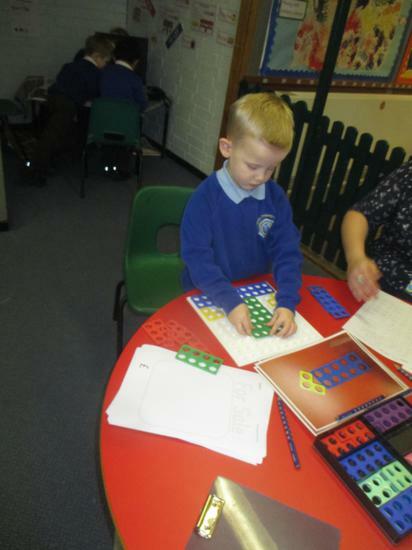 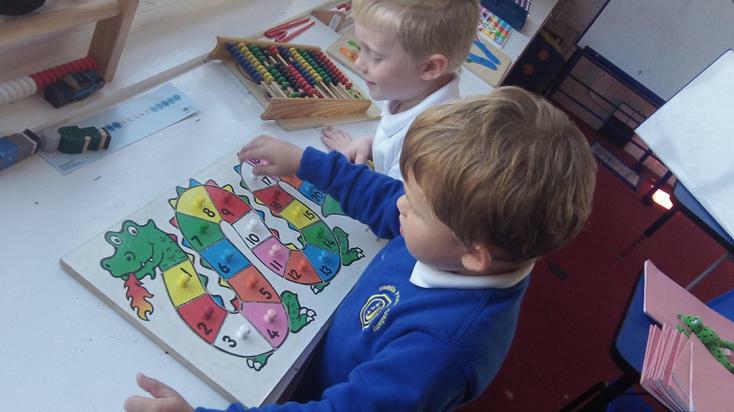 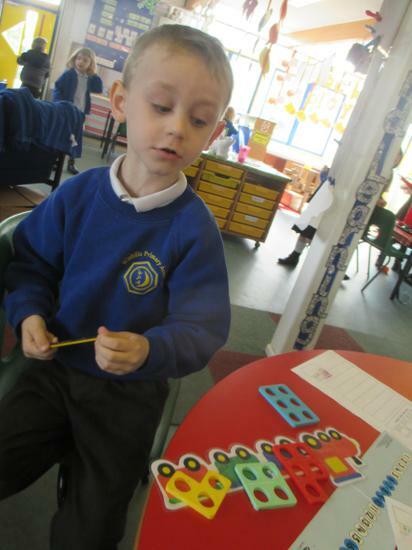 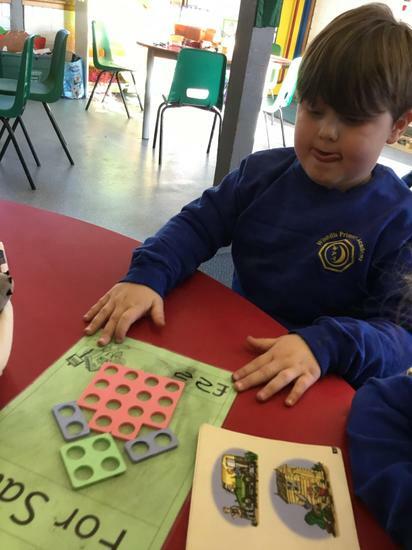 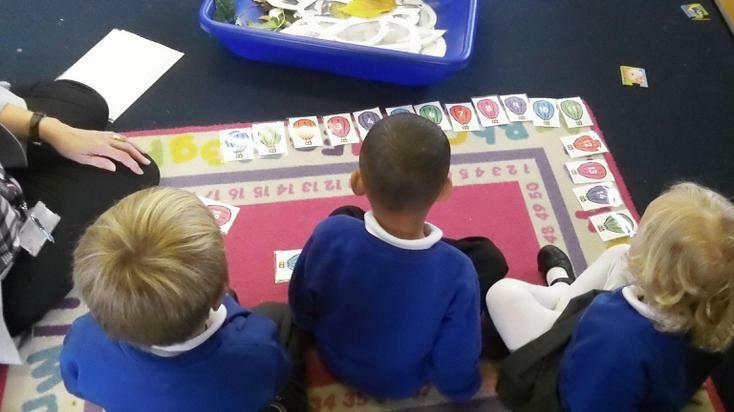 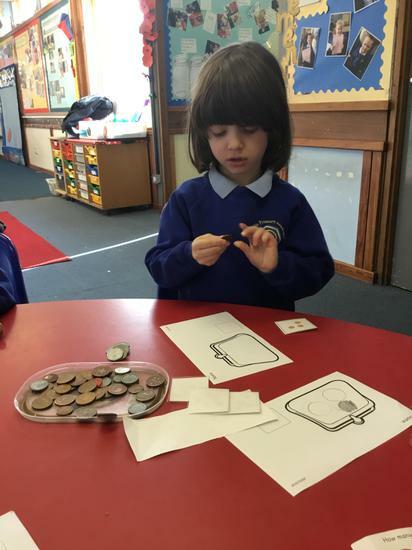 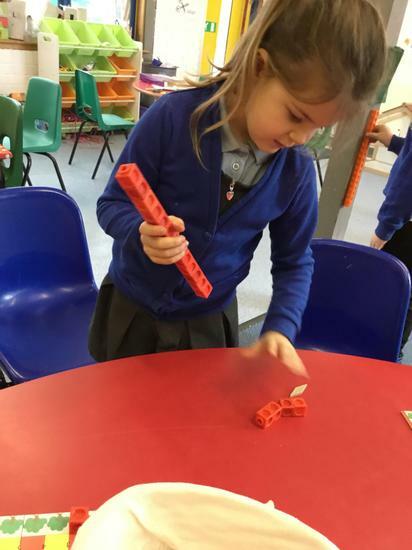 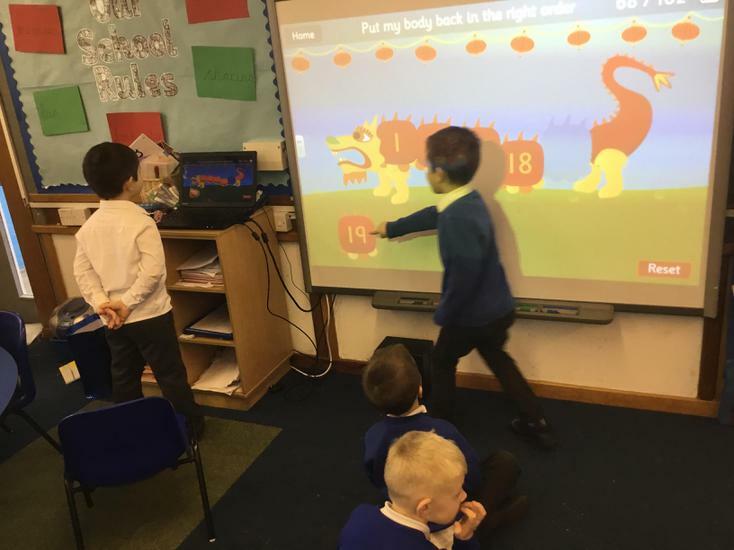 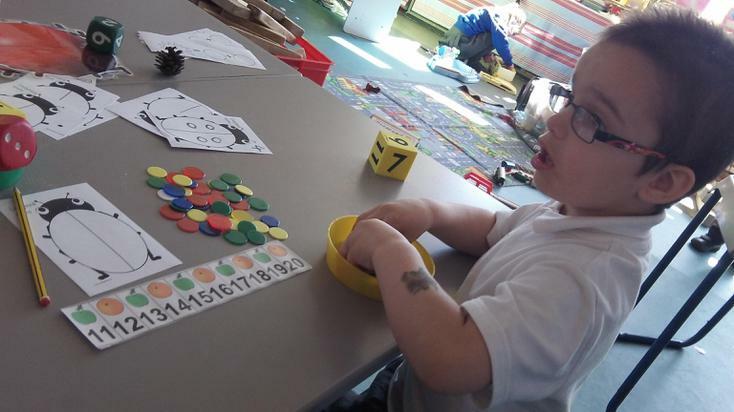 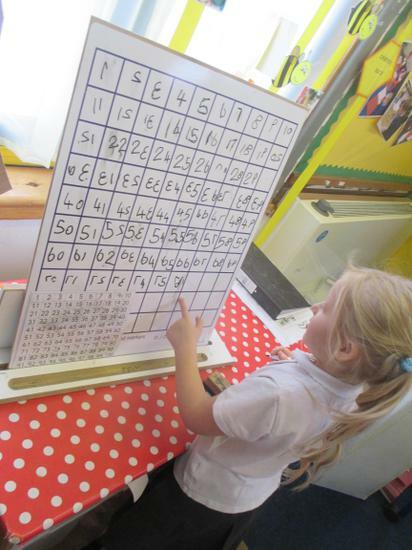 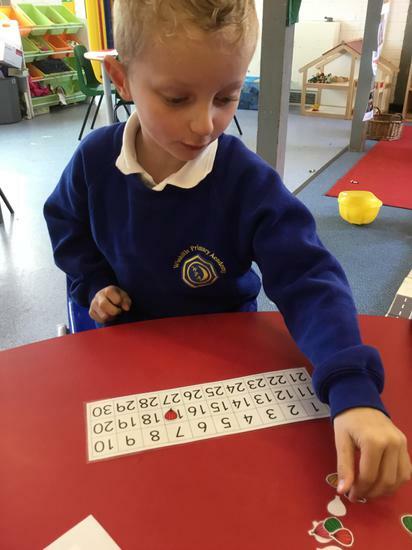 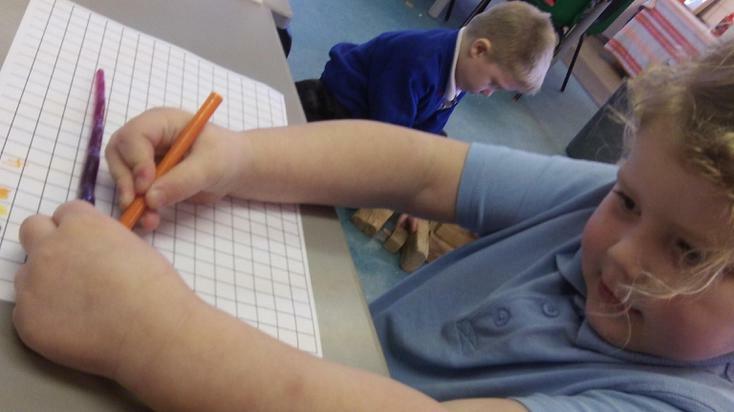 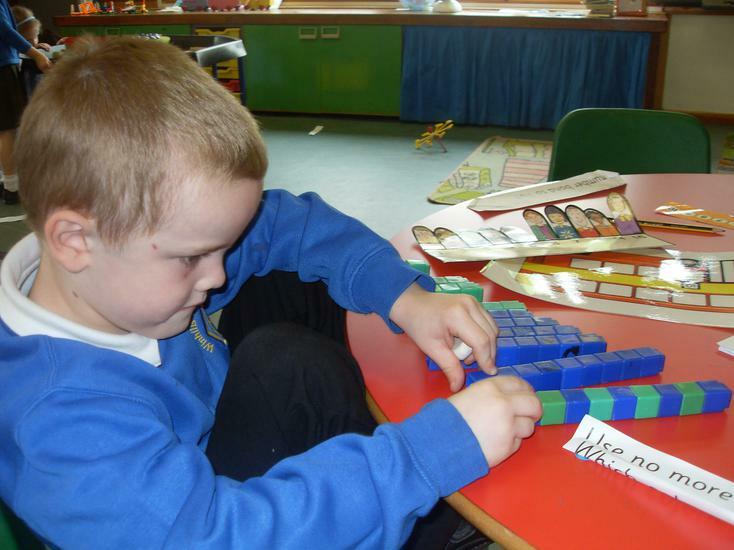 In maths we will continue to grow in confidence with number knowledge, through counting, addition and subtraction, as well as solving practical problems based on real life situations, including money, shapes and measuring. 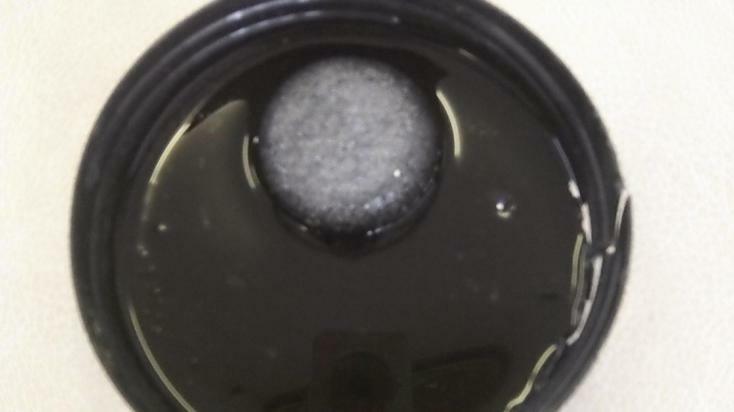 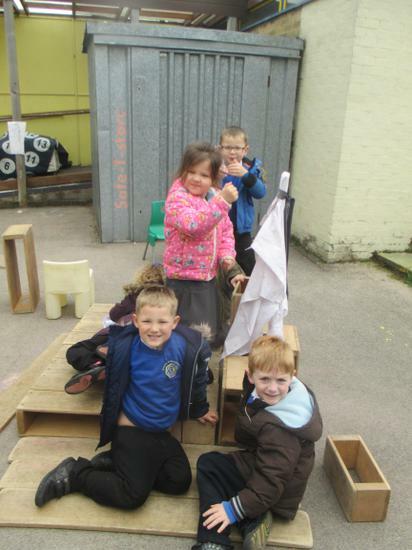 Welcome to Topaz class. 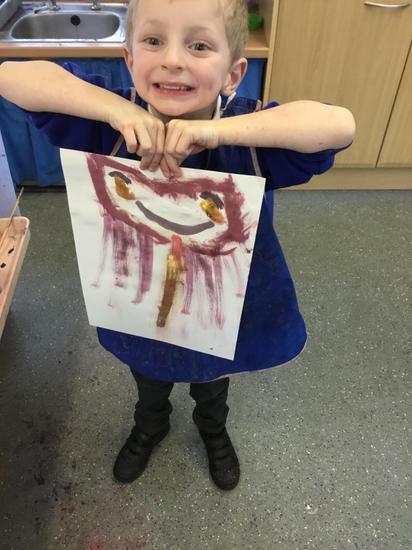 This term our theme is 'Ourselves'. 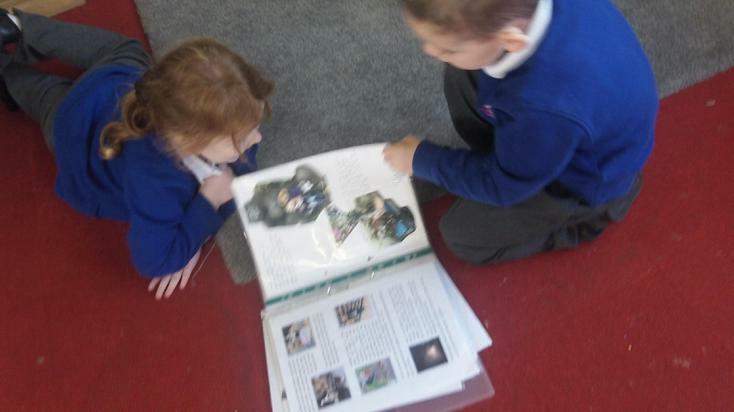 We will be learning all about our friends by talking about our families and things that are special to us as well as the things we enjoy doing. 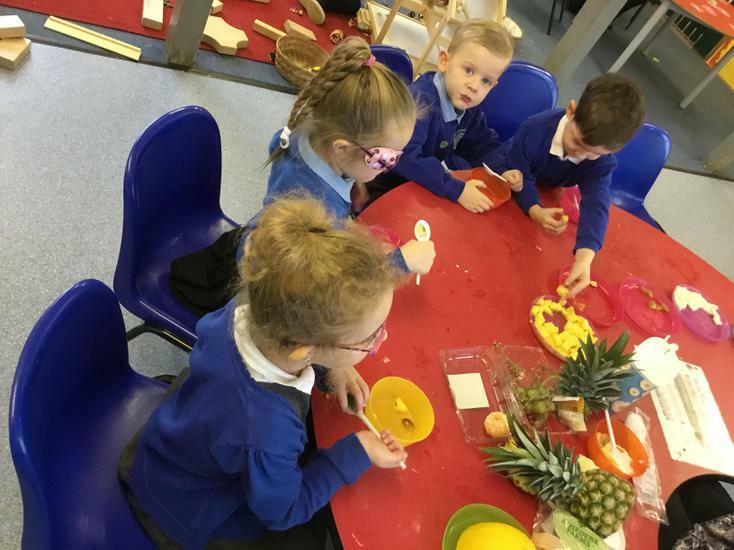 We will also learn how to keep ourselves healthy and strong and begin to learn about how our bodies work and about the people who help us. 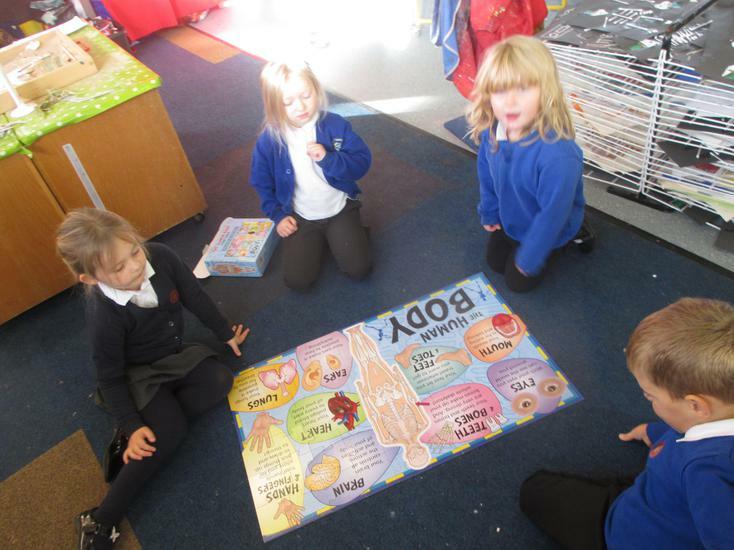 We will start the term by sharing the 'Supertato' series of books. 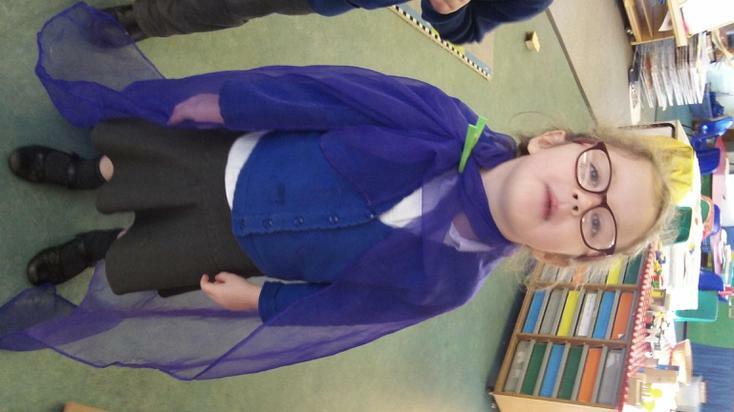 This will encourage us to think about our own superpowers and what makes us special. 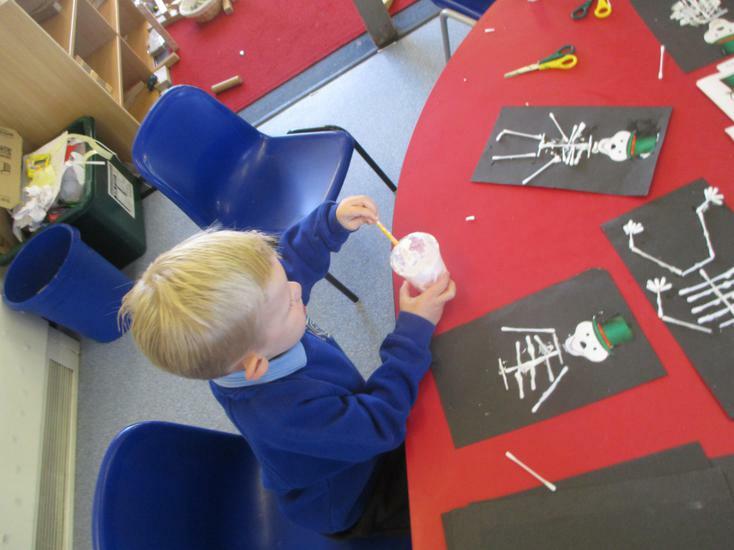 Over the term we will also share 'The Jar of Happiness', 'Funnybones' and 'Peace at Last'. 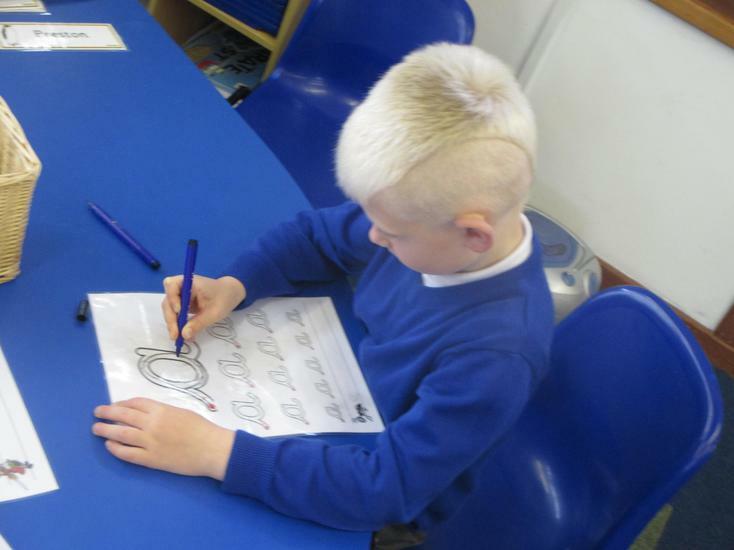 We will take part in daily phonics lessons as well as shared writing to help us learn about the importance of reading and writing. 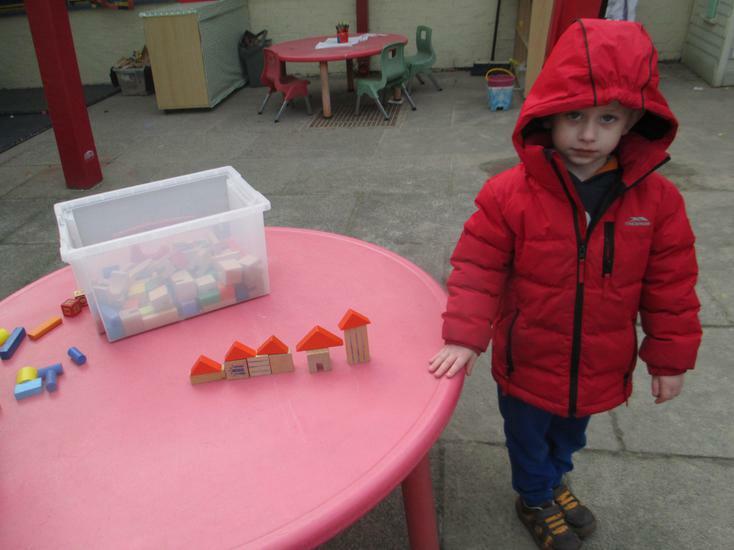 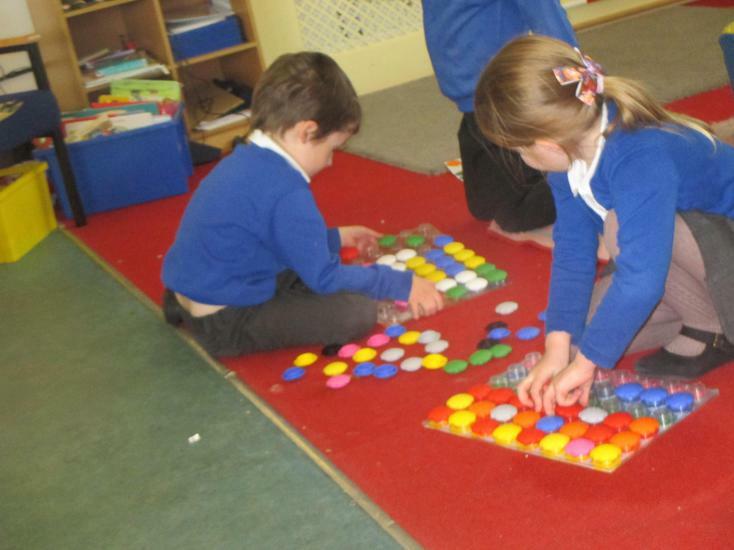 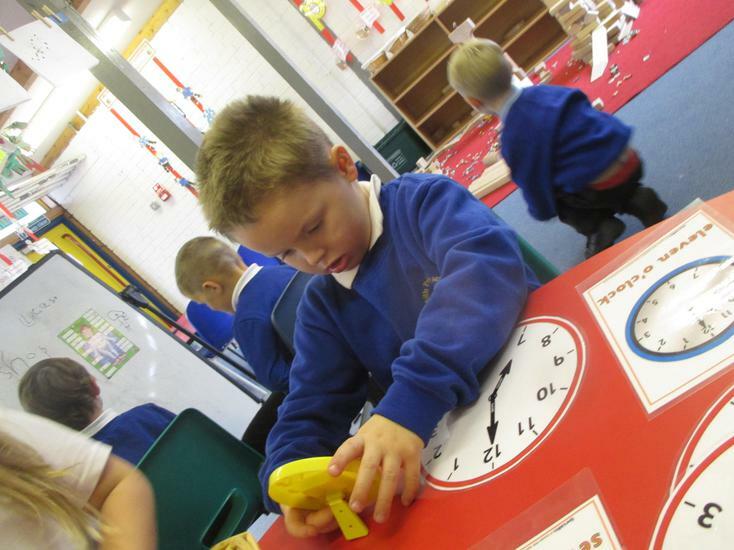 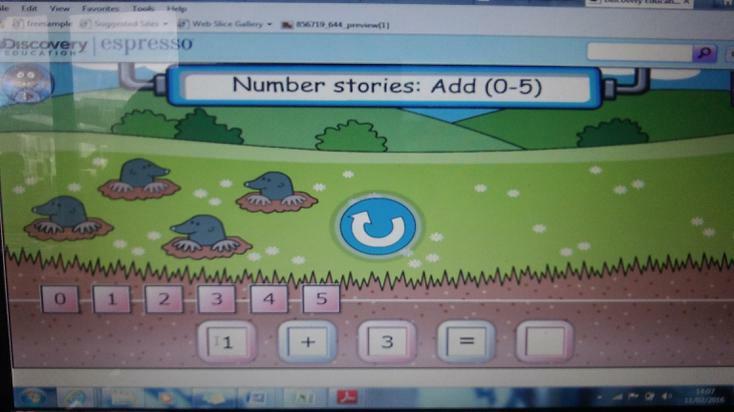 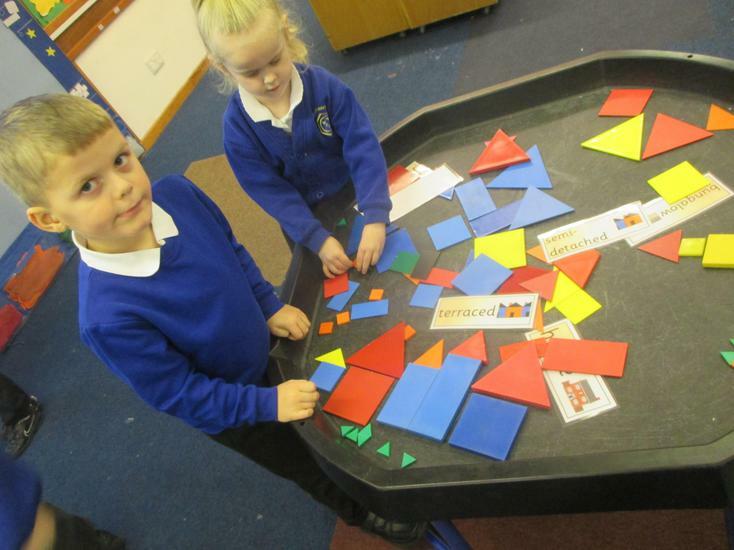 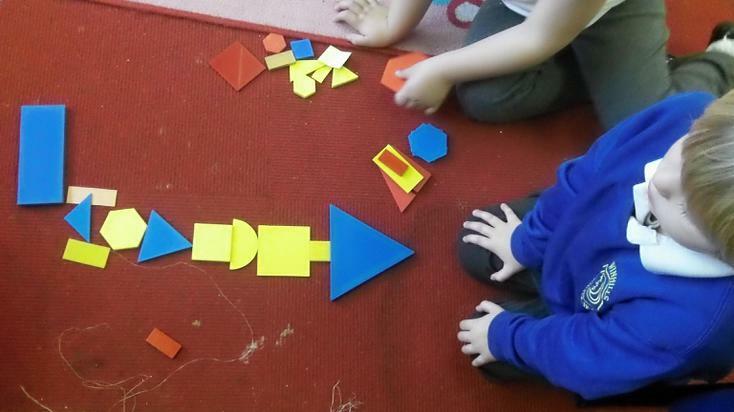 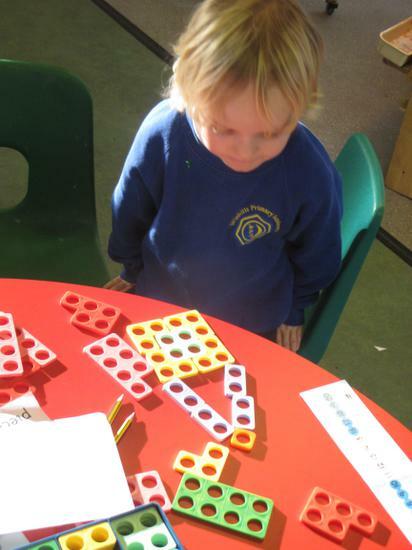 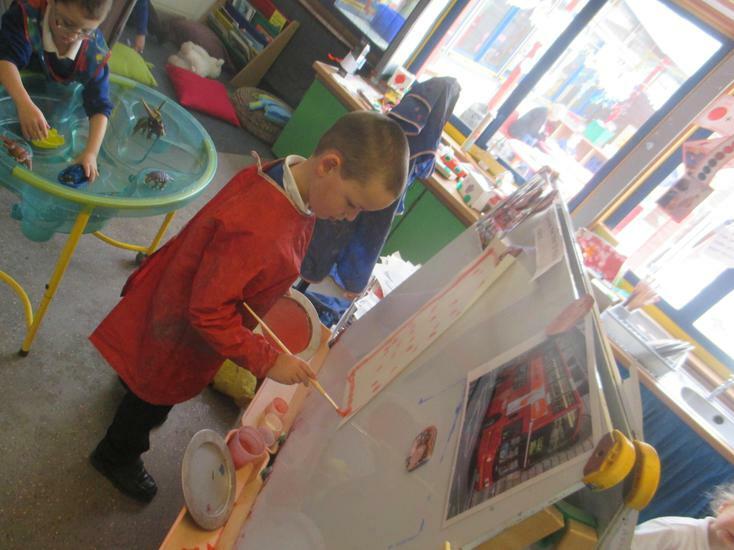 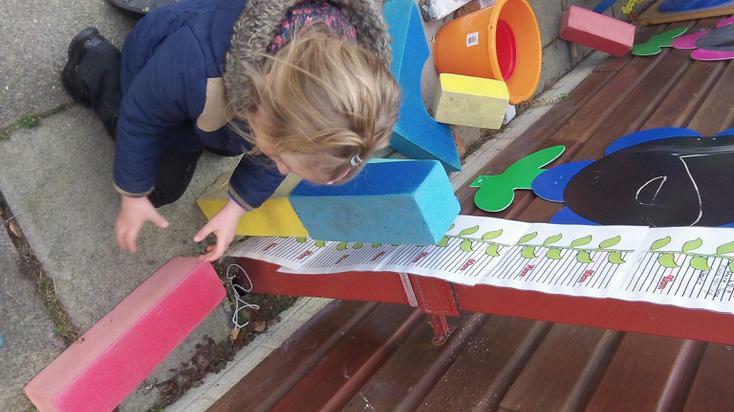 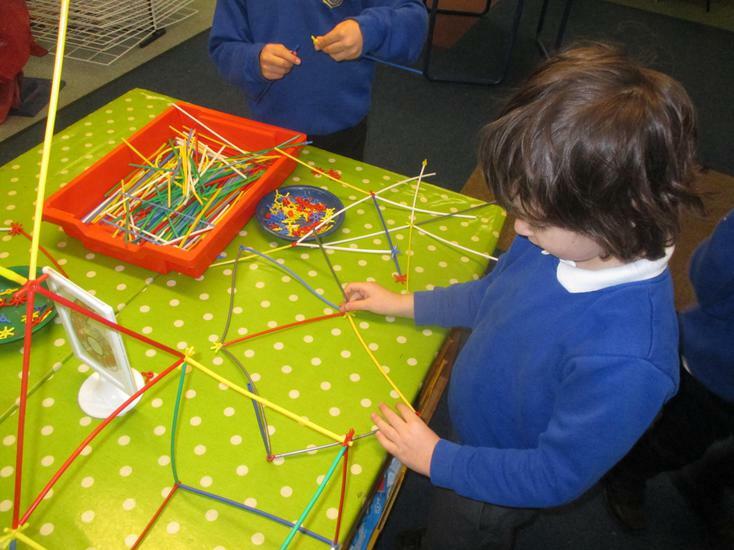 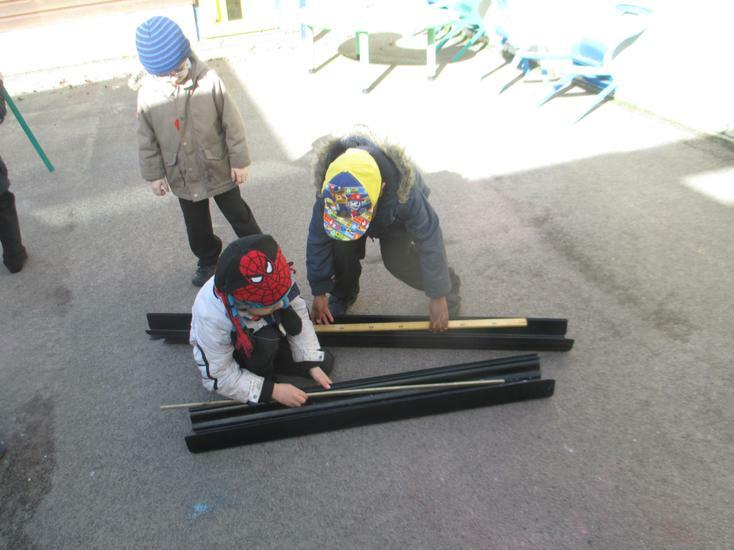 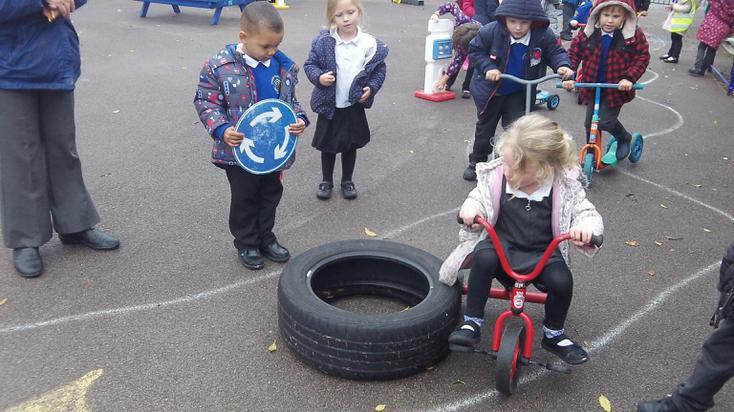 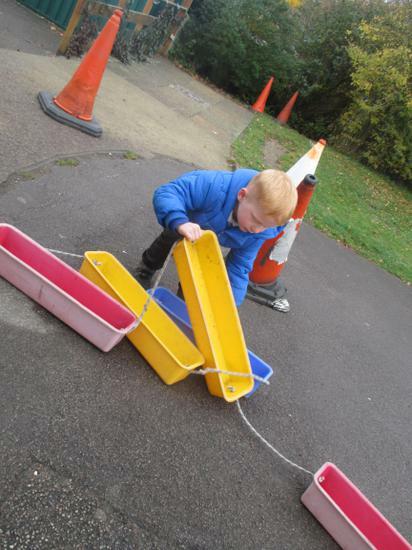 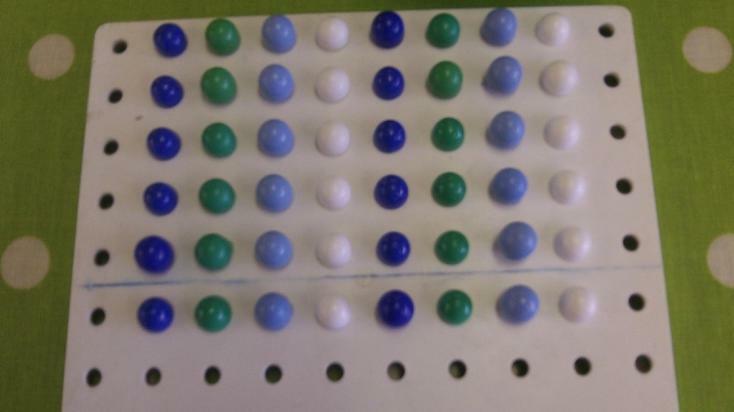 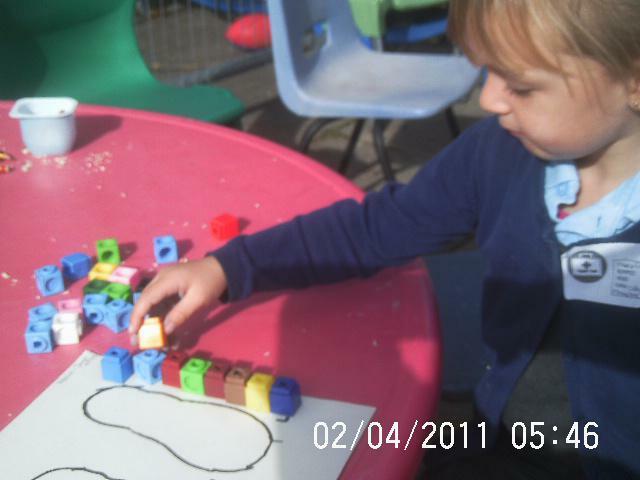 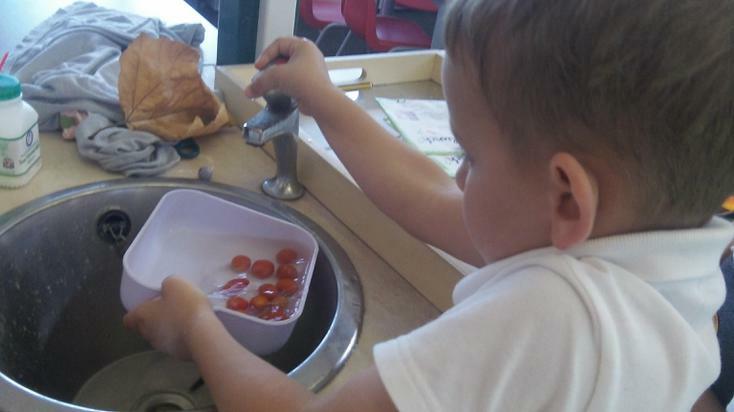 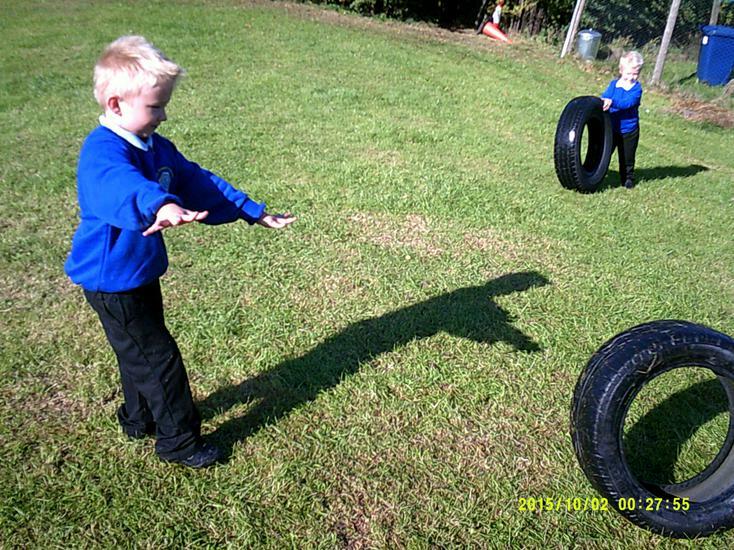 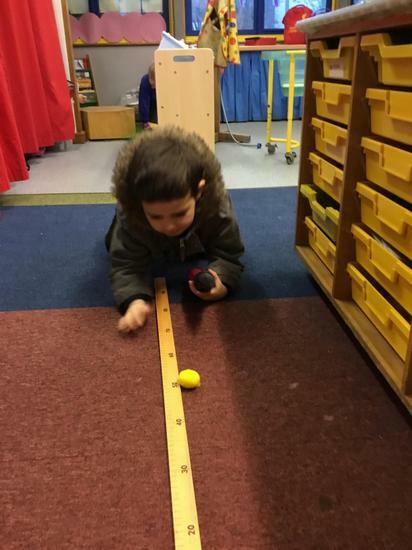 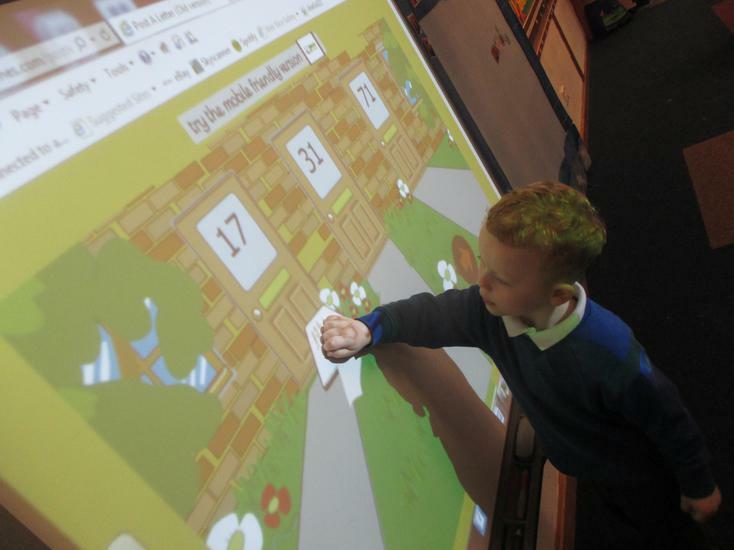 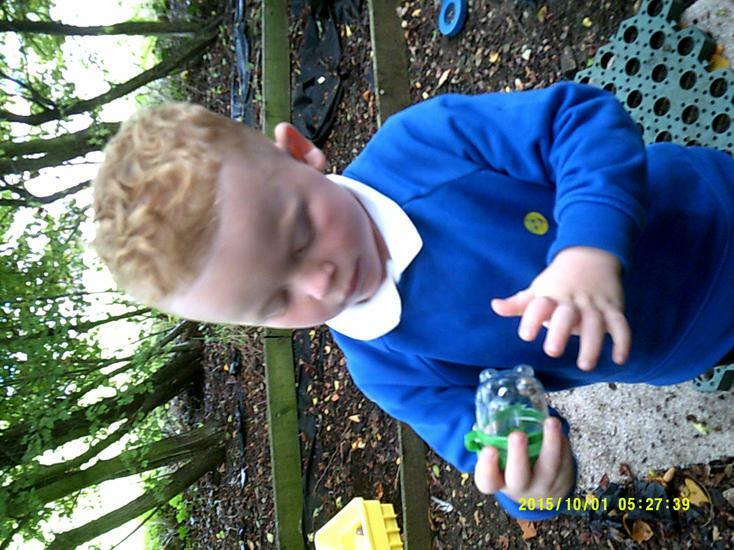 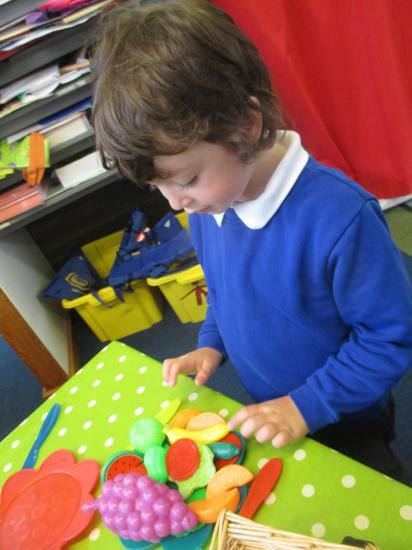 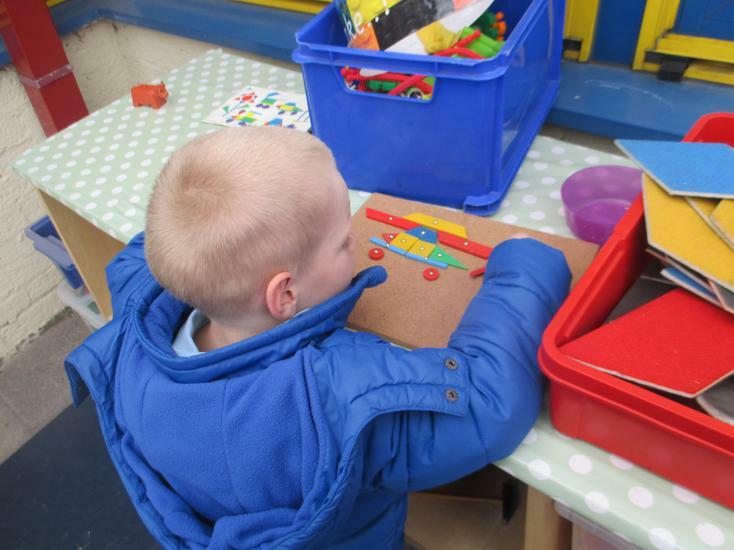 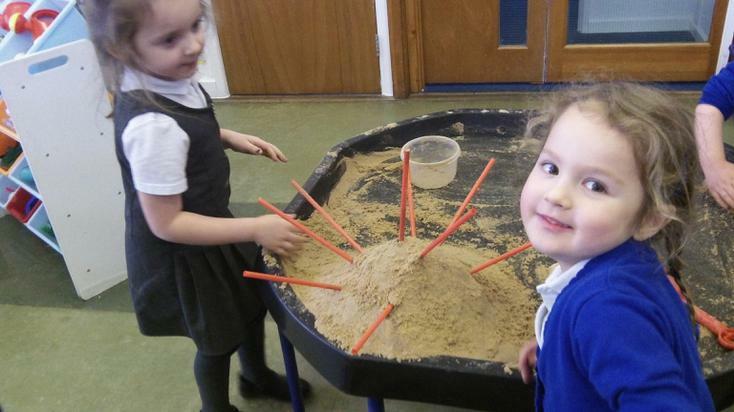 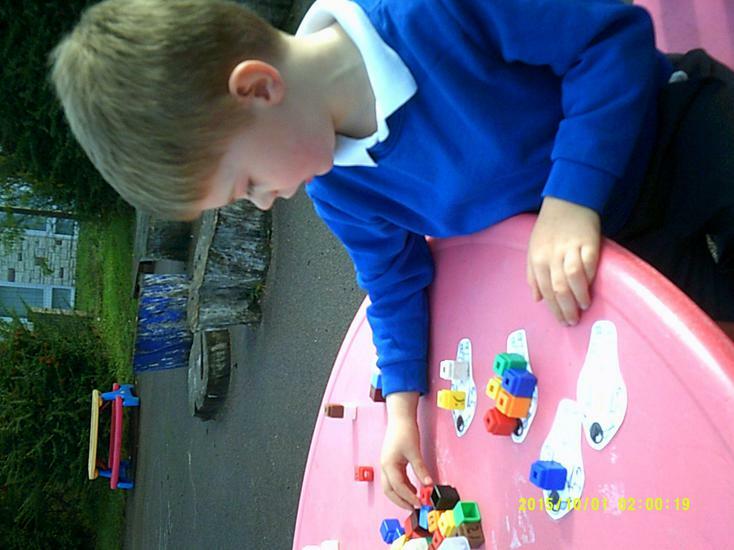 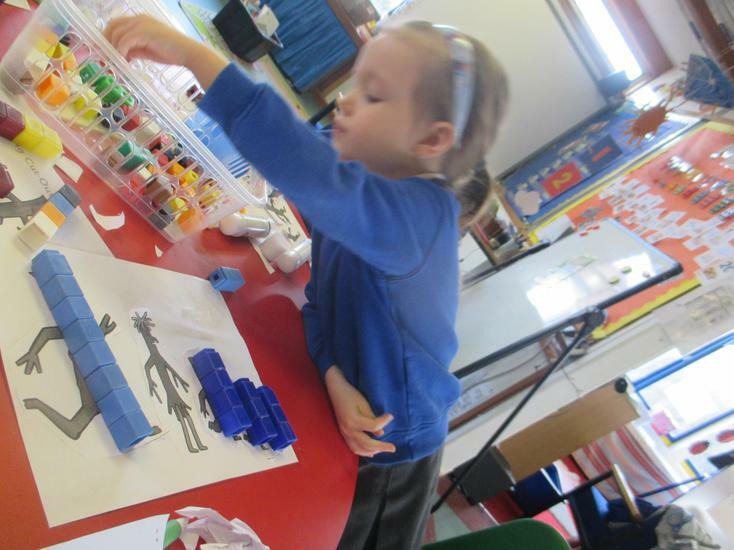 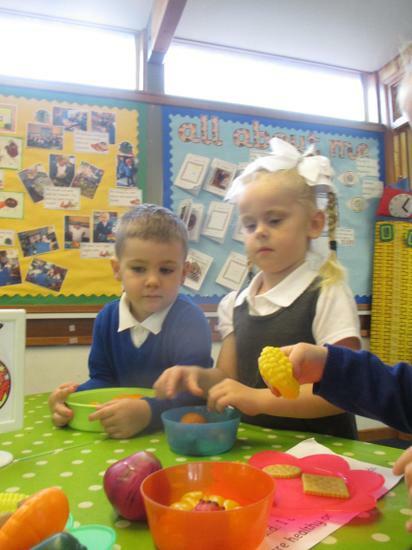 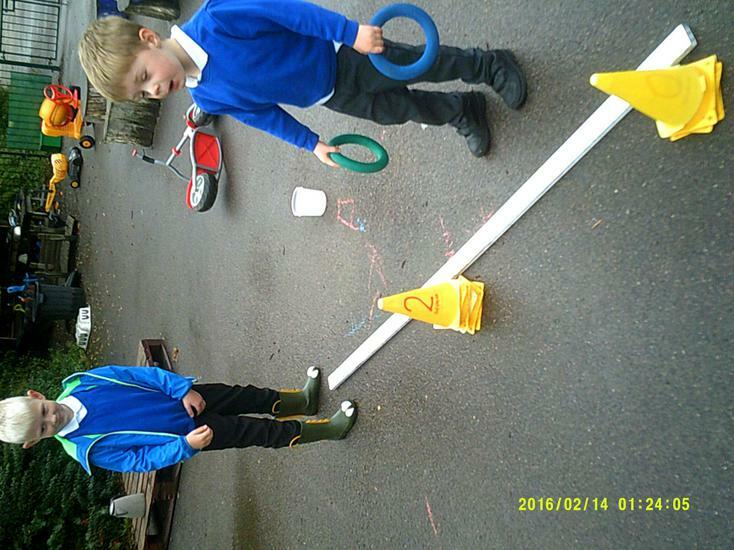 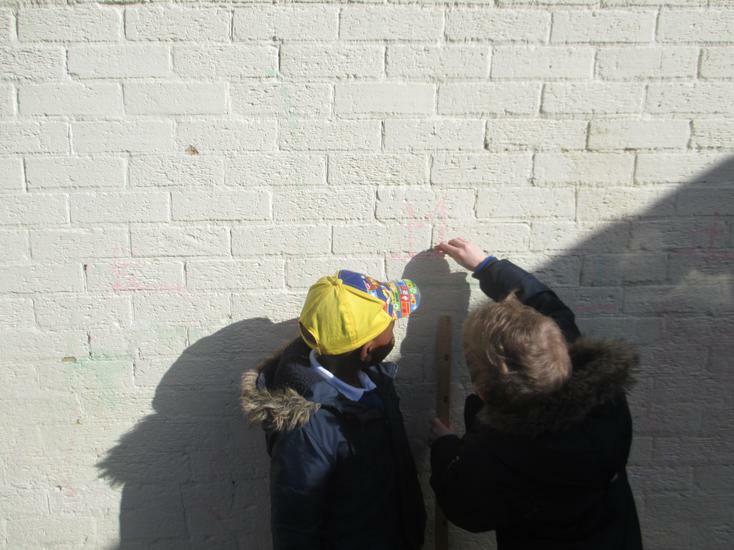 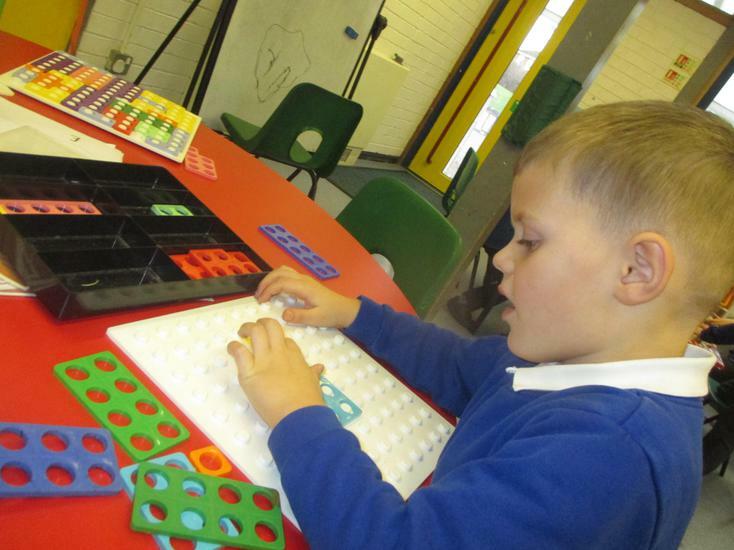 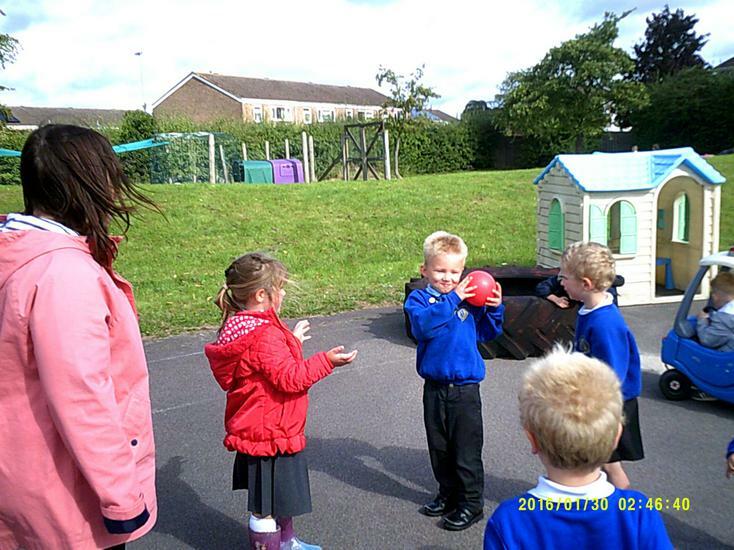 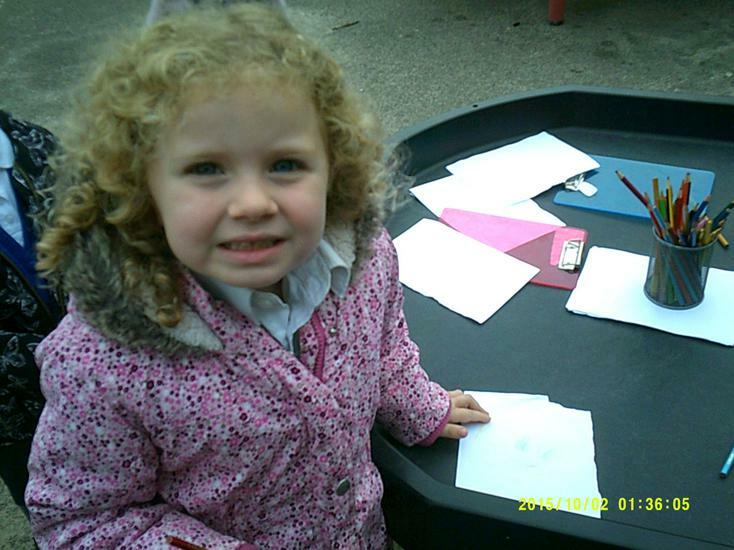 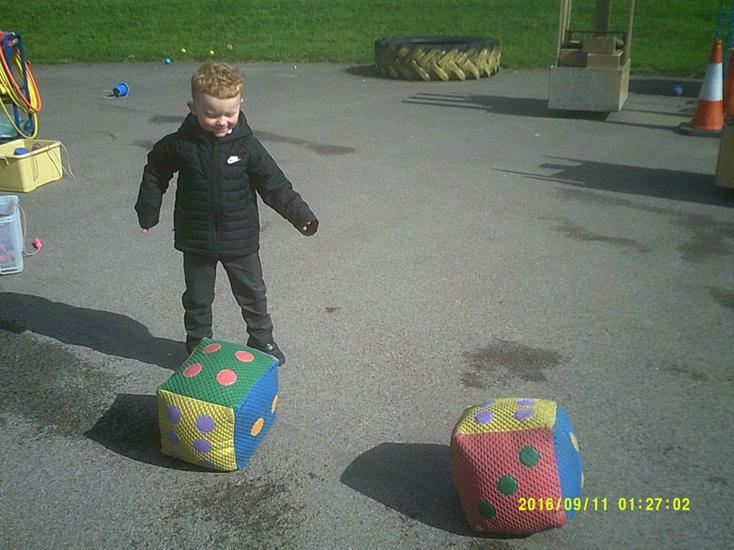 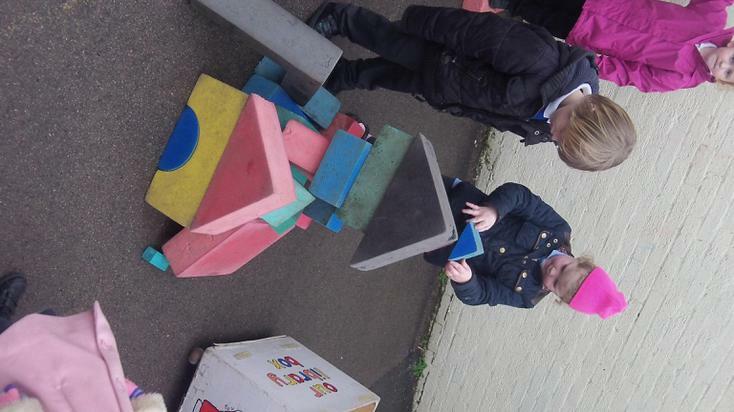 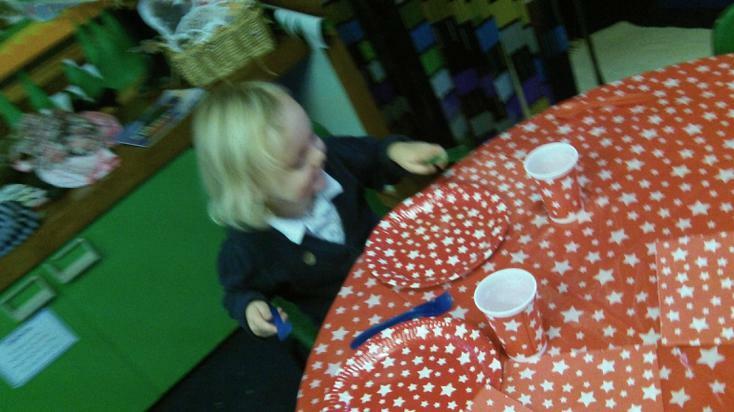 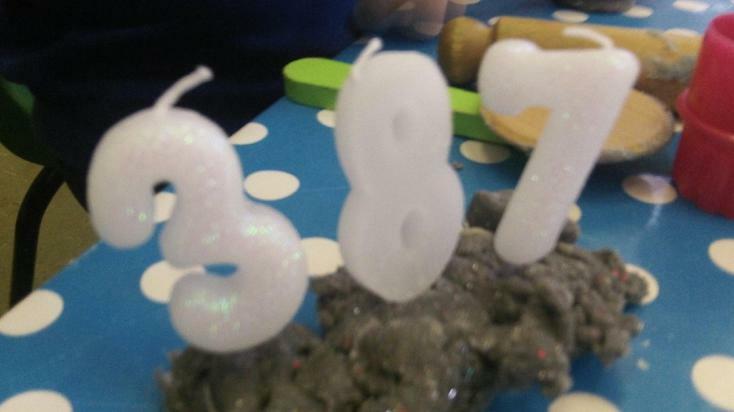 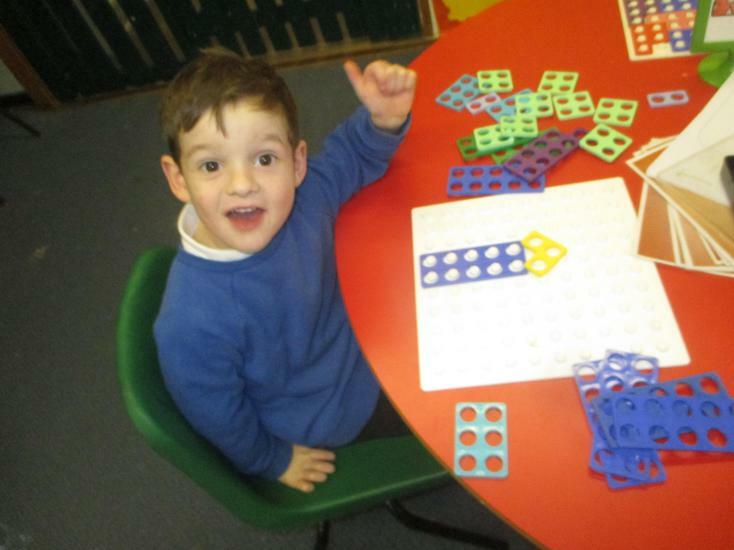 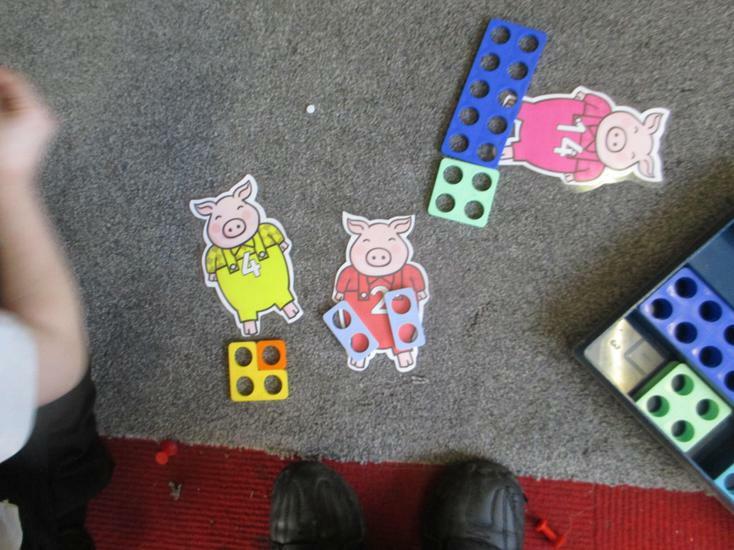 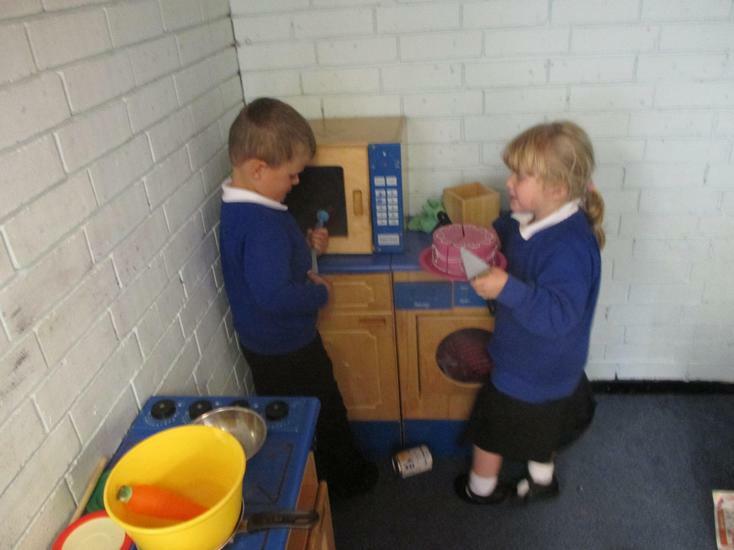 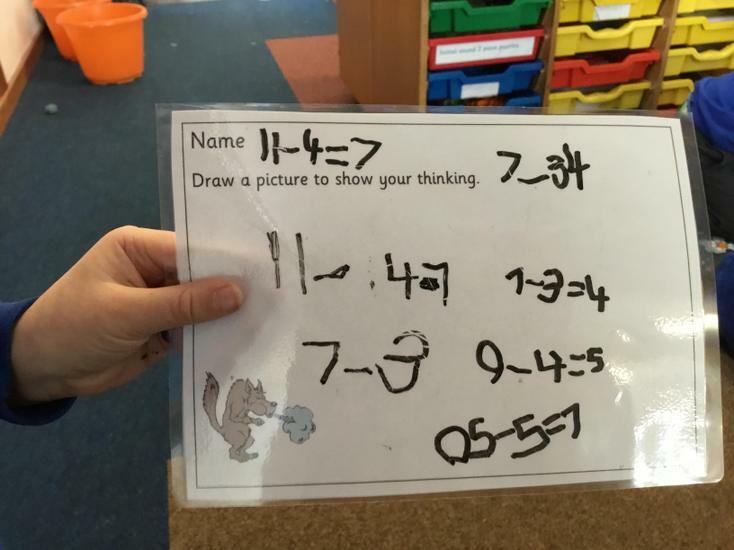 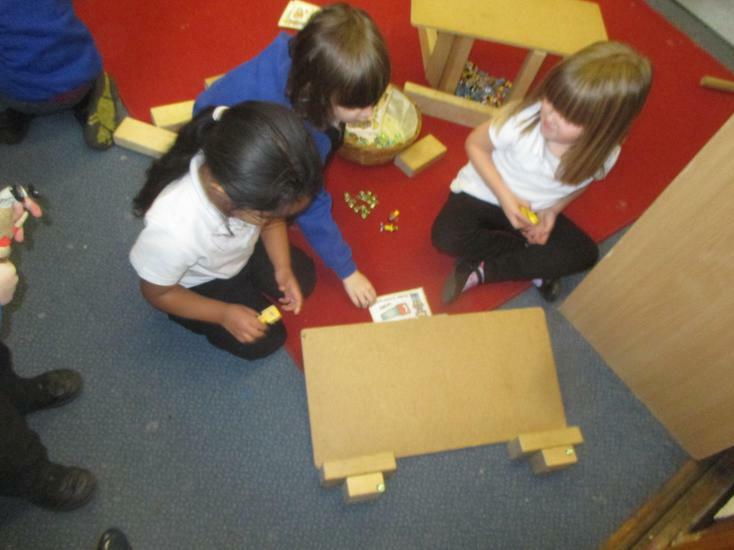 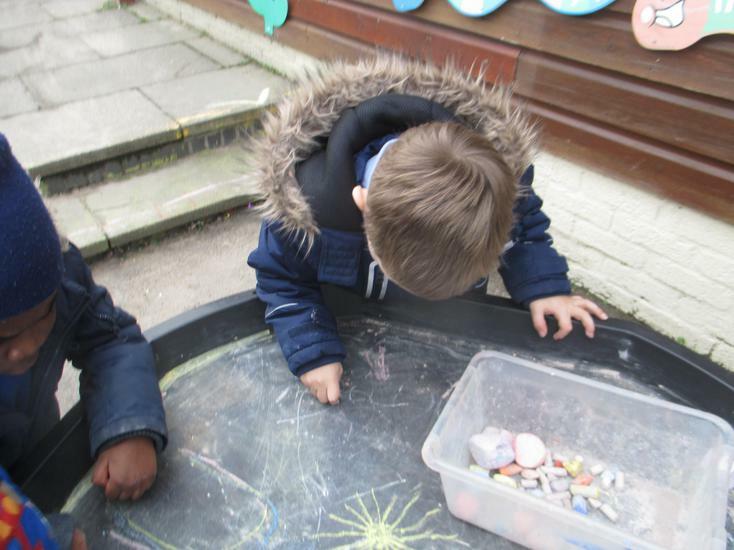 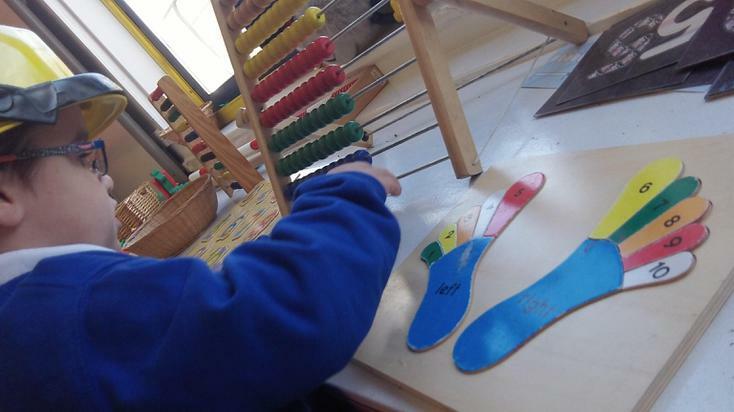 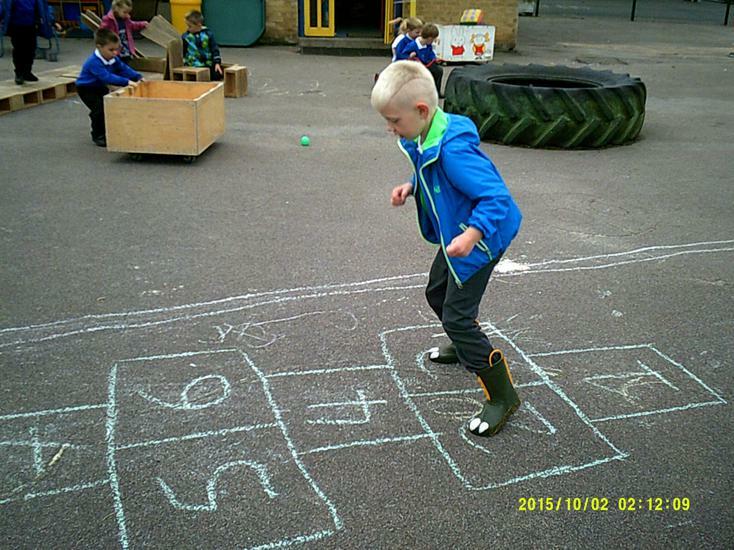 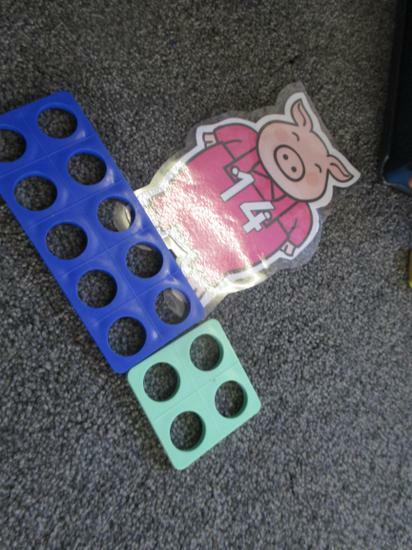 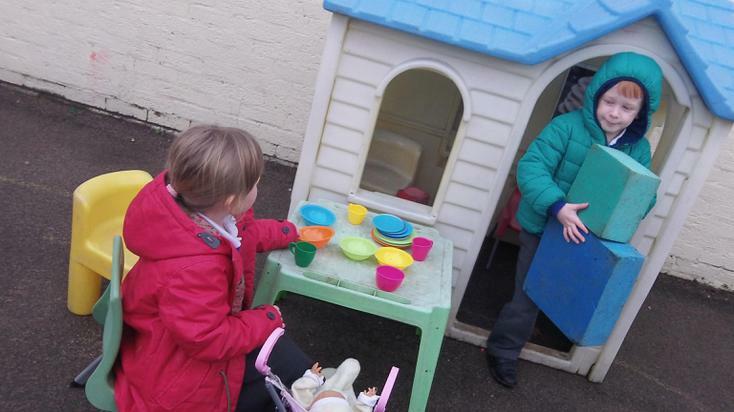 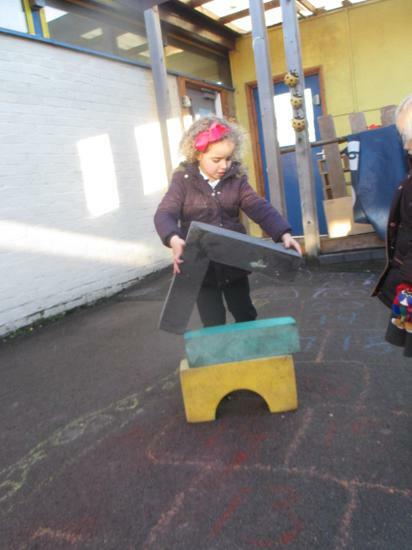 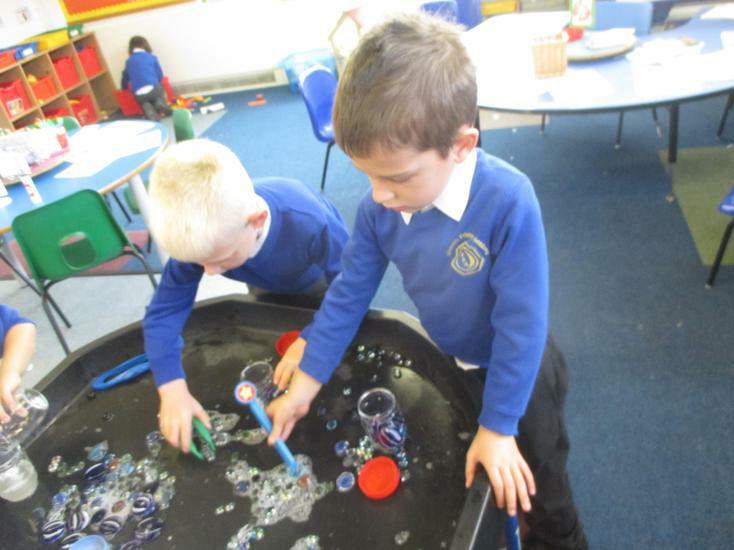 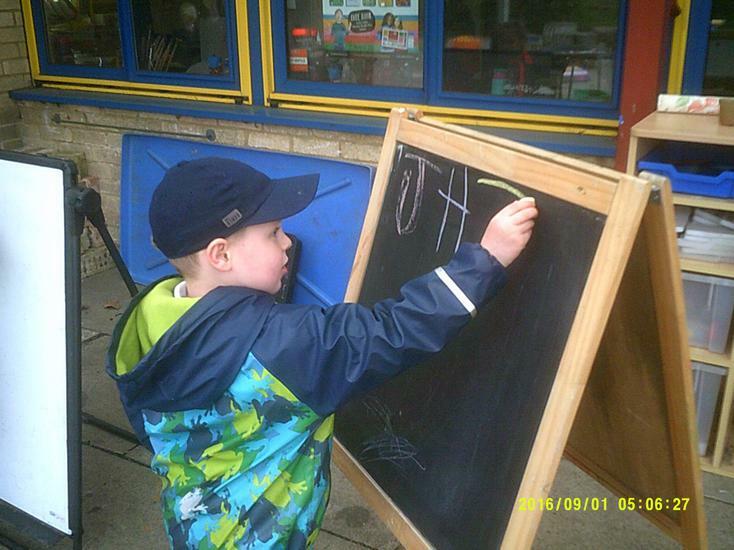 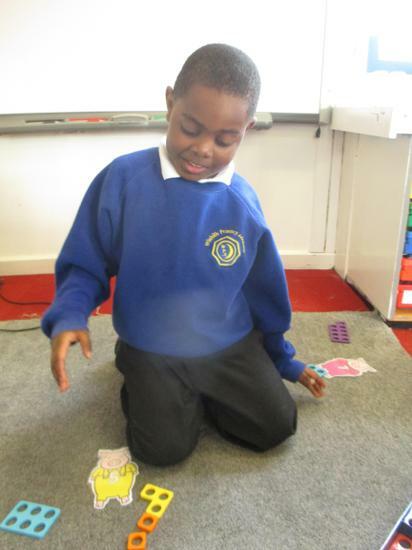 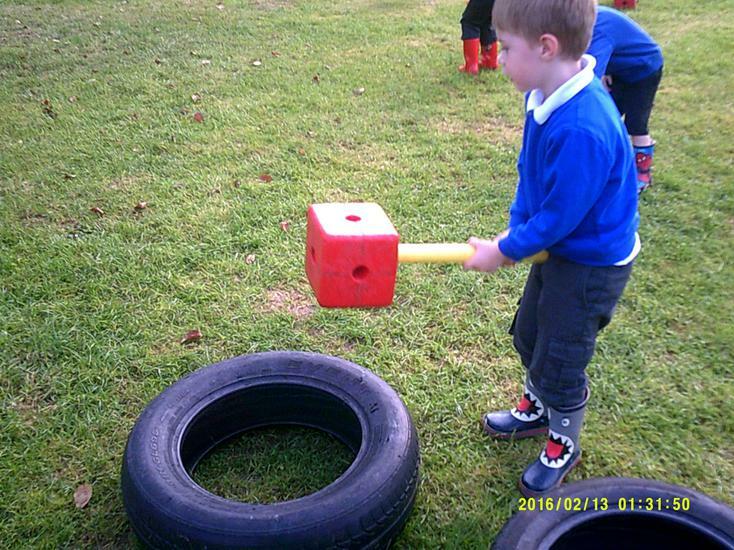 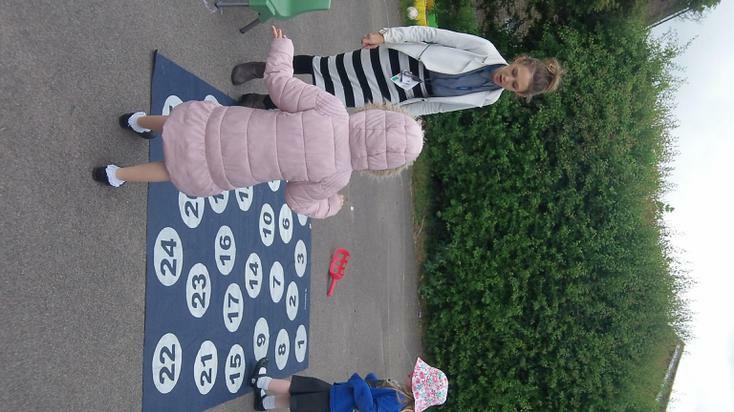 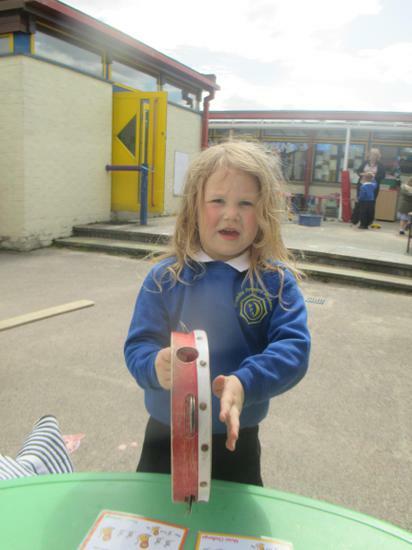 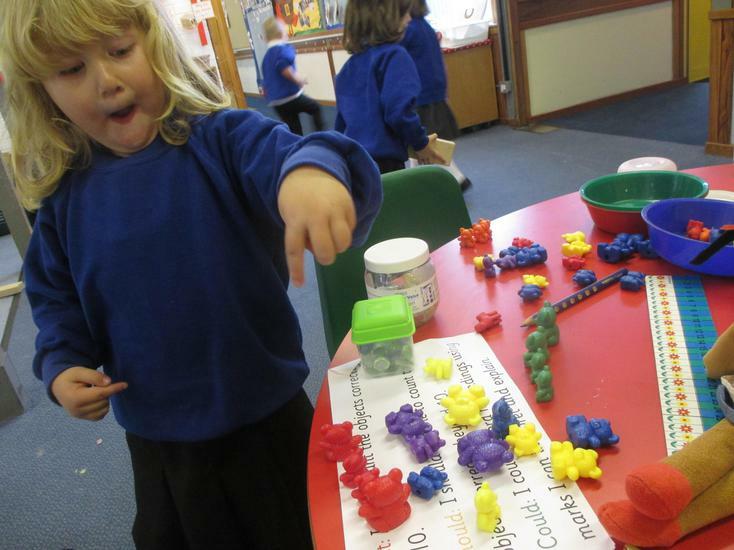 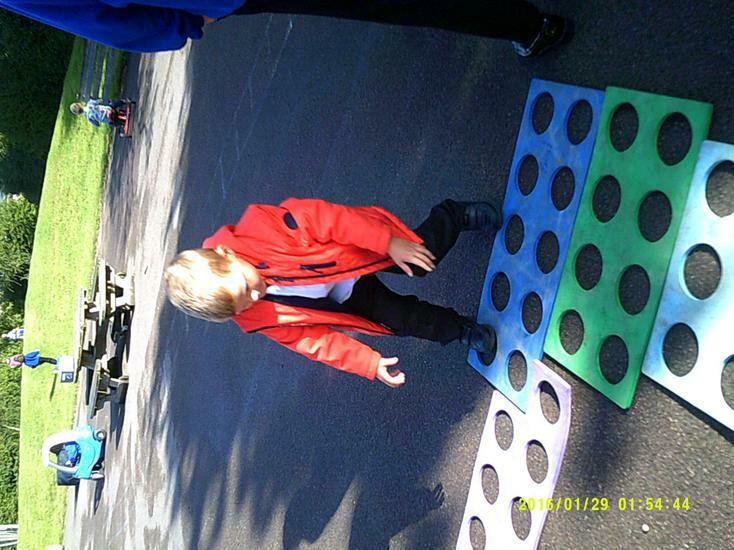 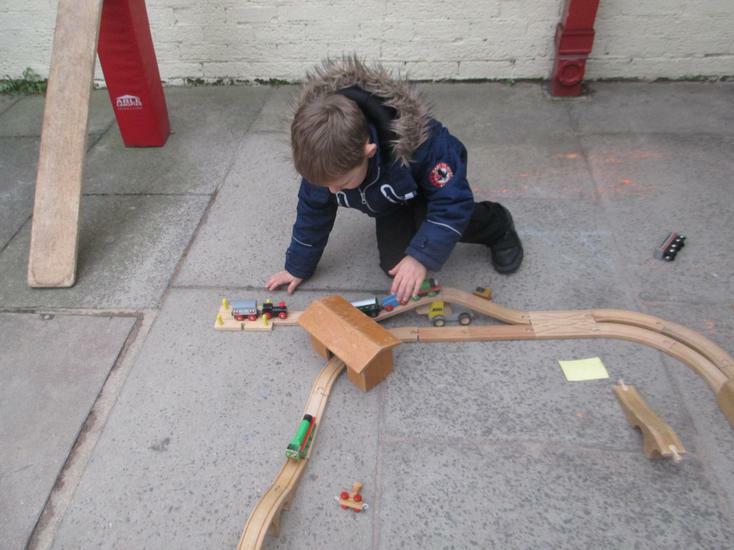 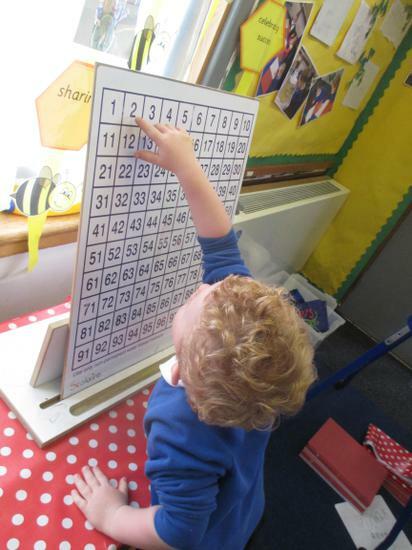 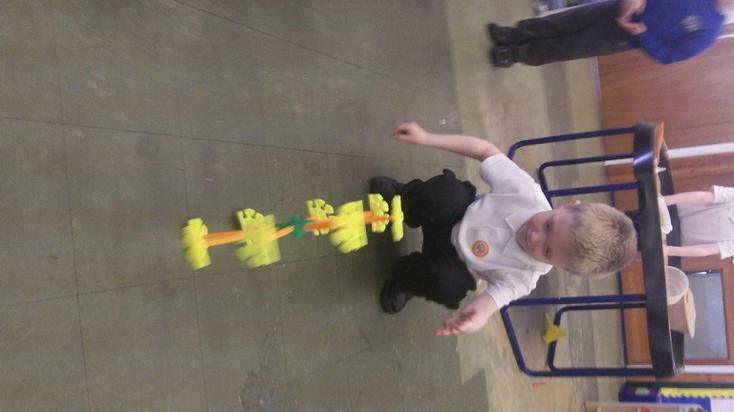 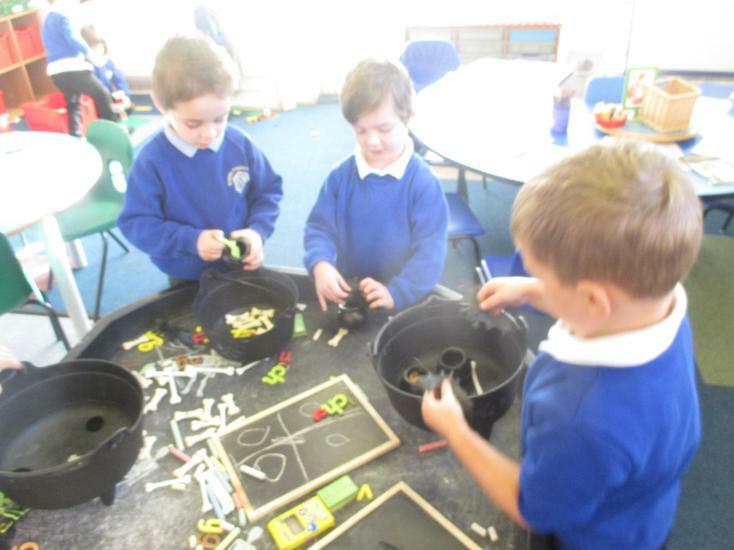 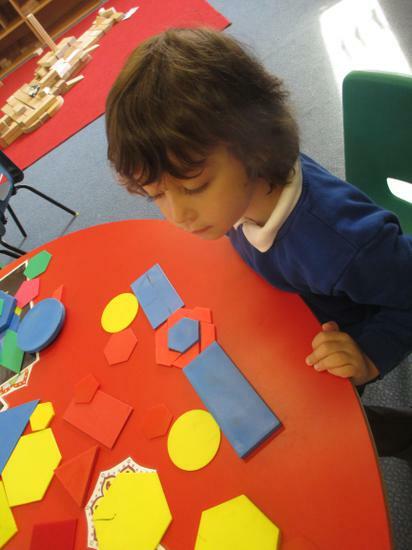 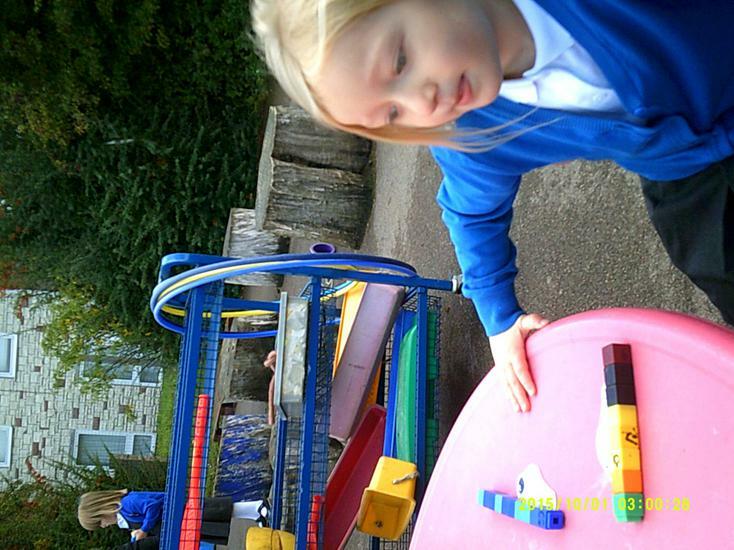 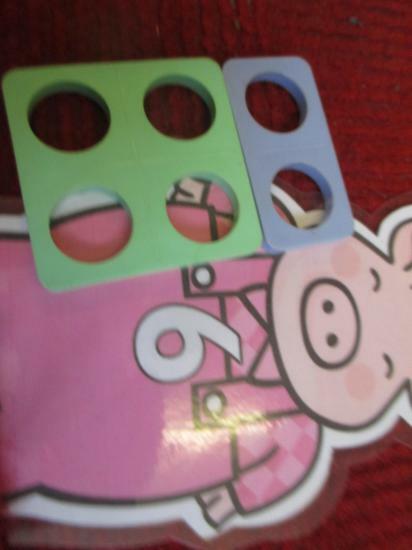 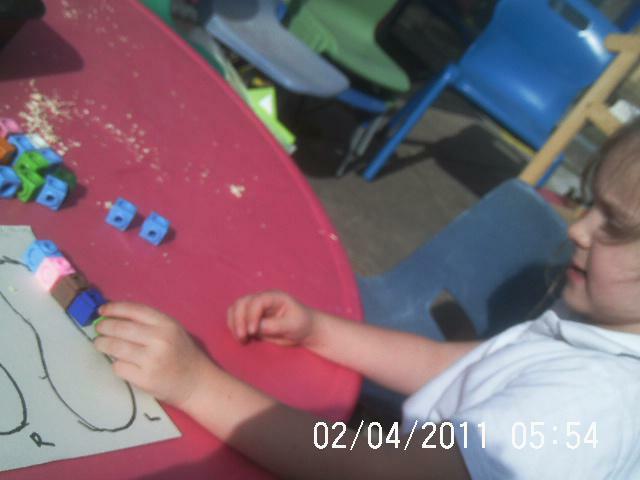 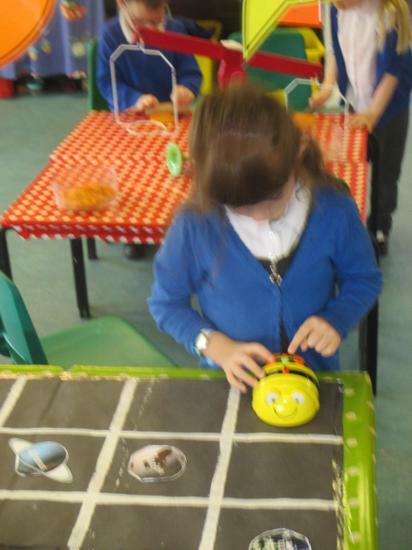 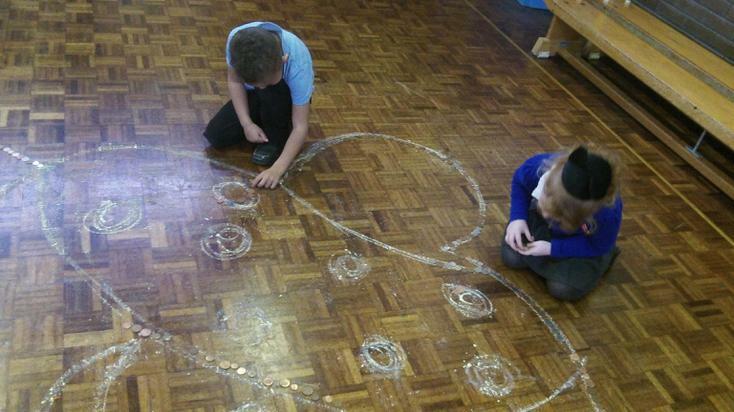 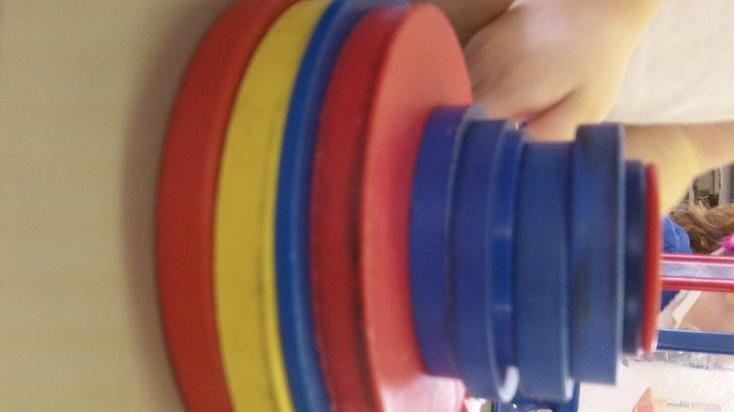 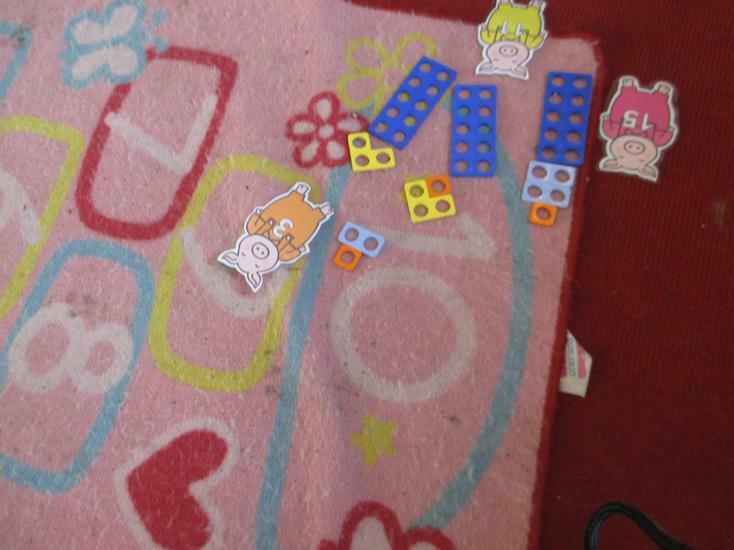 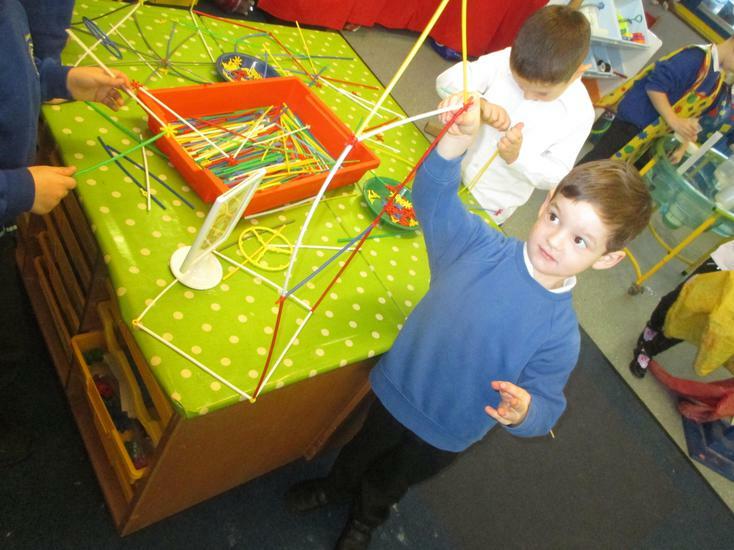 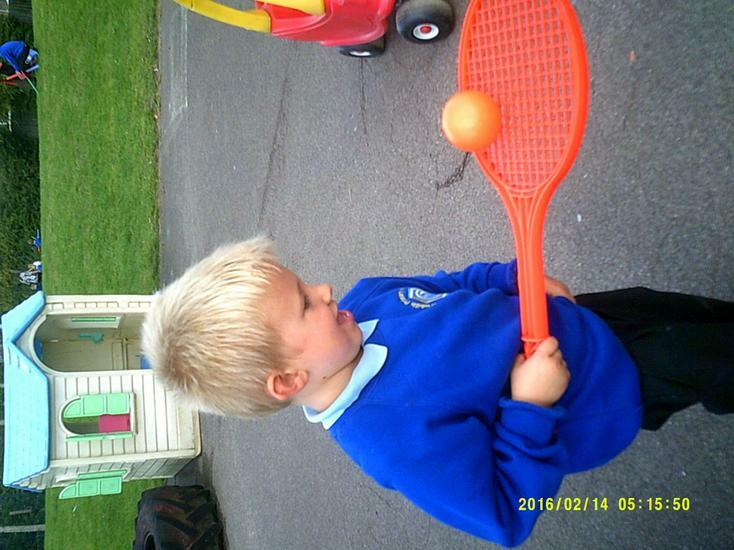 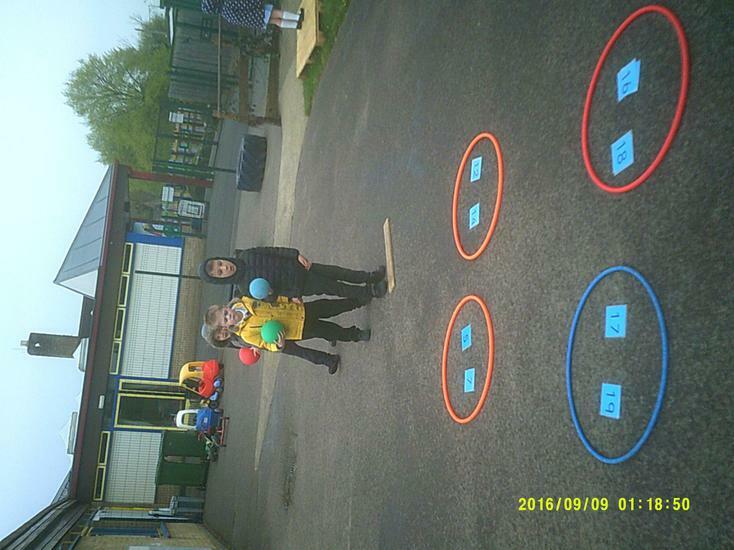 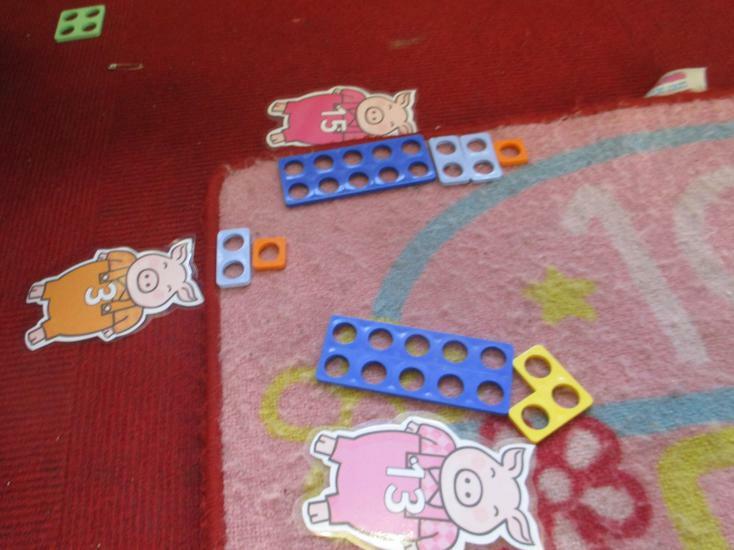 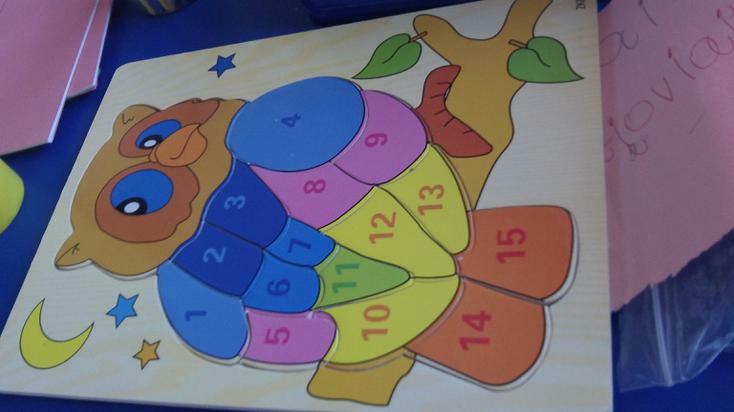 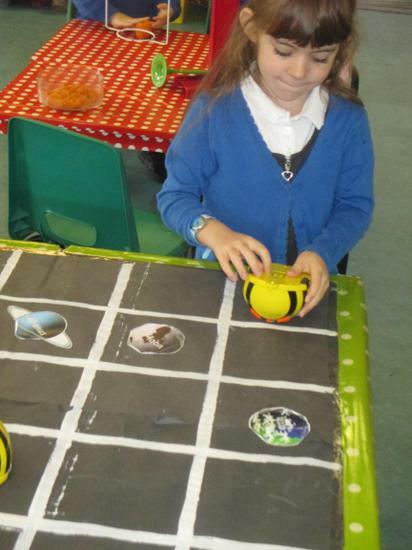 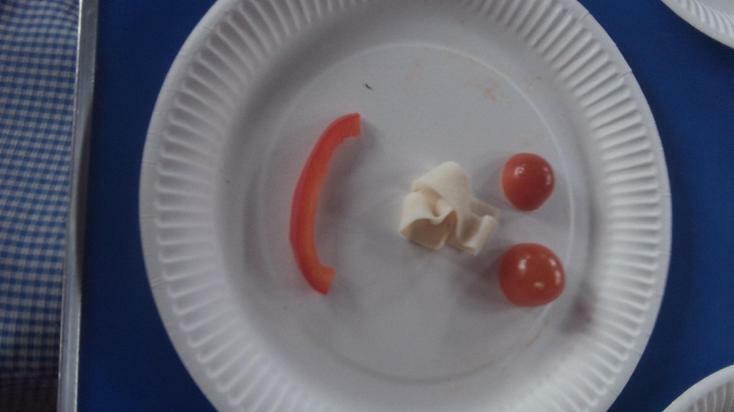 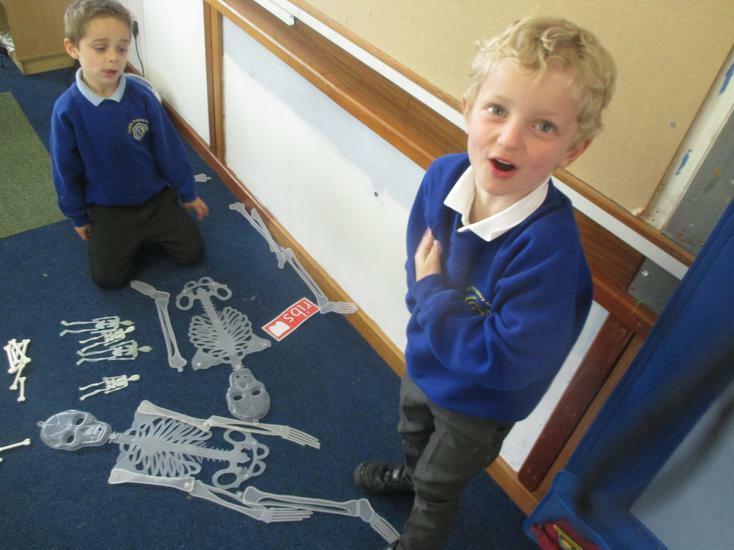 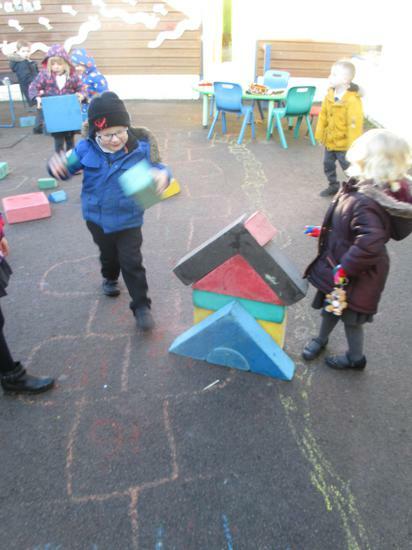 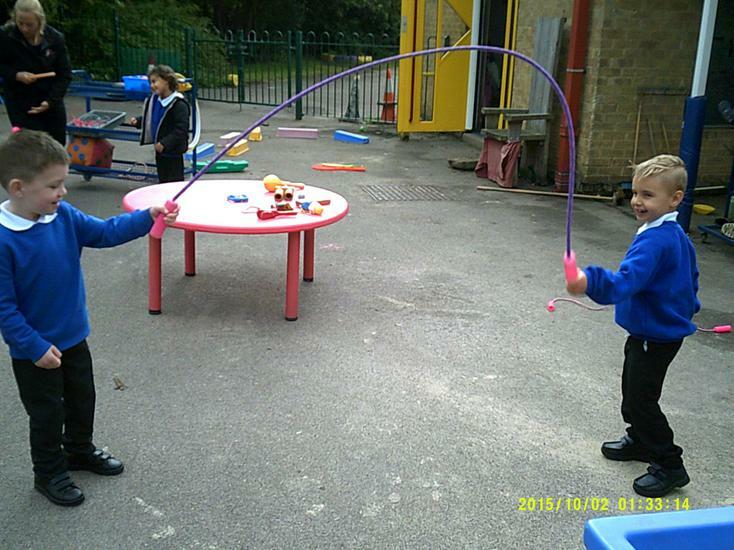 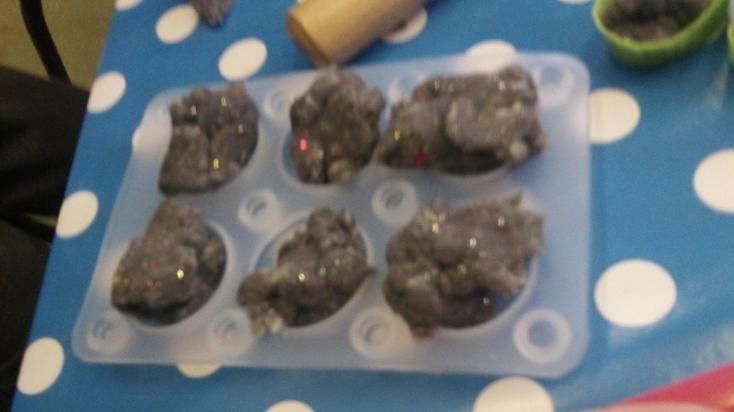 We will also explore maths inside and outside, beginning with counting objects and actions accurately. 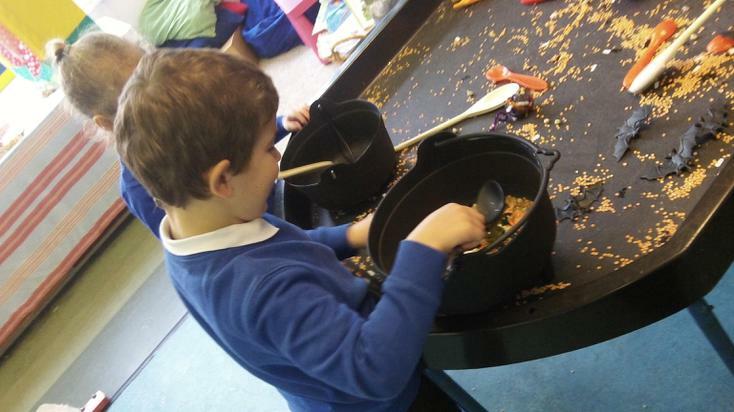 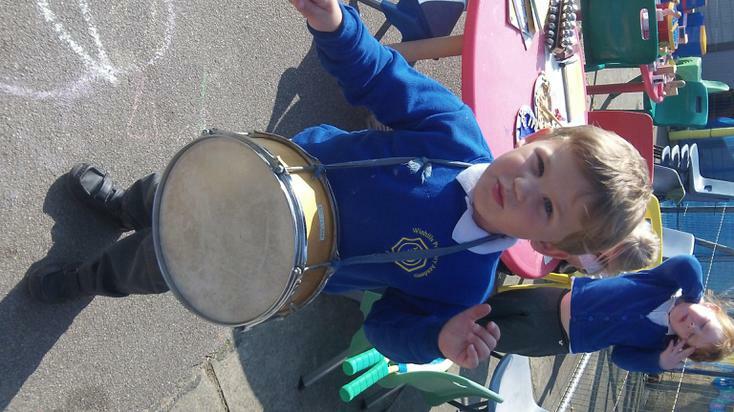 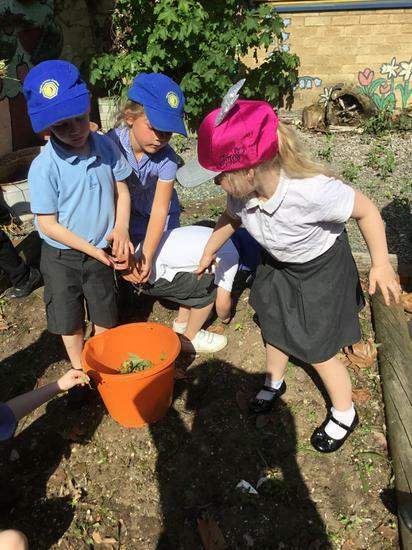 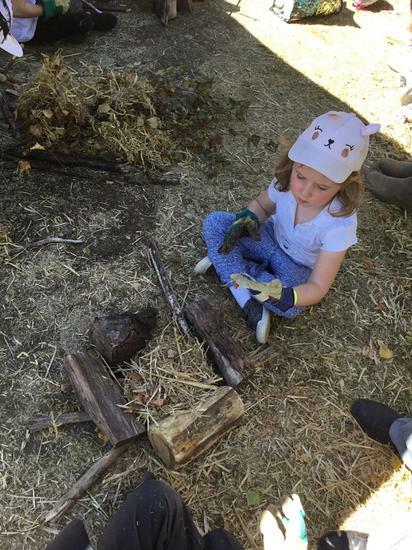 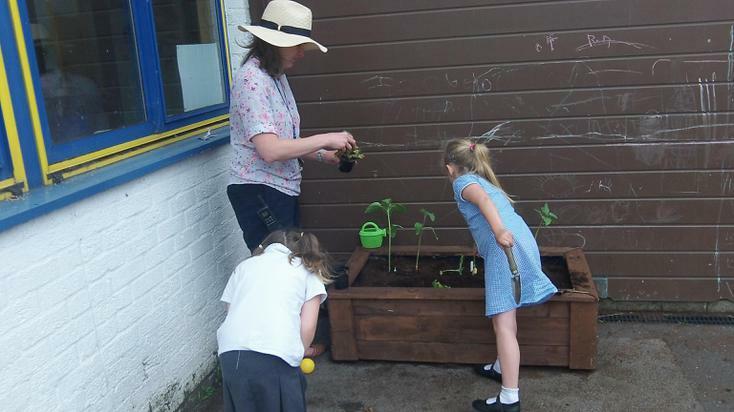 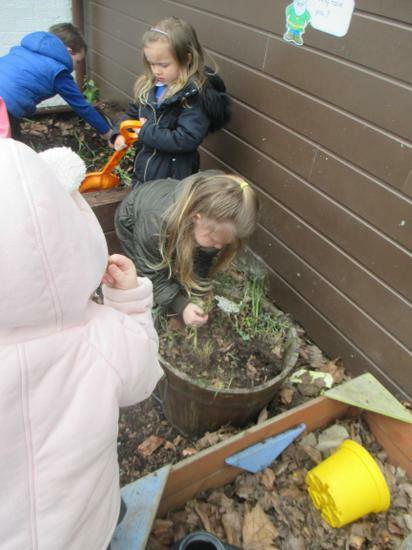 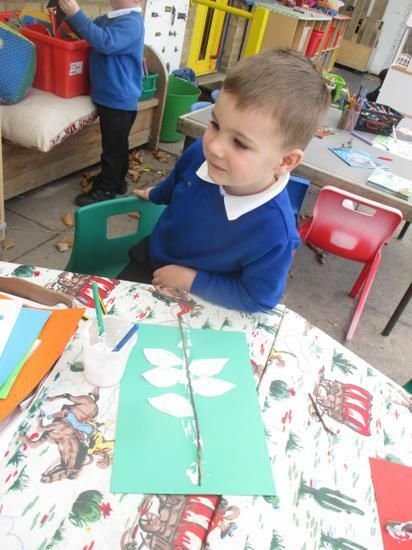 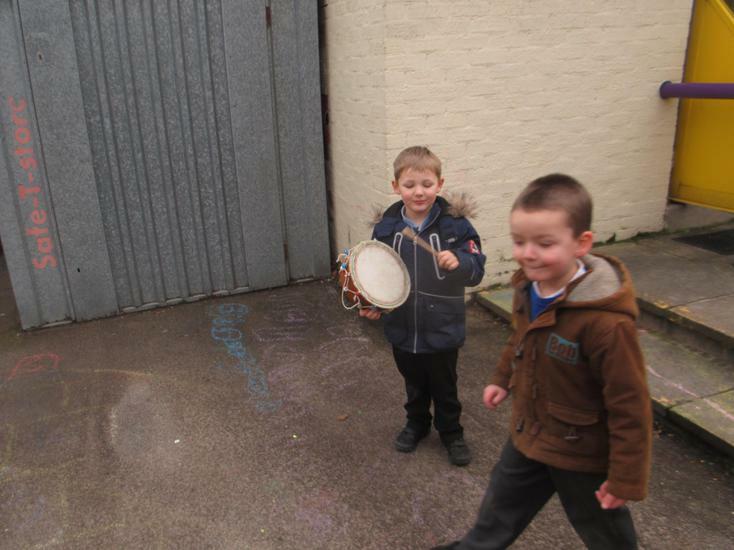 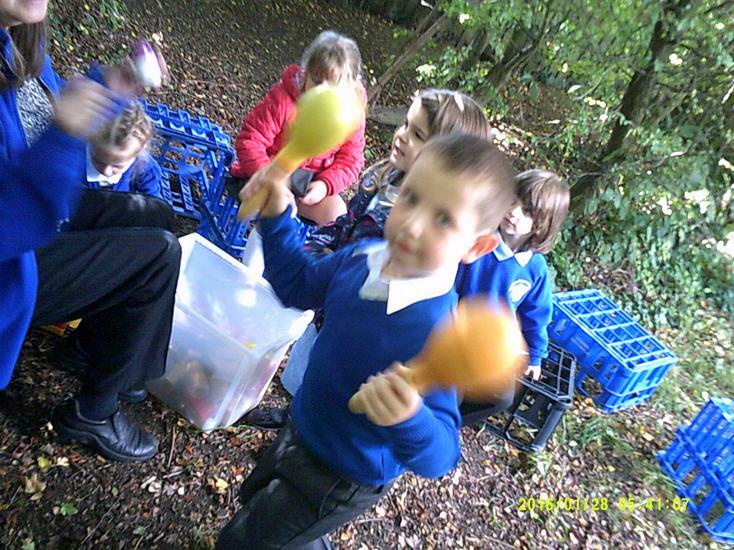 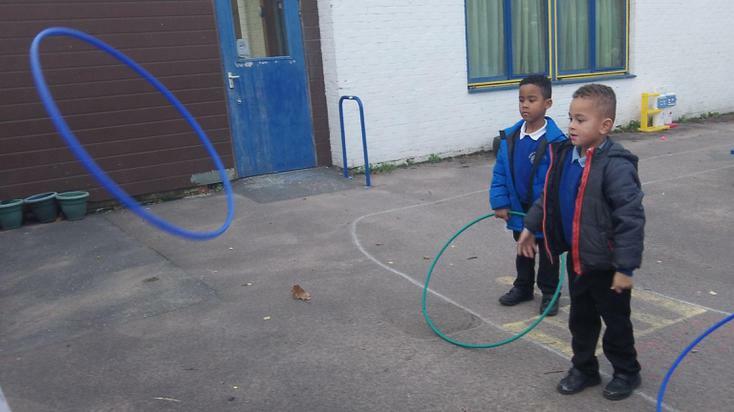 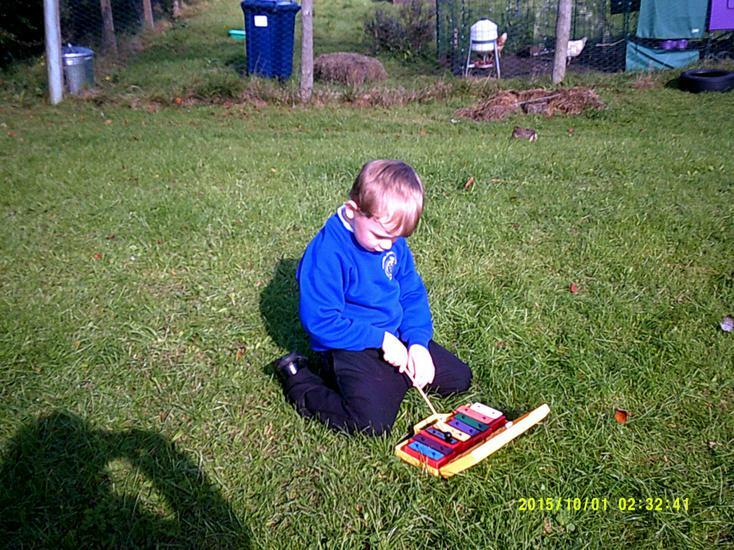 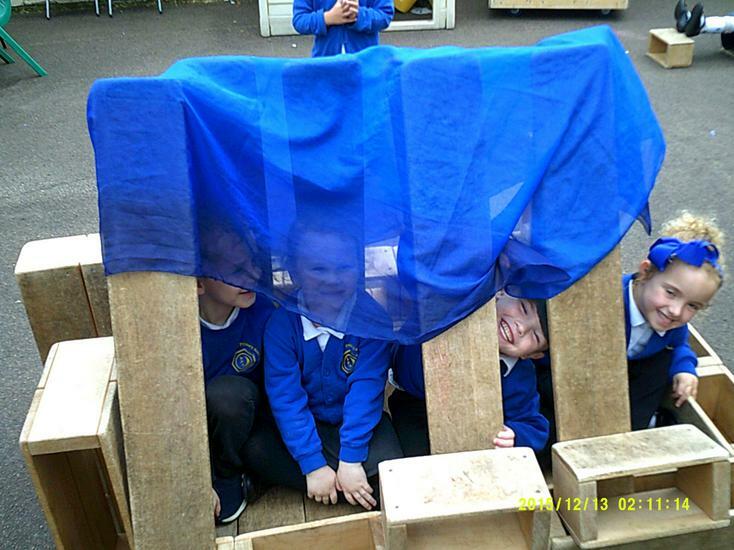 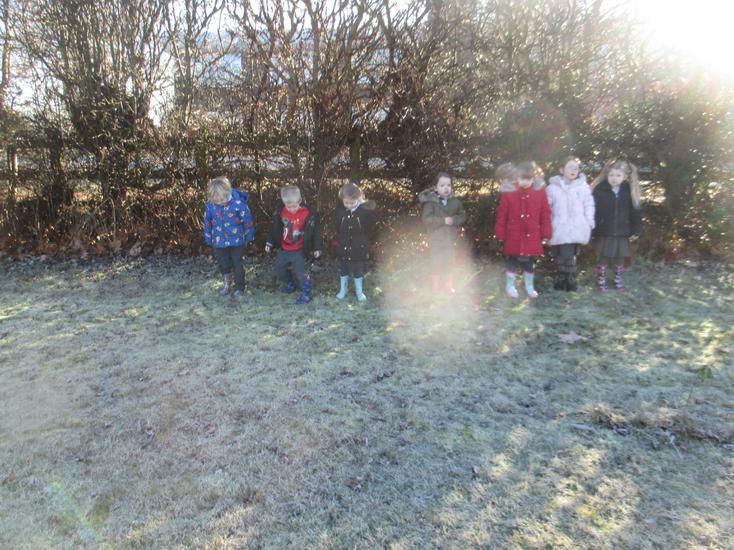 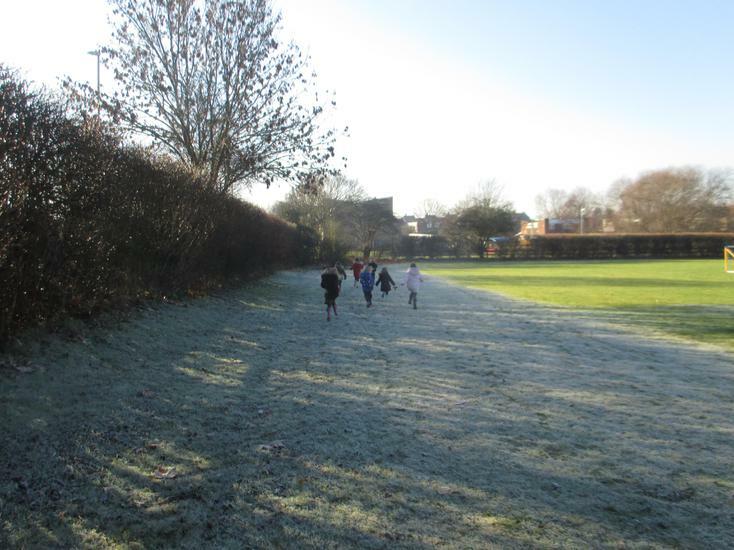 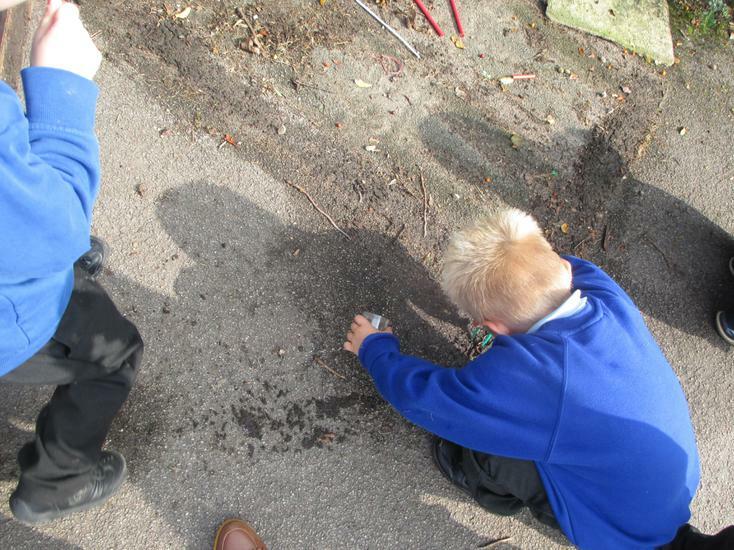 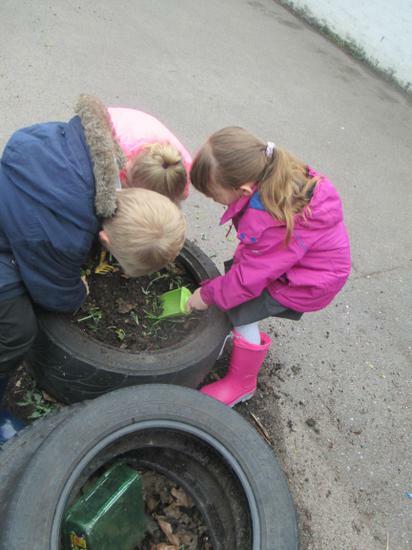 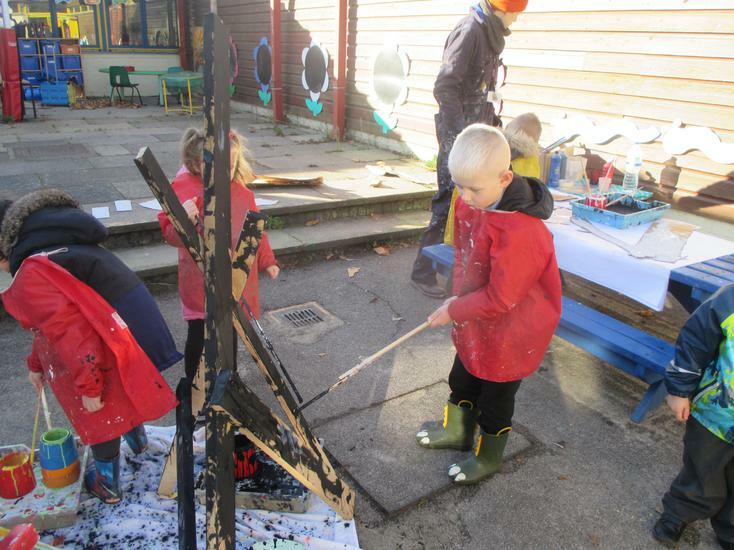 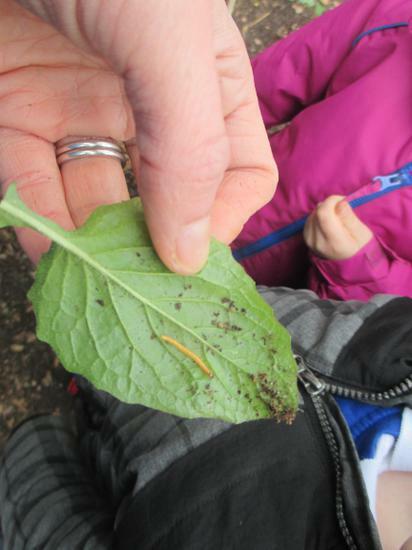 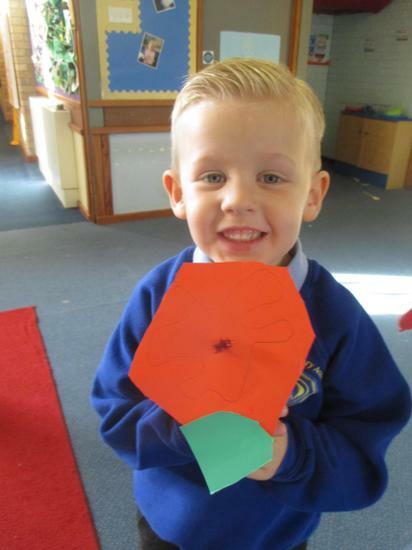 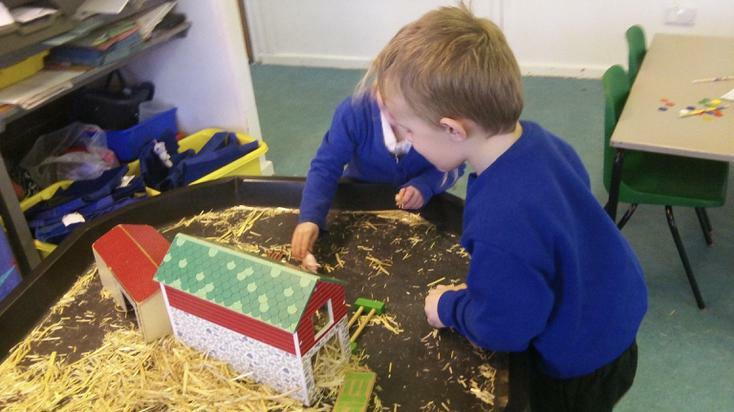 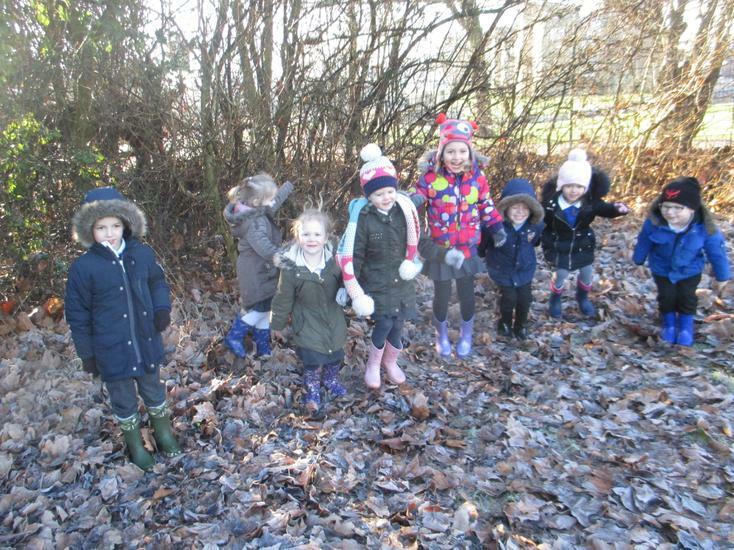 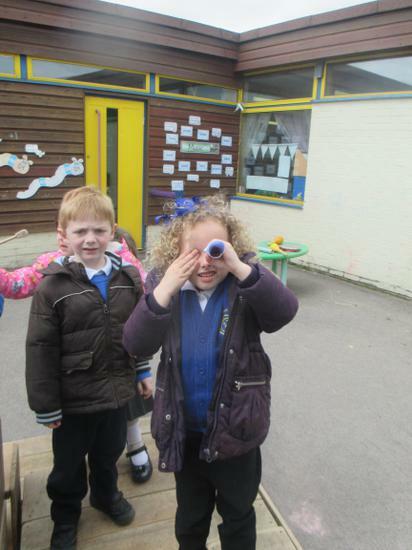 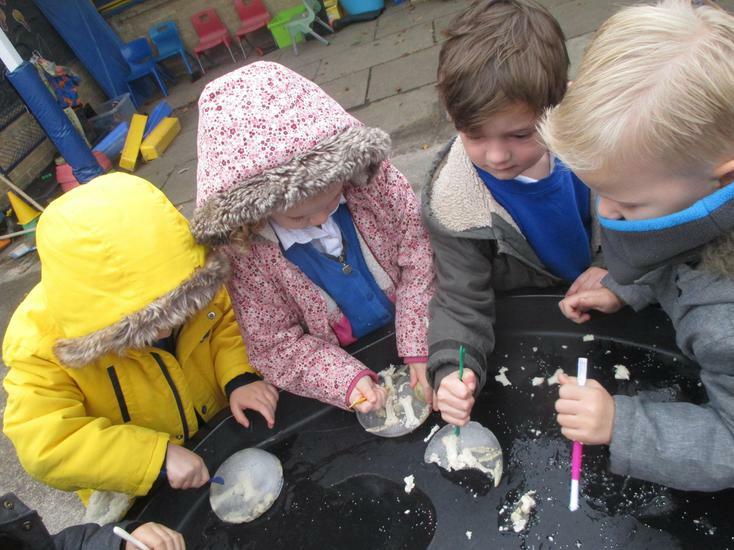 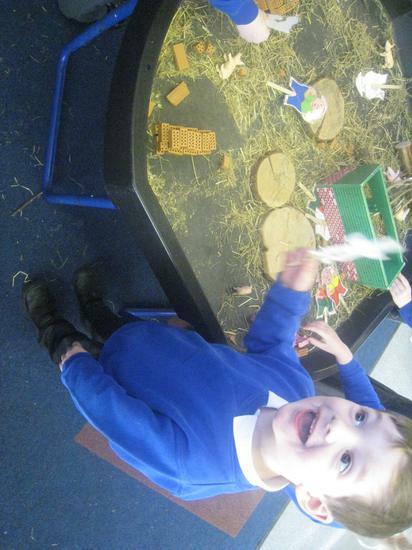 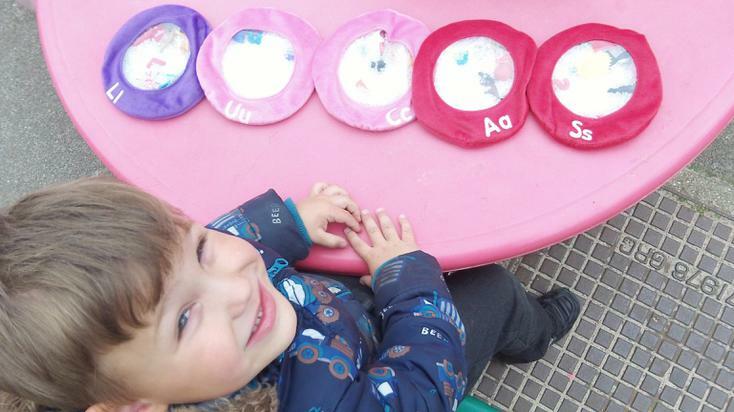 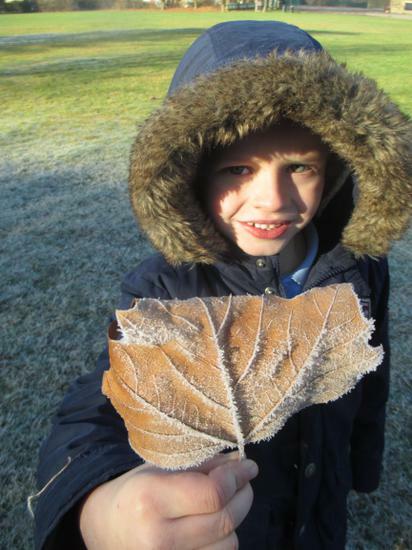 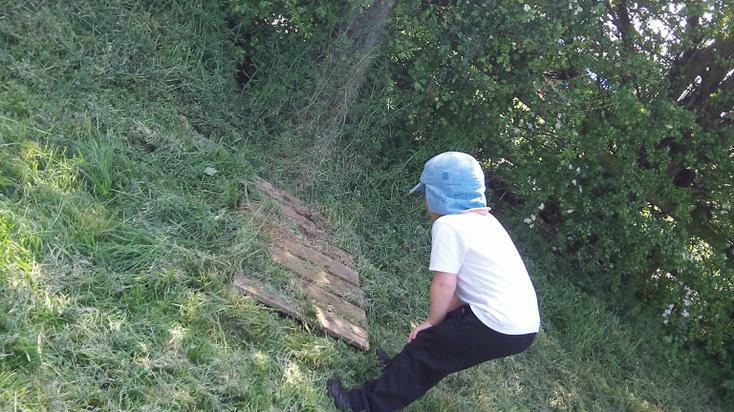 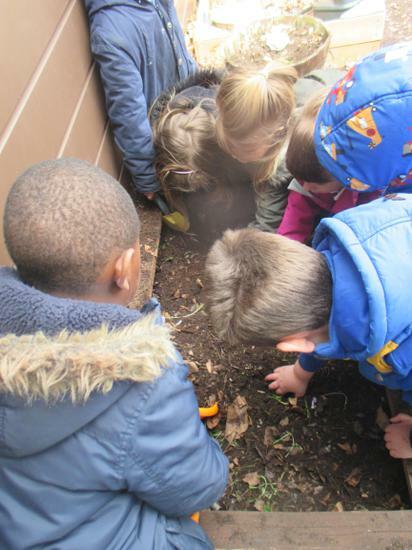 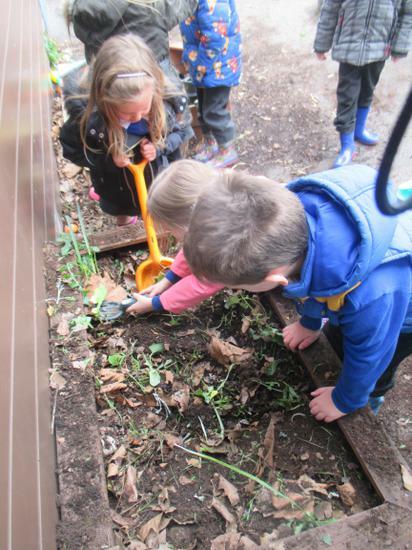 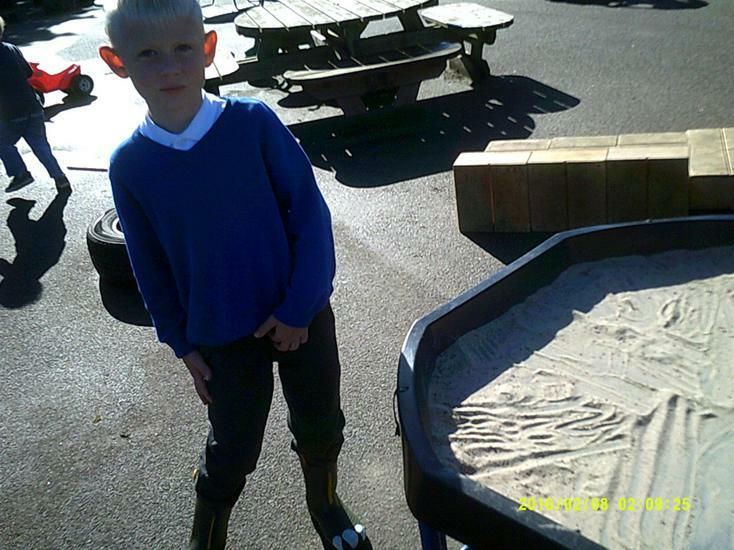 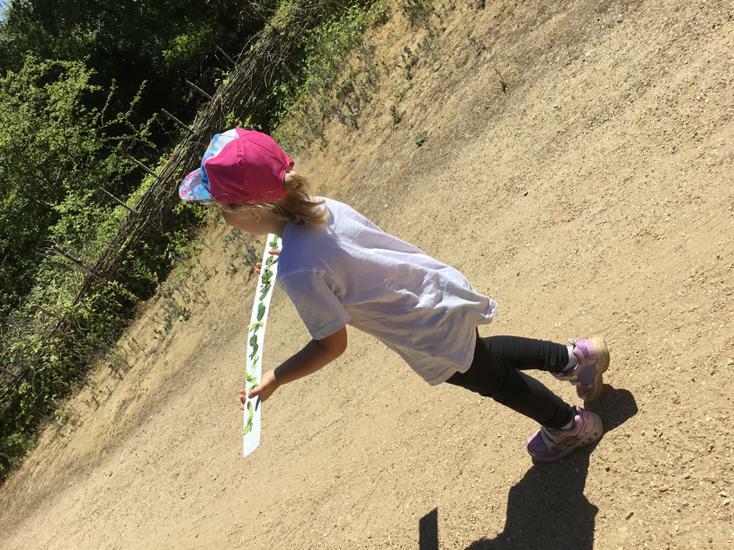 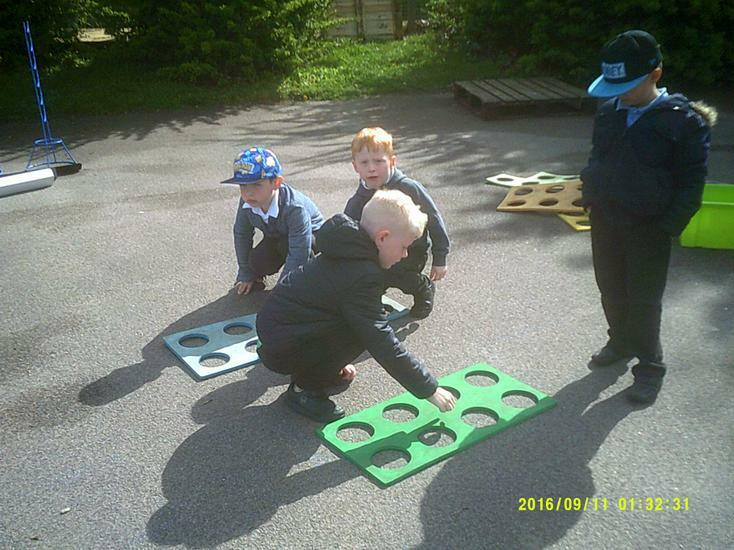 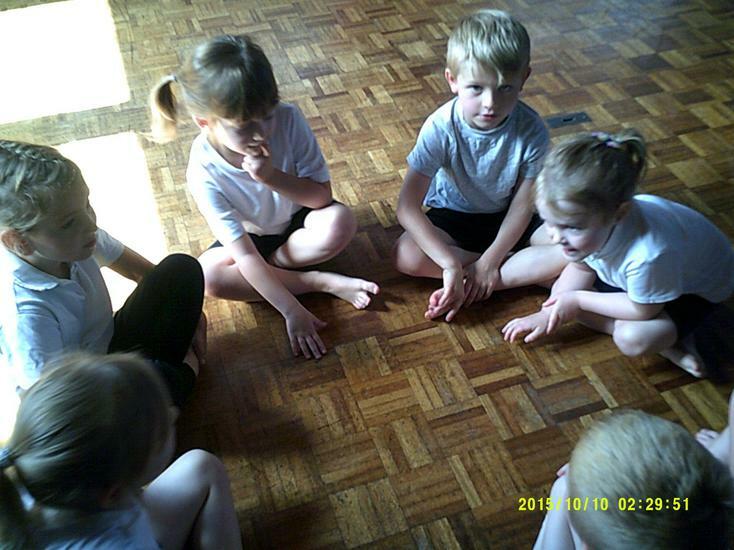 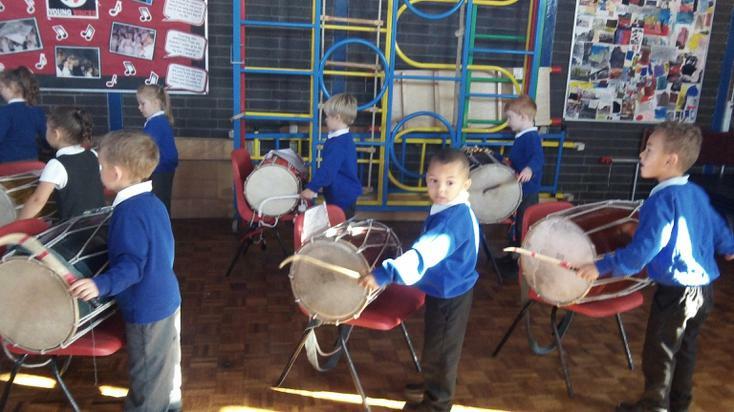 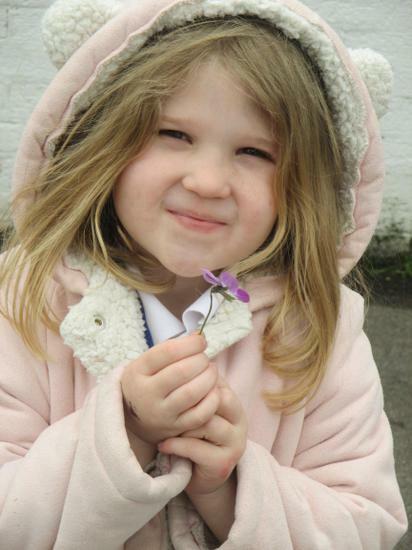 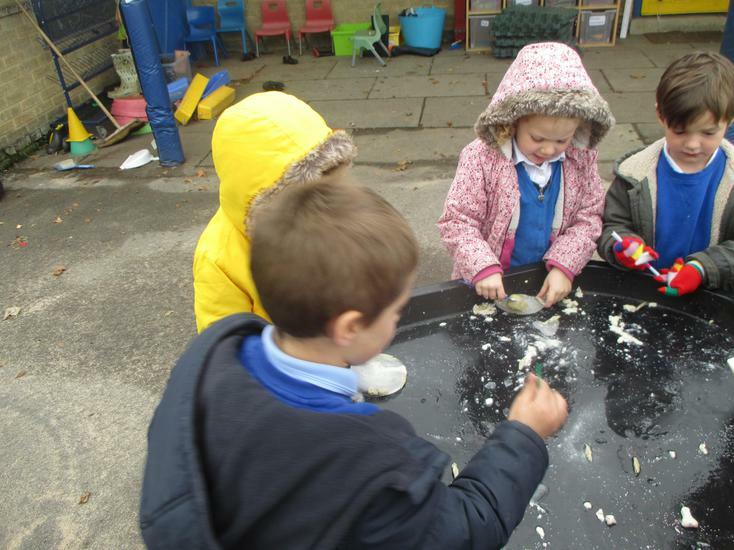 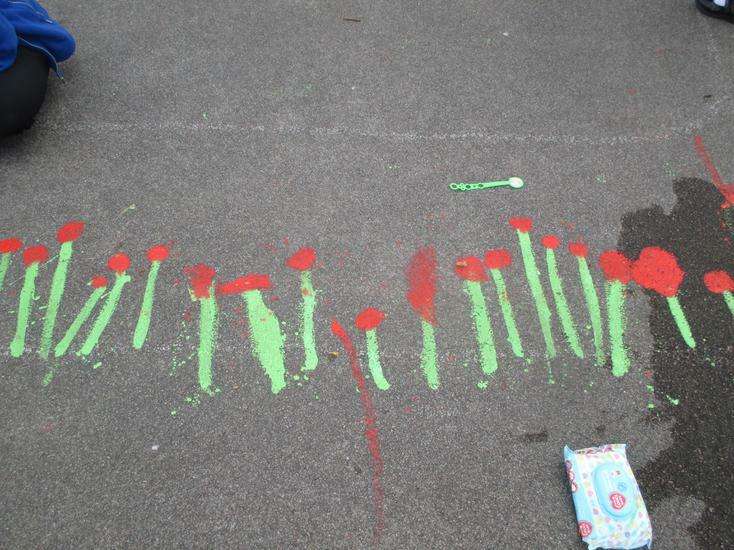 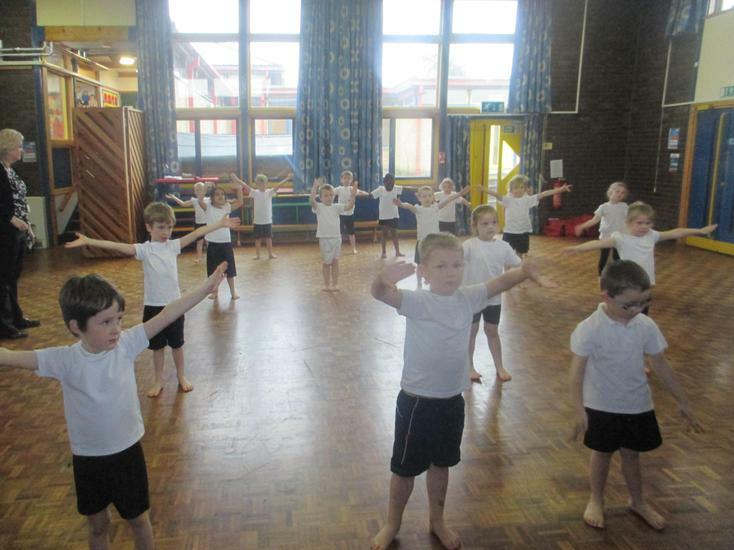 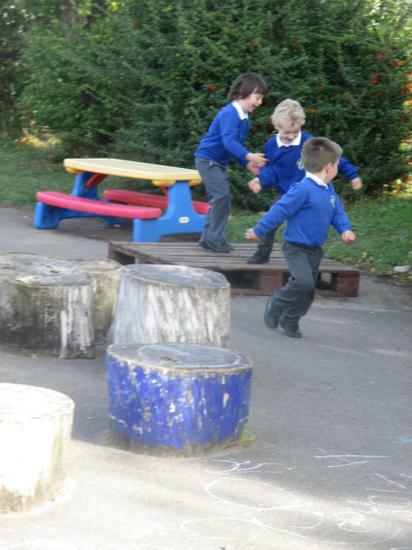 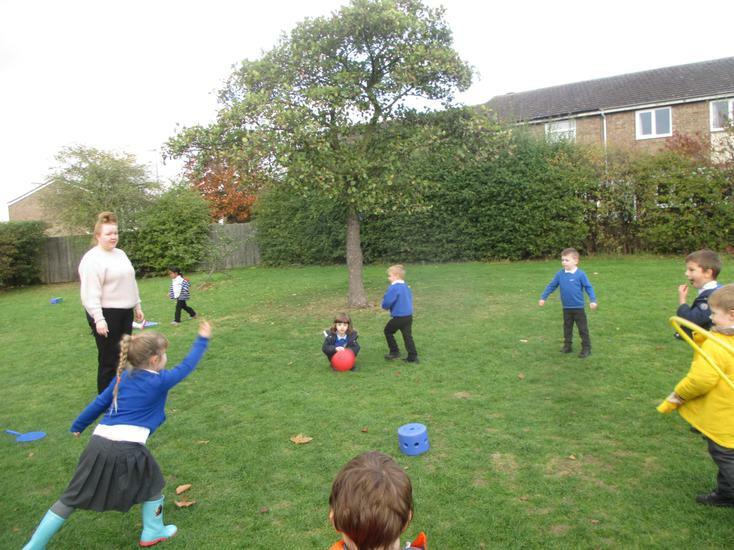 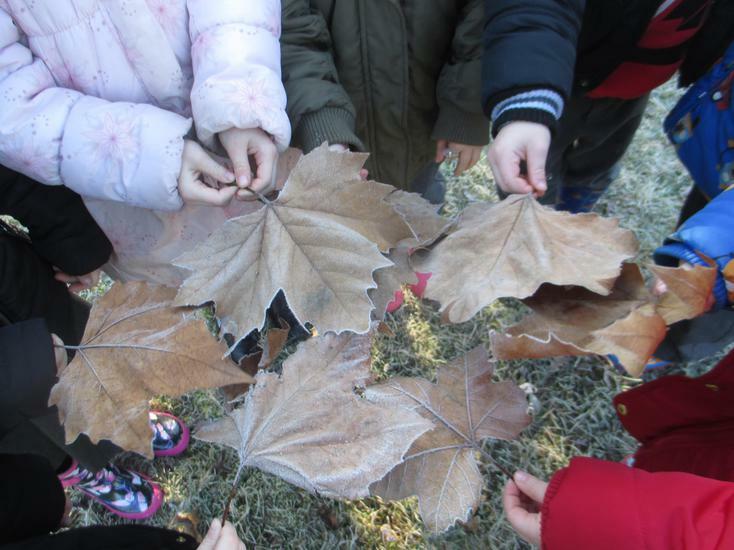 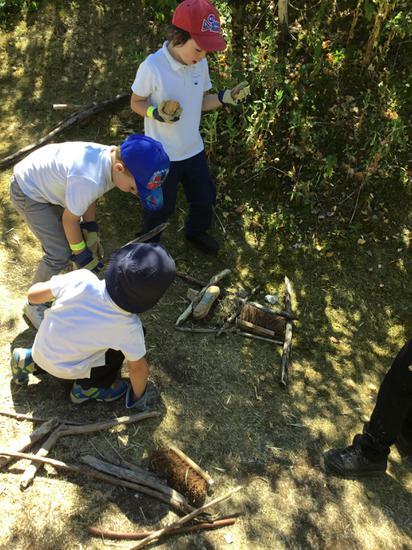 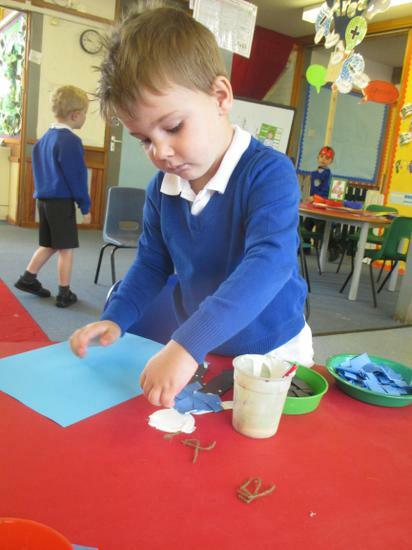 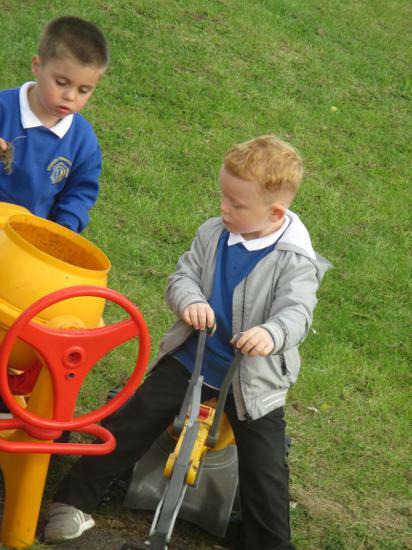 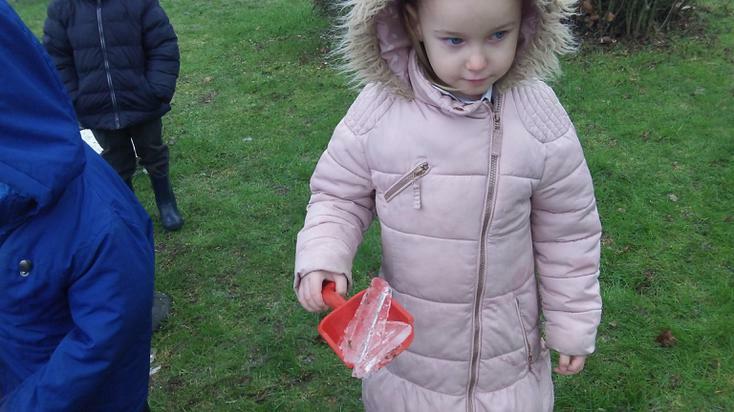 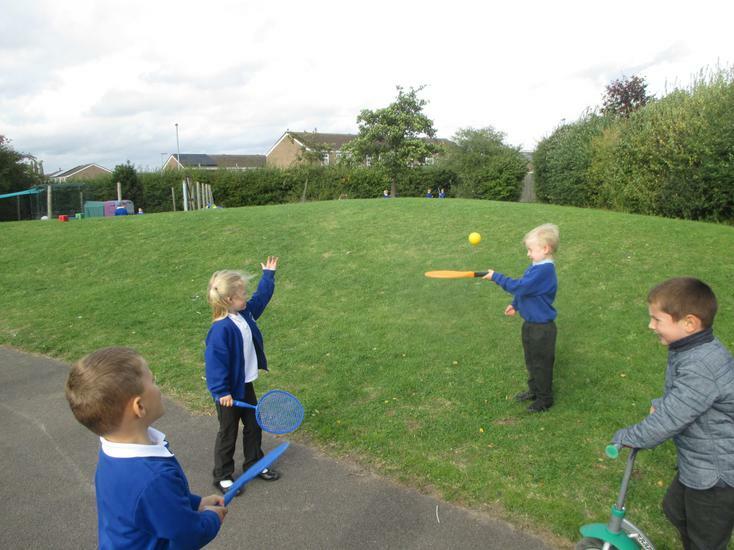 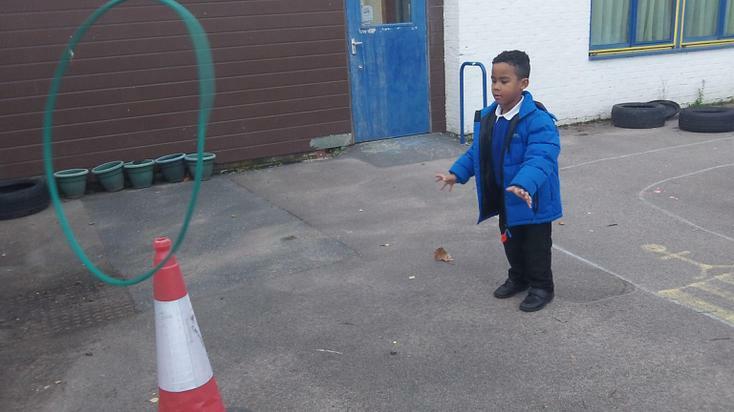 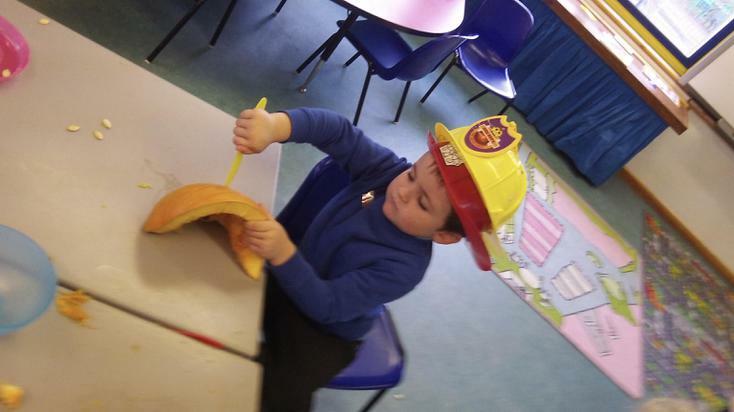 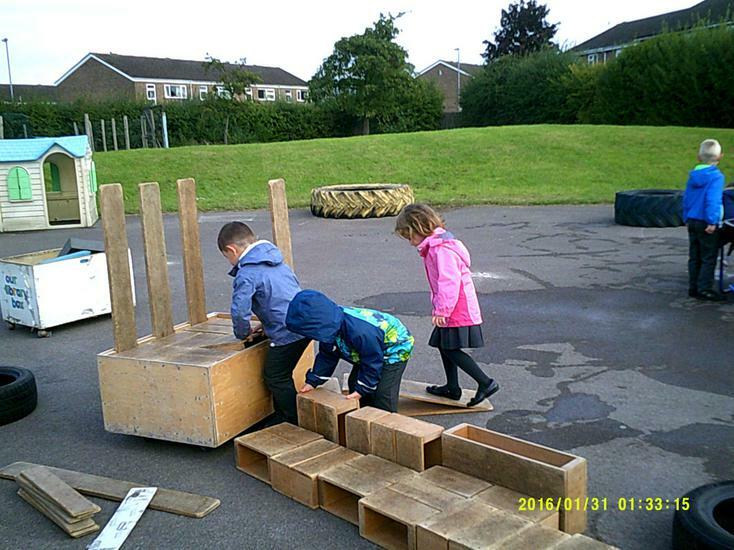 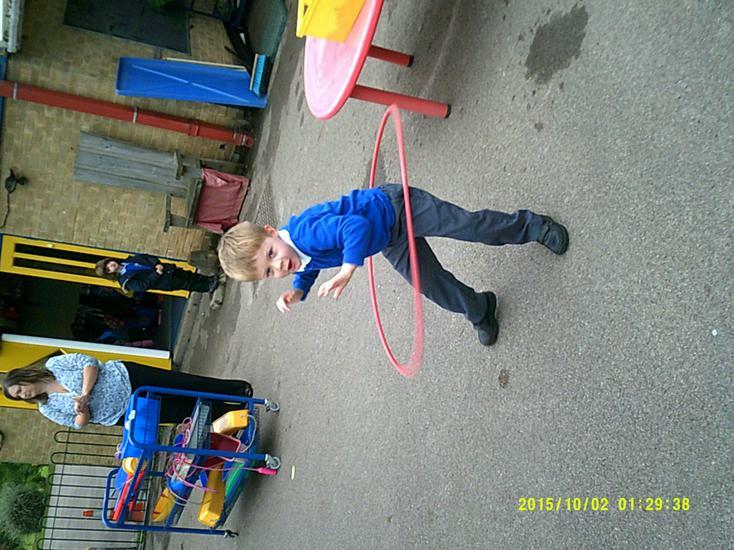 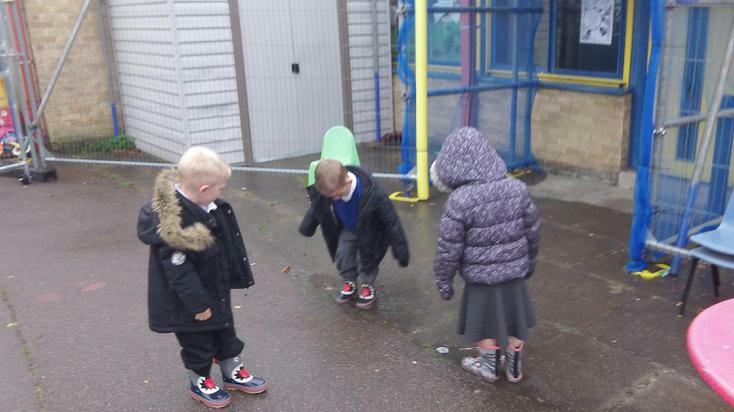 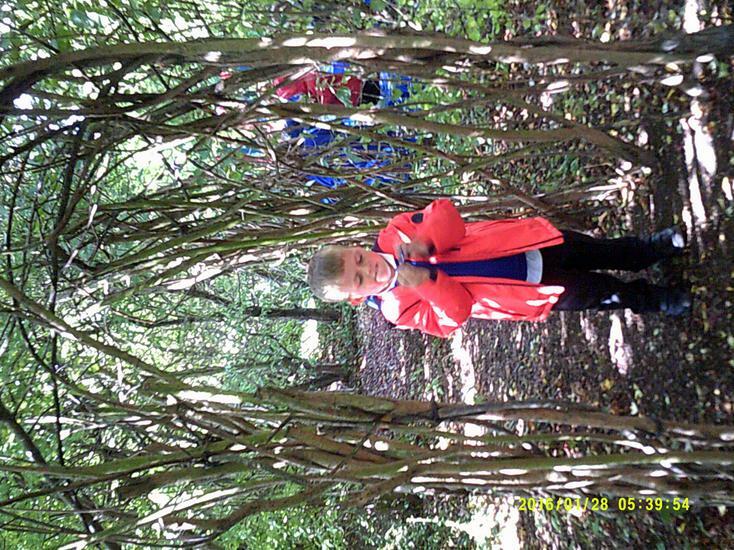 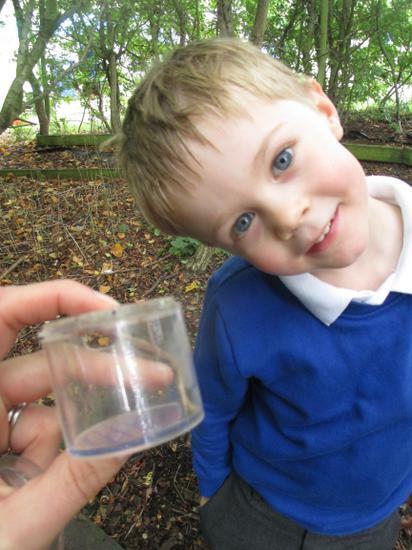 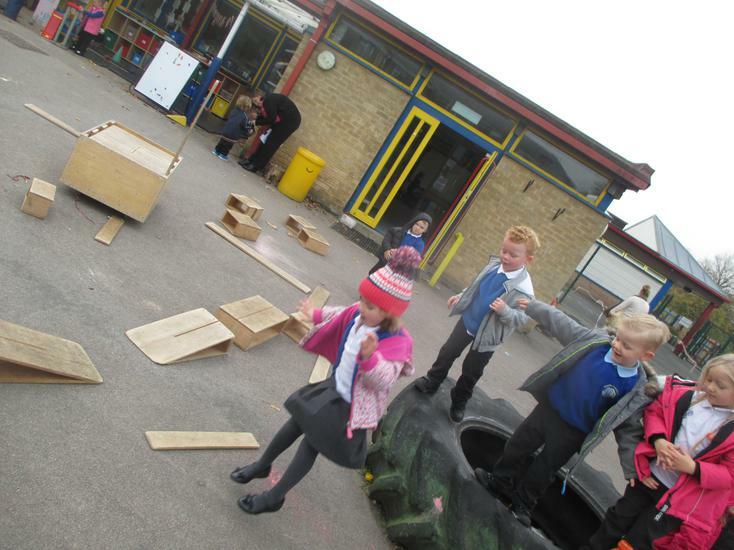 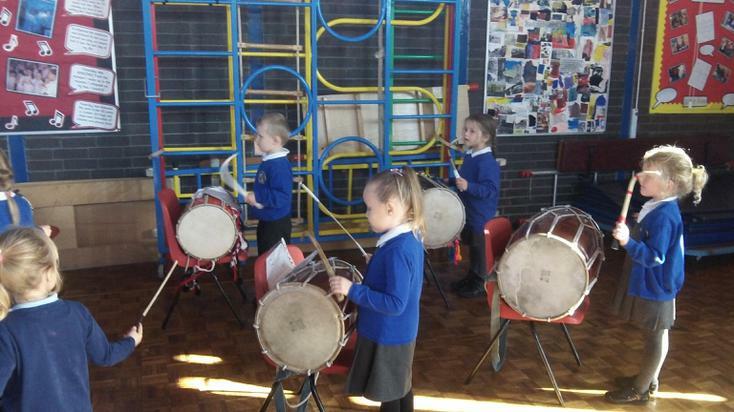 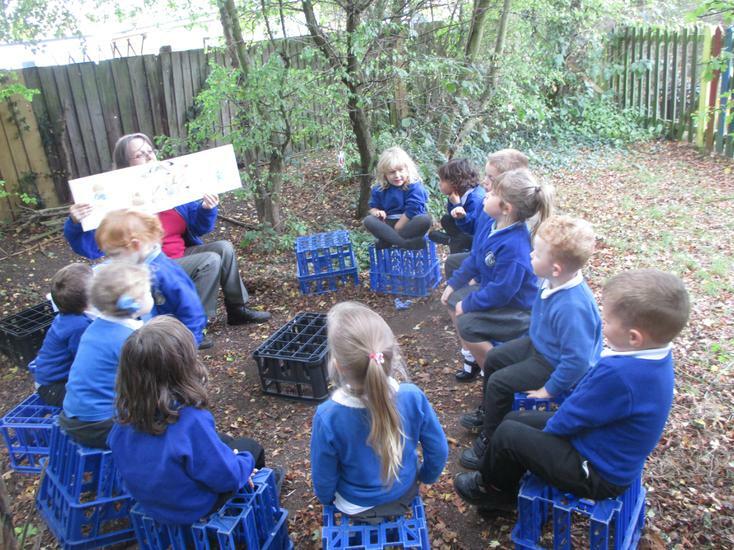 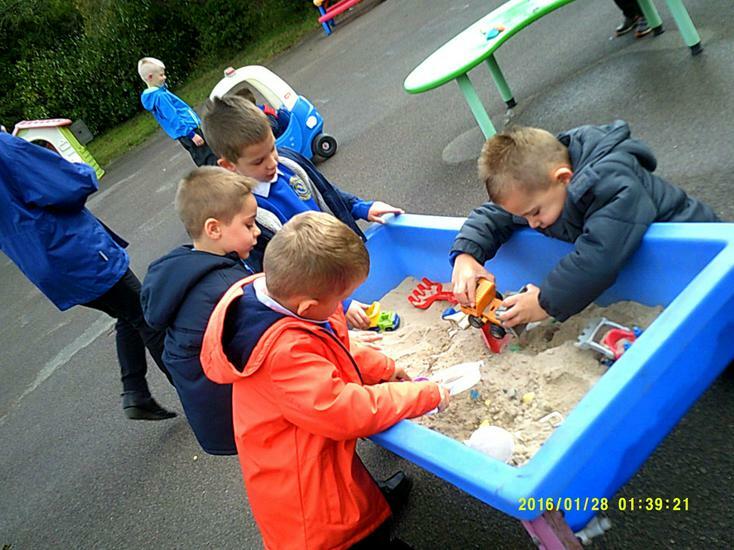 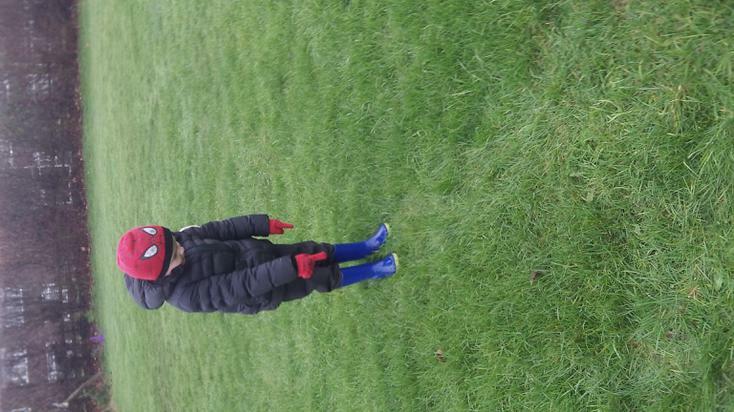 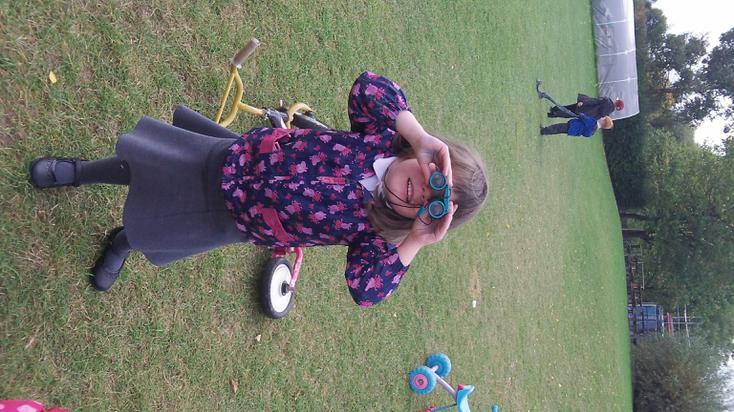 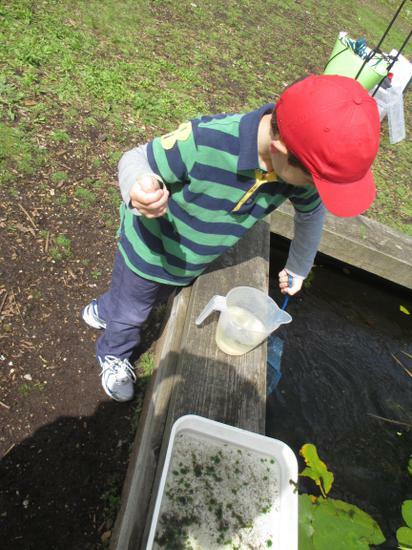 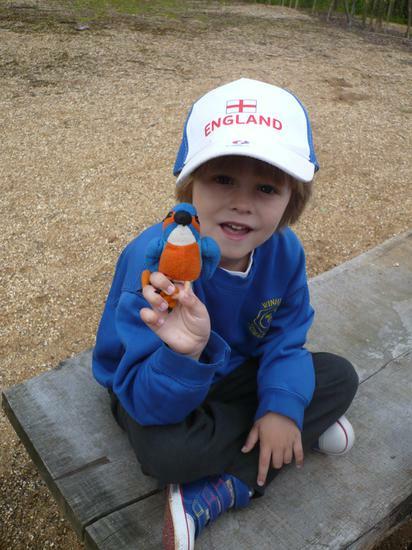 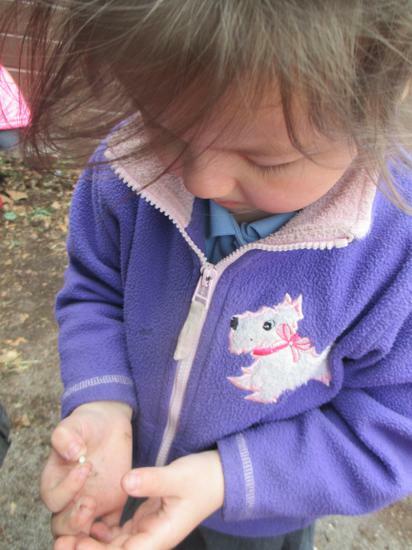 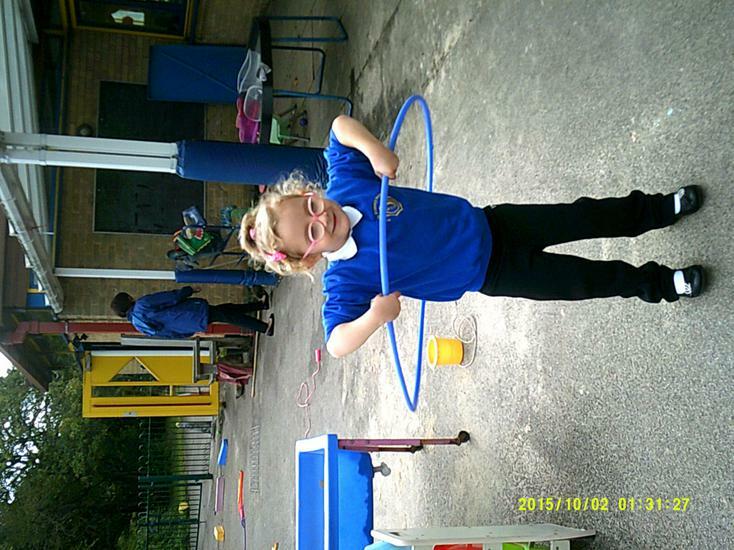 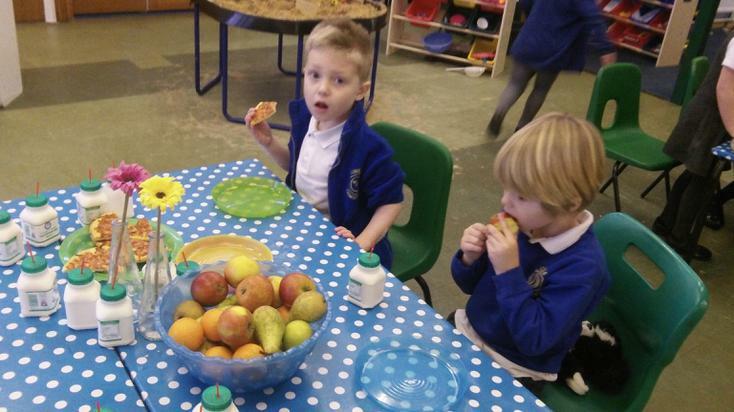 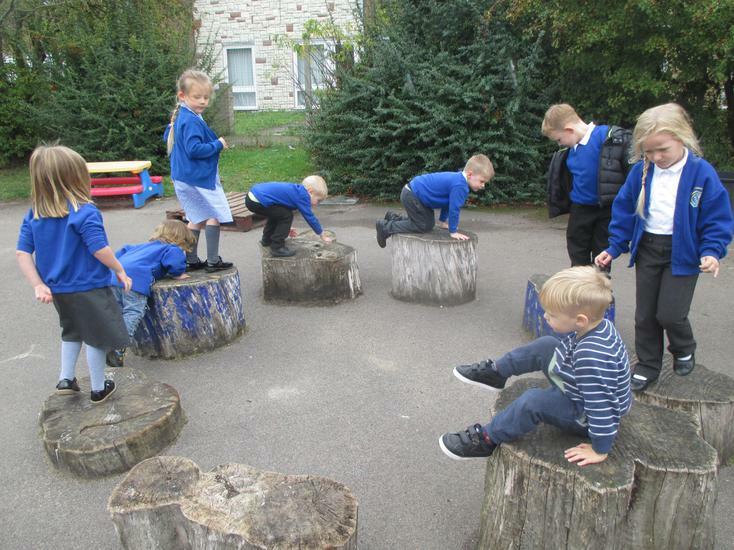 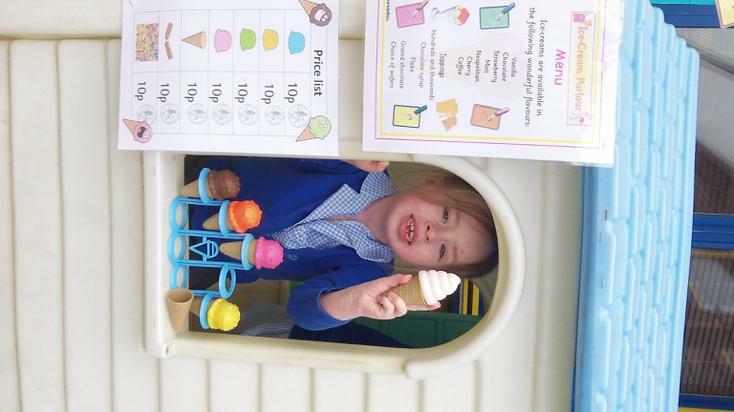 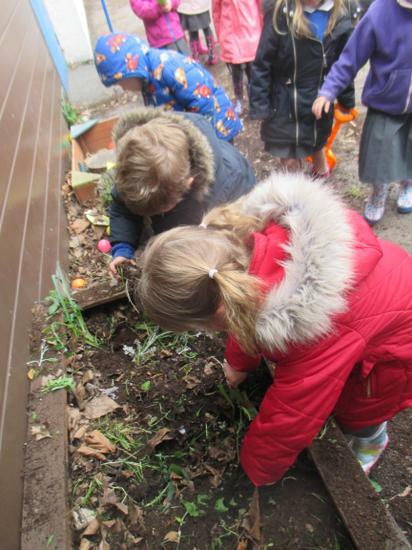 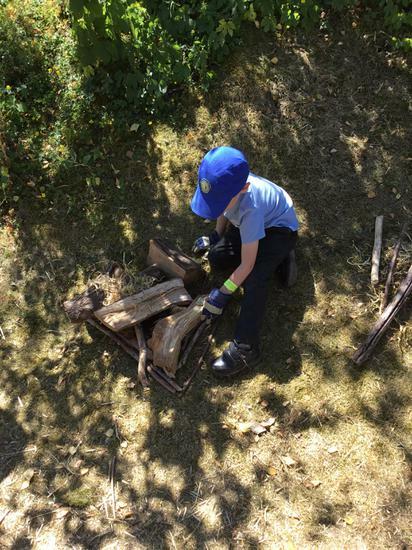 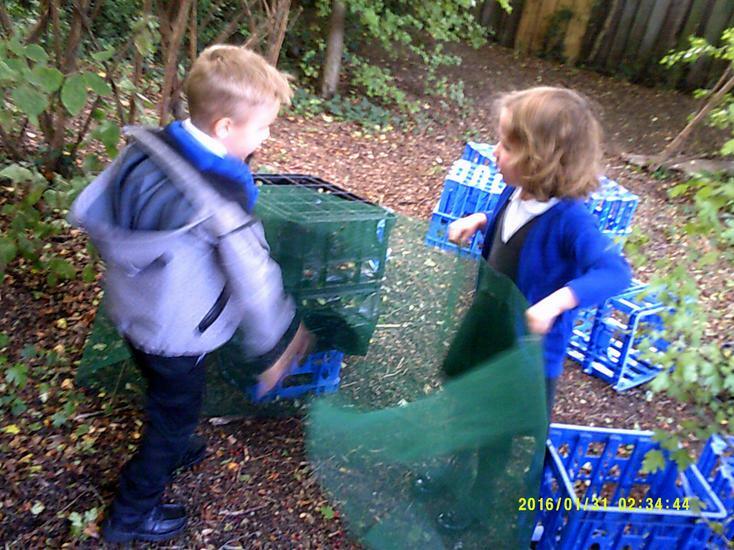 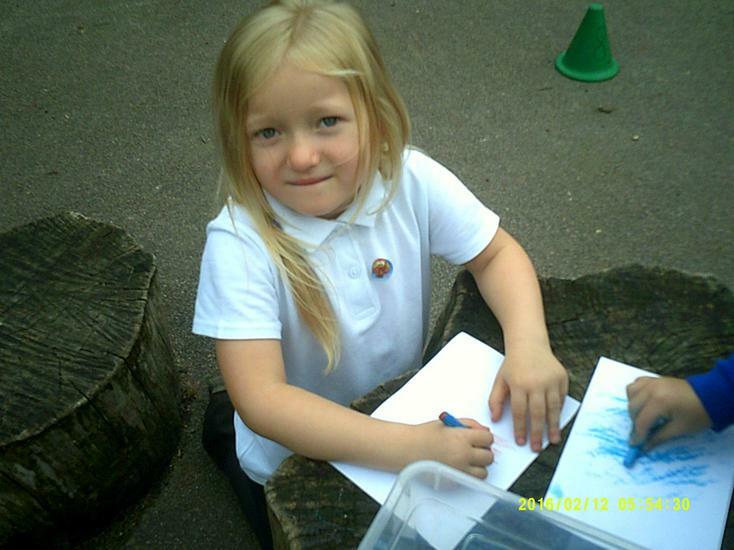 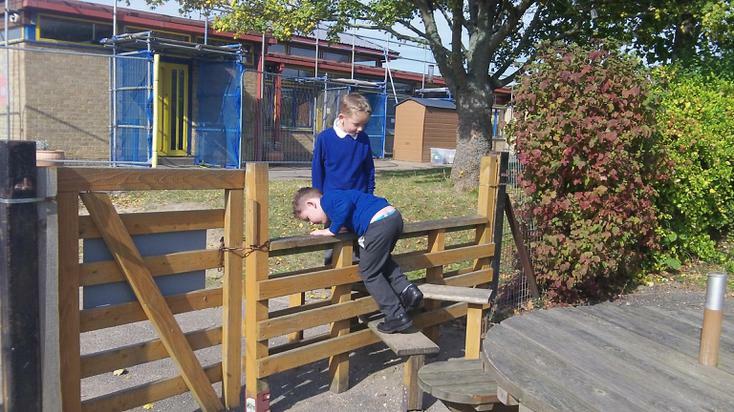 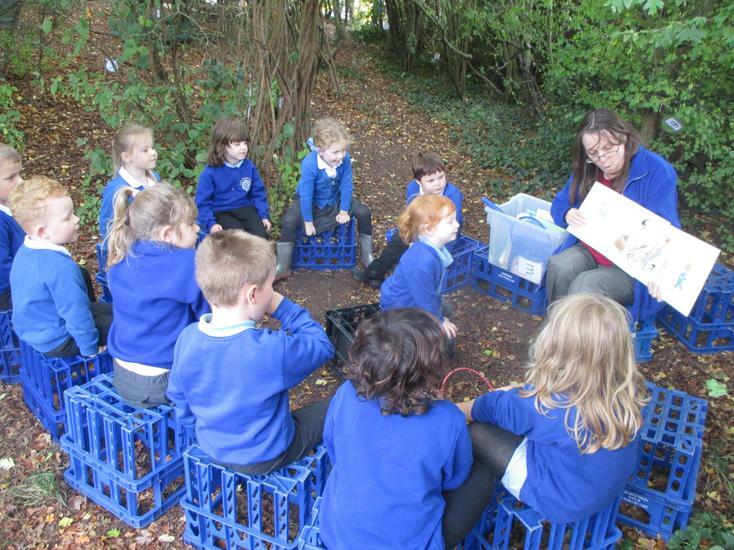 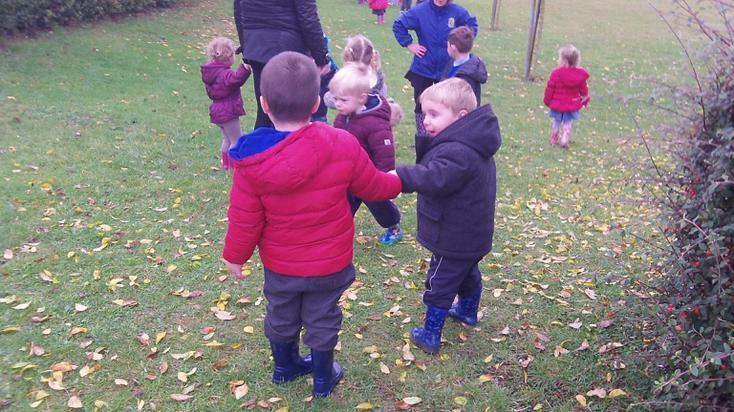 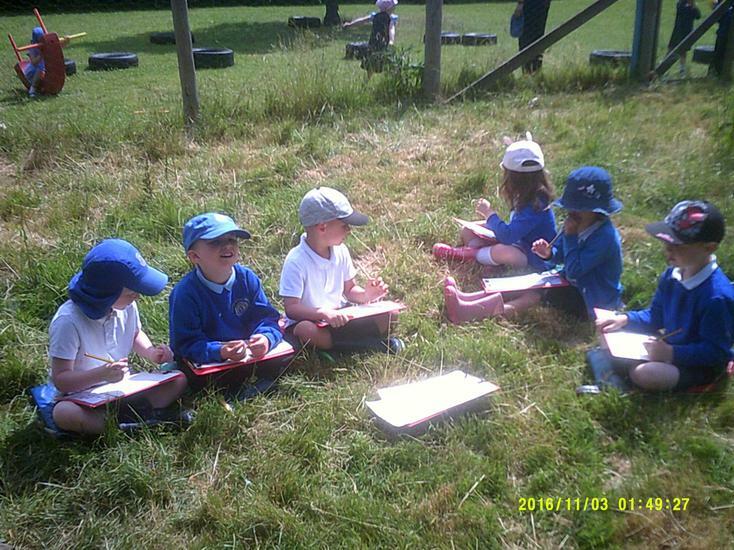 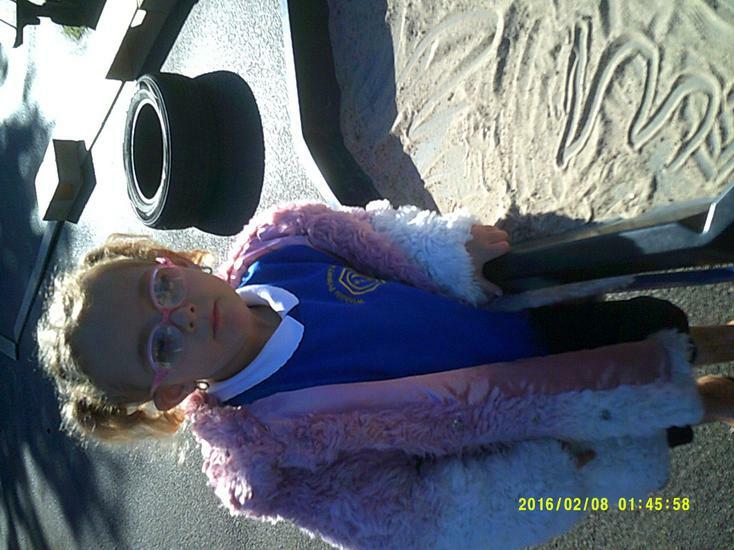 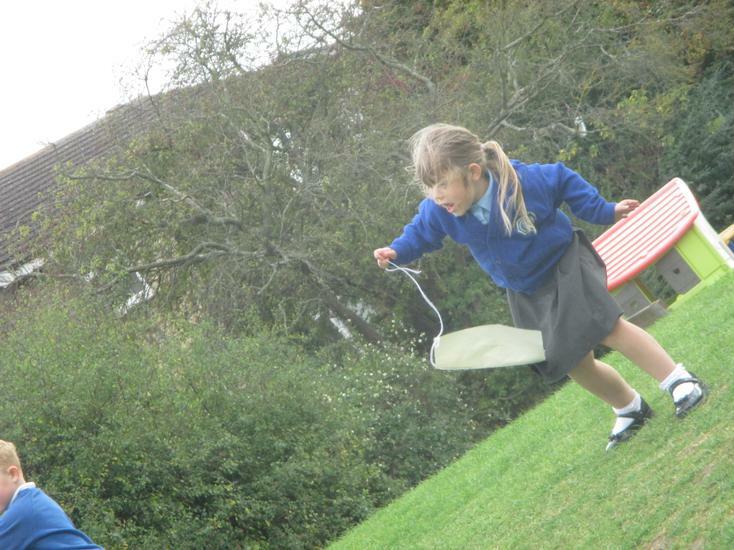 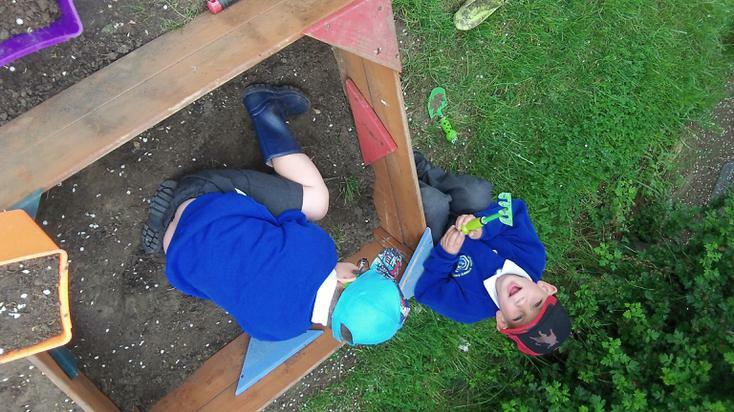 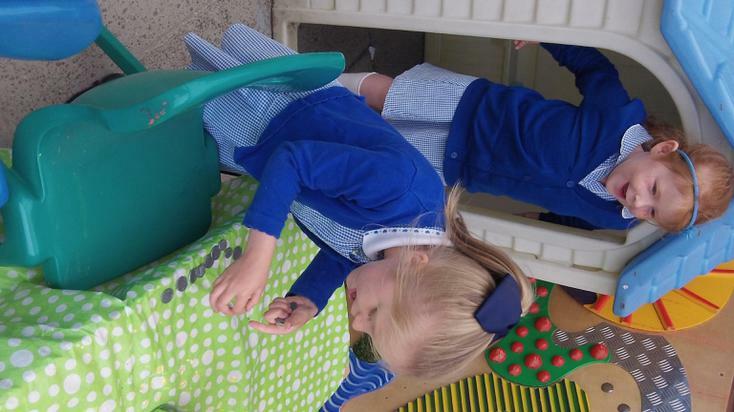 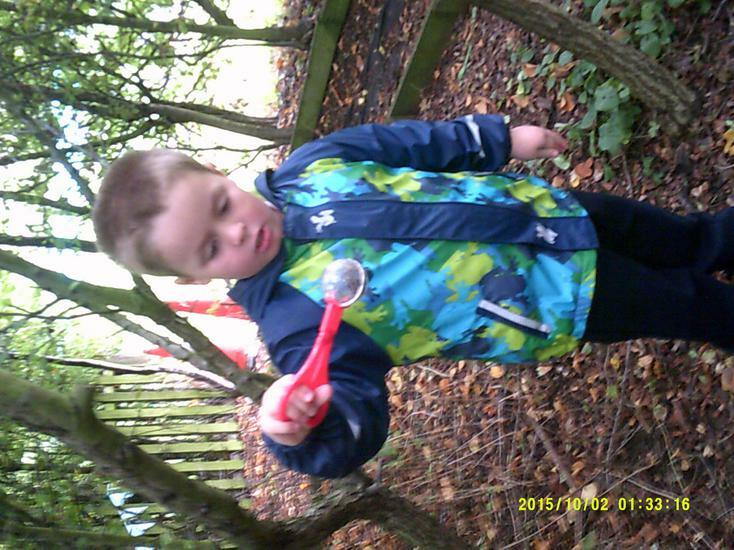 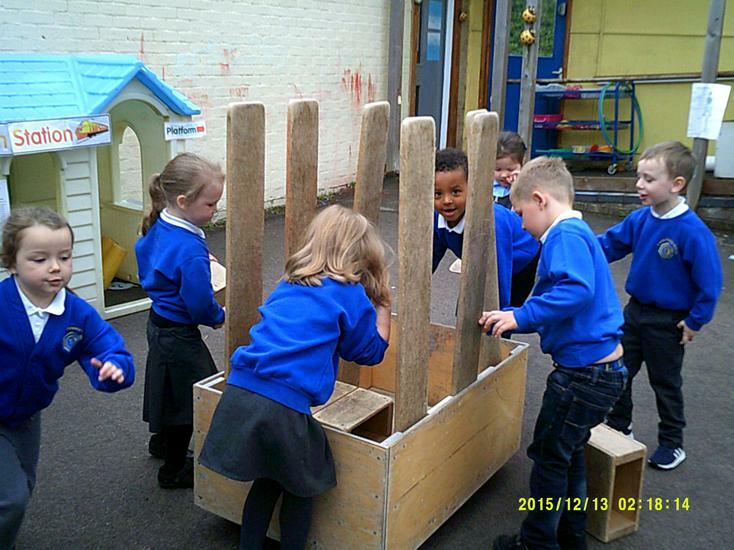 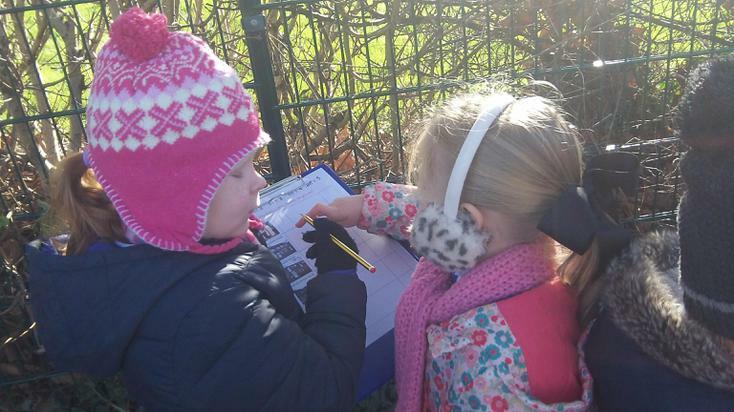 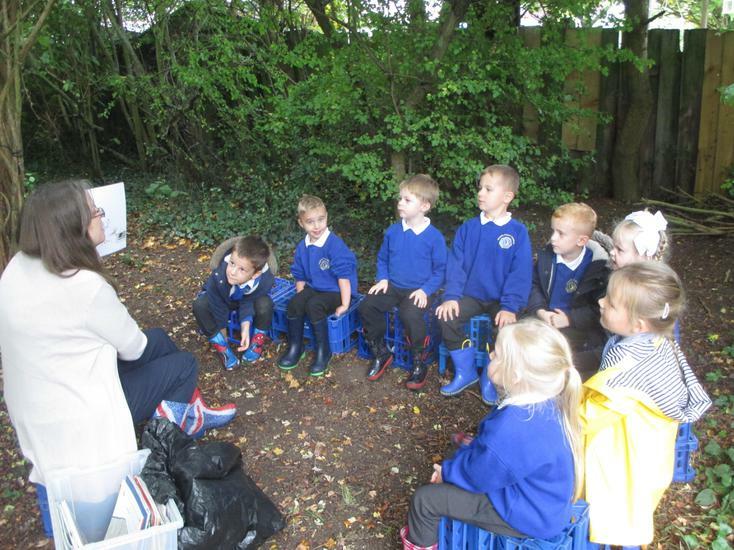 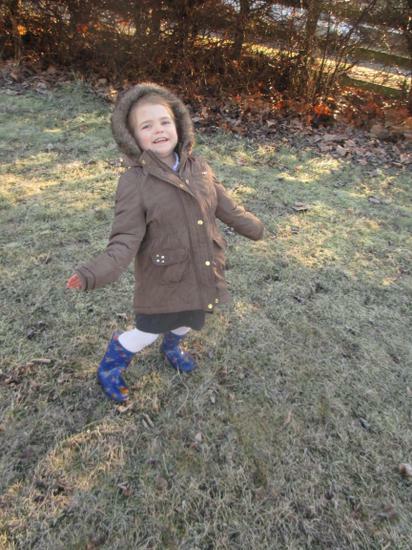 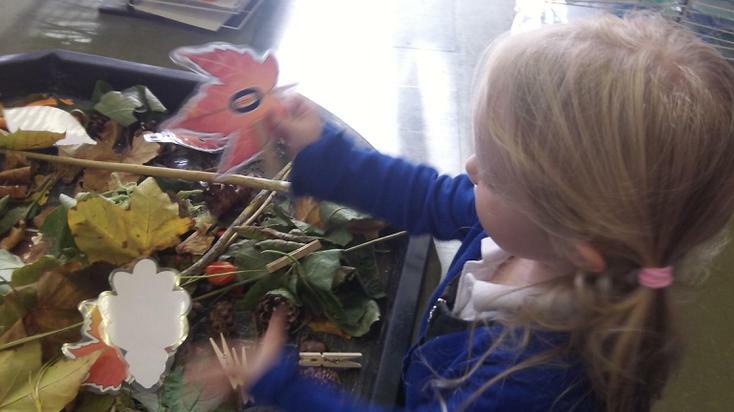 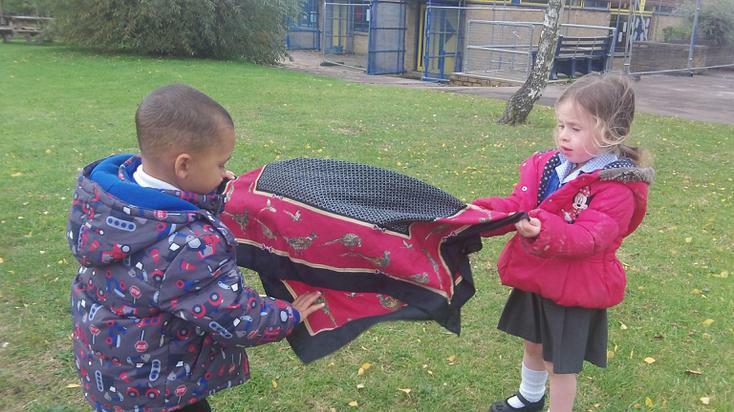 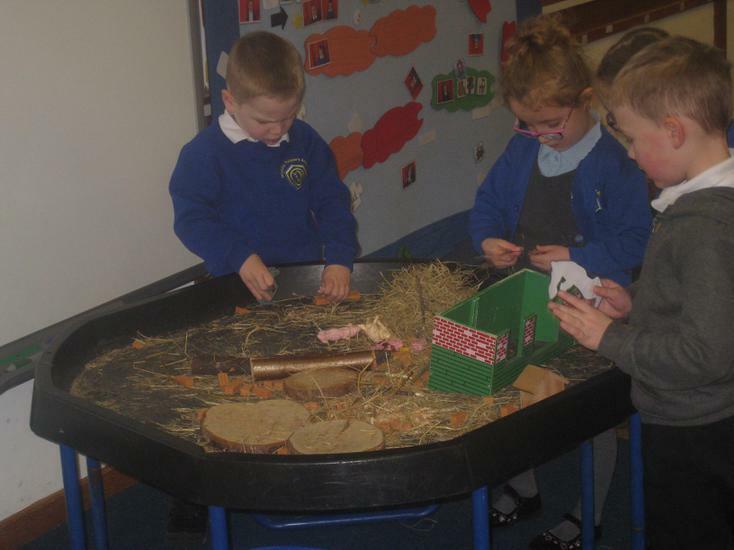 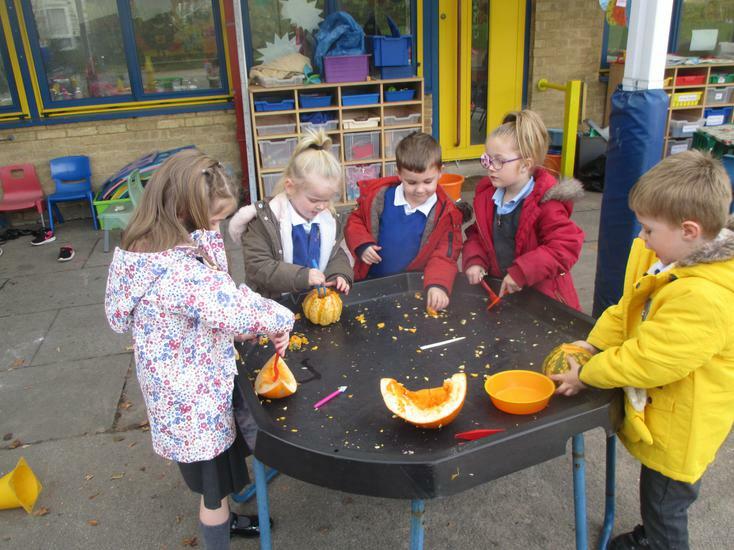 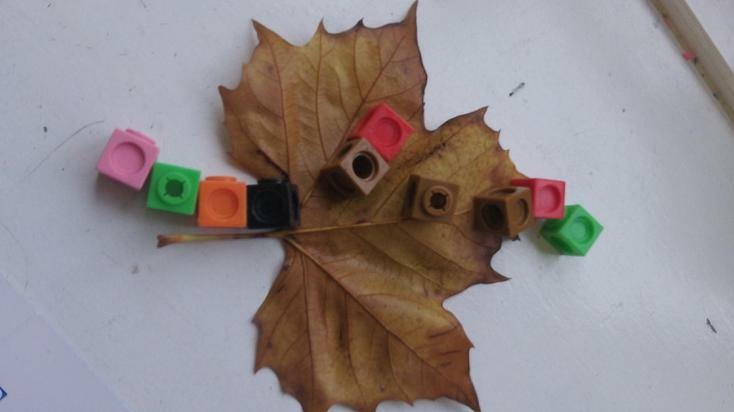 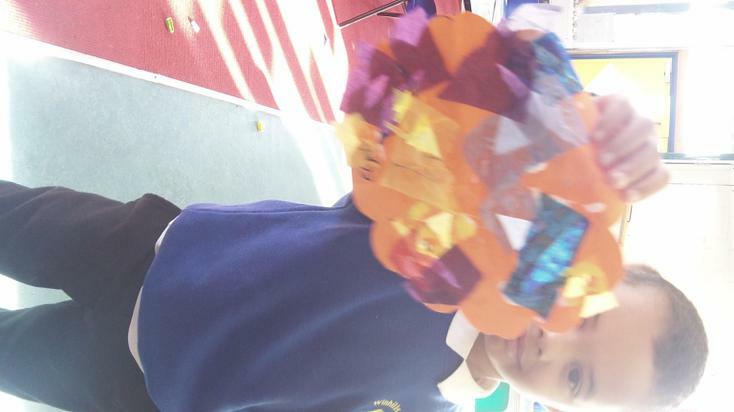 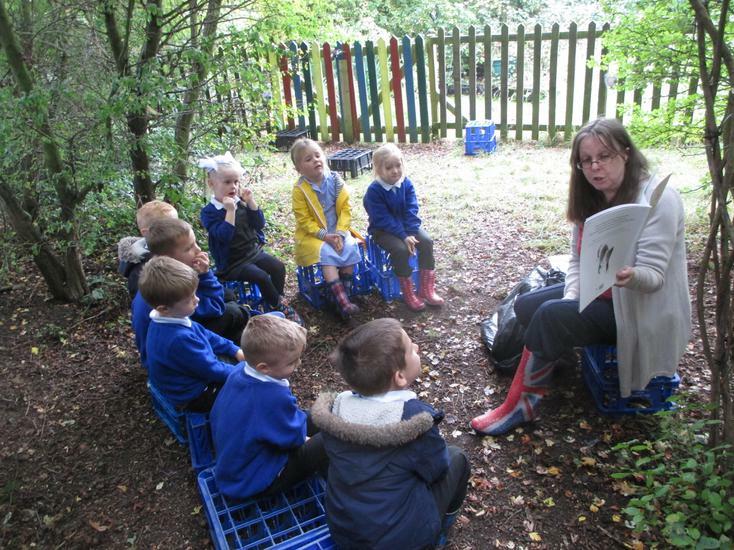 We love to learn inside and outside and will explore the seasonal changes as Autumn progresses through to Winter. 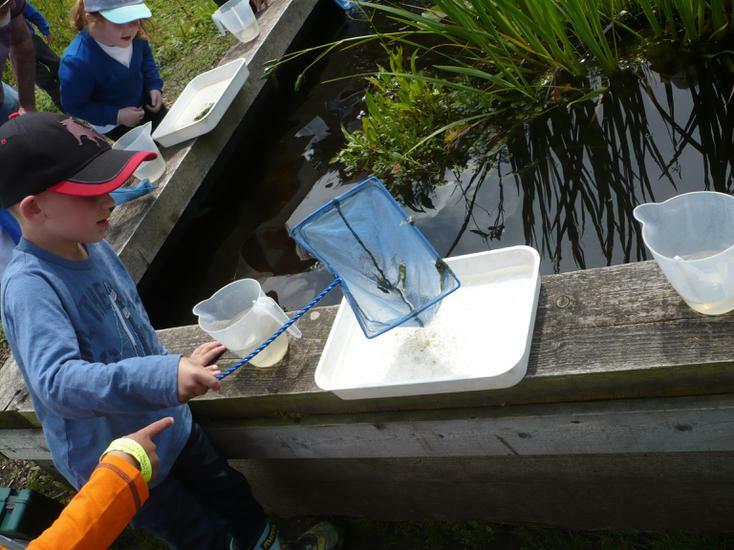 Please take the time to read our curriculum letter which outlines the terms learning in more detail. 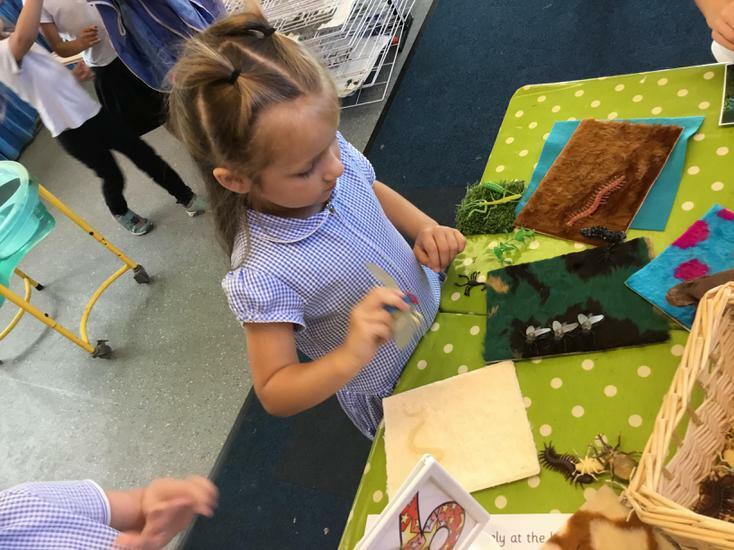 Welcome to summer term of Reception where we are really looking forward to learning around our main theme of 'Journeys'. 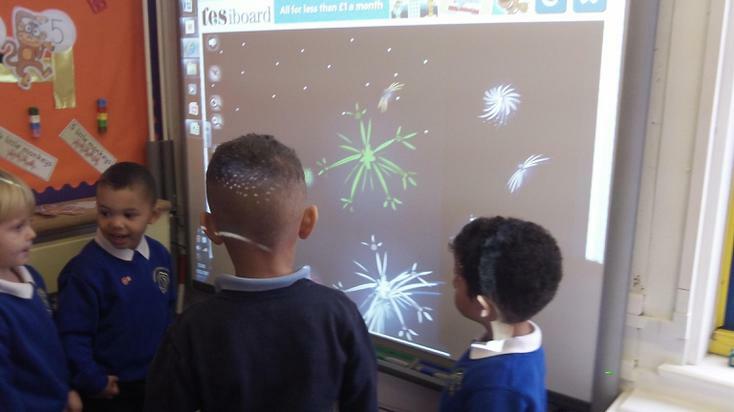 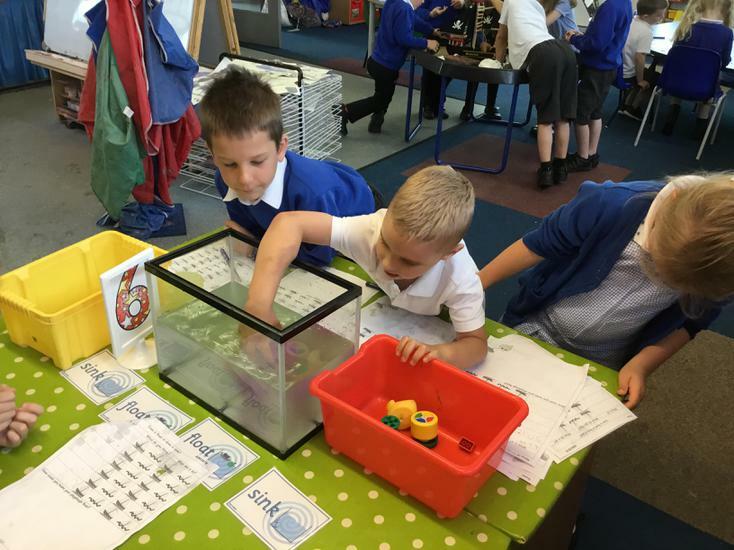 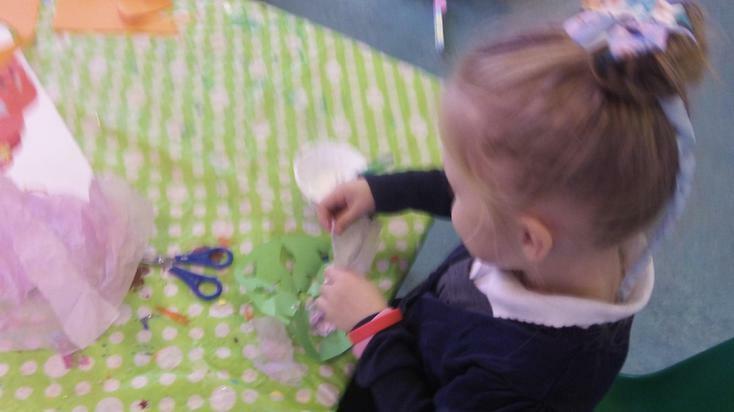 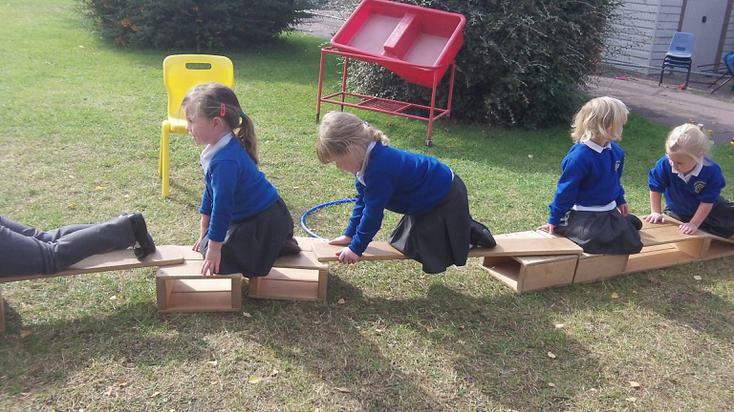 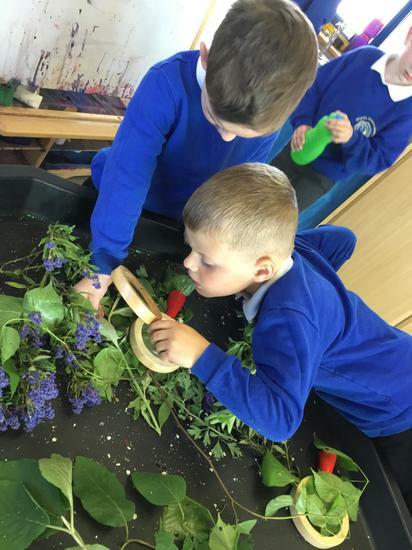 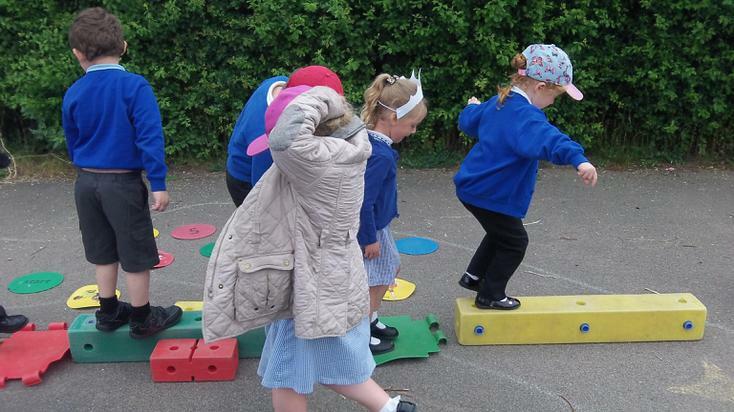 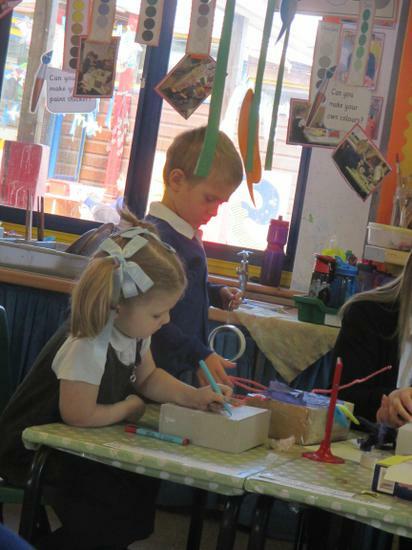 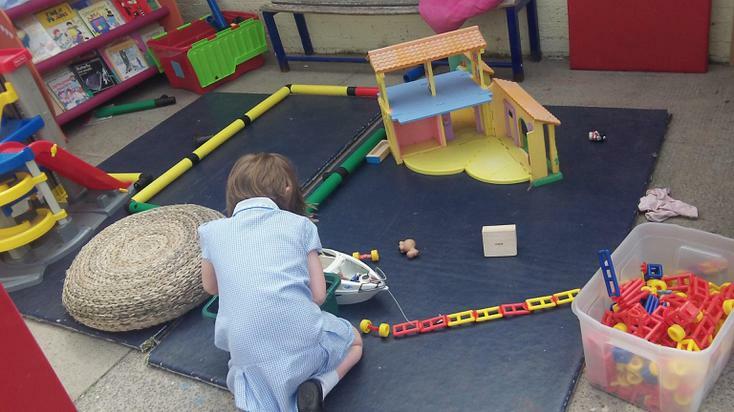 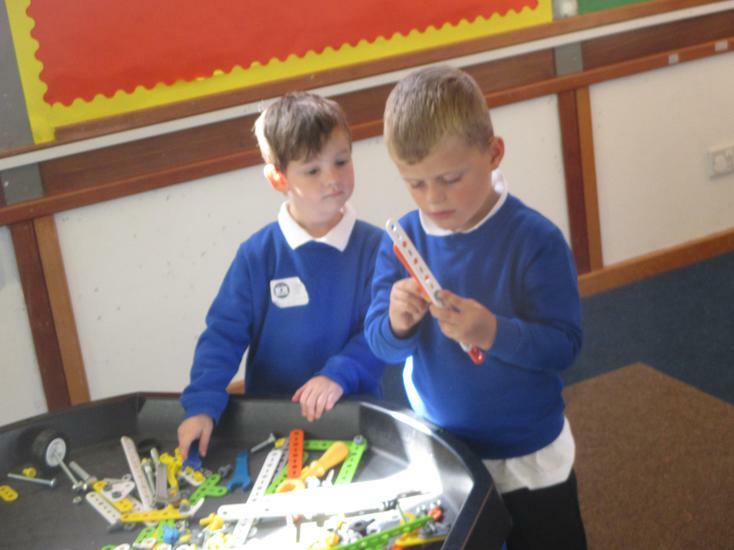 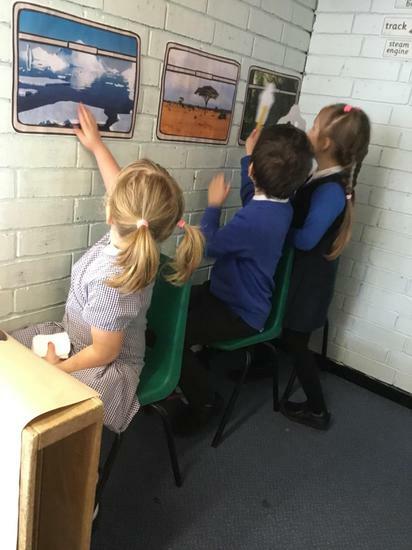 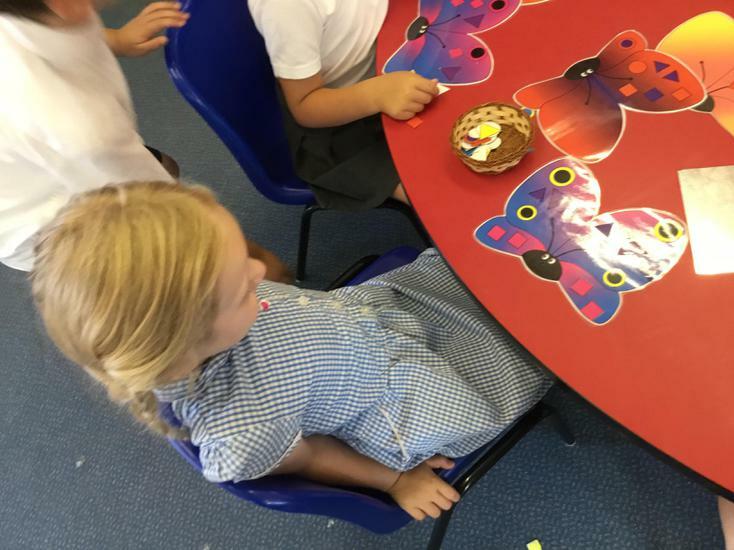 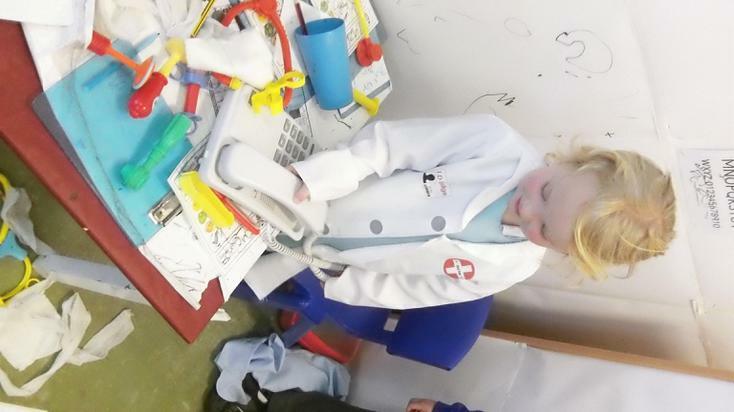 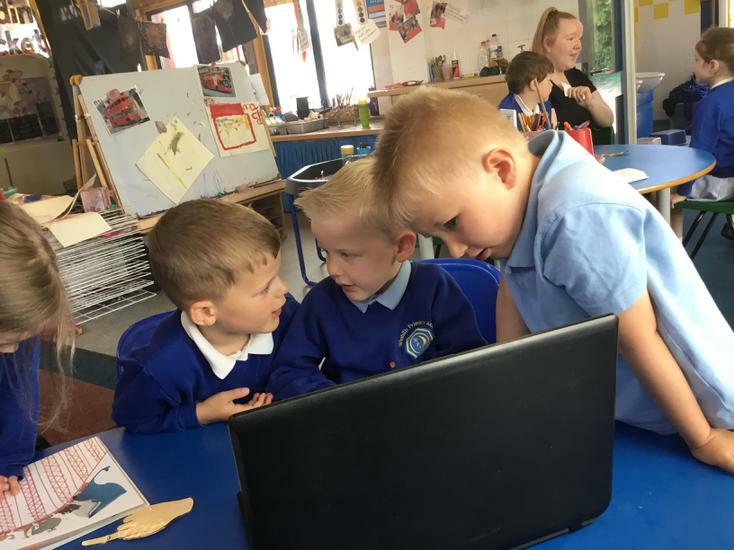 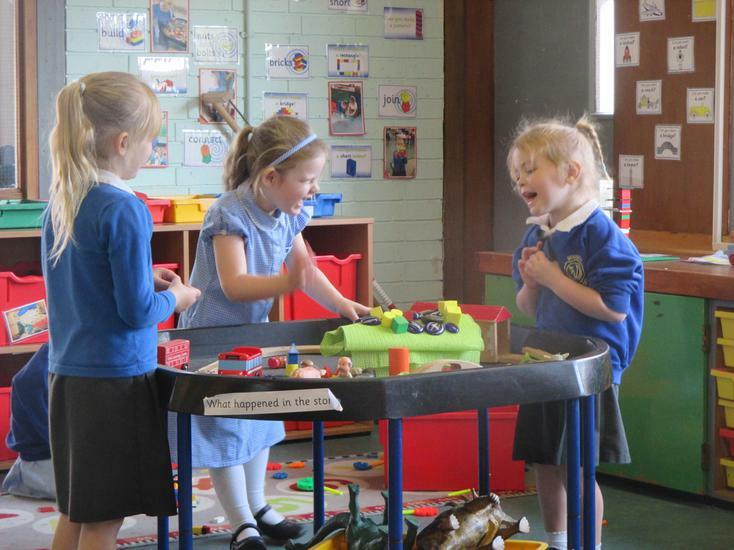 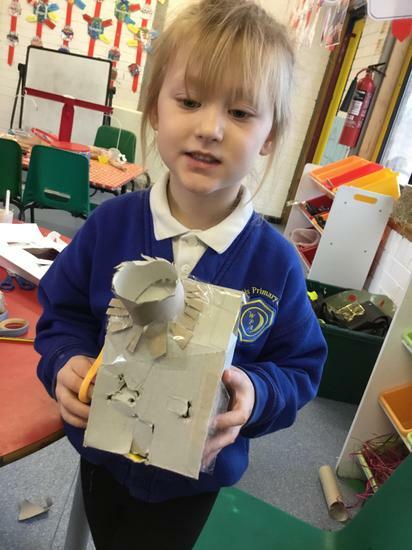 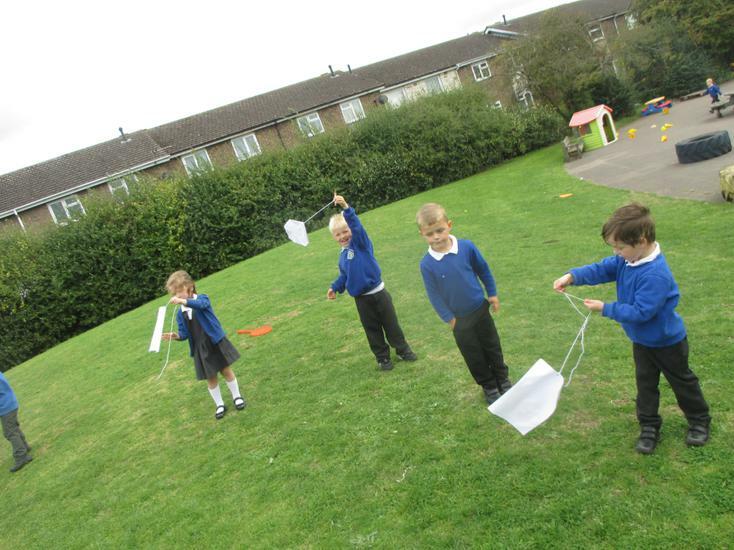 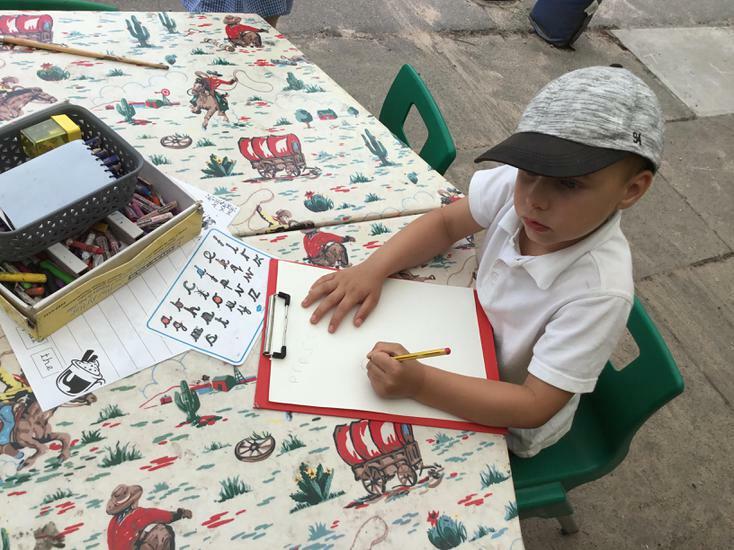 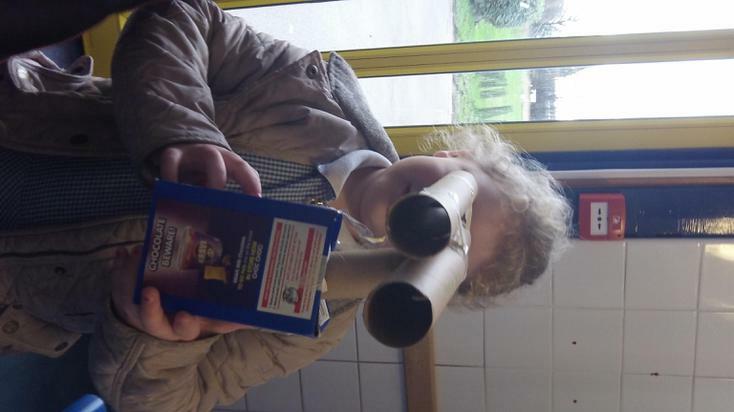 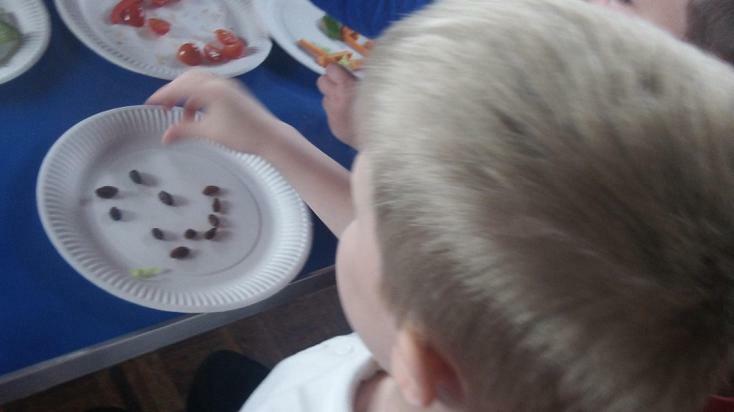 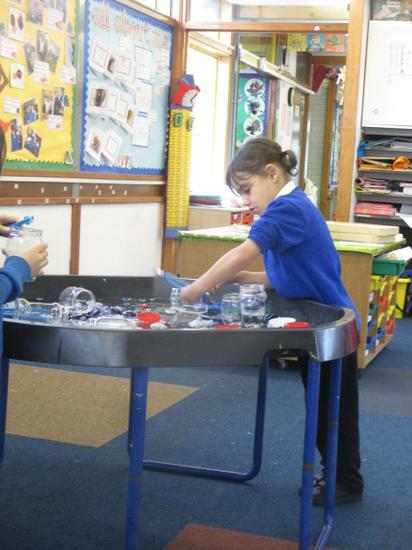 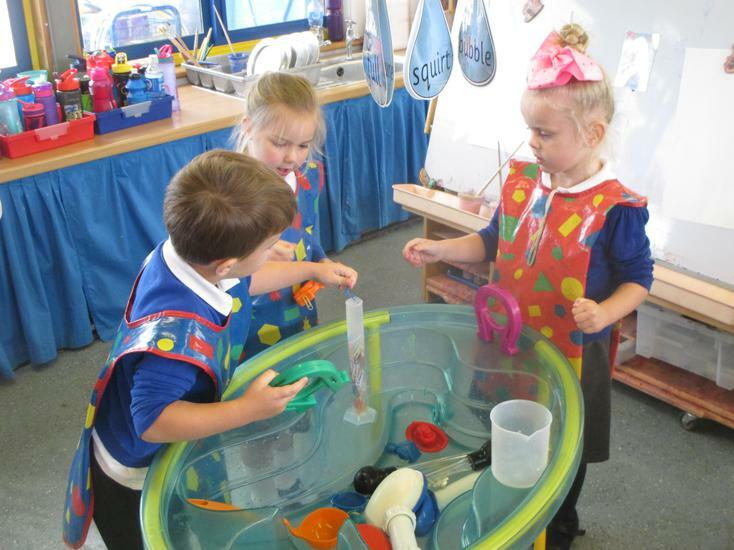 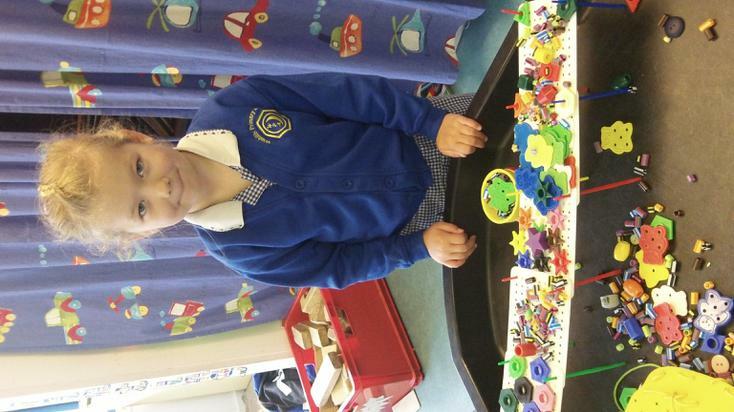 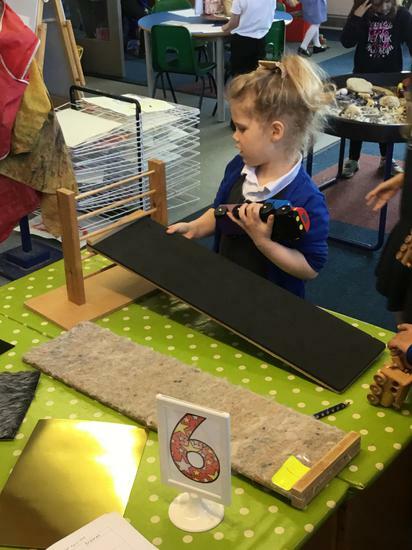 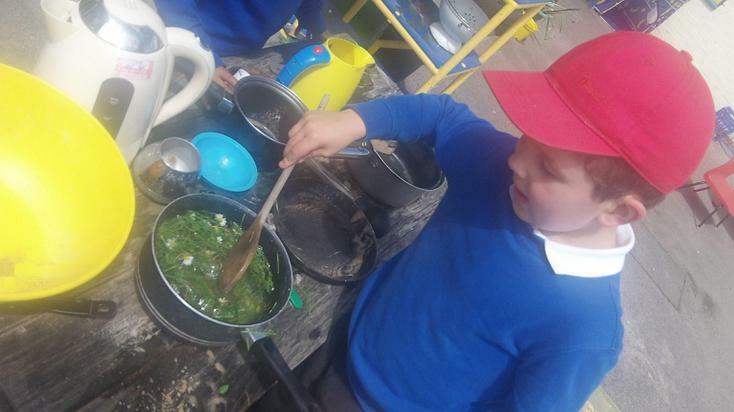 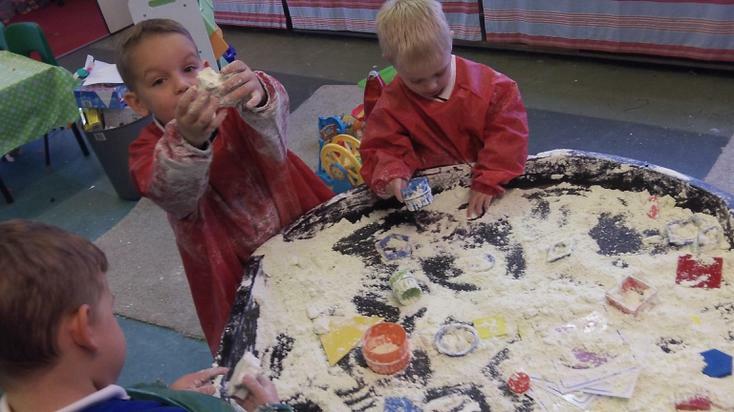 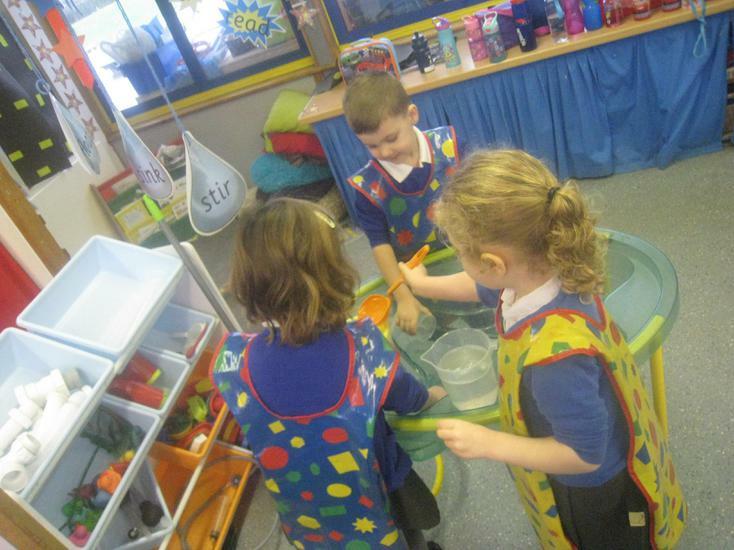 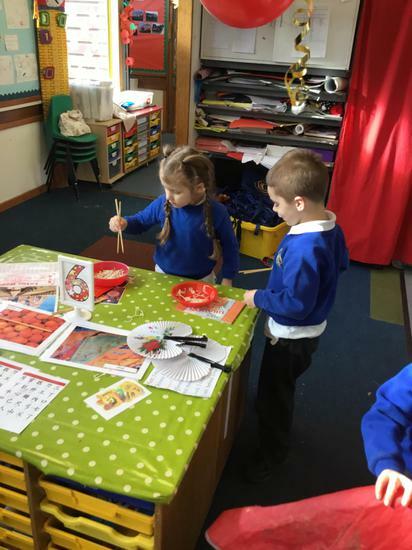 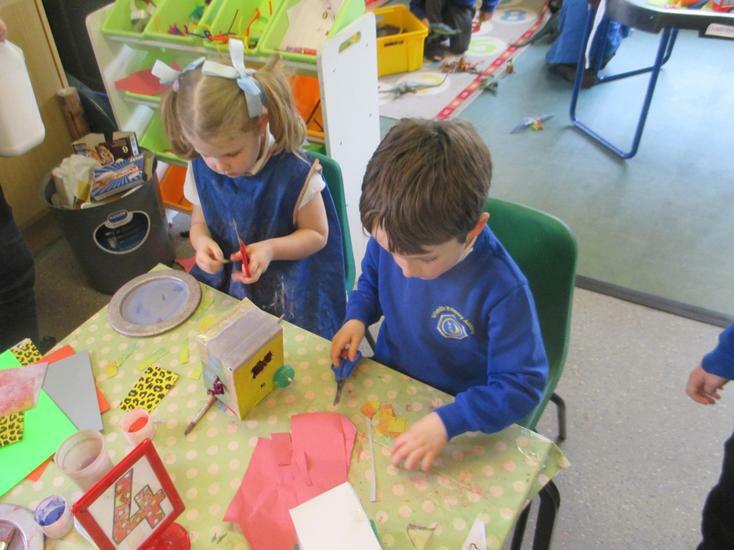 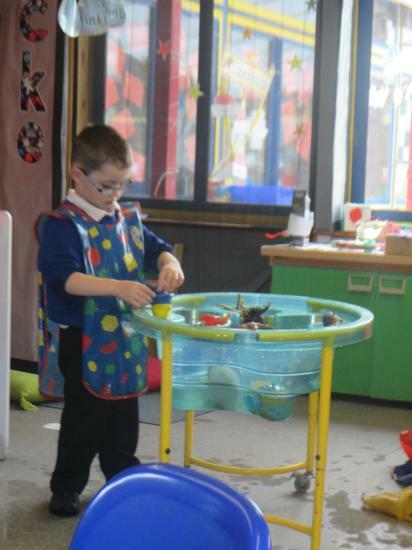 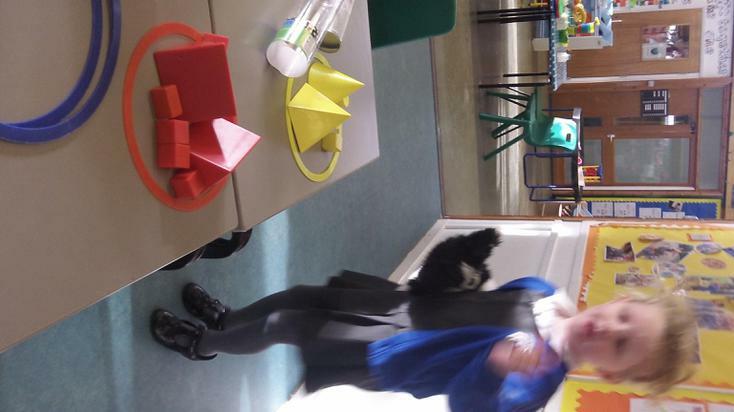 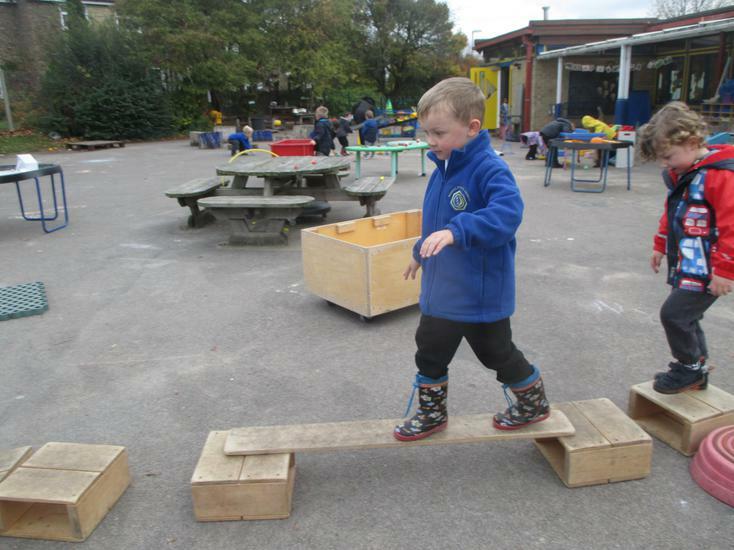 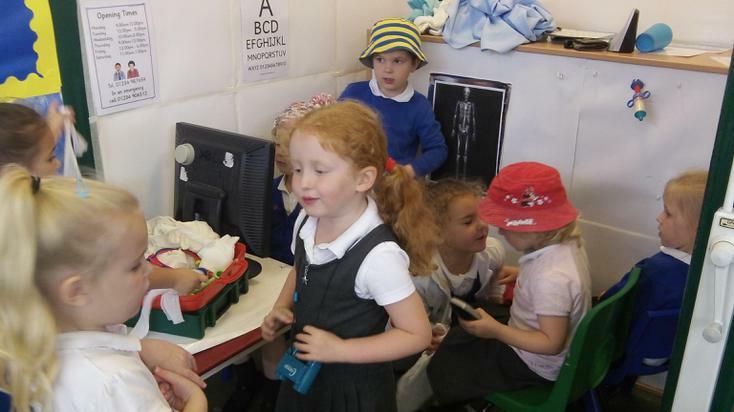 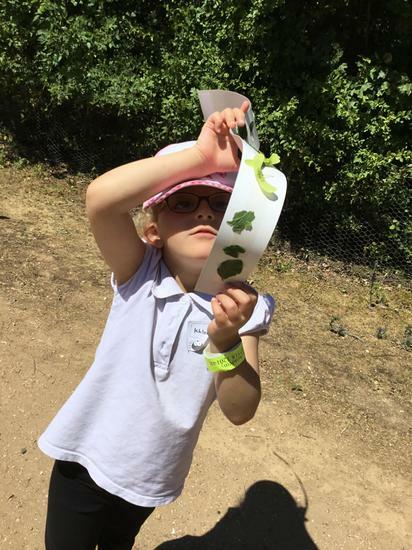 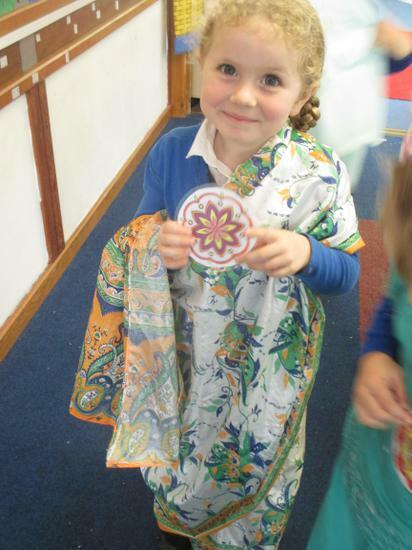 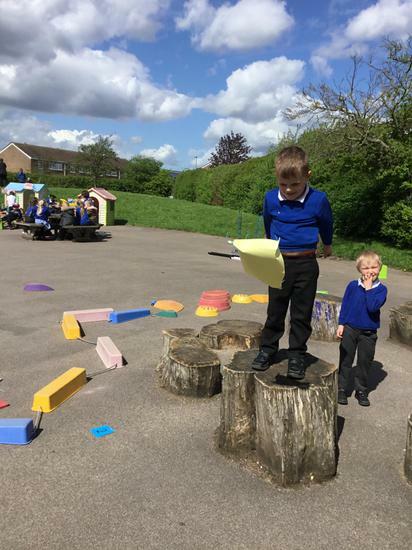 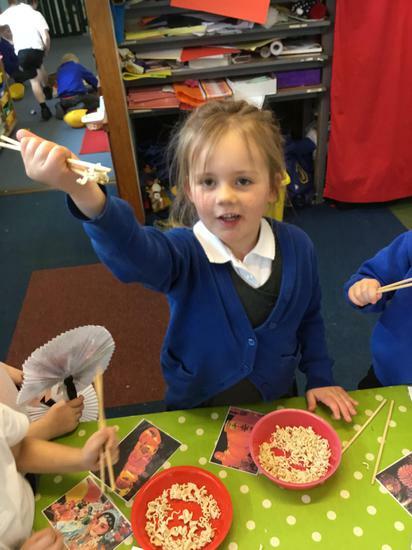 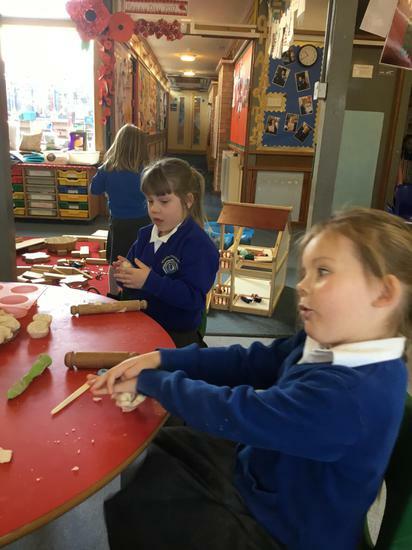 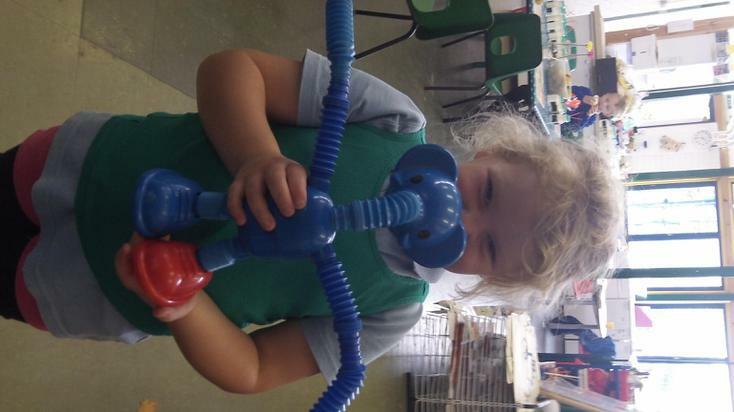 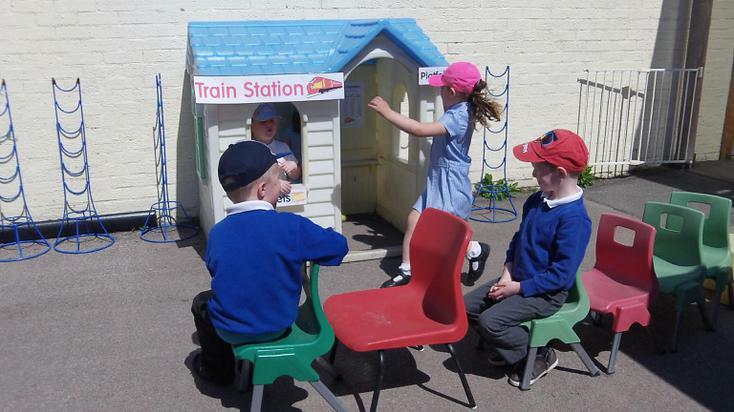 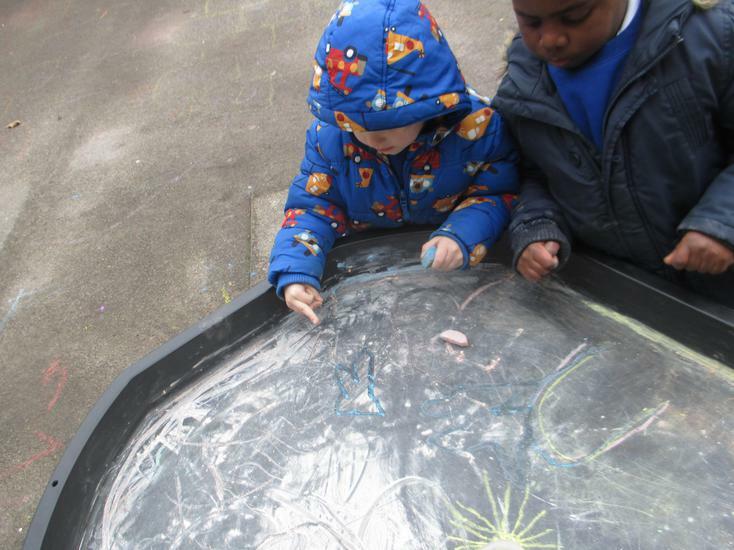 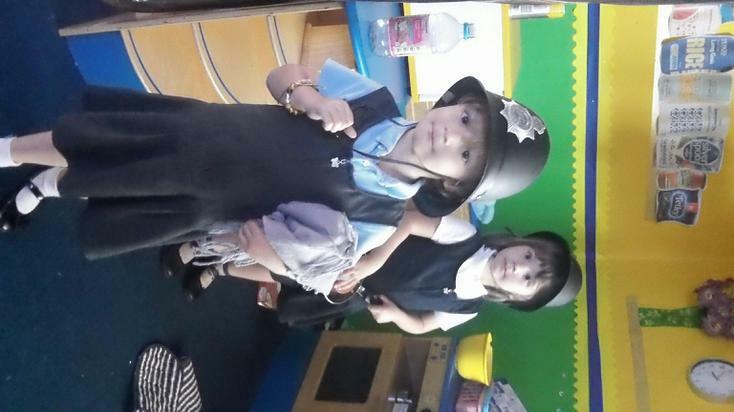 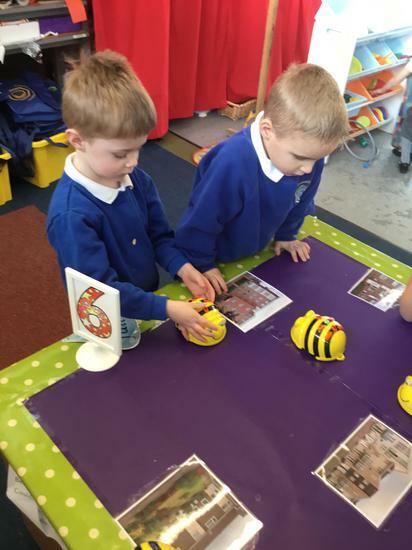 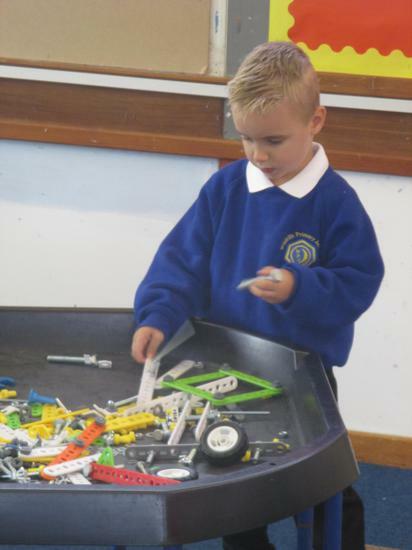 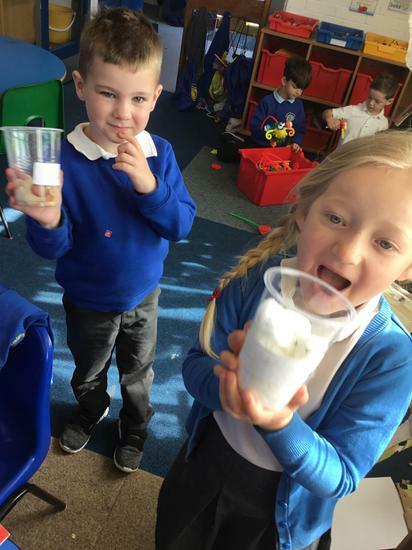 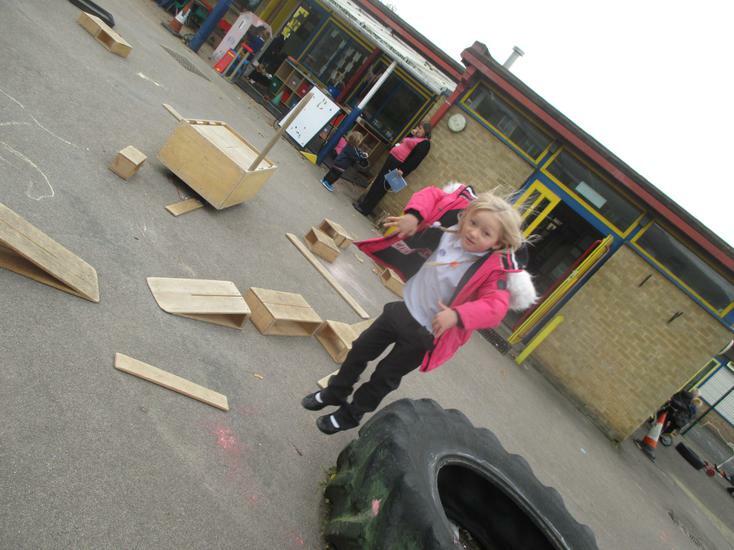 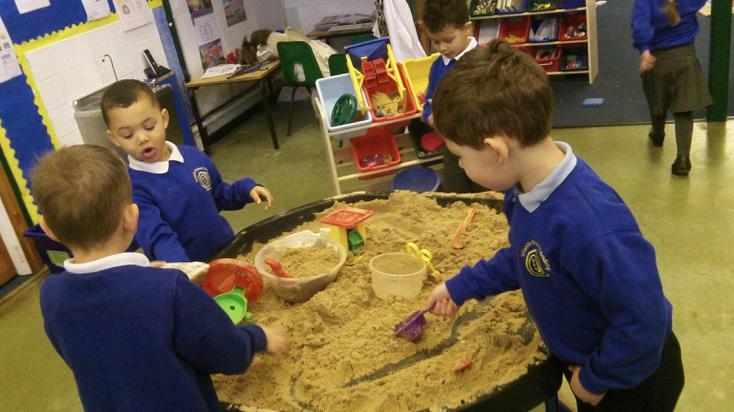 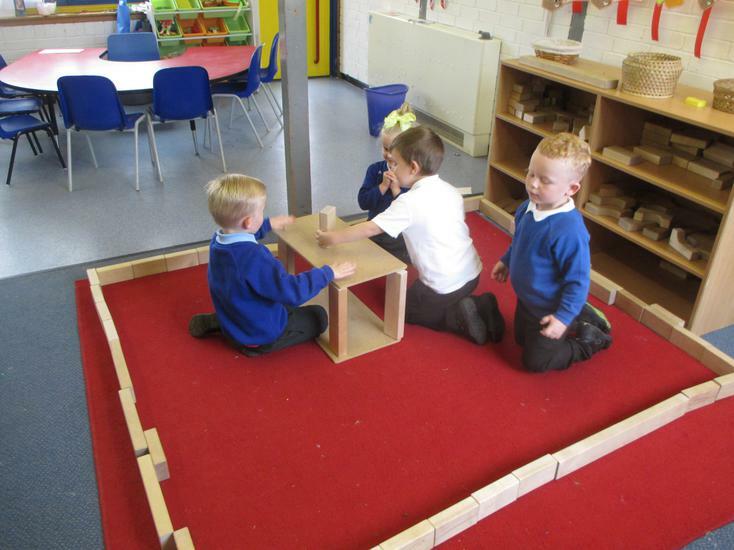 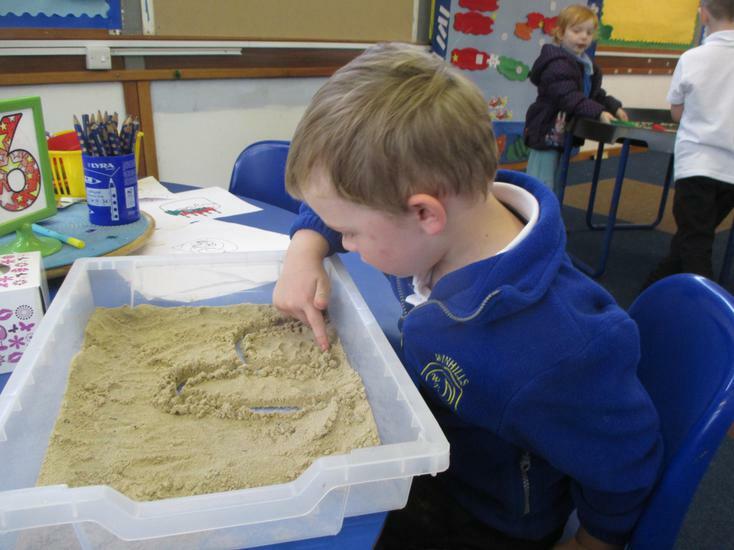 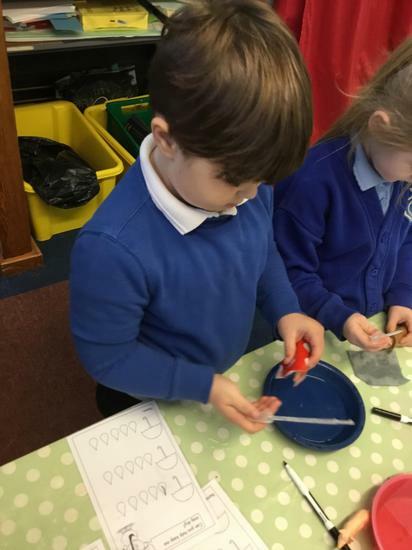 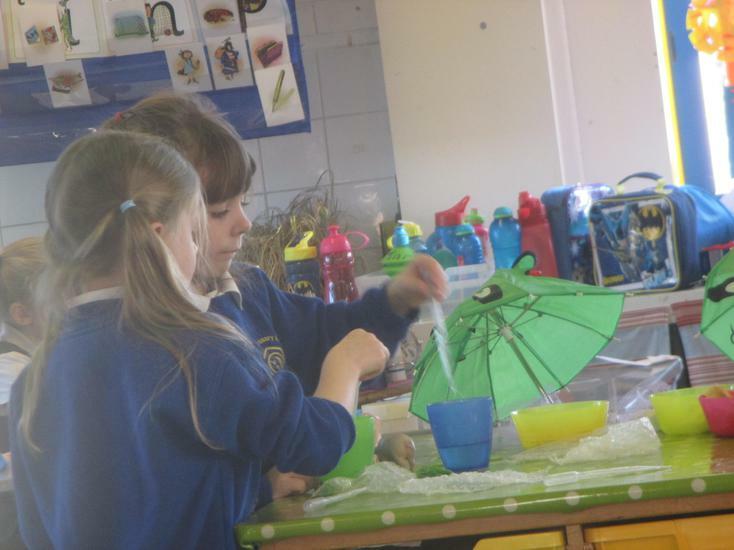 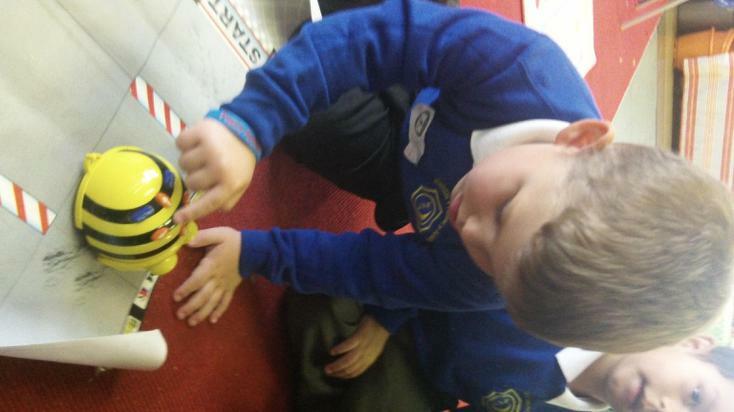 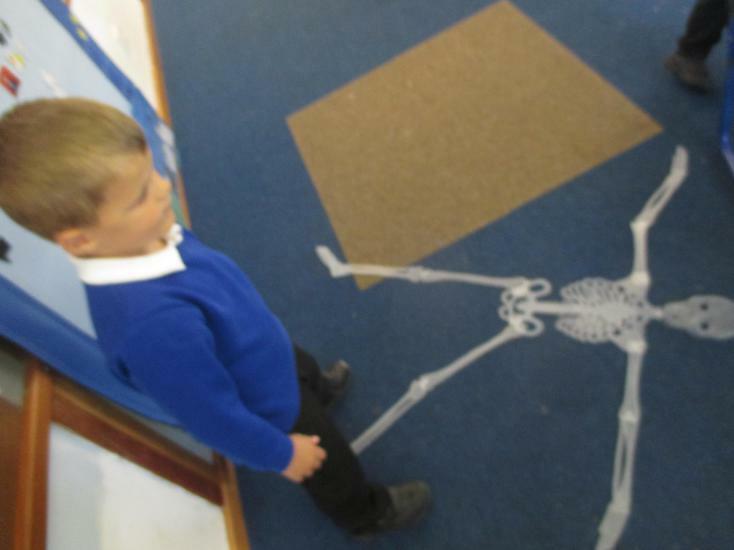 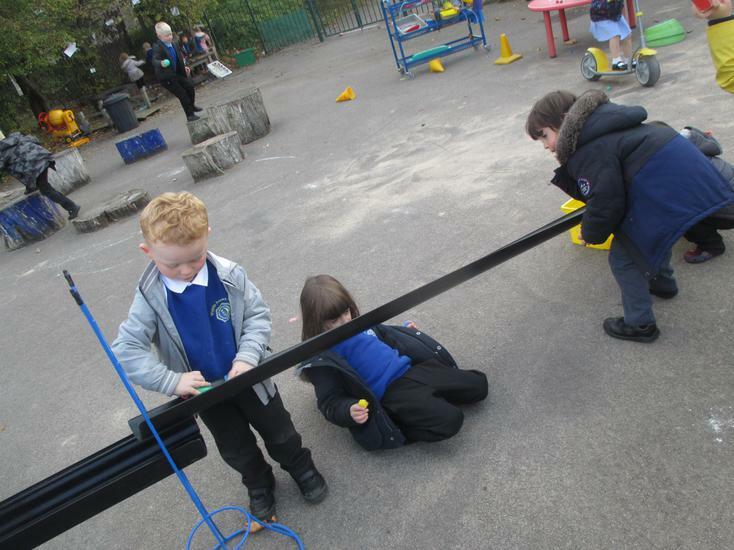 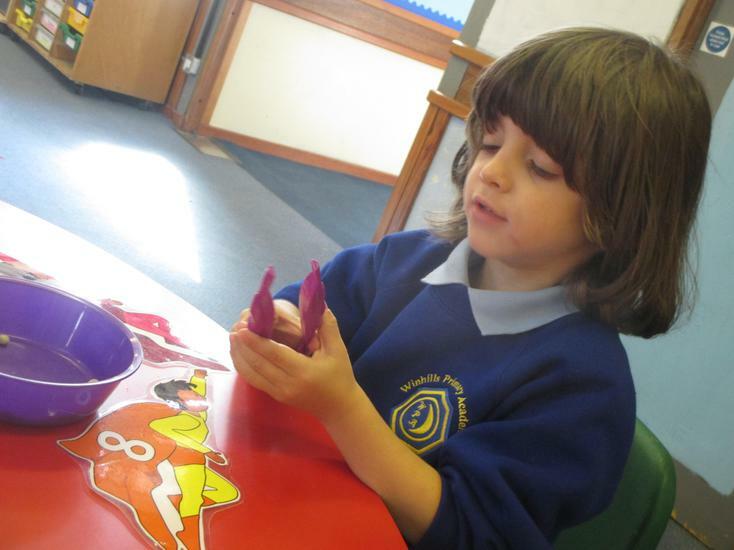 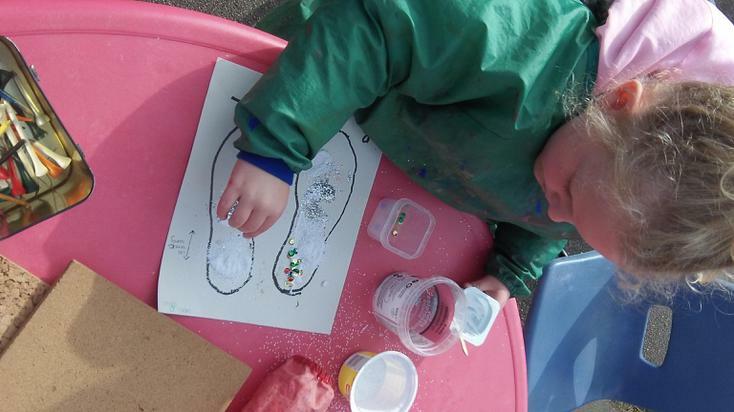 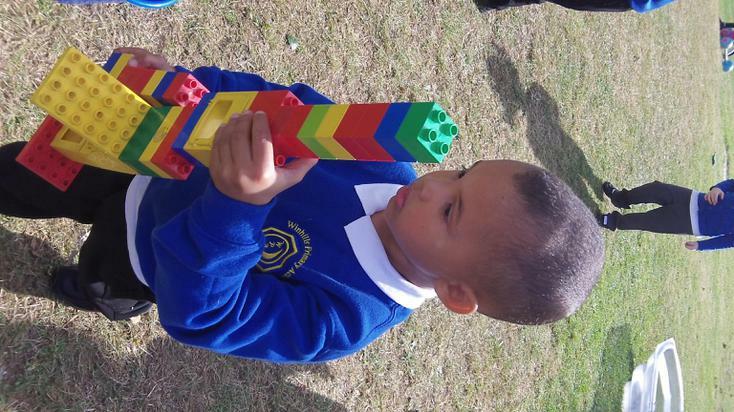 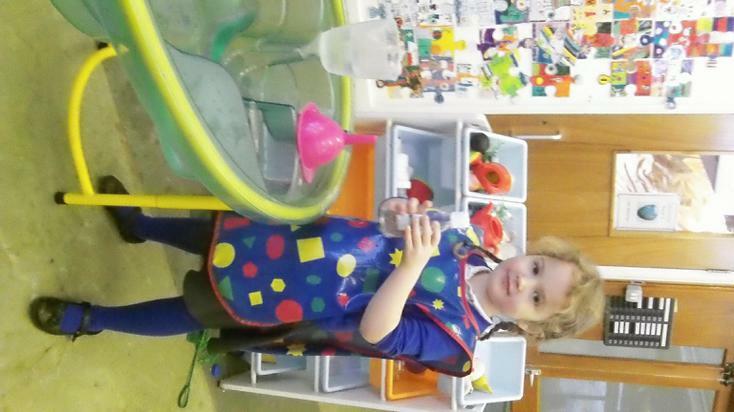 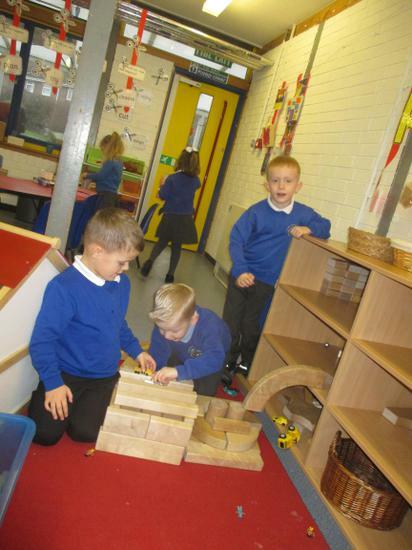 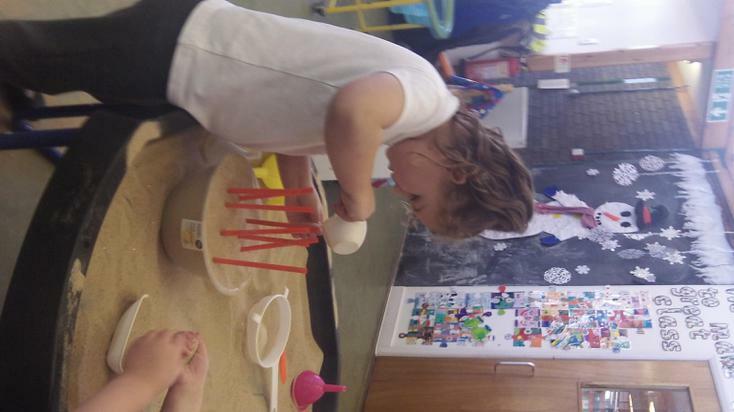 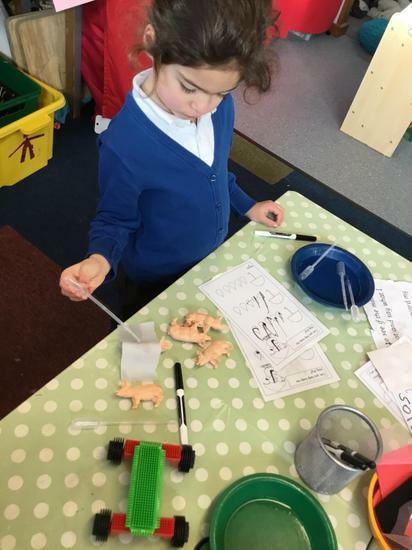 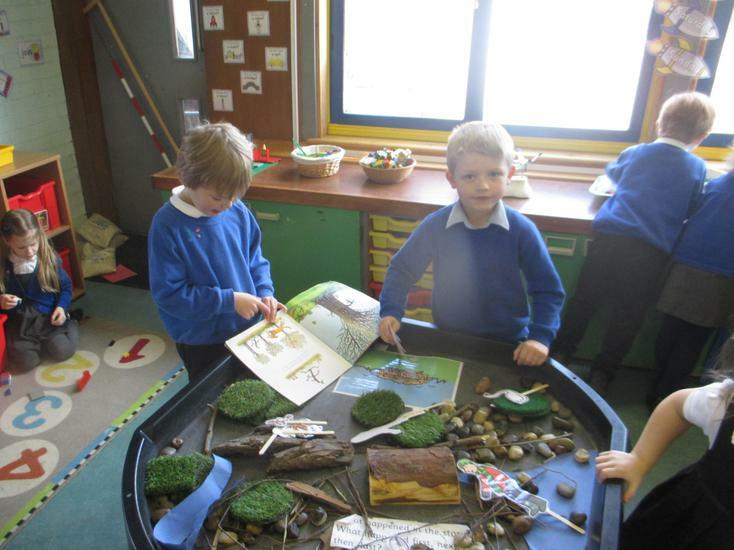 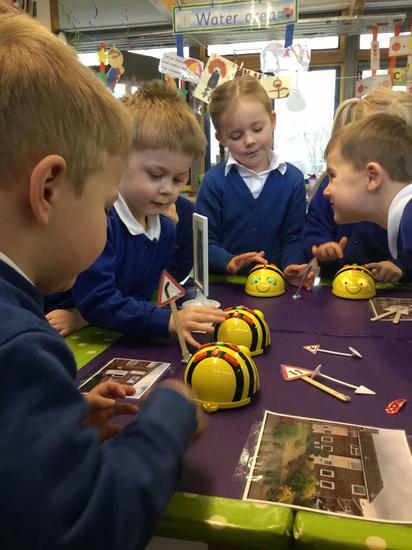 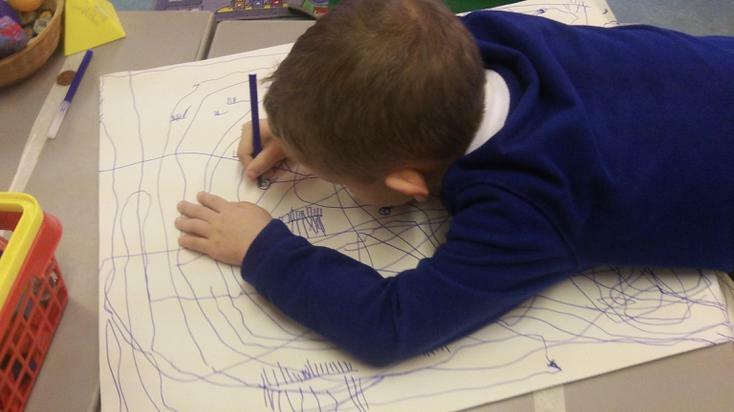 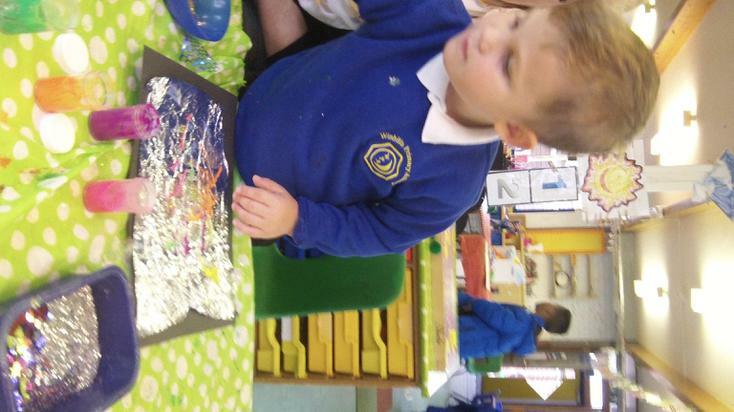 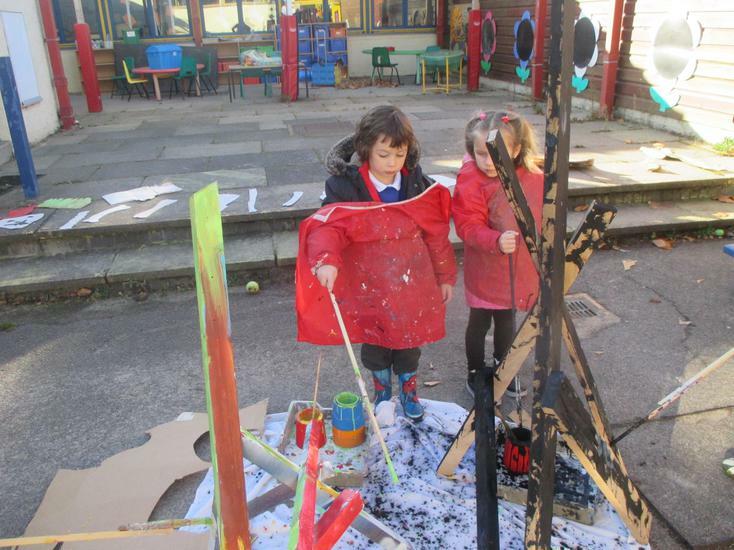 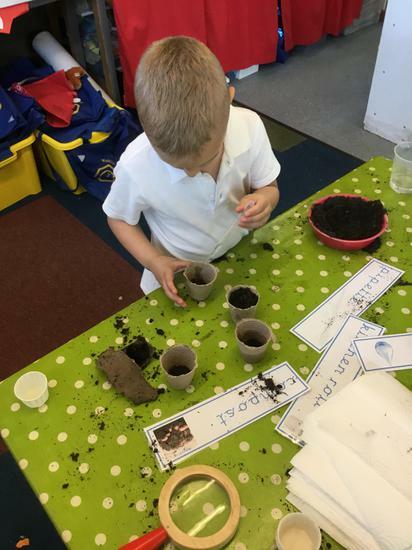 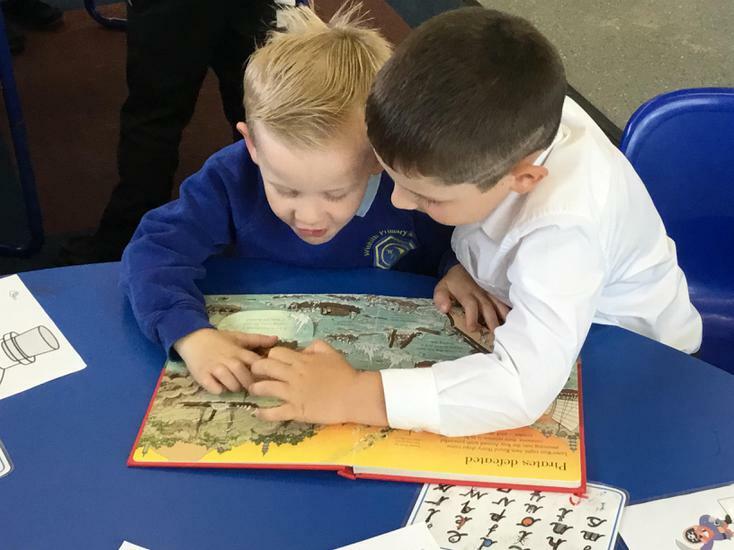 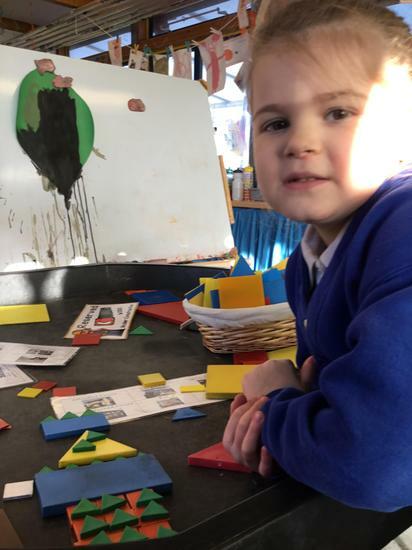 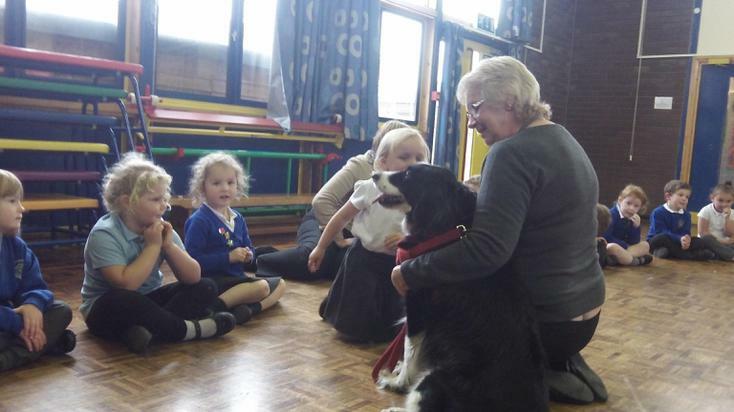 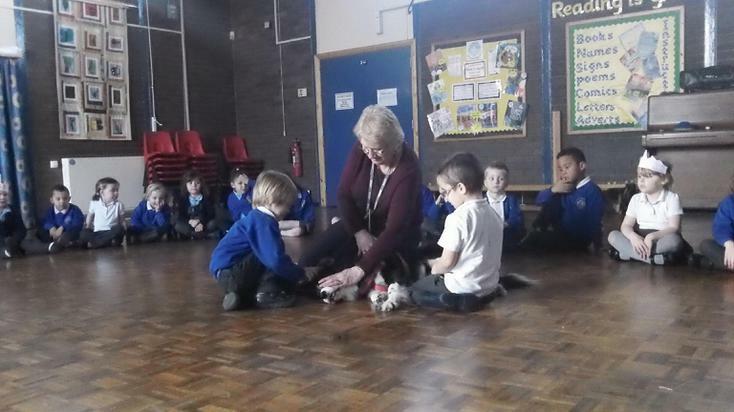 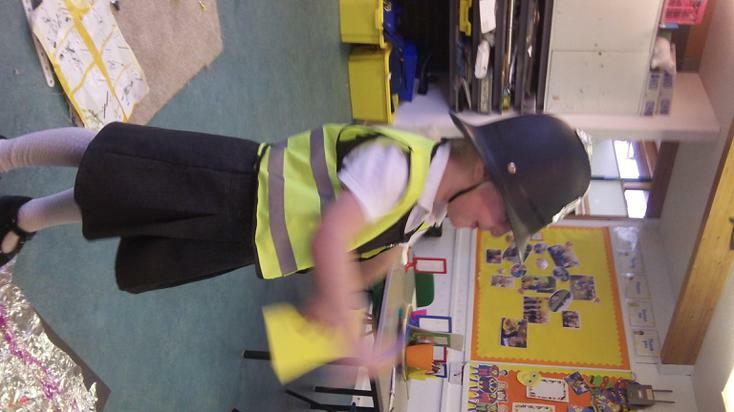 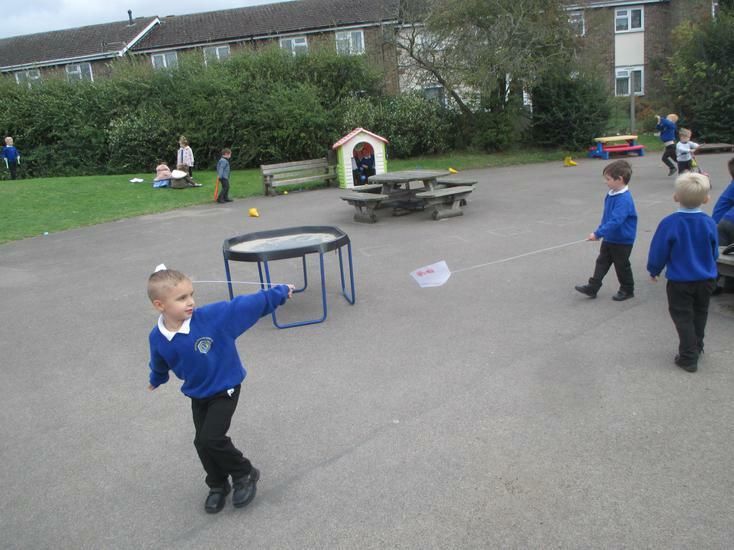 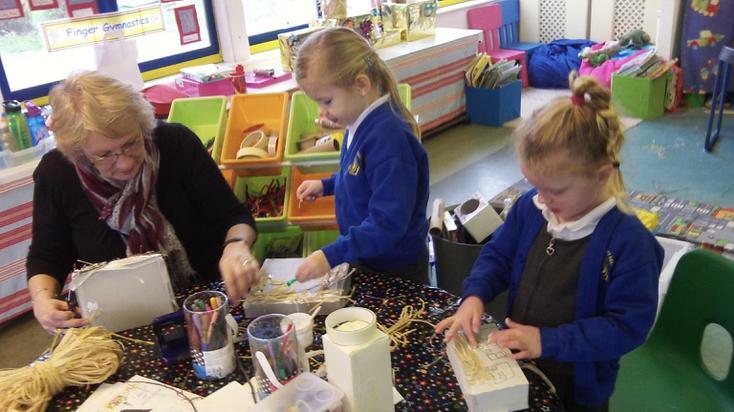 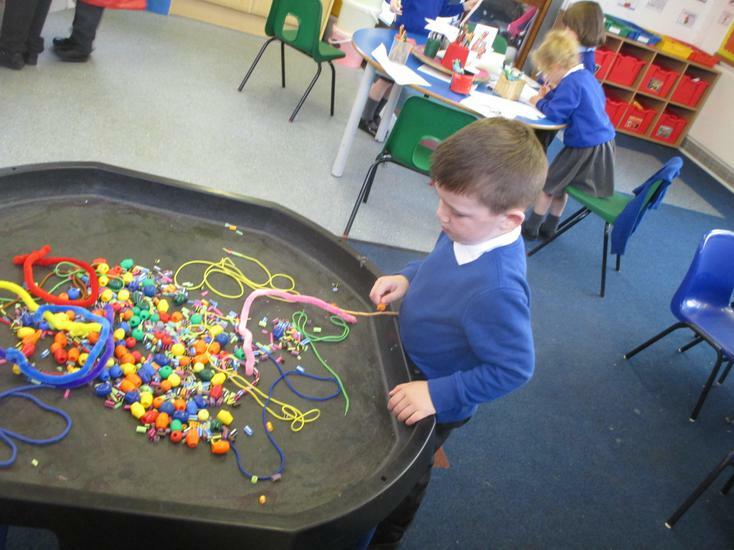 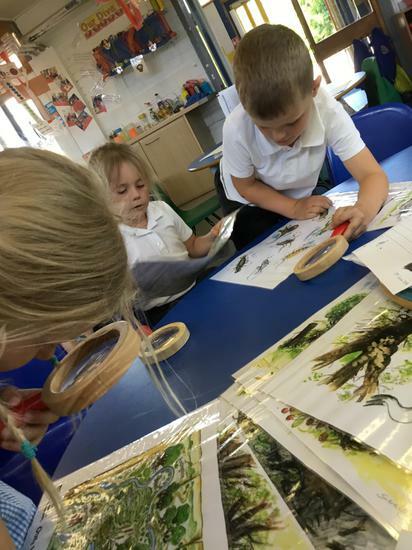 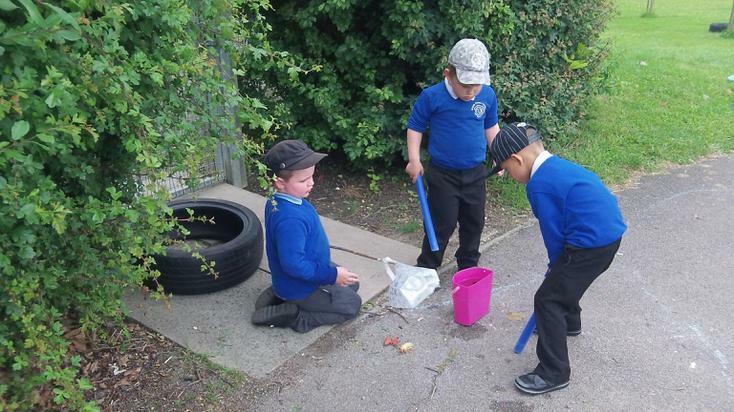 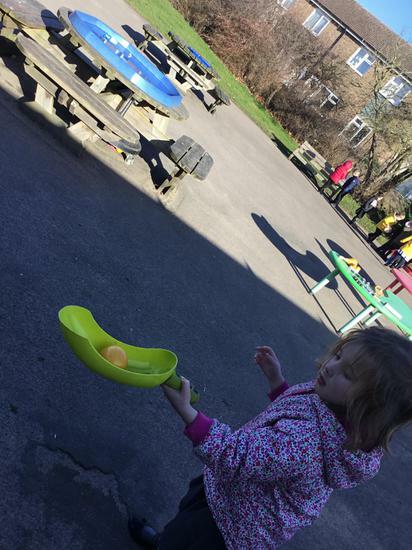 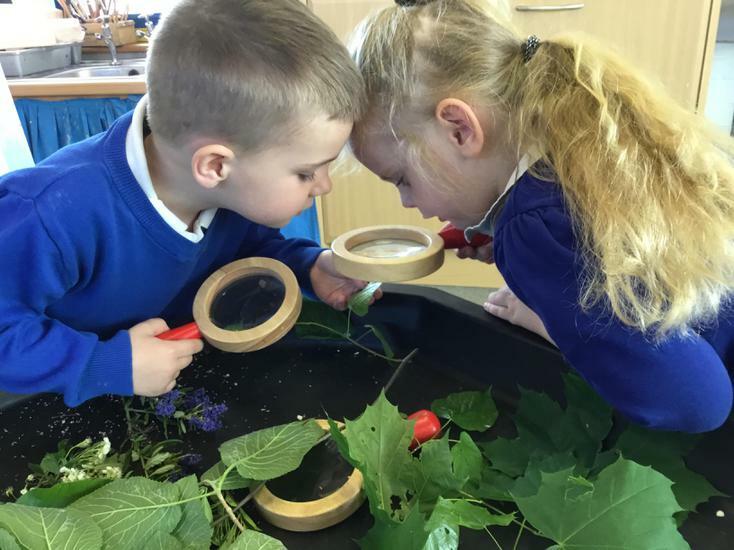 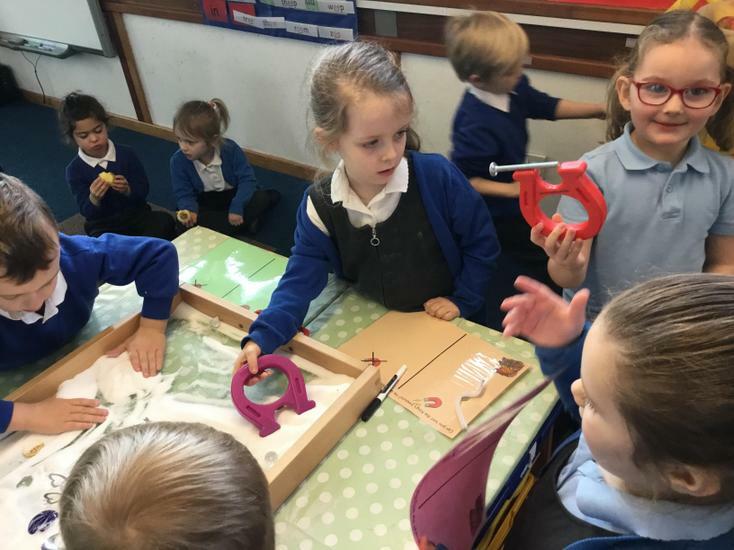 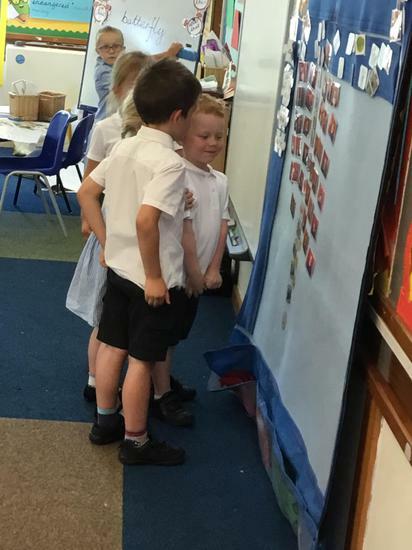 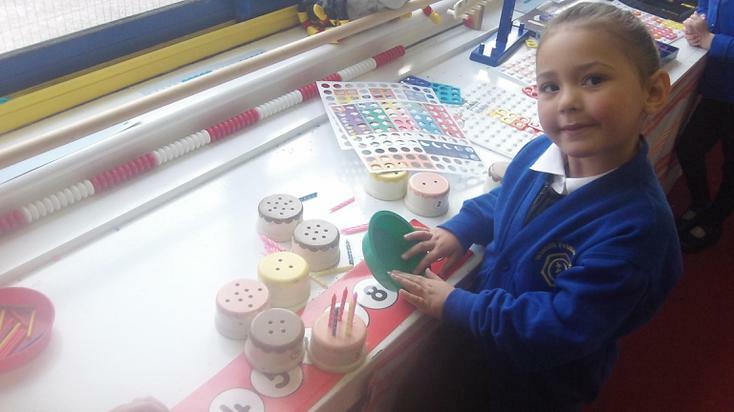 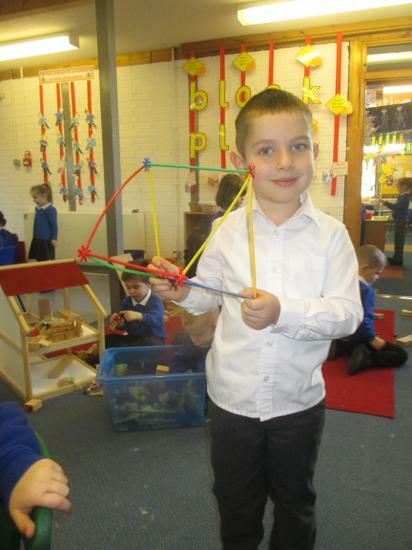 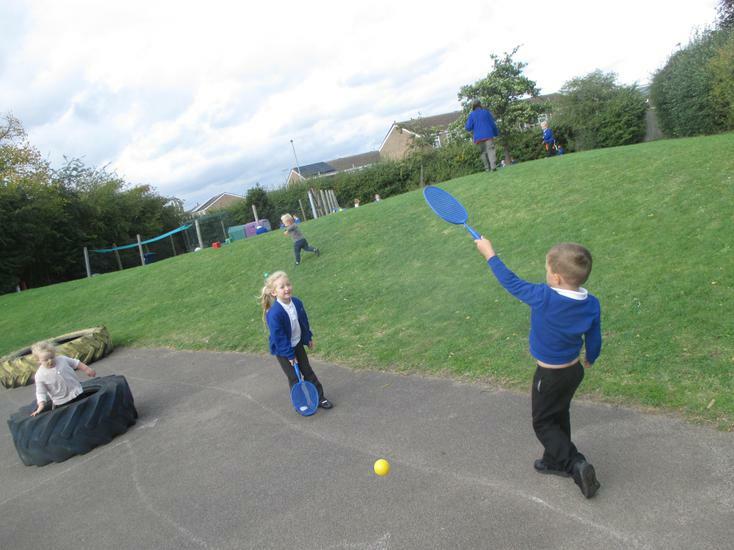 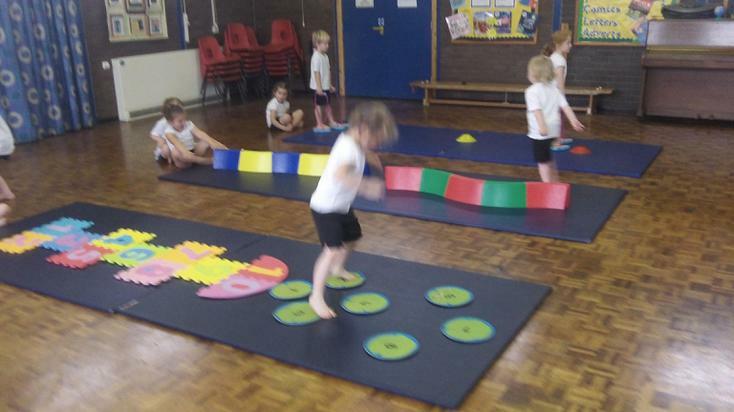 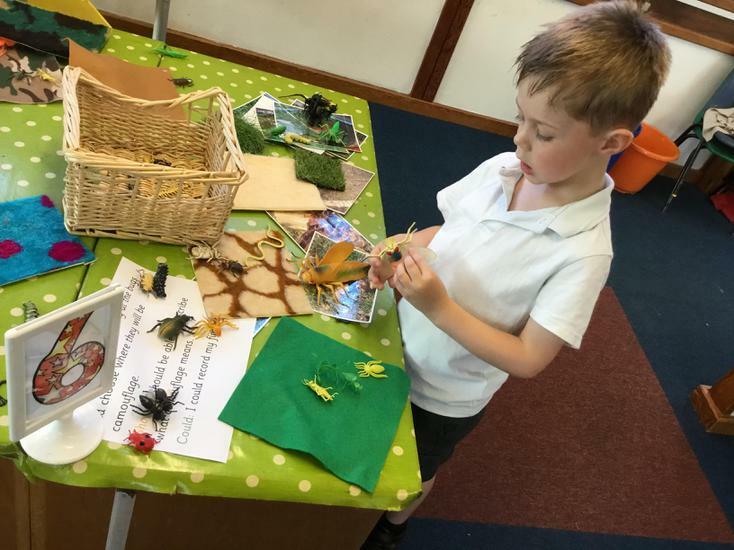 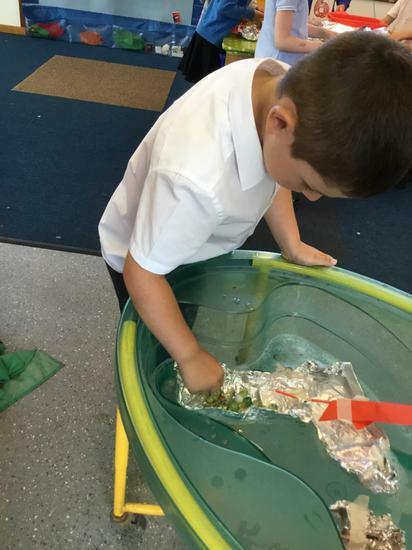 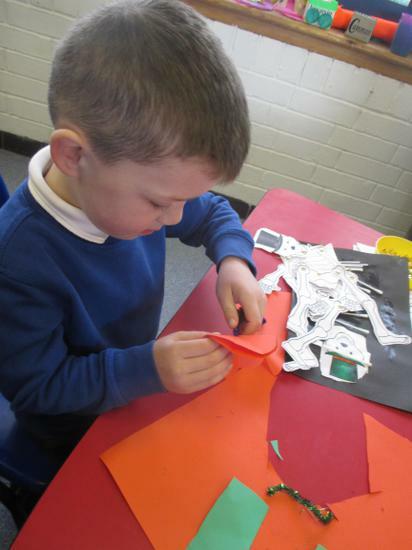 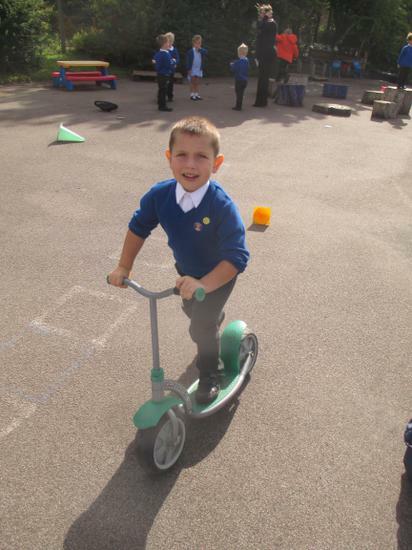 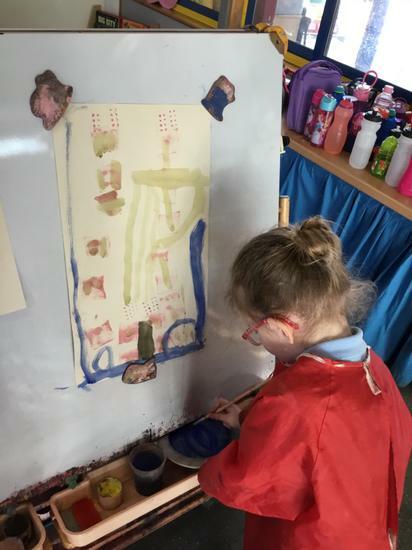 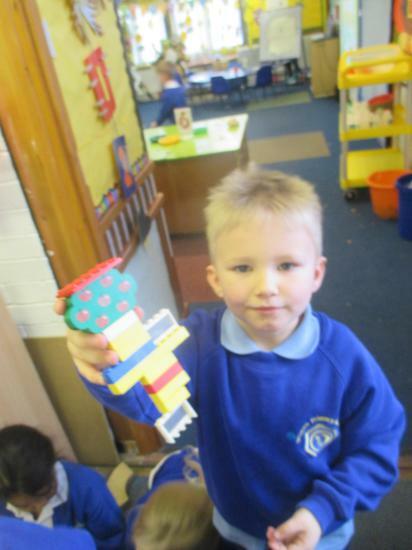 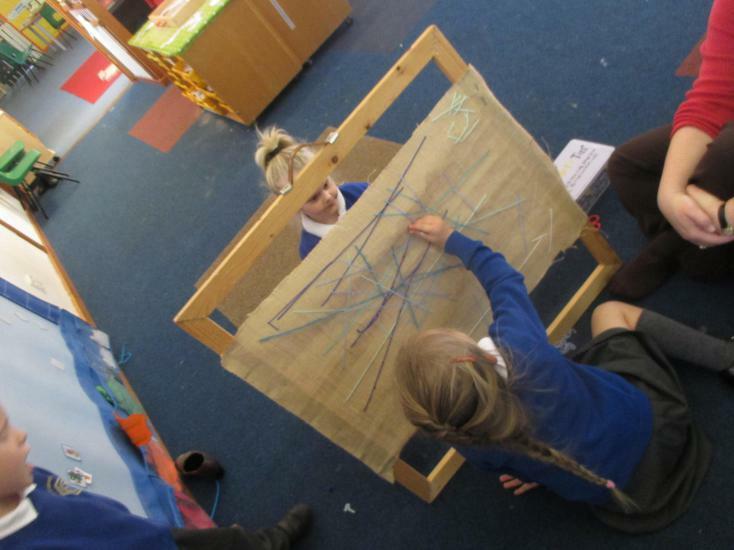 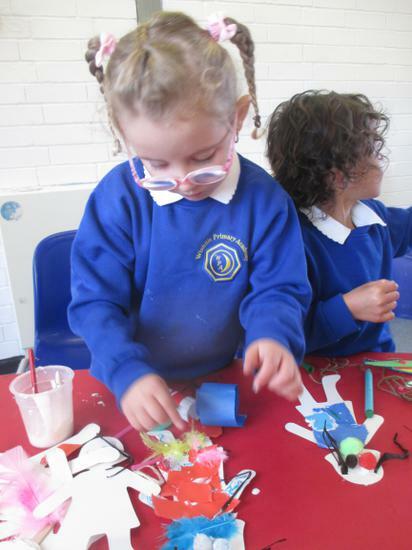 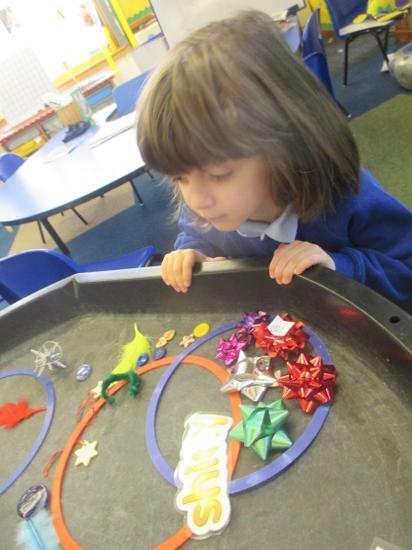 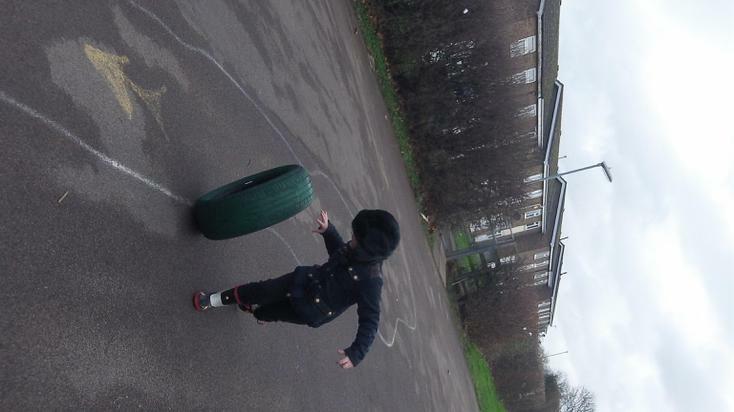 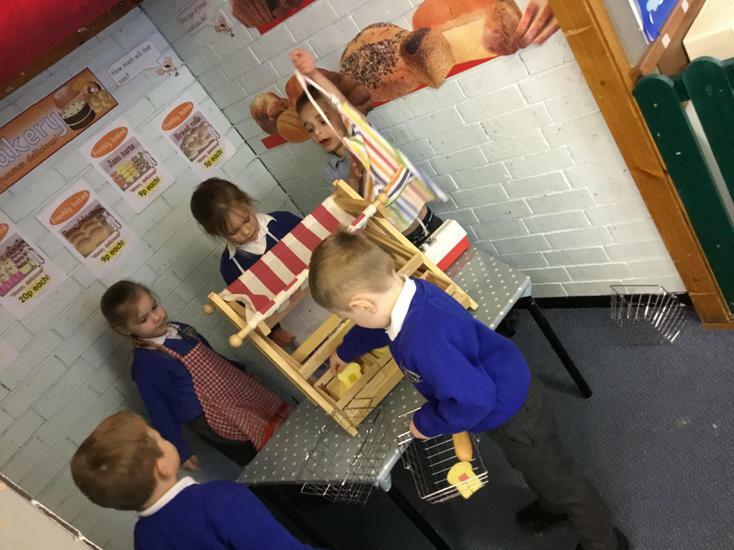 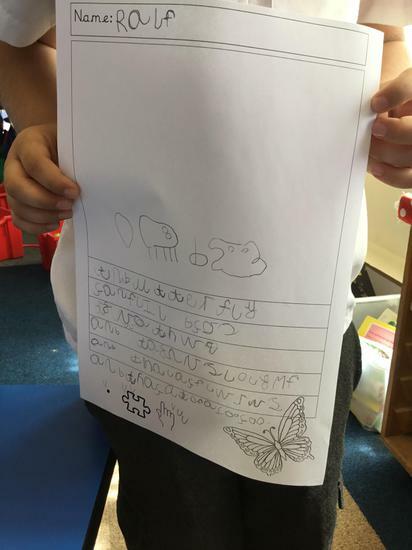 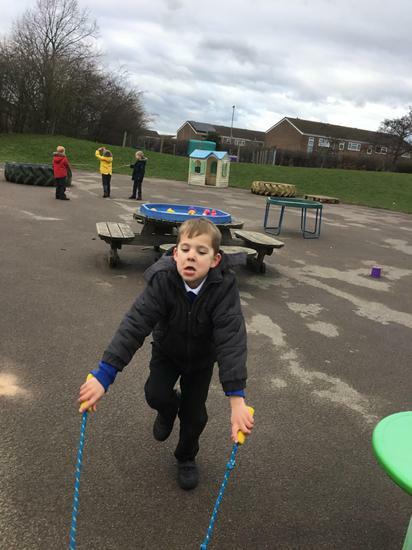 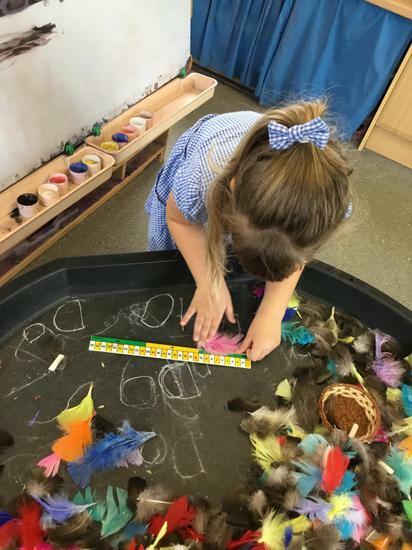 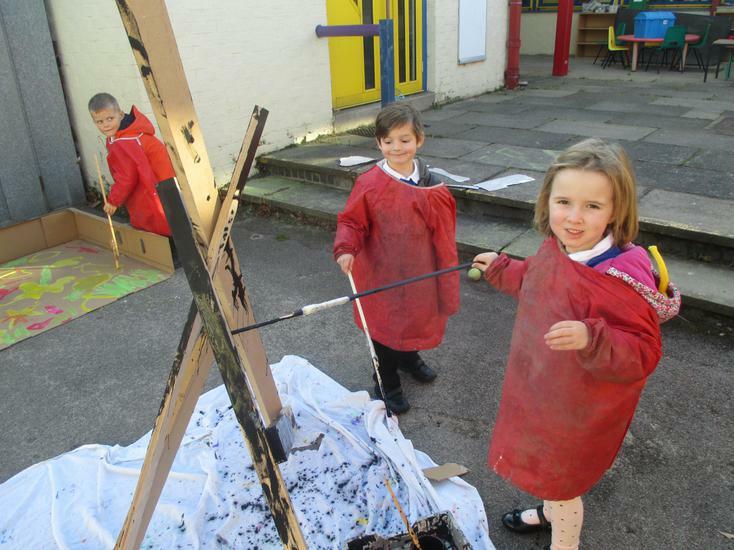 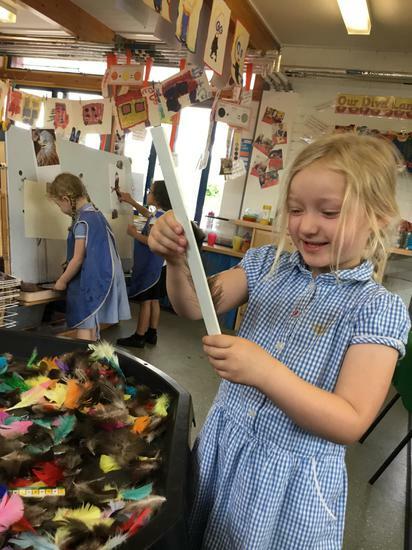 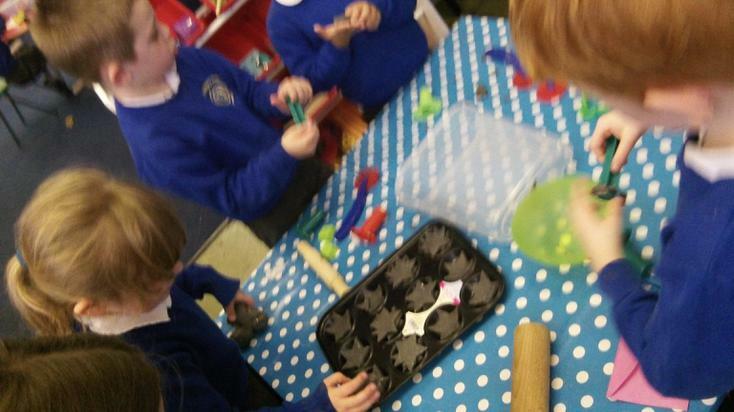 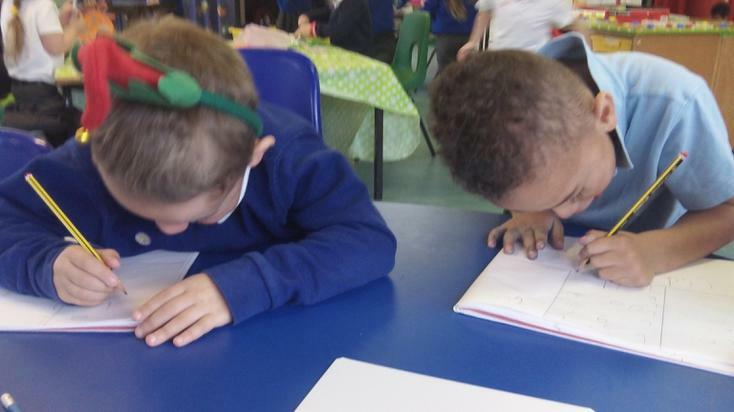 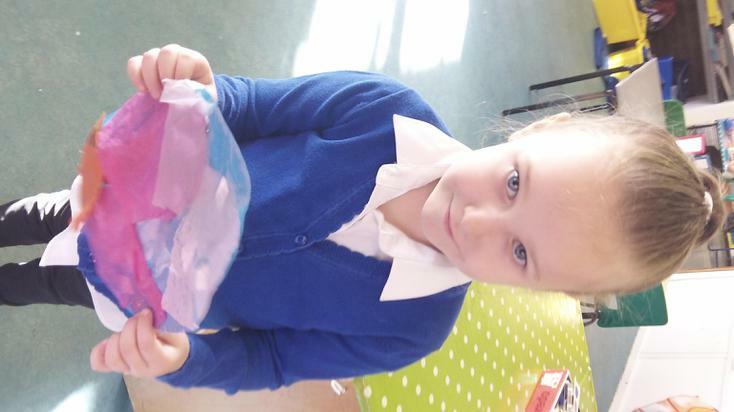 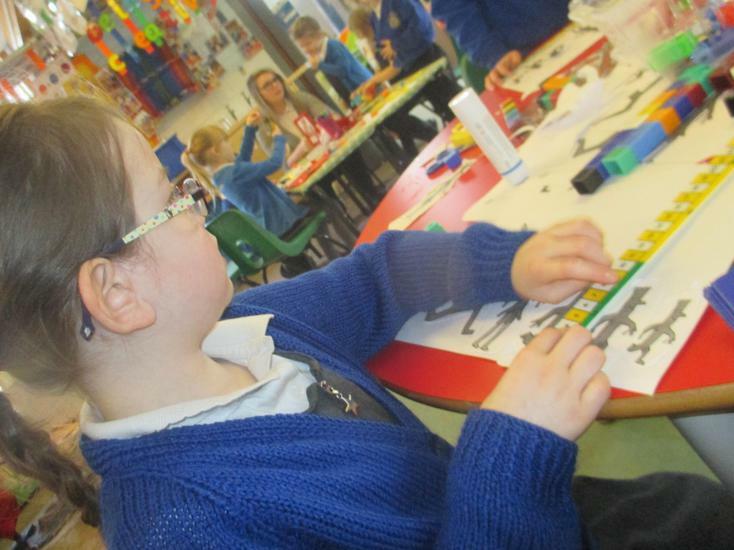 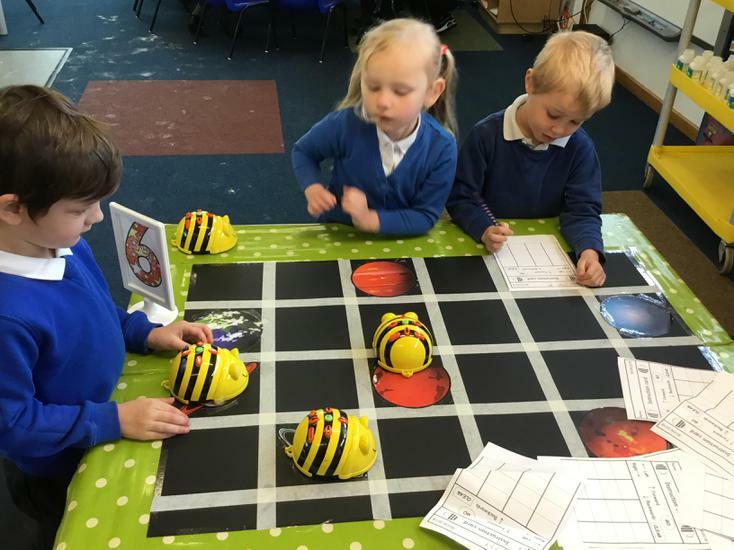 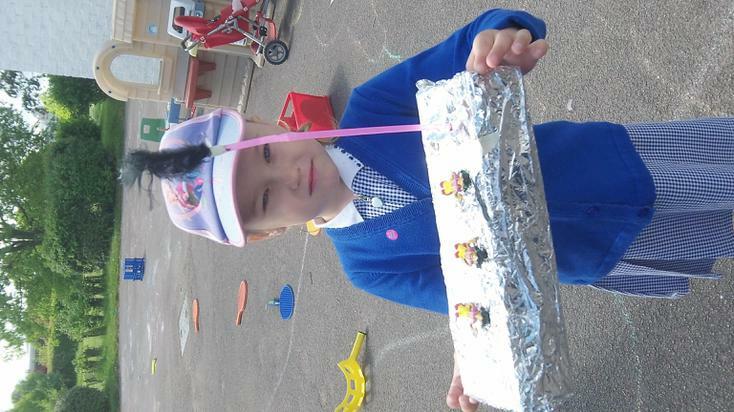 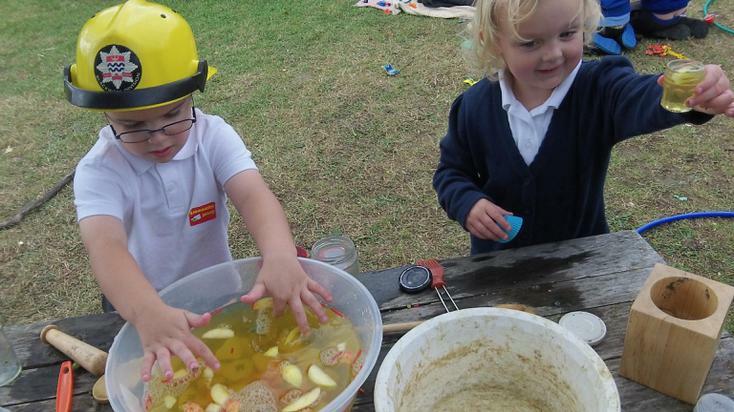 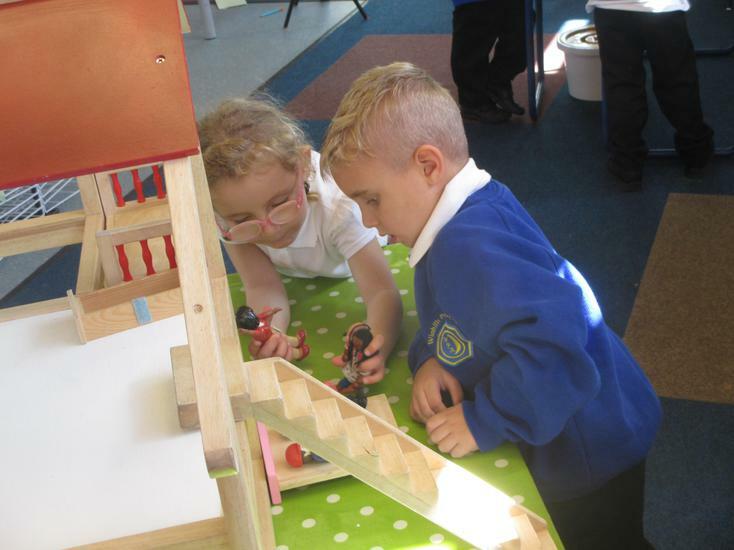 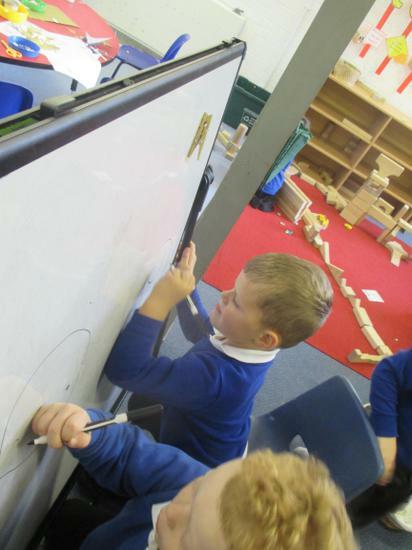 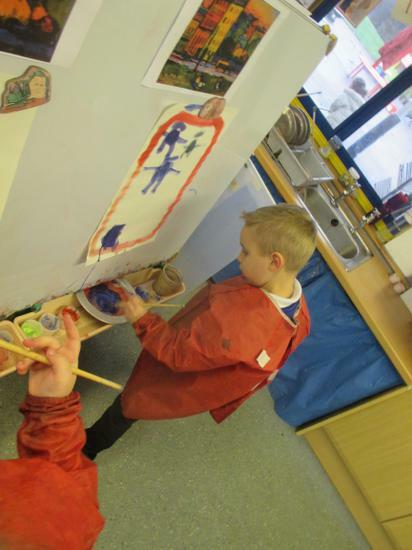 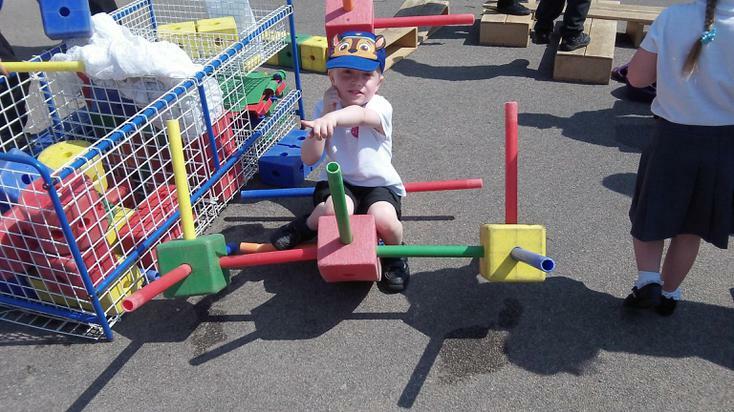 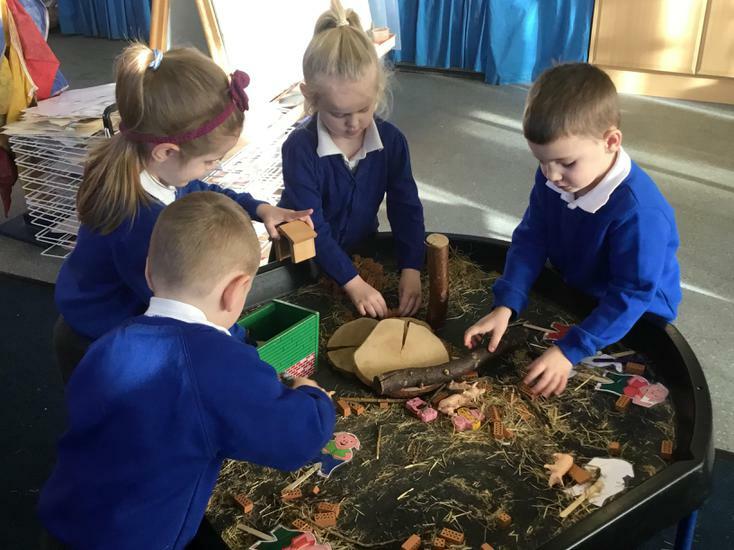 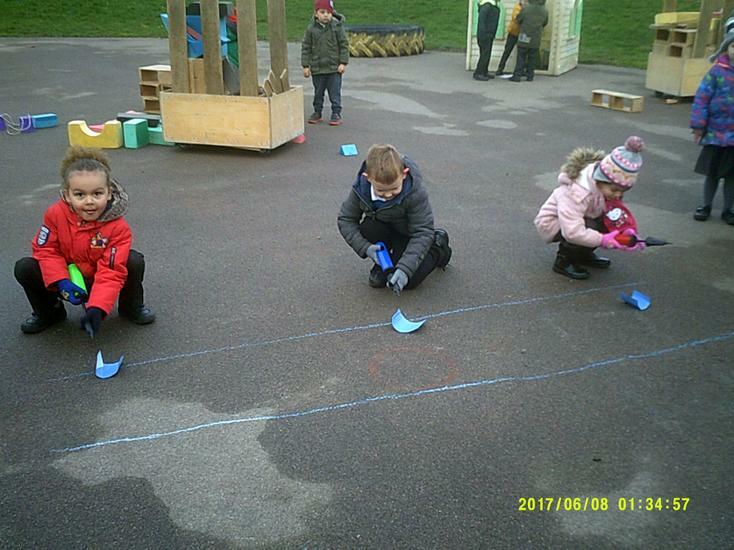 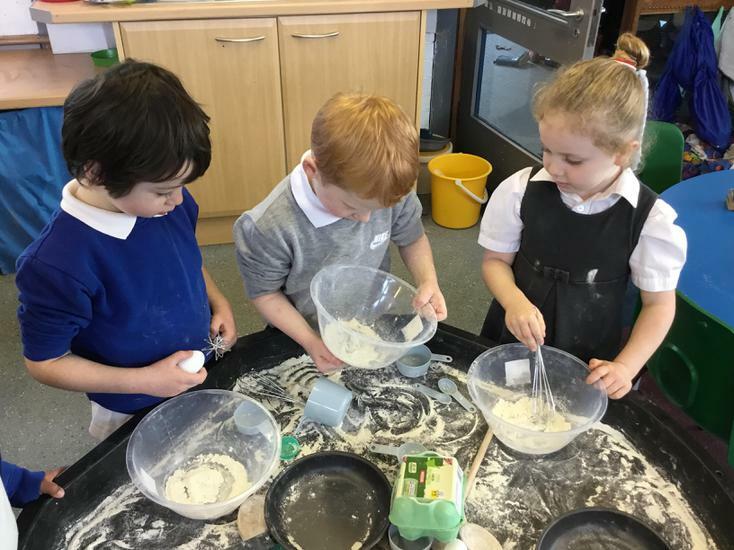 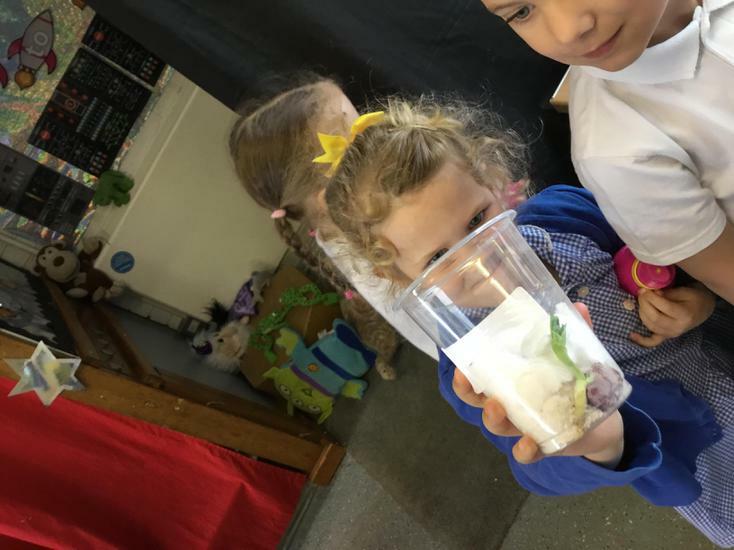 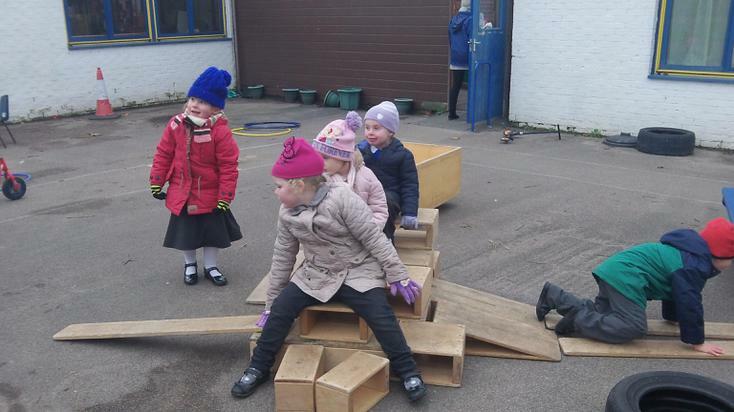 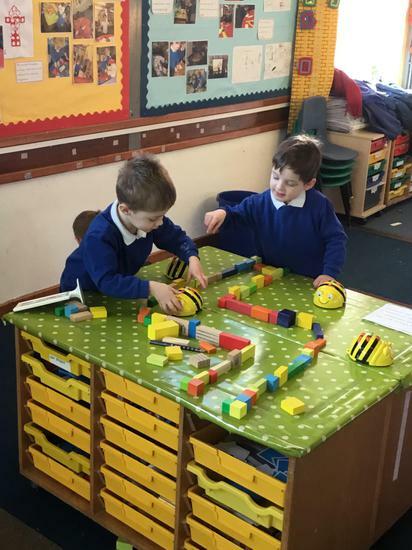 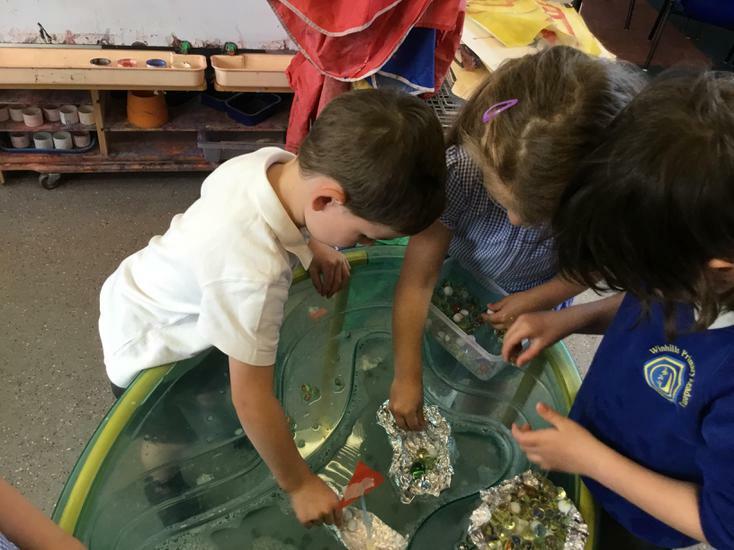 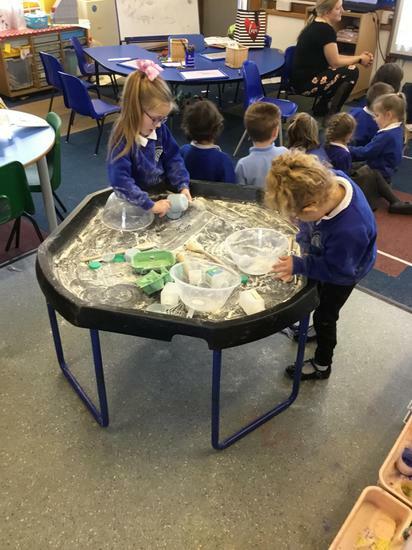 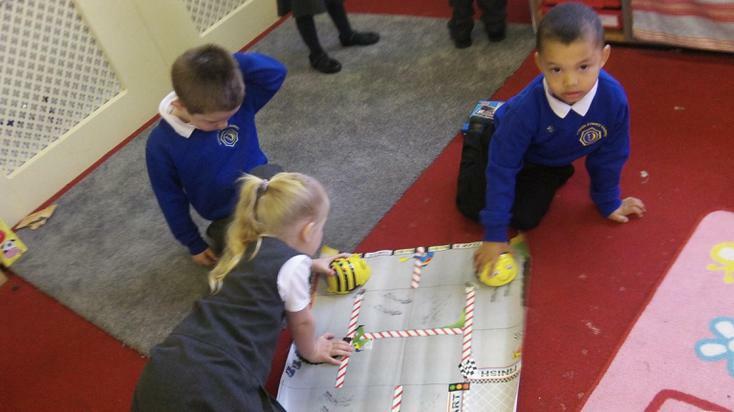 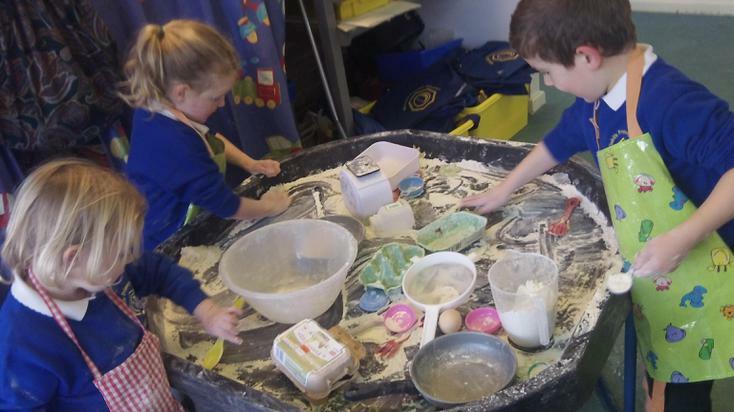 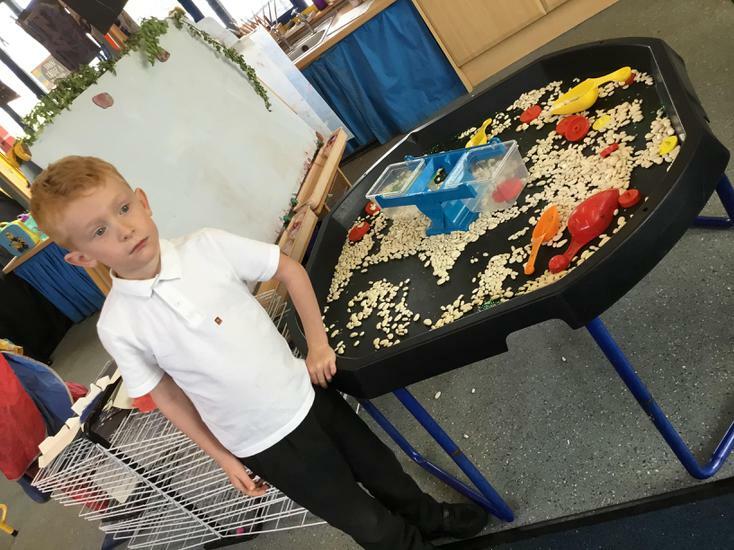 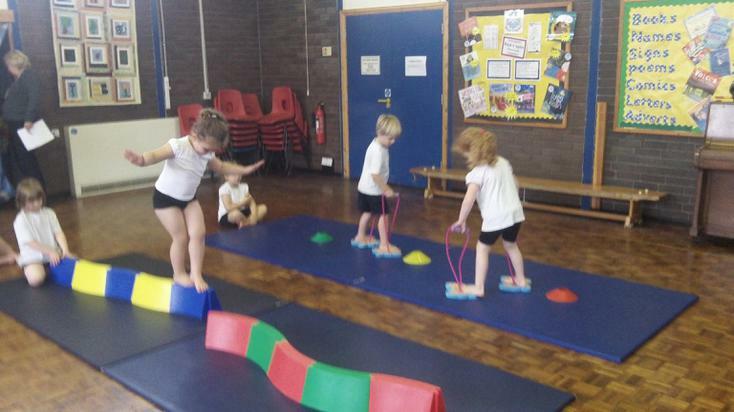 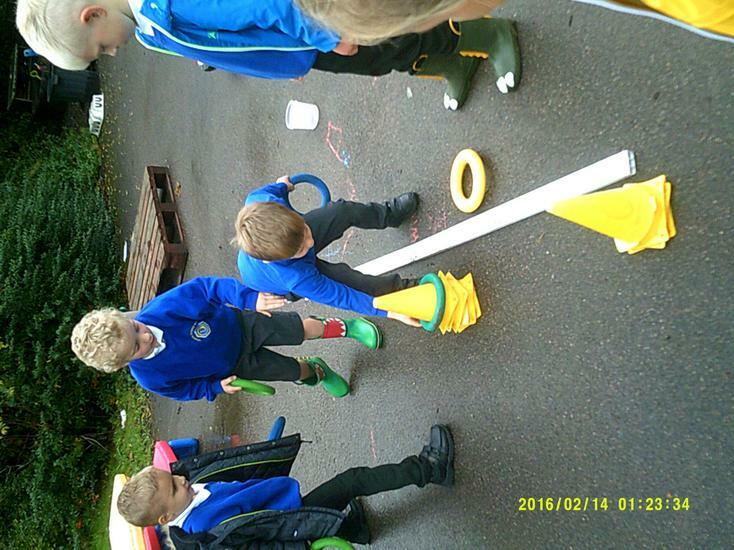 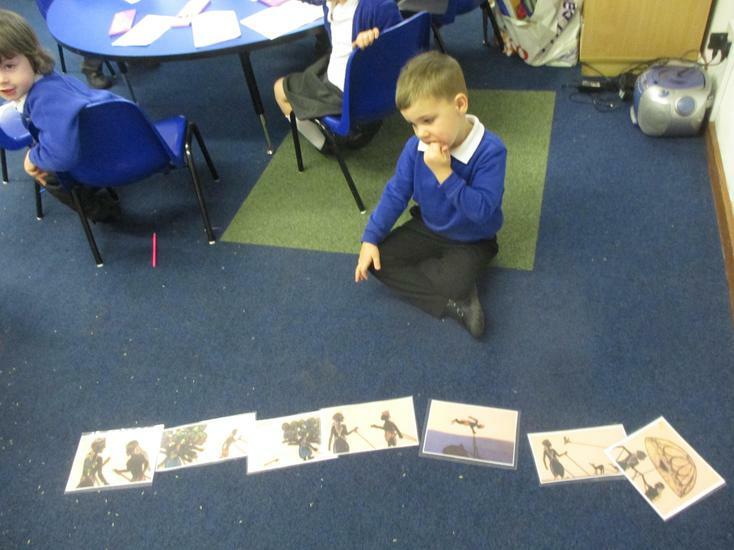 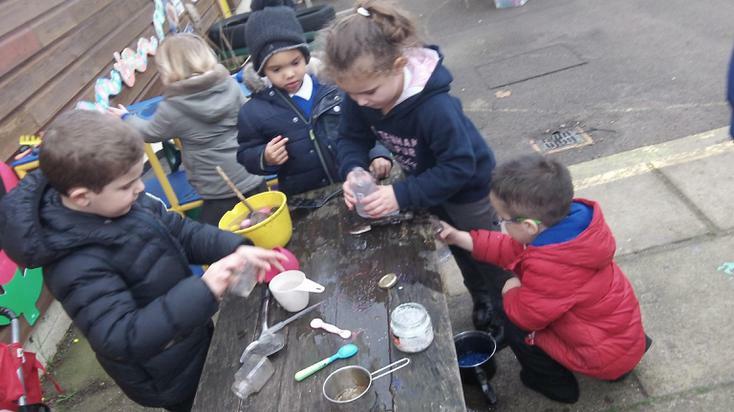 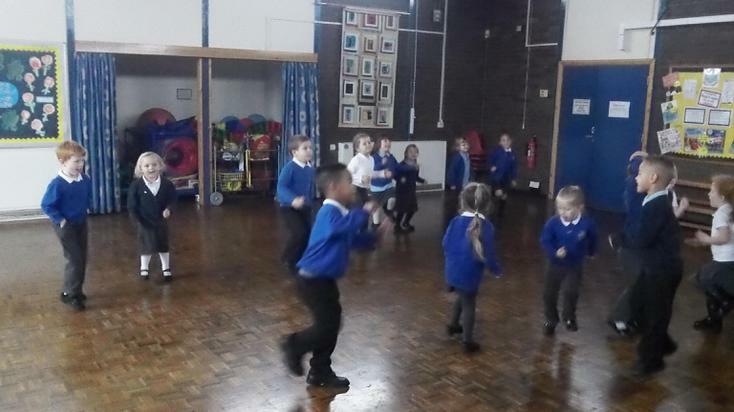 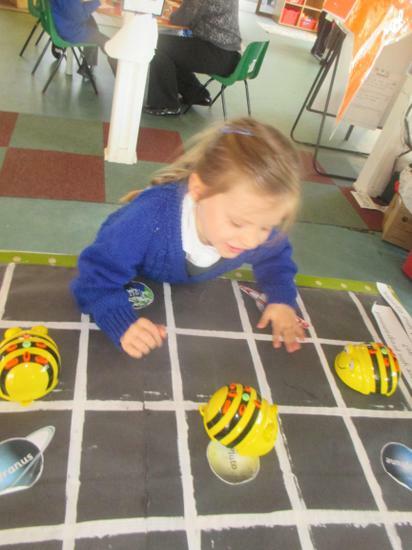 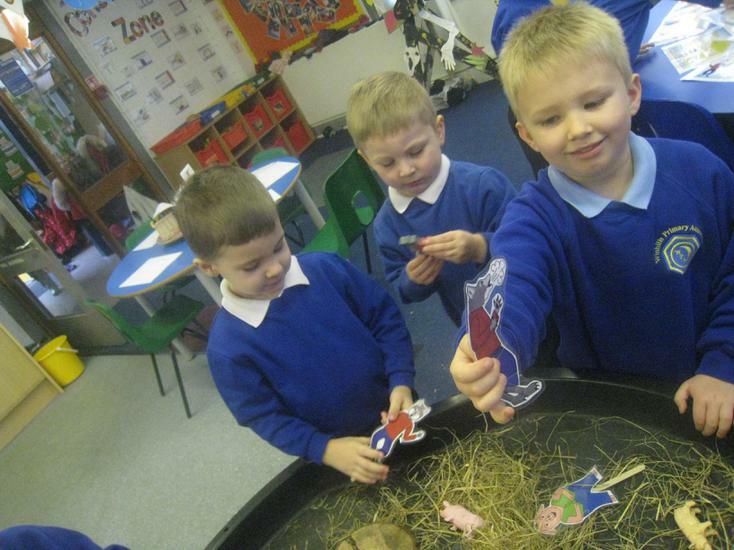 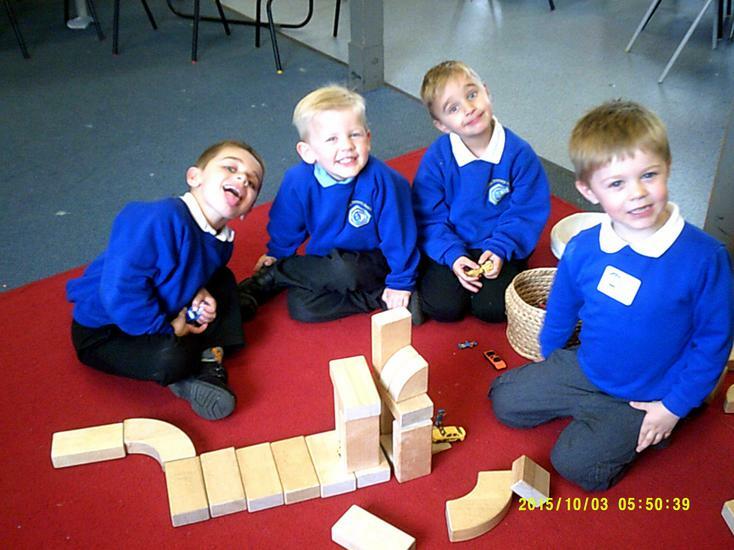 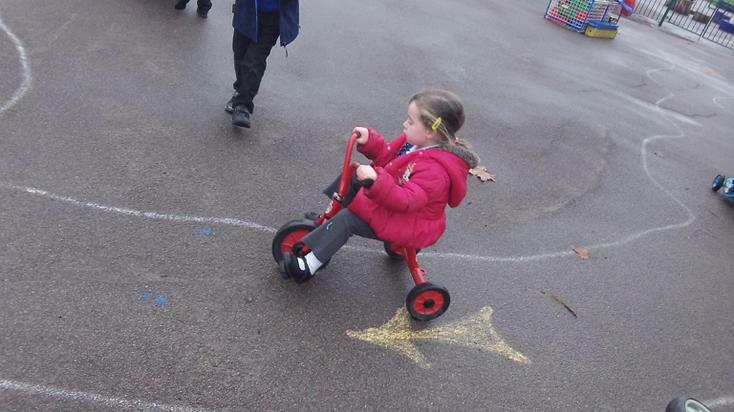 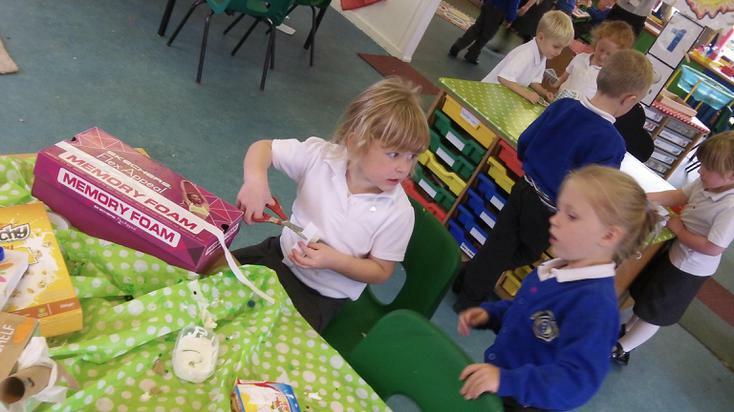 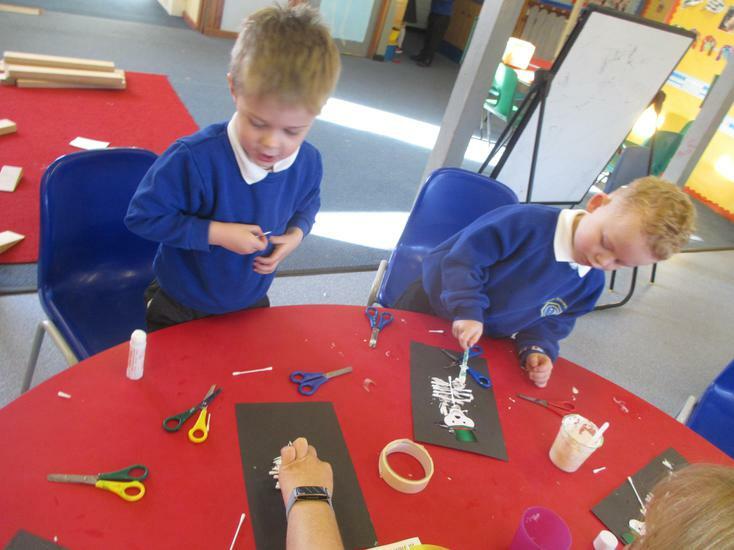 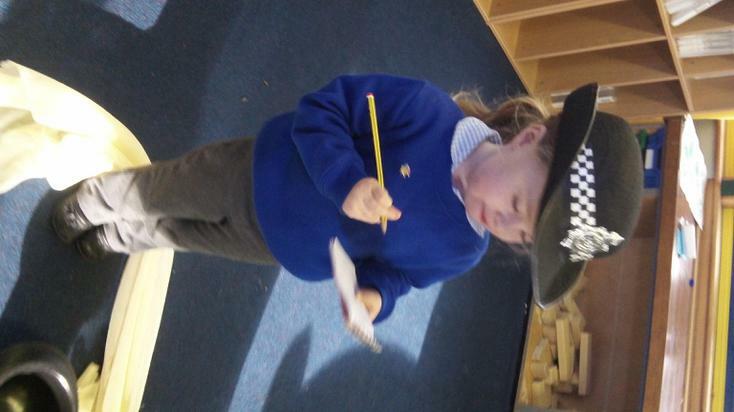 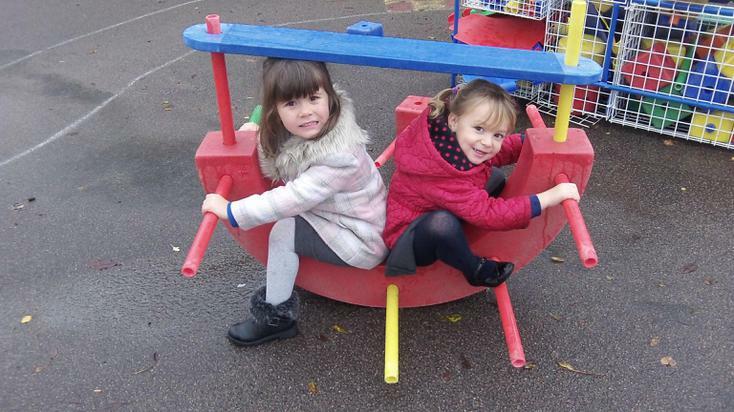 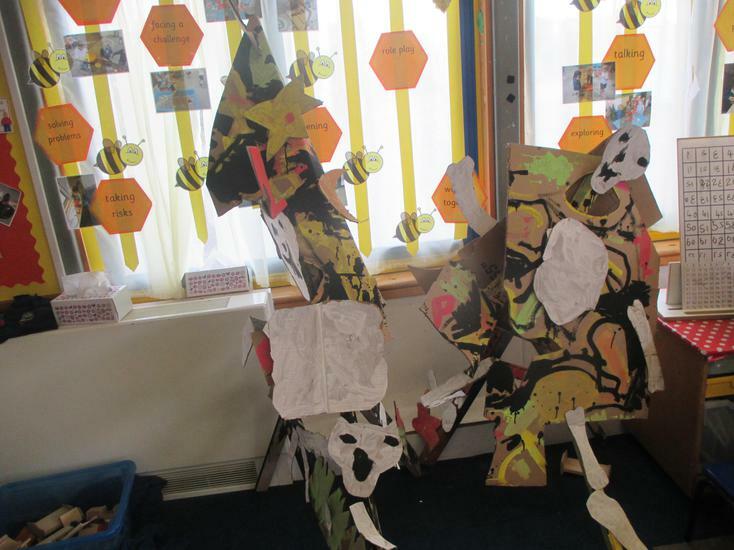 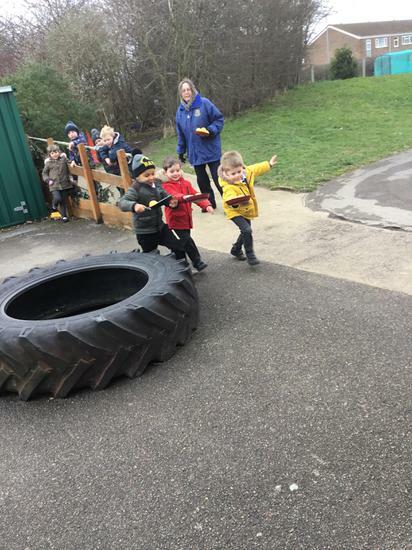 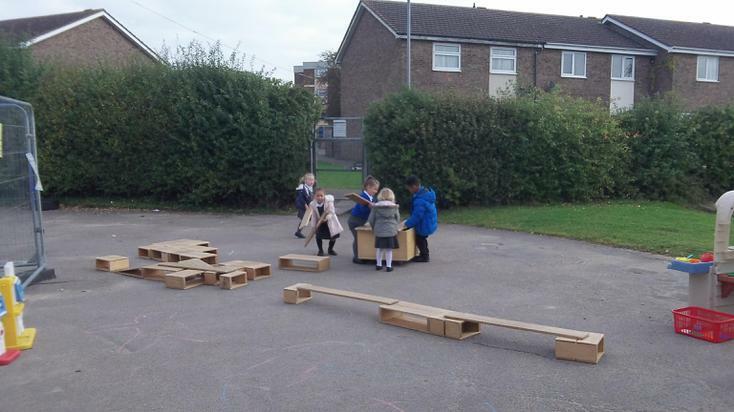 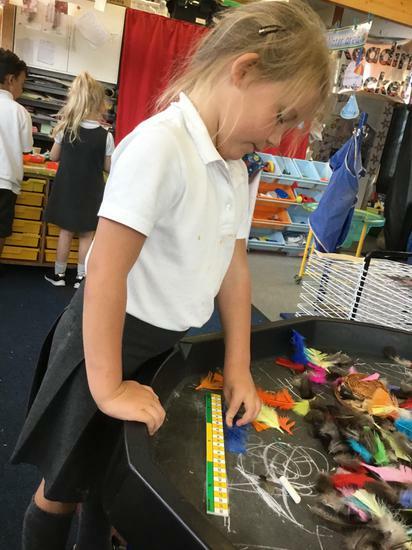 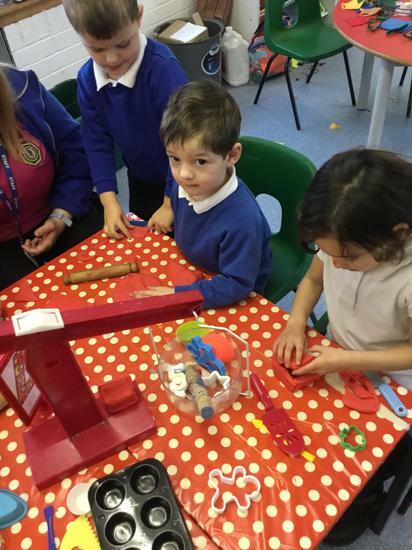 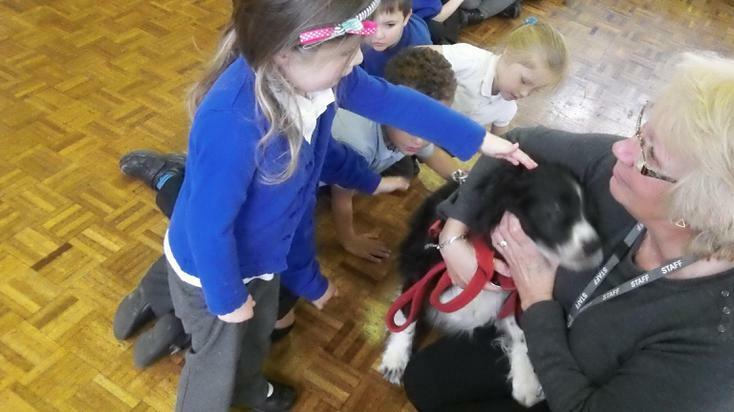 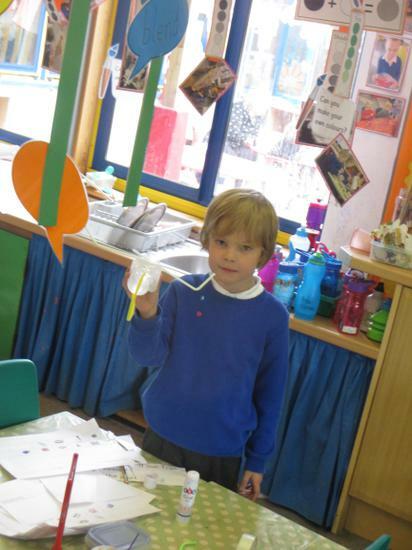 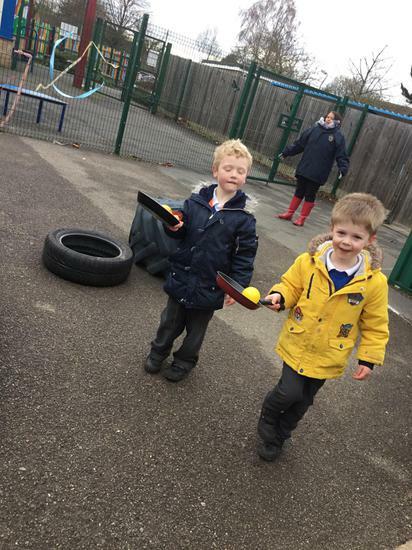 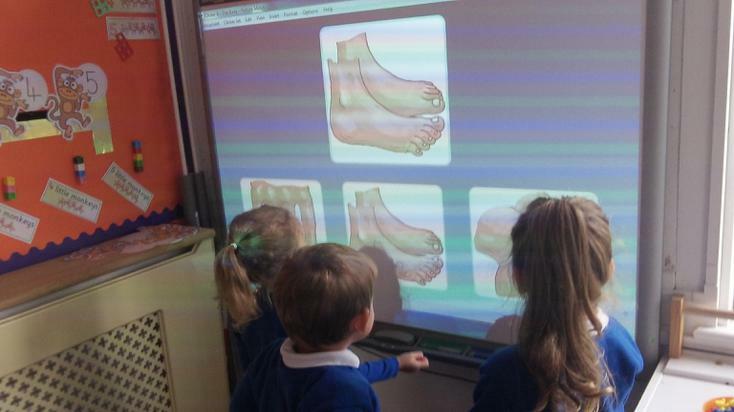 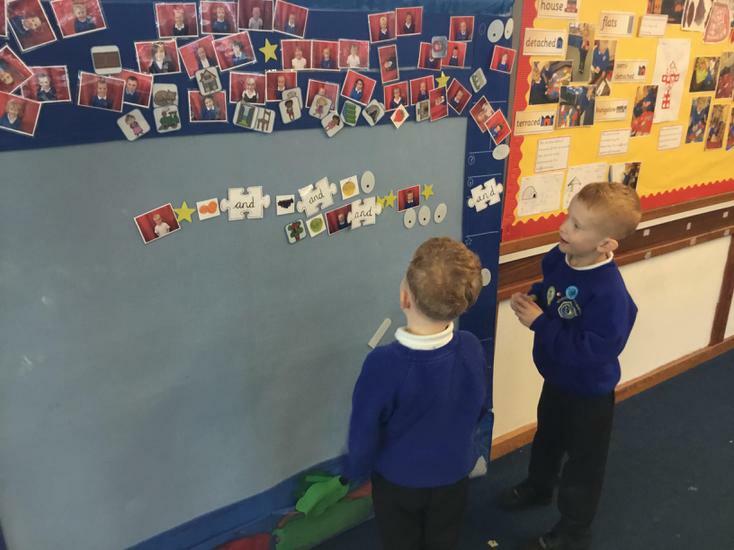 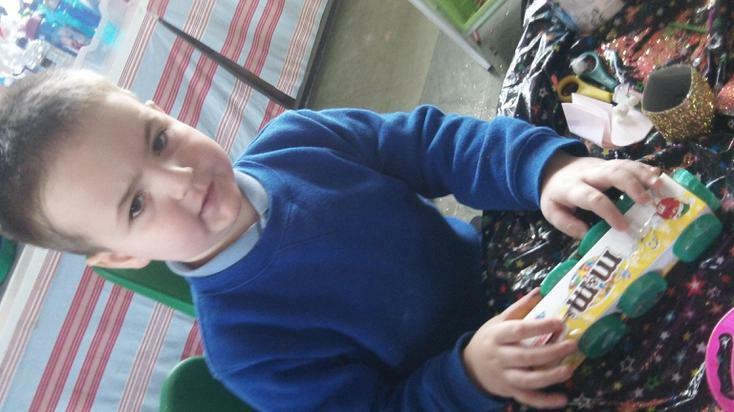 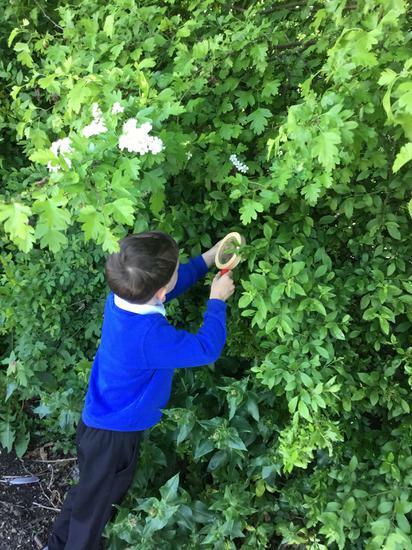 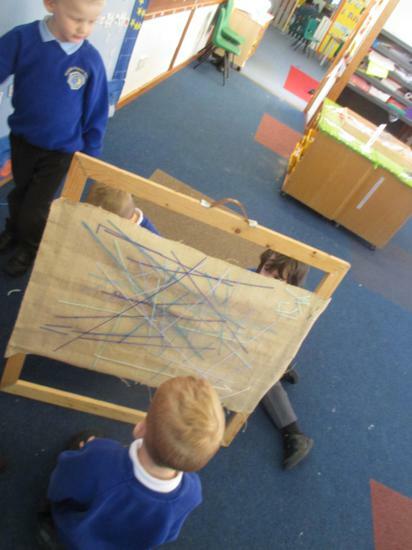 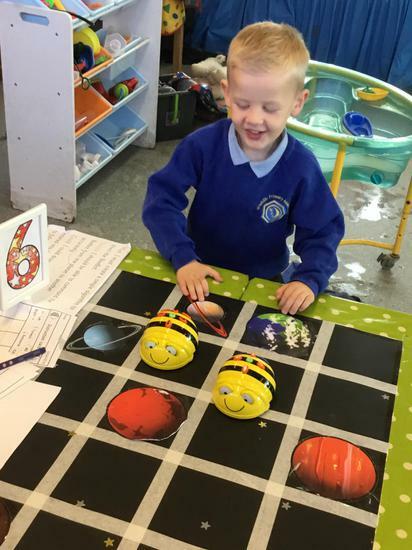 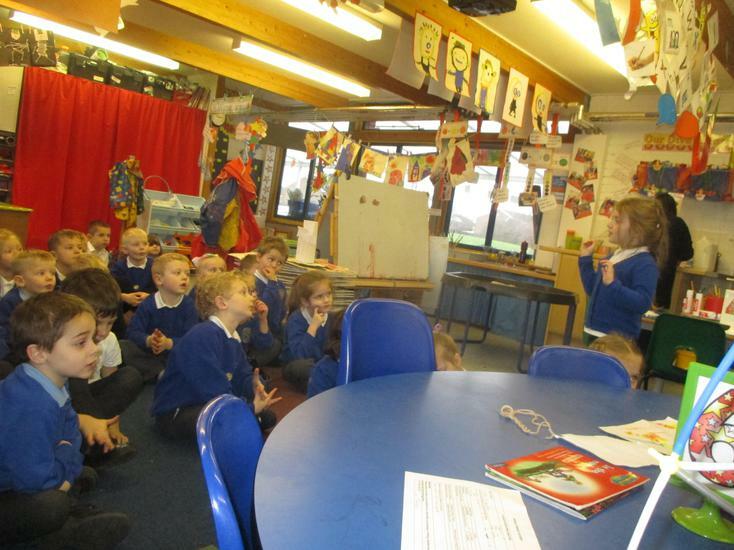 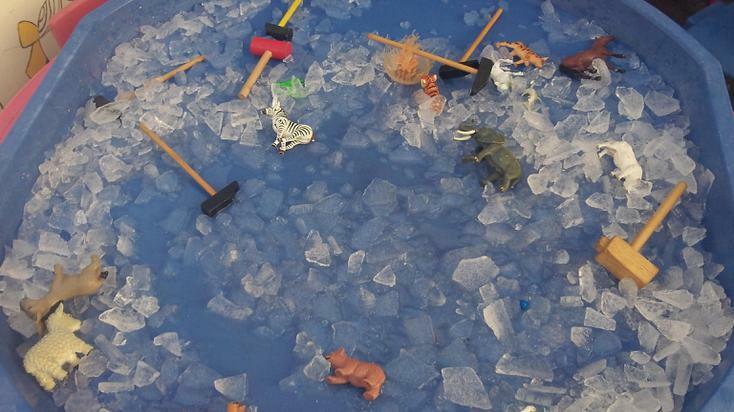 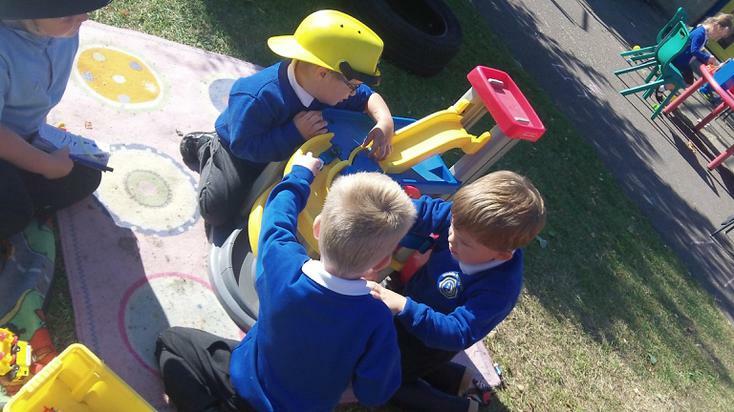 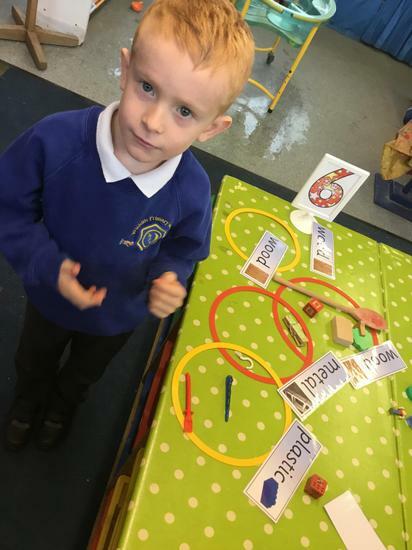 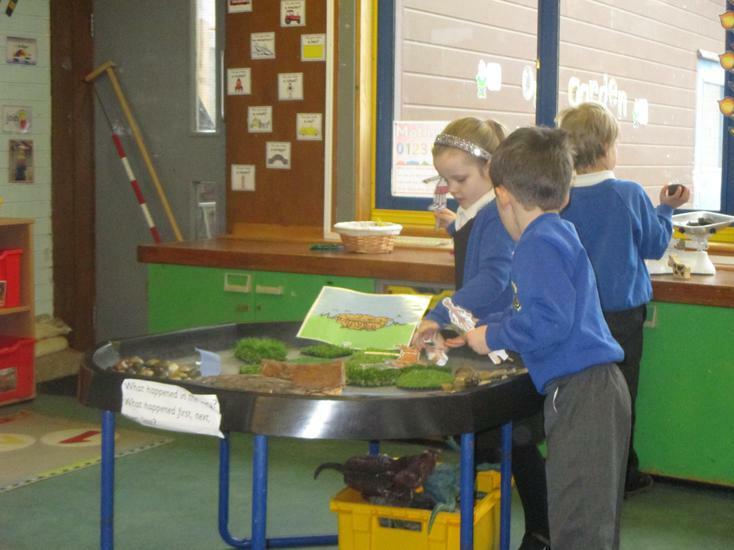 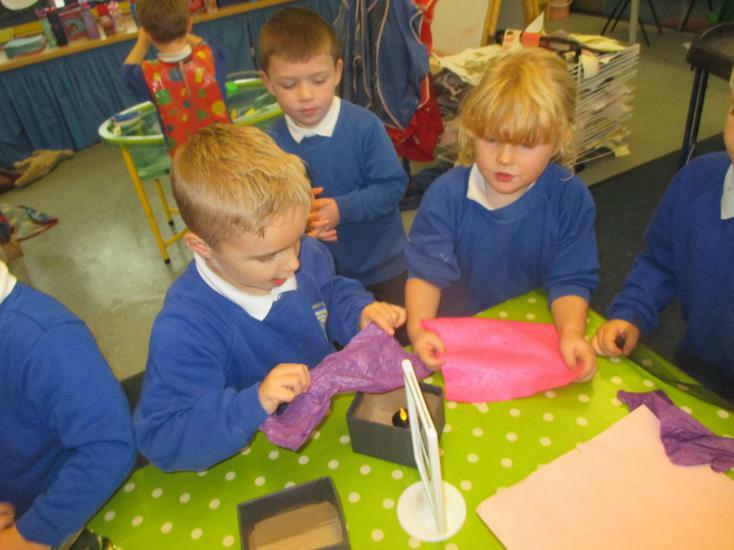 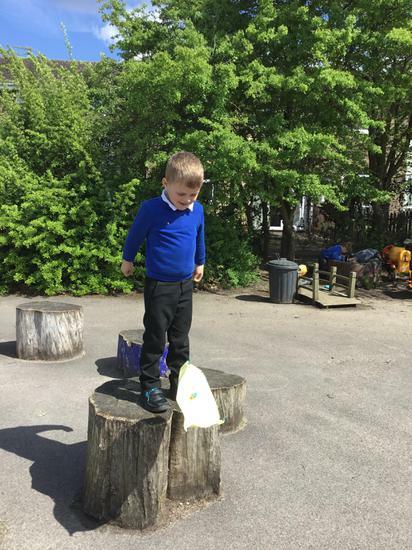 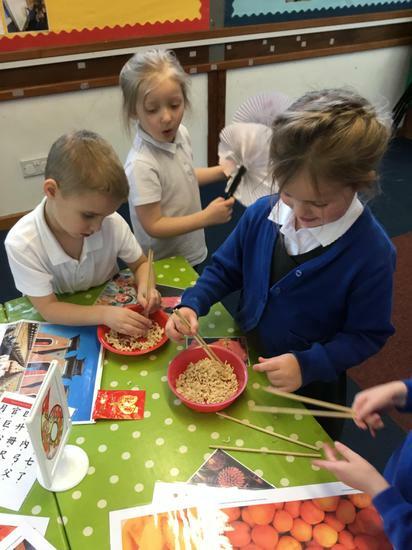 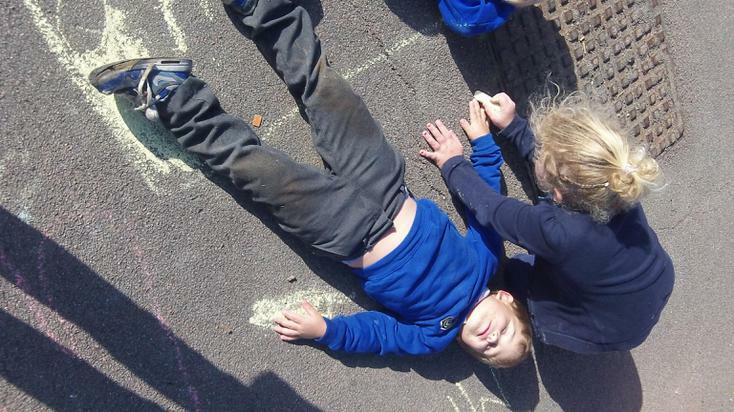 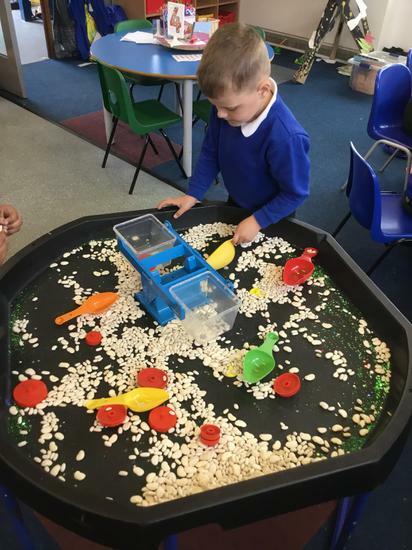 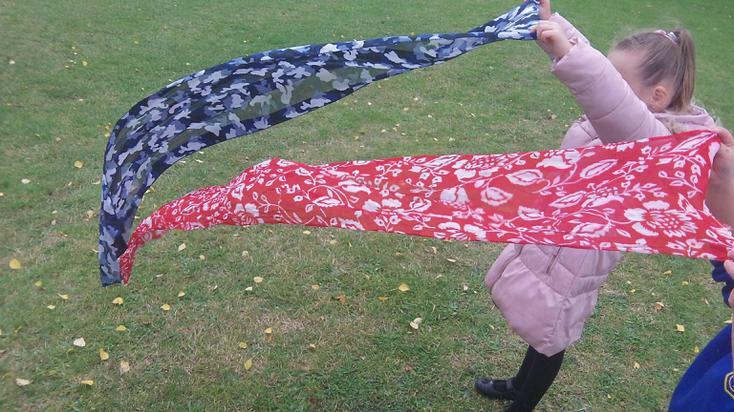 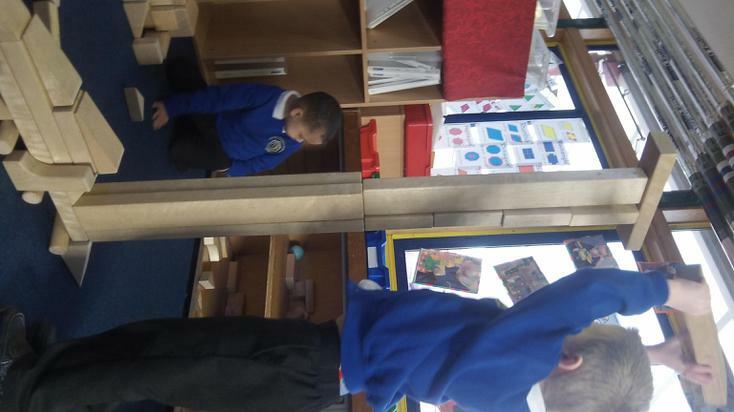 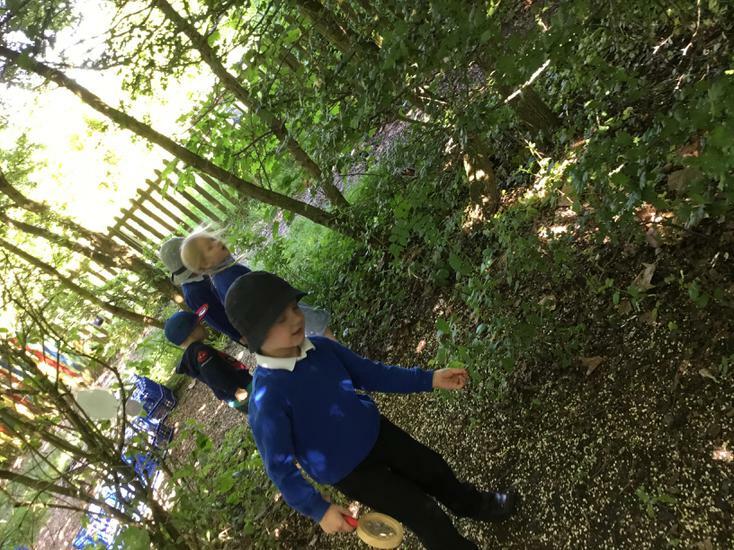 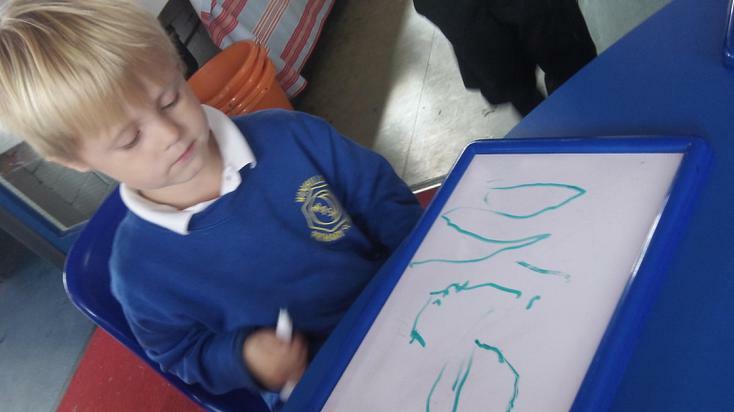 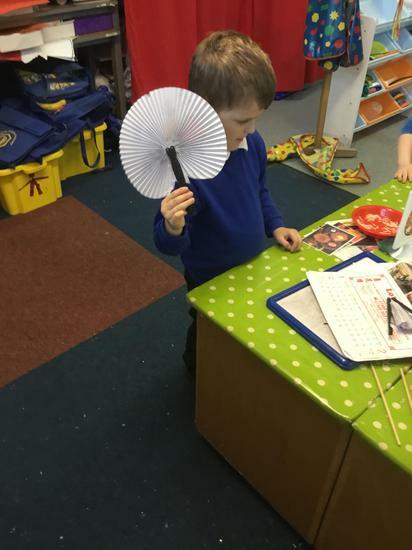 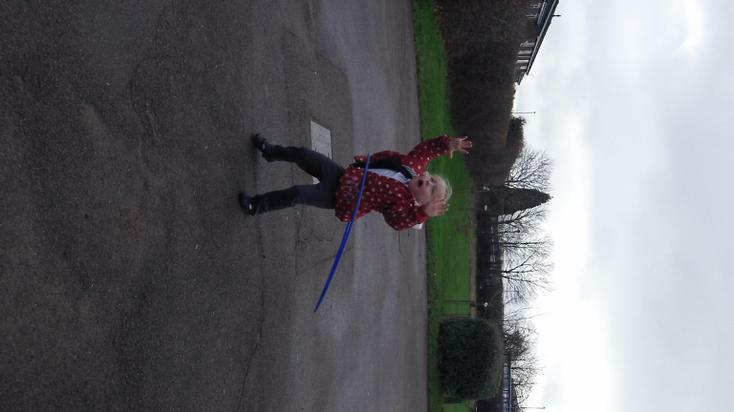 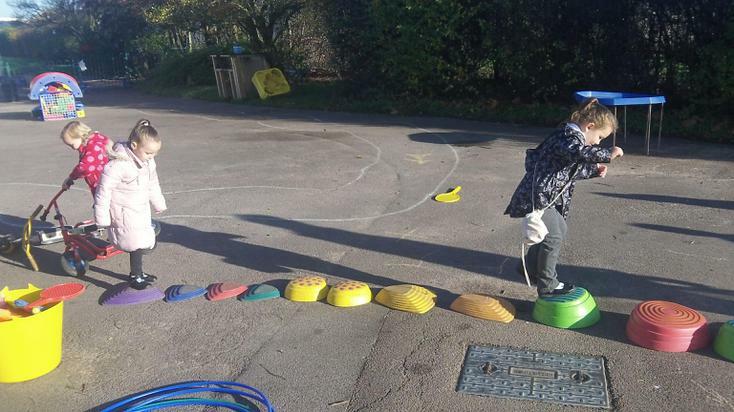 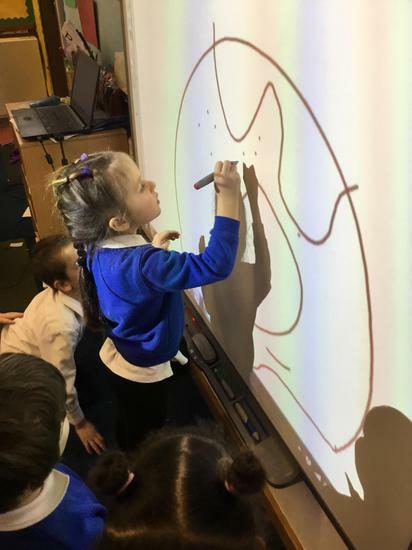 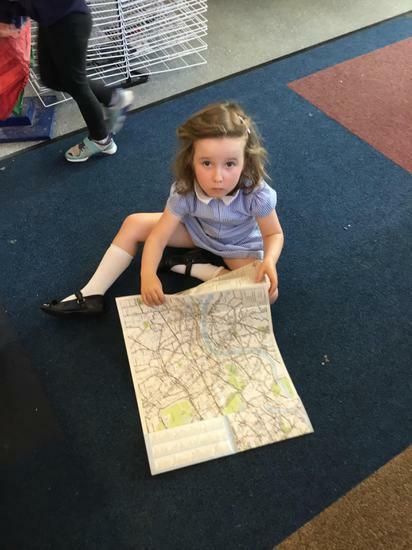 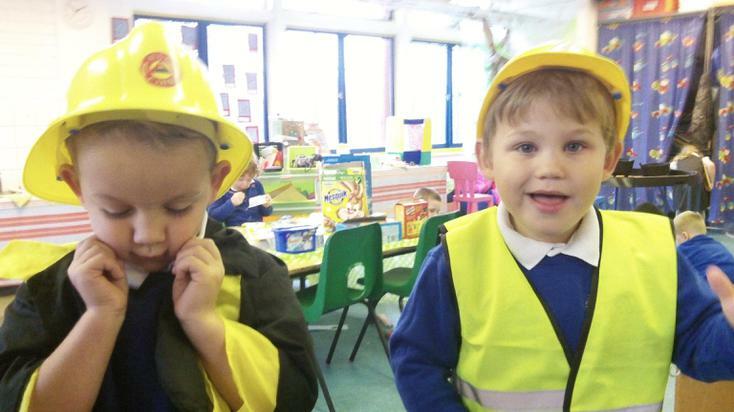 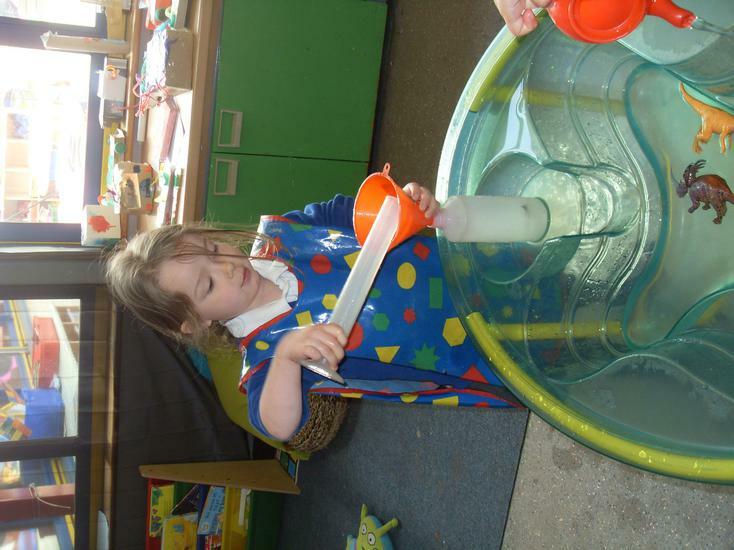 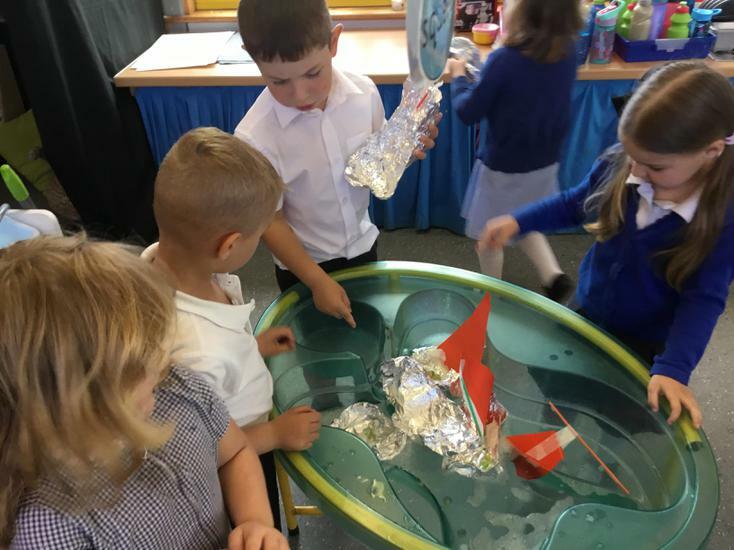 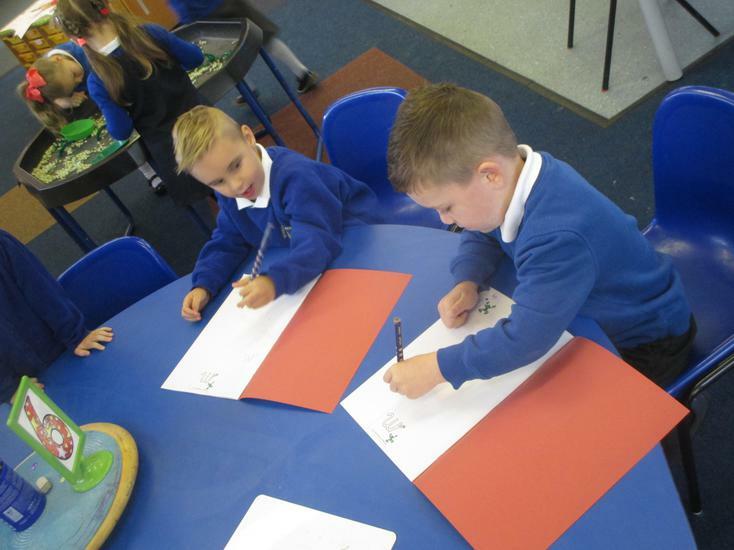 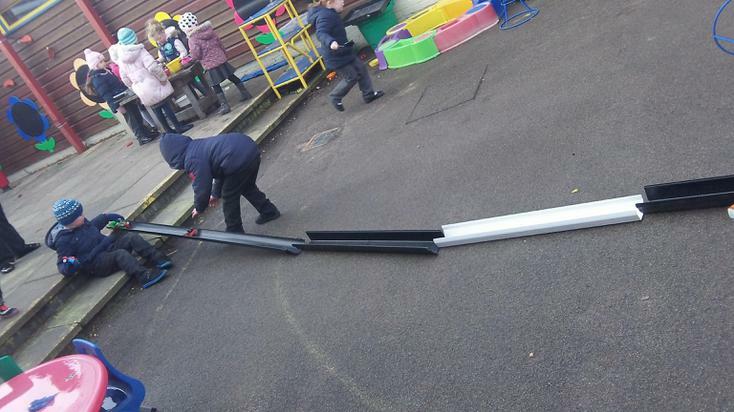 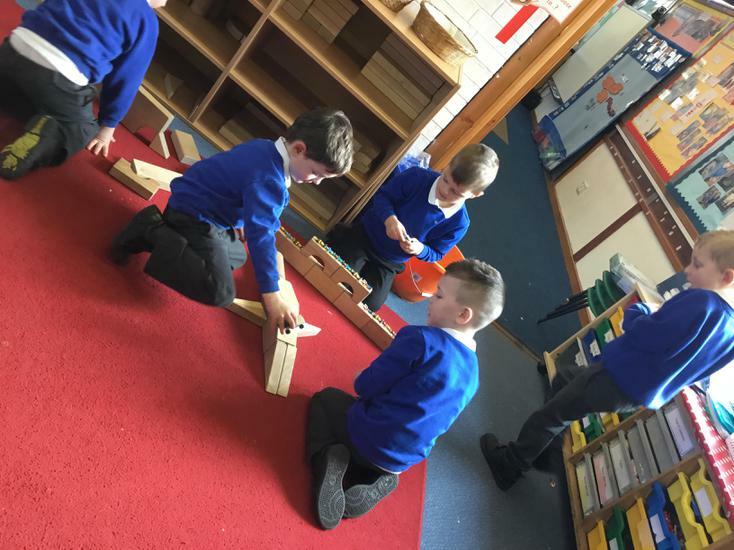 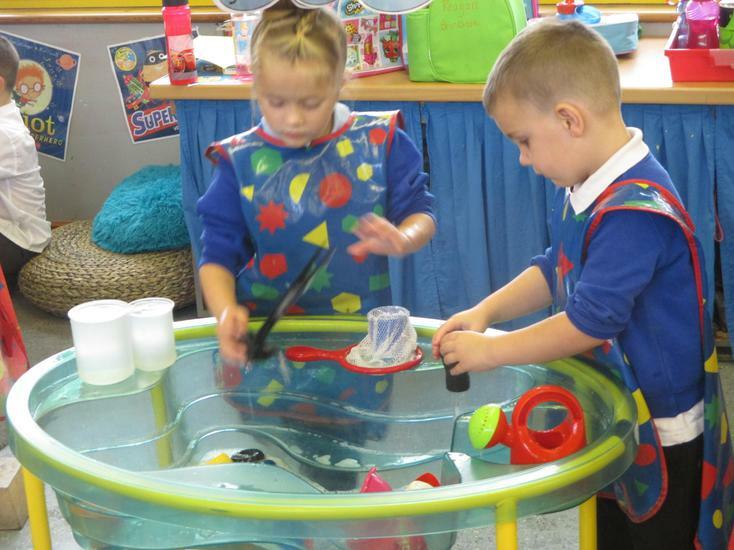 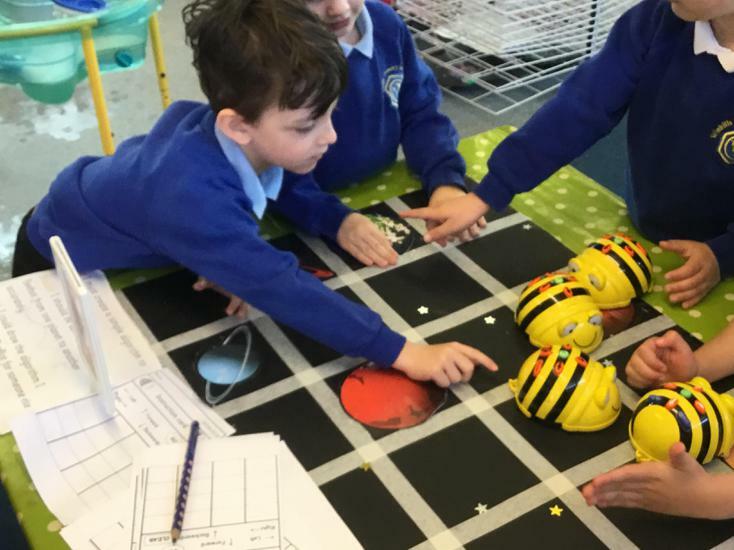 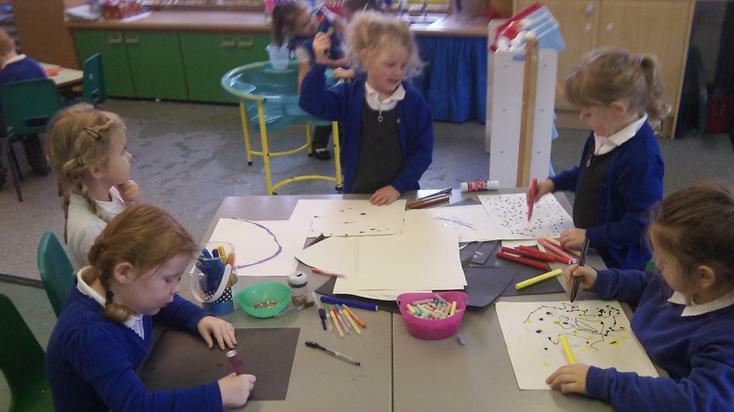 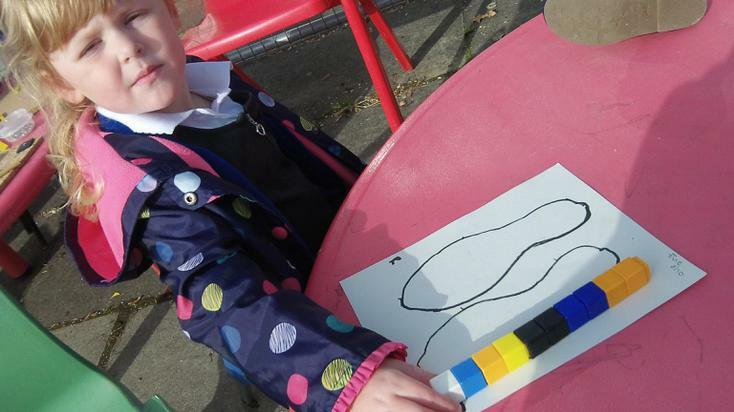 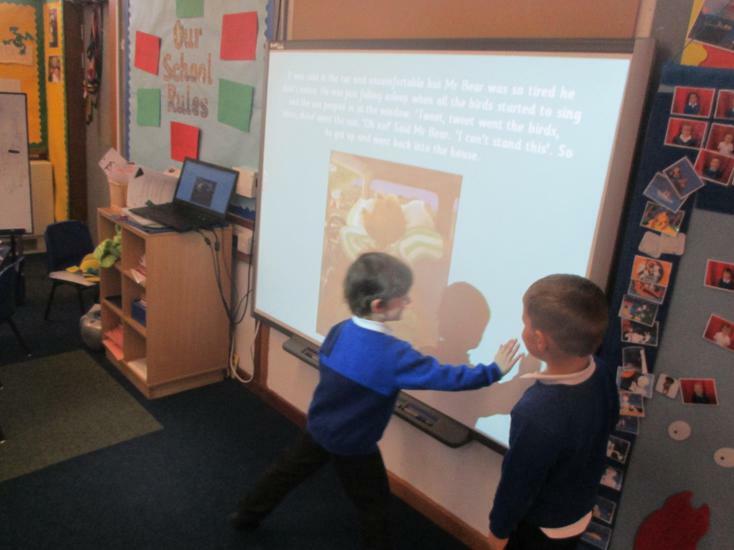 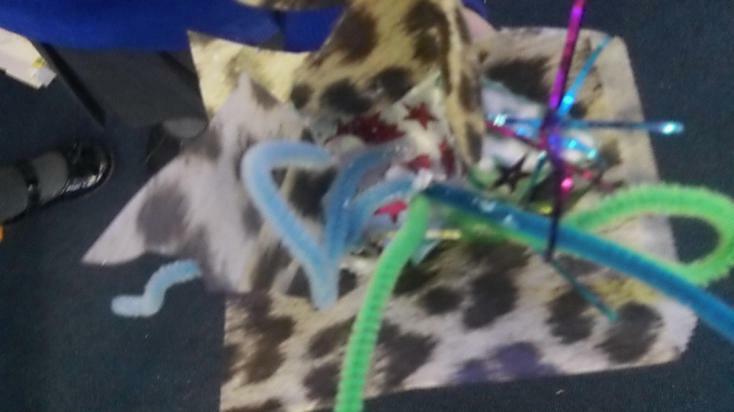 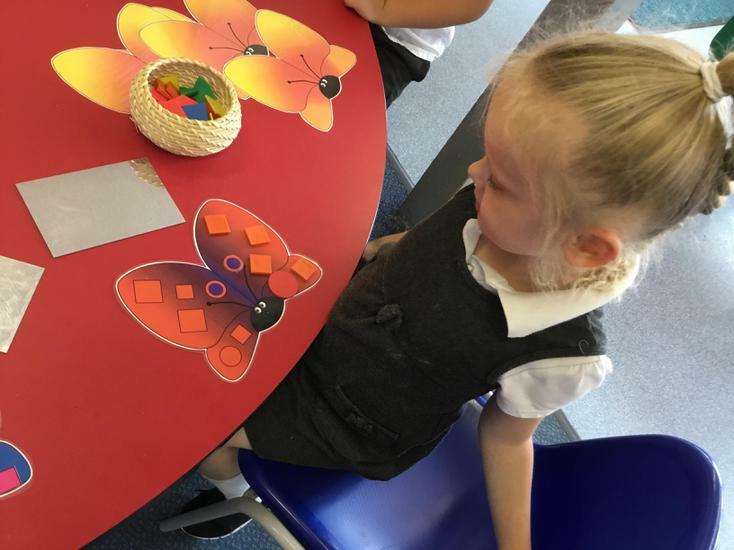 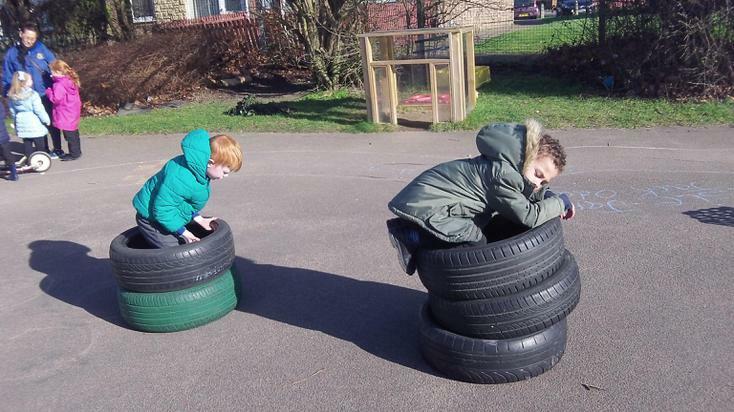 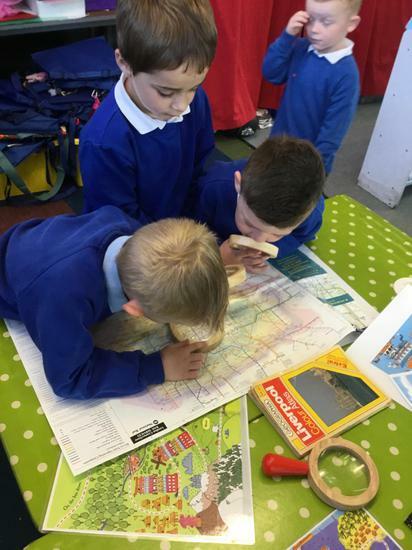 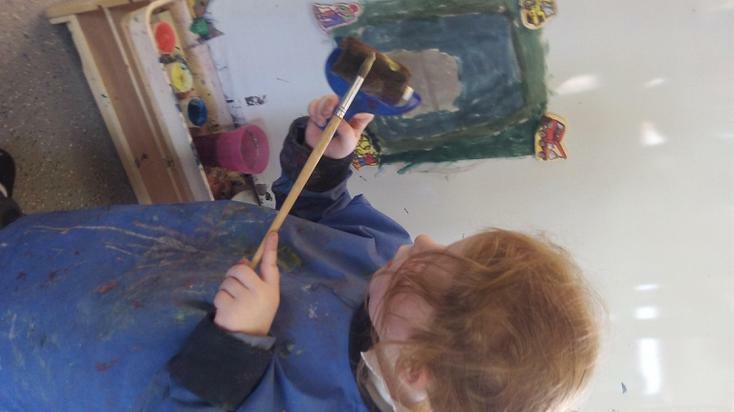 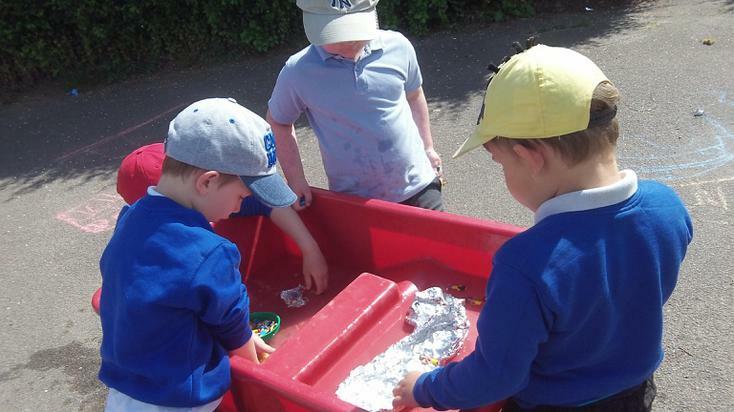 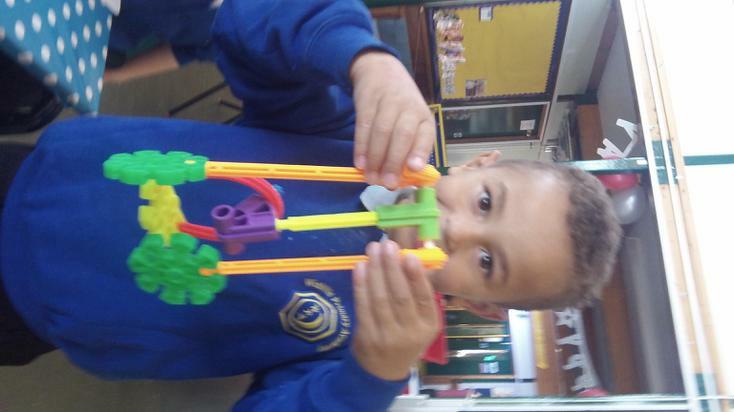 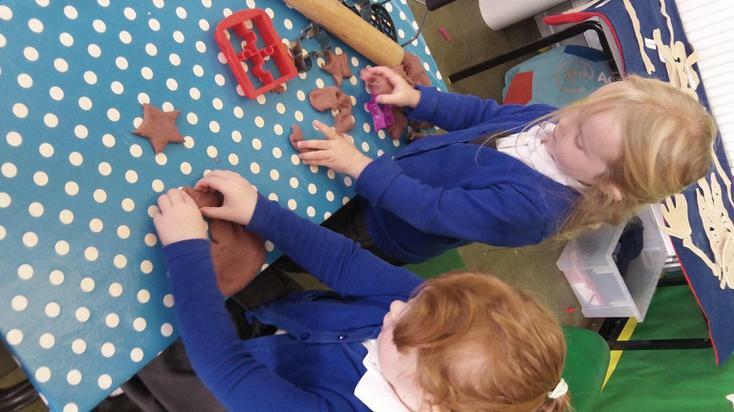 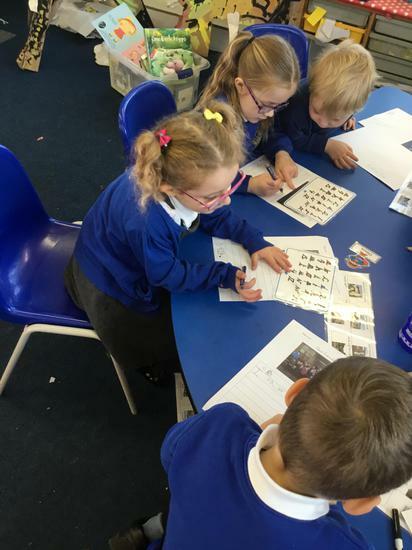 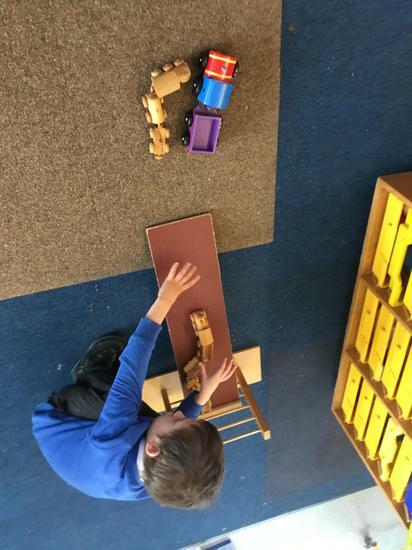 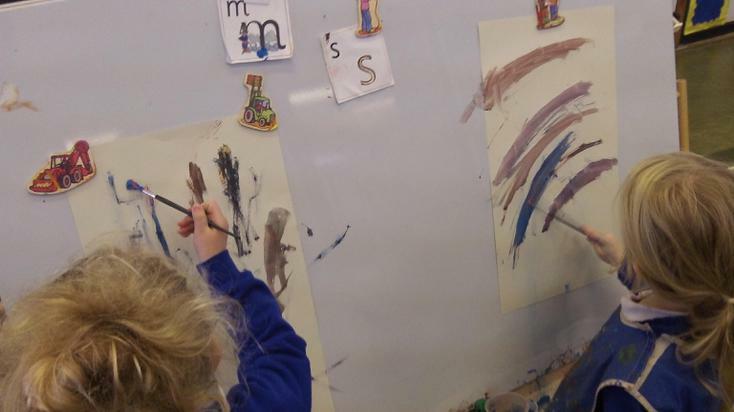 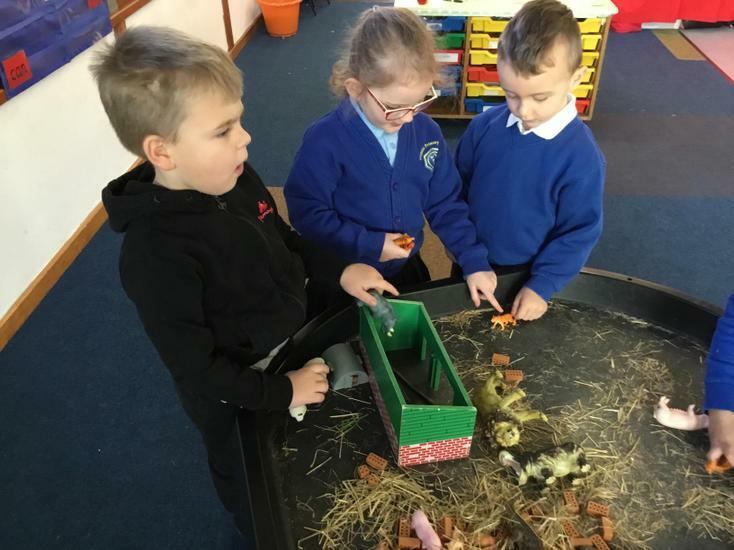 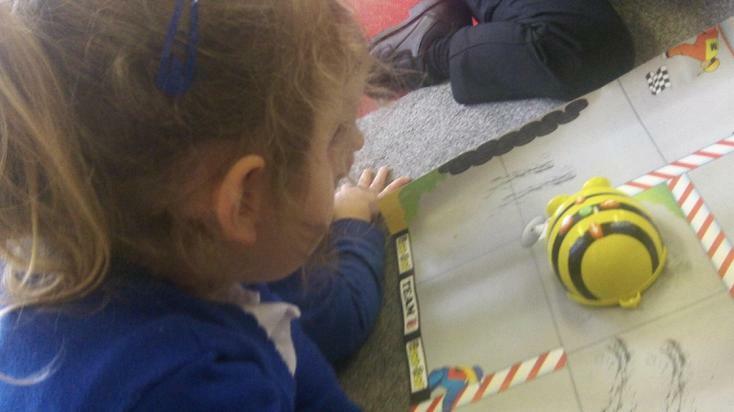 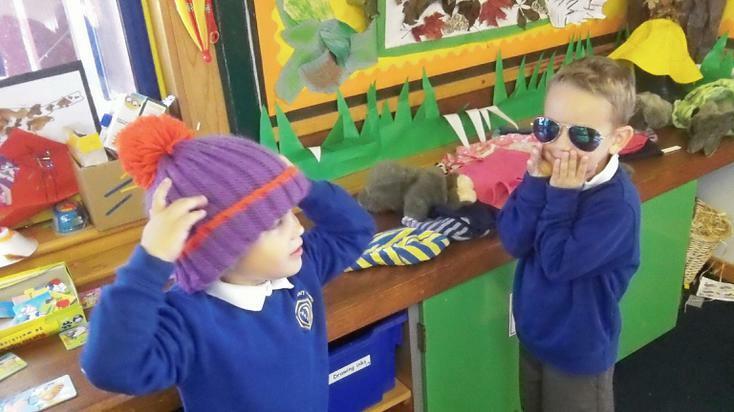 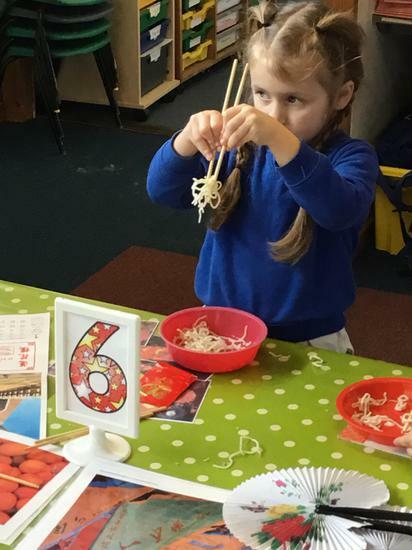 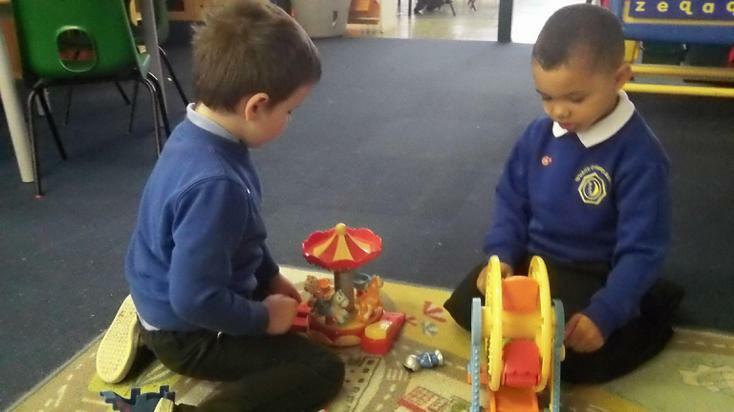 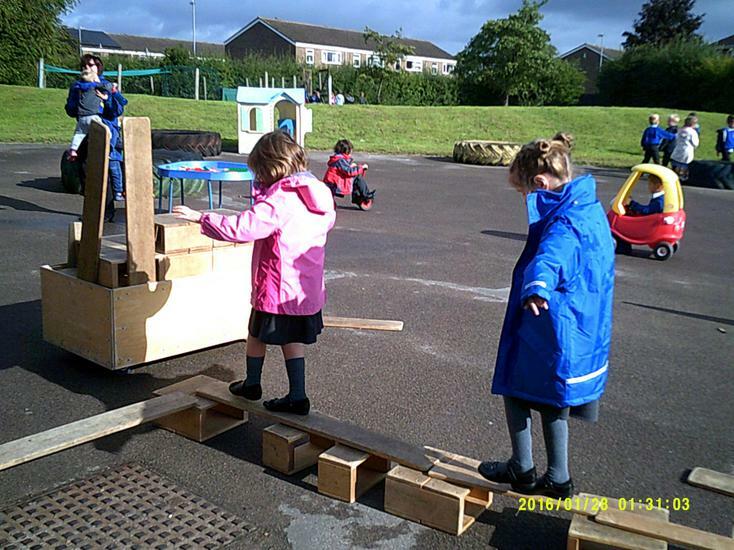 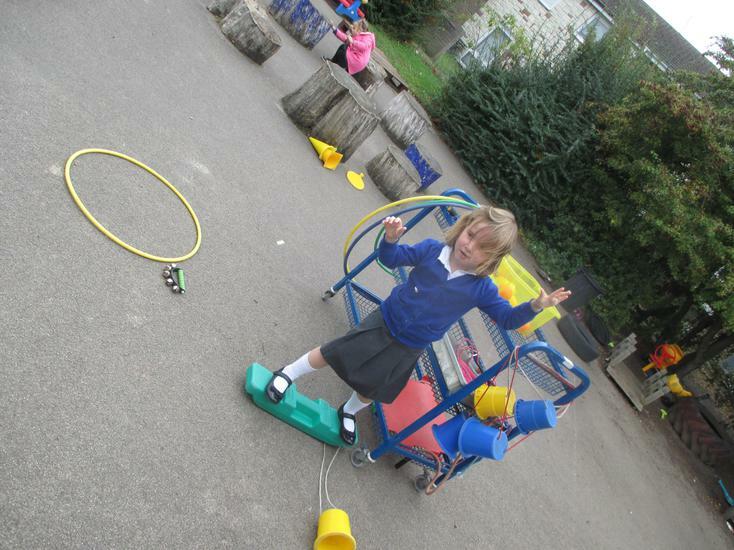 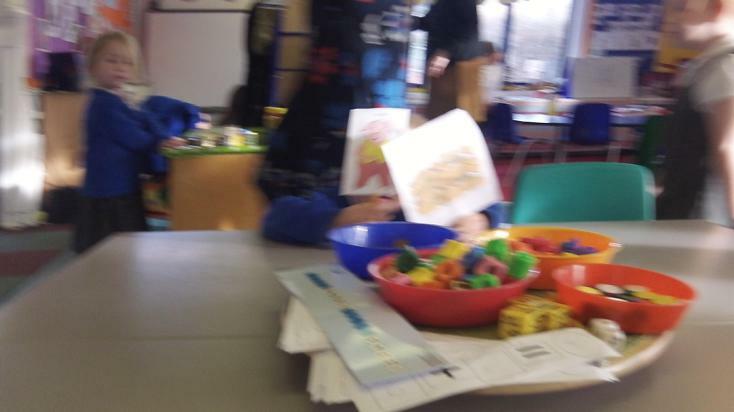 The children are excited to be focusing on journeys of all different types – they will be finding out and imagining going in a plane or rocket, on foot, by train, boat or car - and to lots of different places. 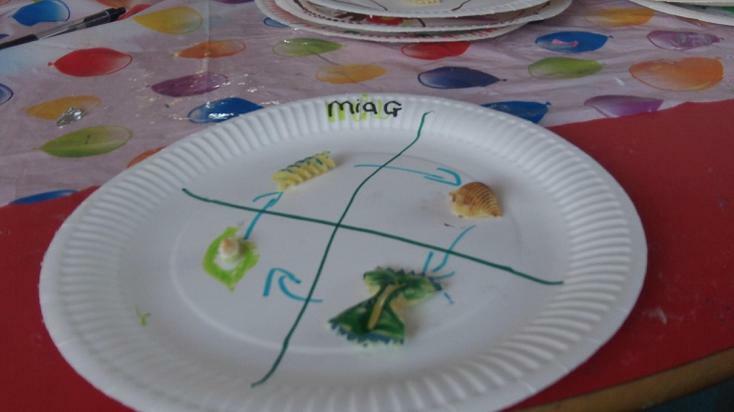 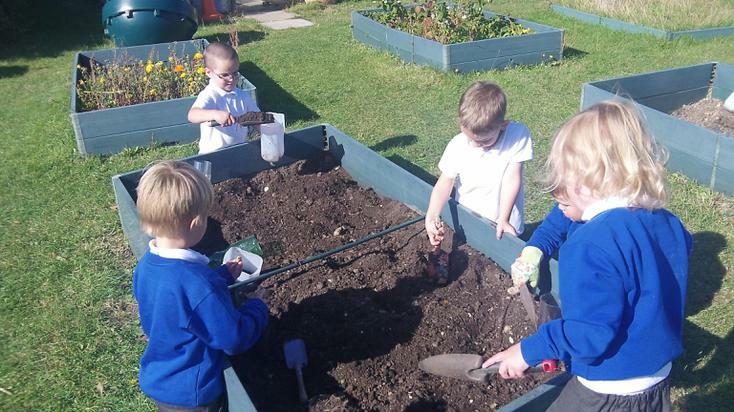 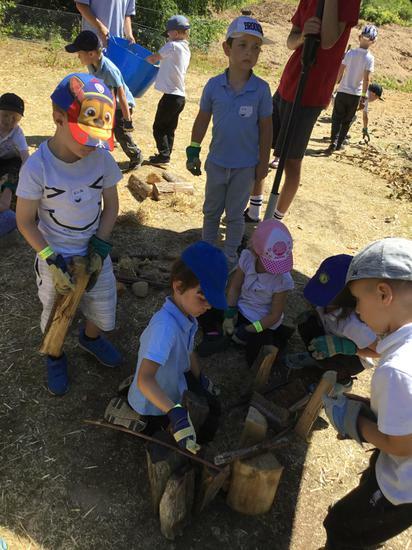 As well as this, we will be enjoying the outside environment as the weather is getting warmer, by digging and planting, bug hunting and bird watching, and looking at and explaining all the differences in the environment as the seasons change; including life cycles by hatching our own tadpoles and butterflies and growing a variety of food and flowers in the garden area. 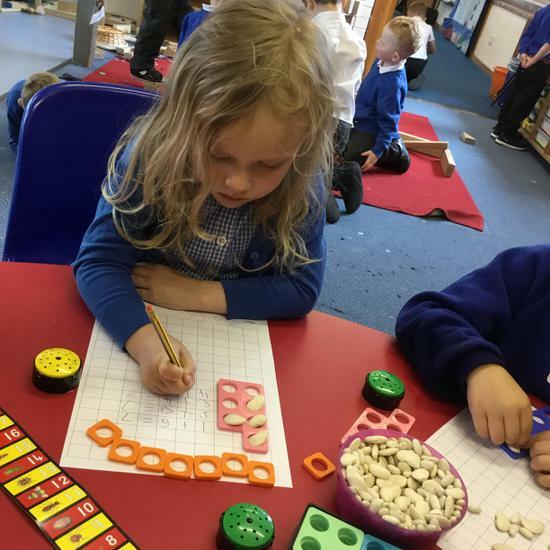 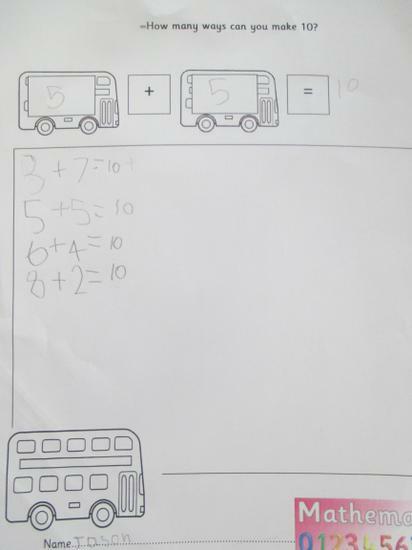 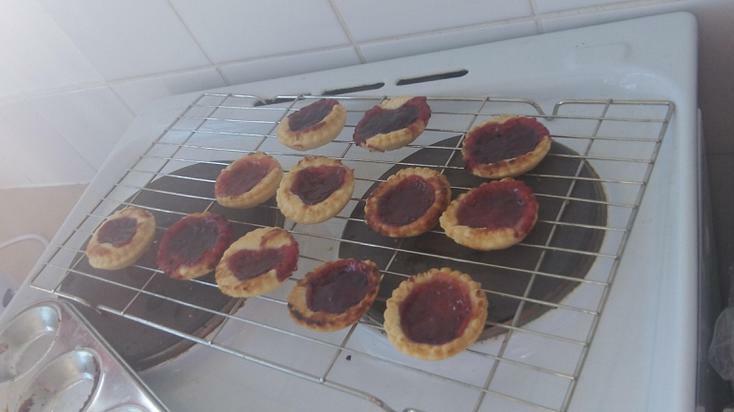 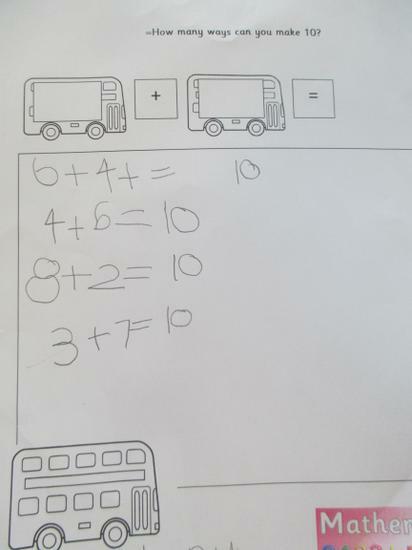 In maths we will be learning about doubling, halving and sharing in practical contexts as well as securing our existing mathematical knowledge of counting, addition, subtraction, shape and using mathematical language. 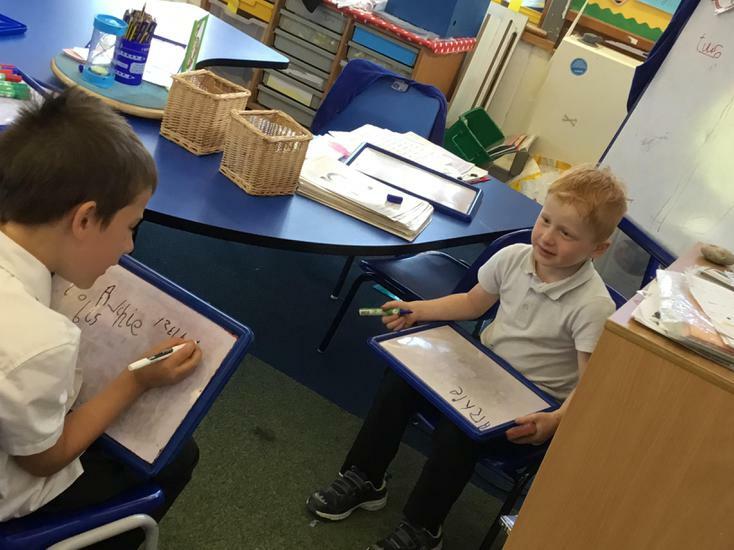 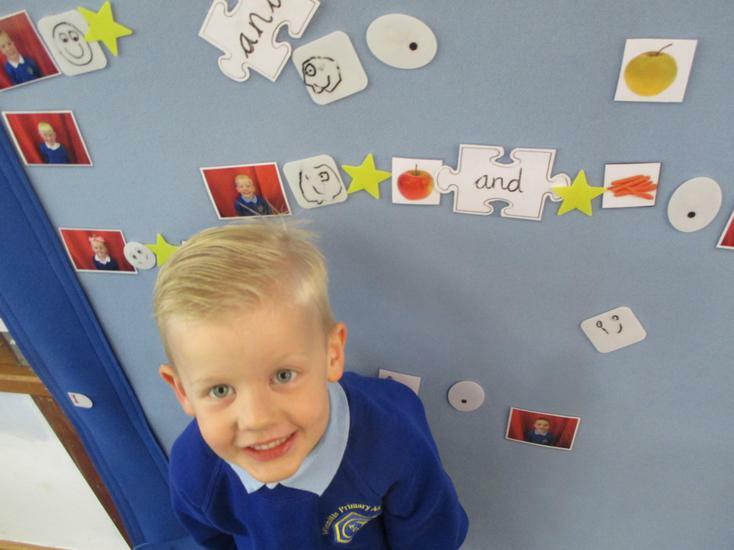 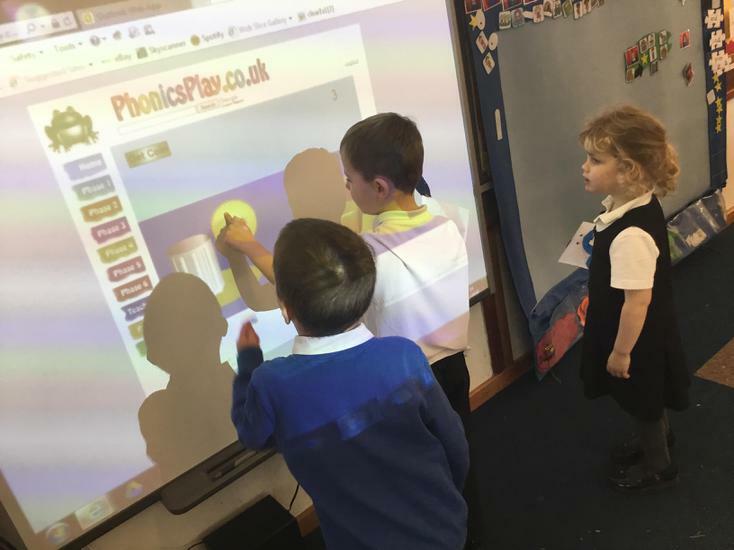 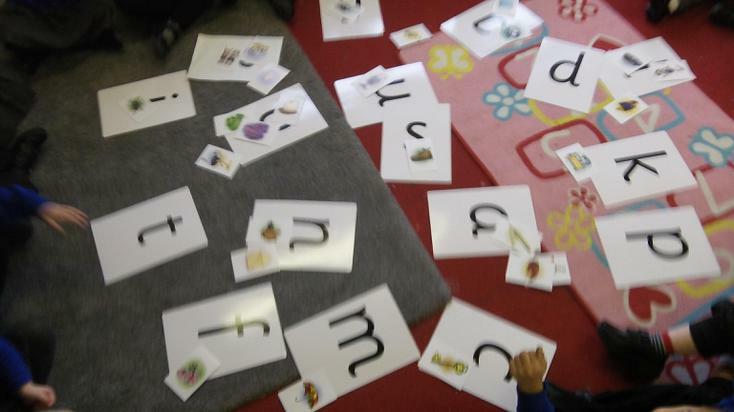 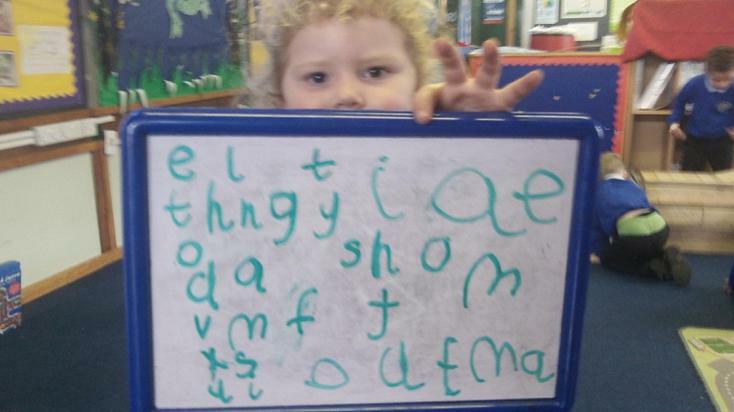 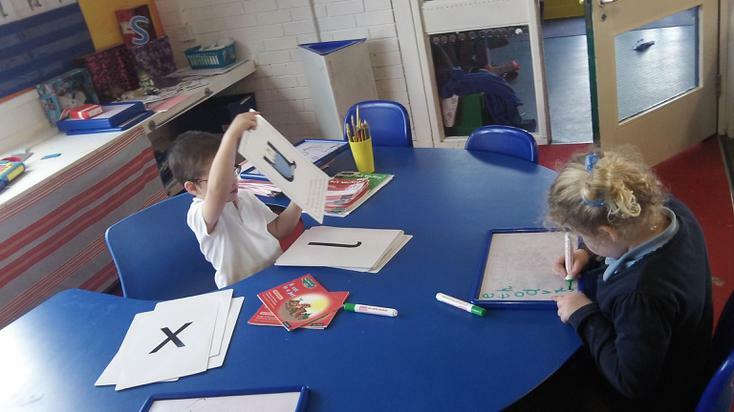 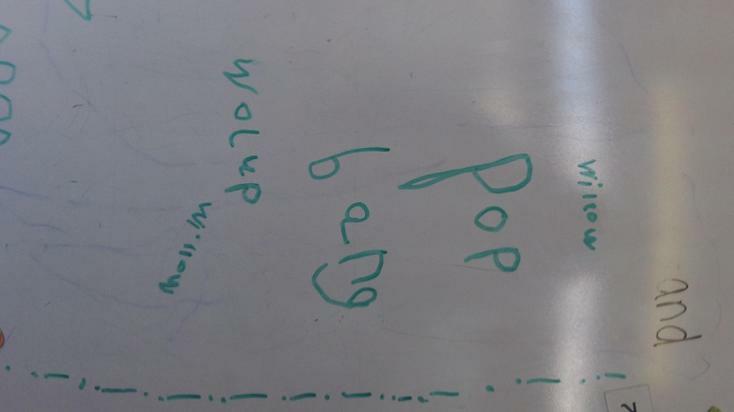 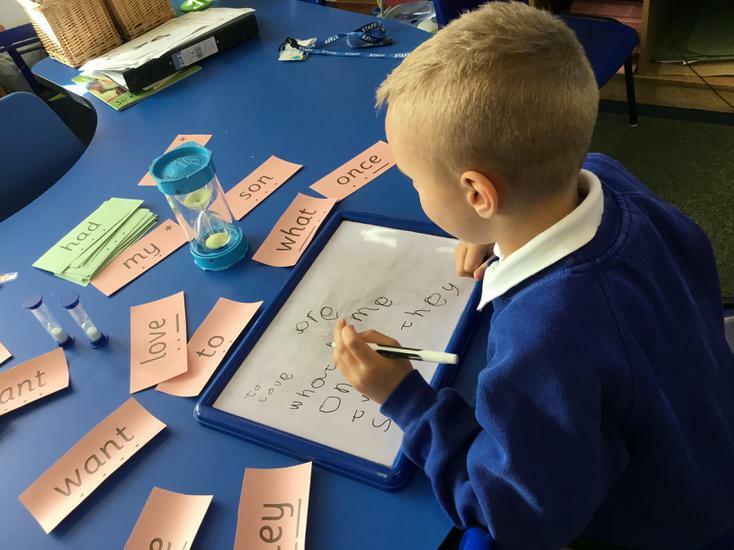 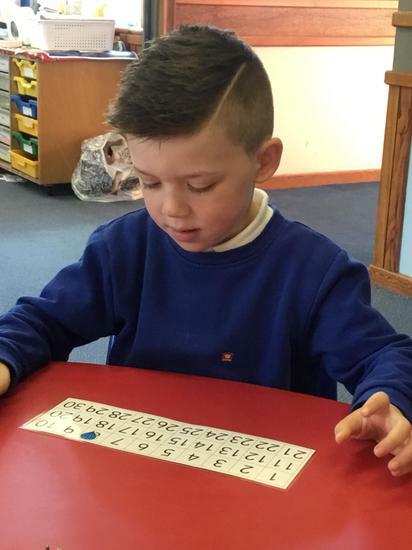 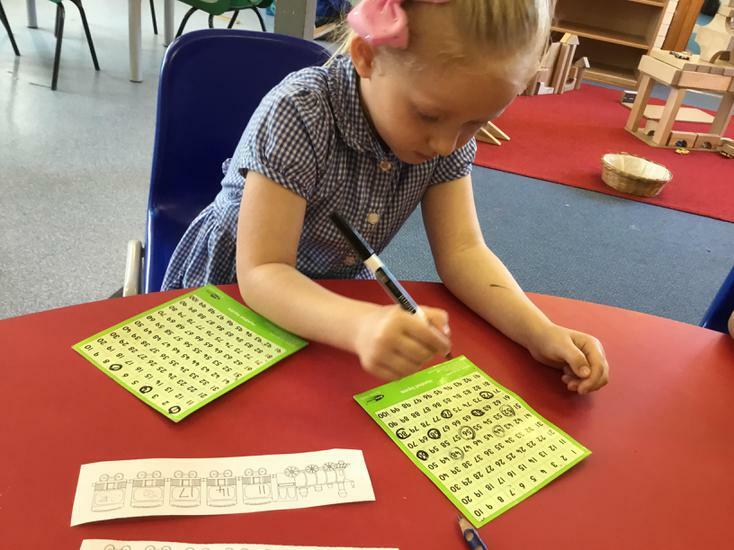 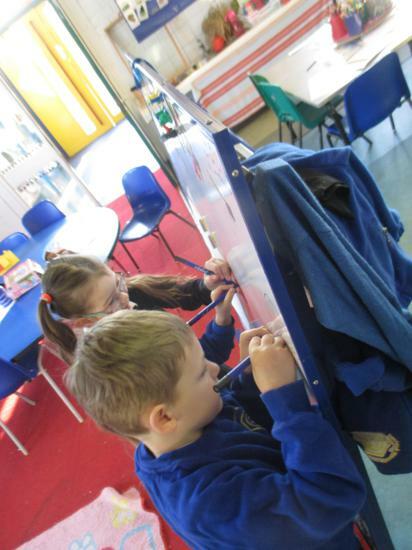 In our phonics lessons we will continue learning new sounds, and practising our segmenting and blending, as well as becoming more confident with our word walls. 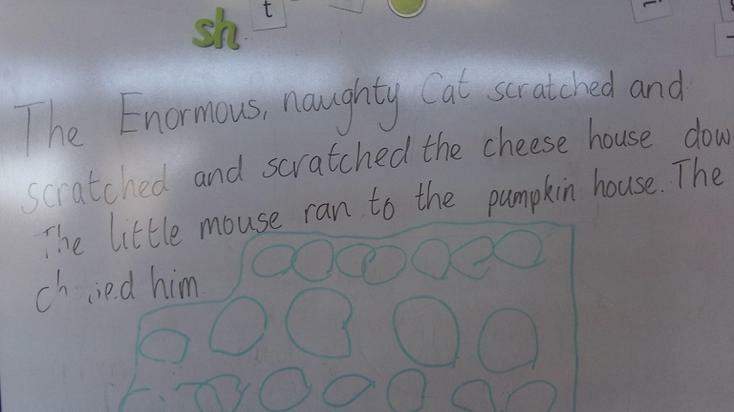 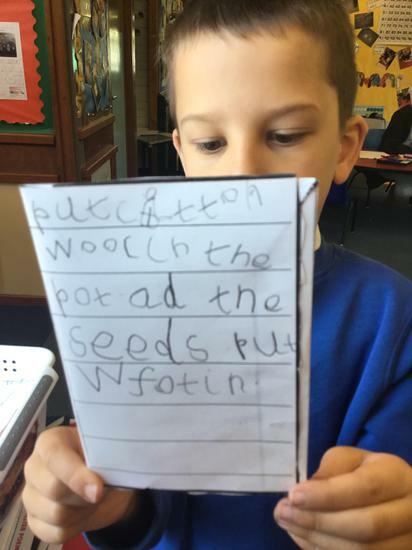 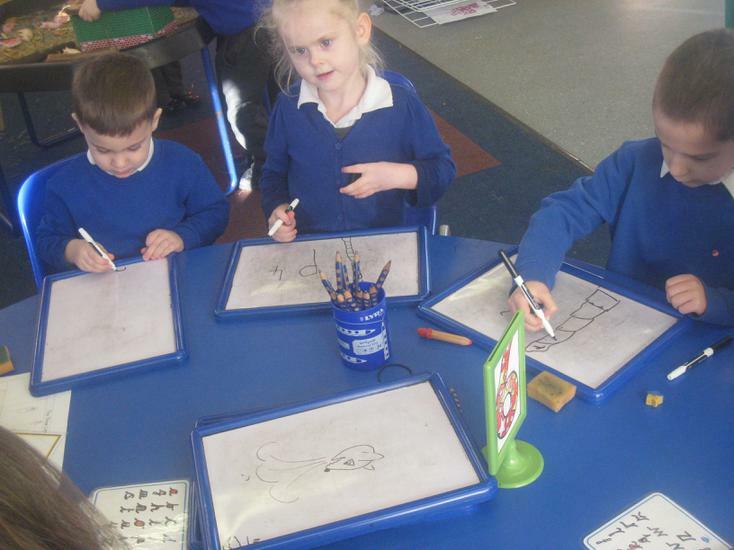 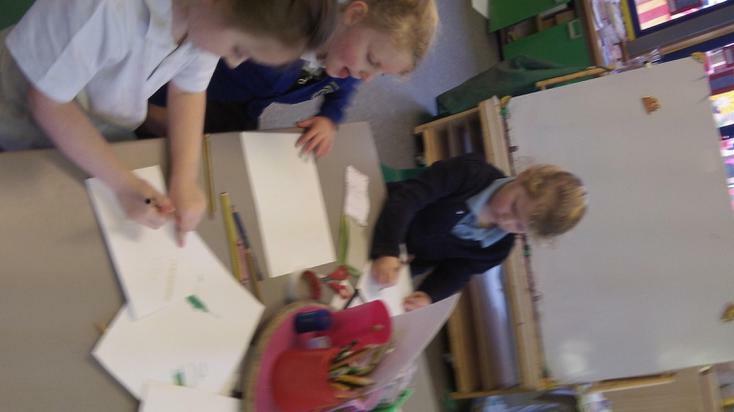 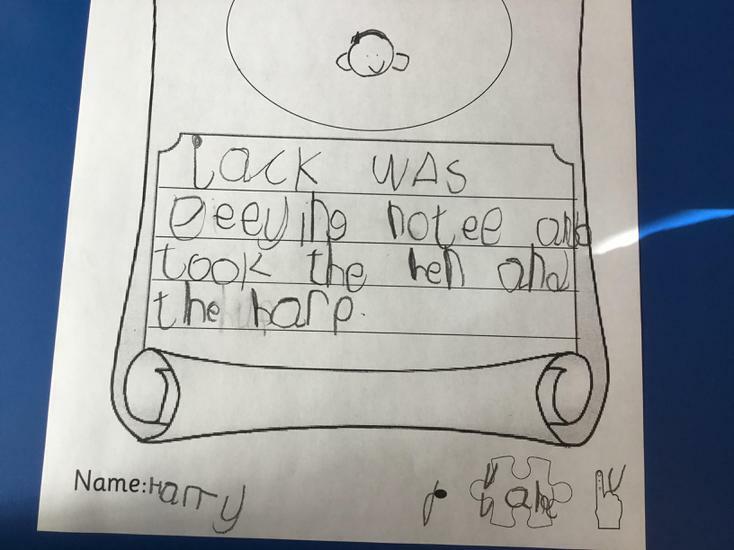 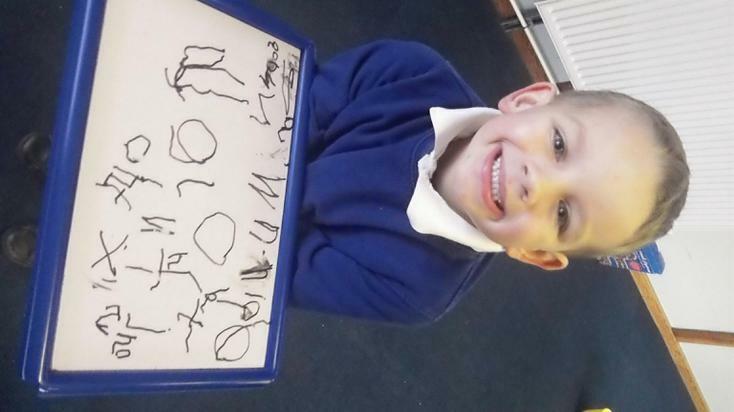 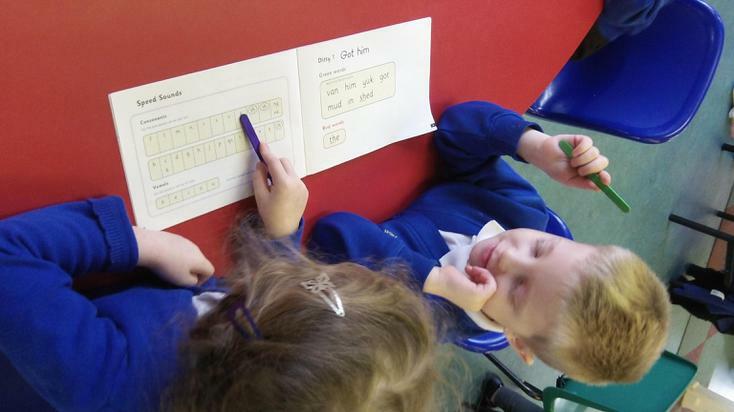 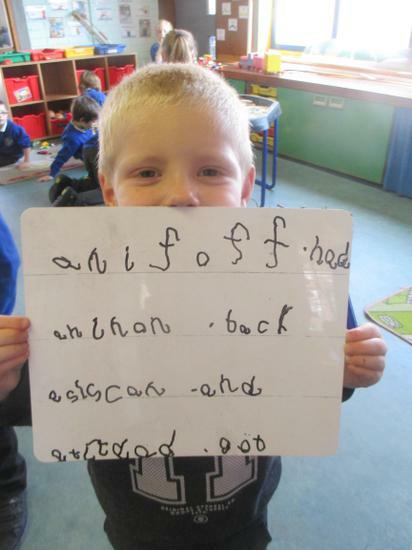 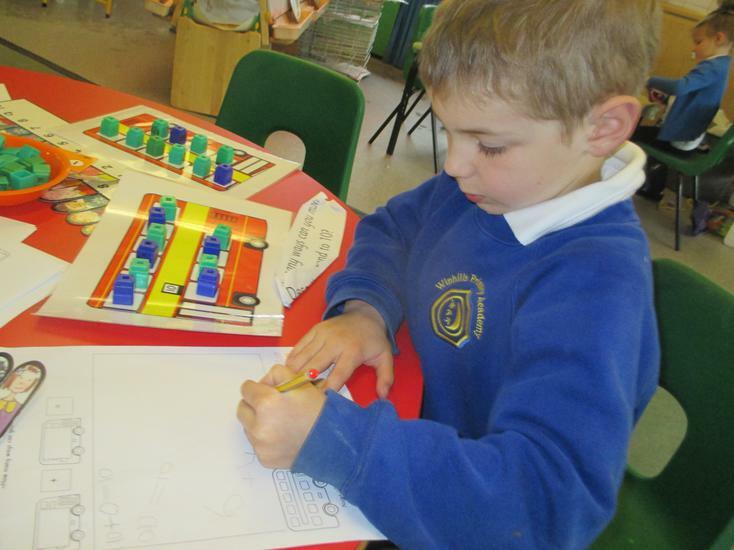 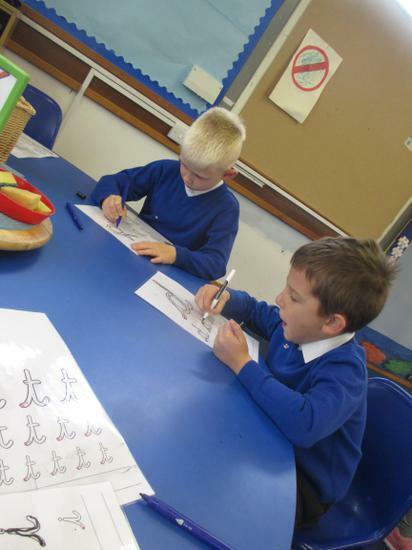 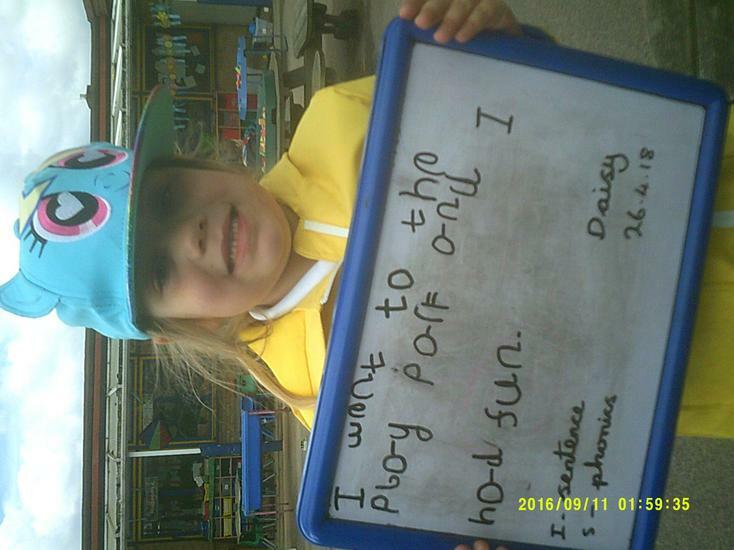 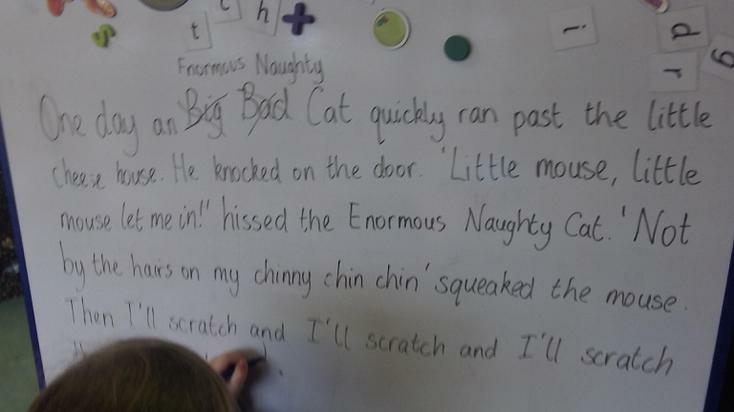 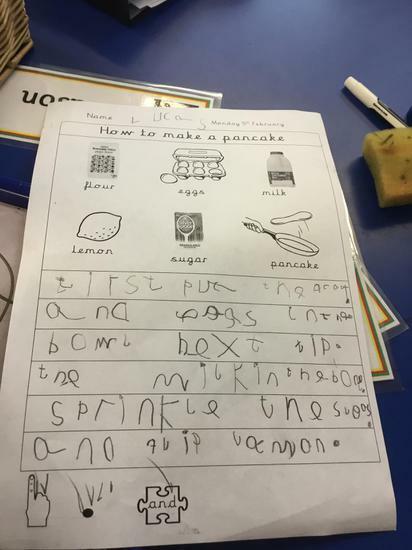 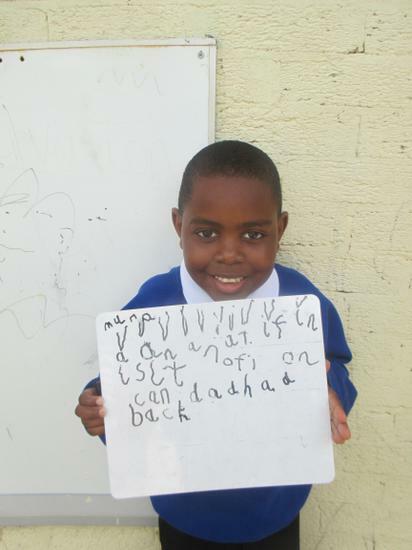 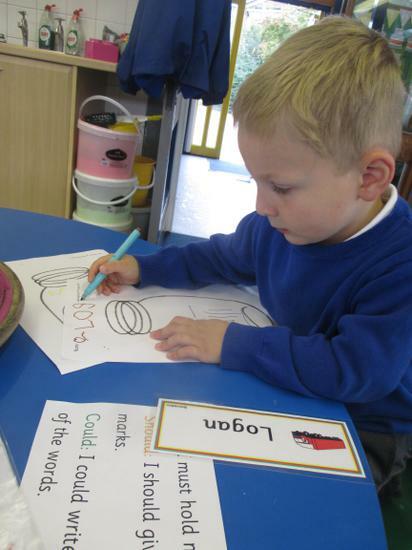 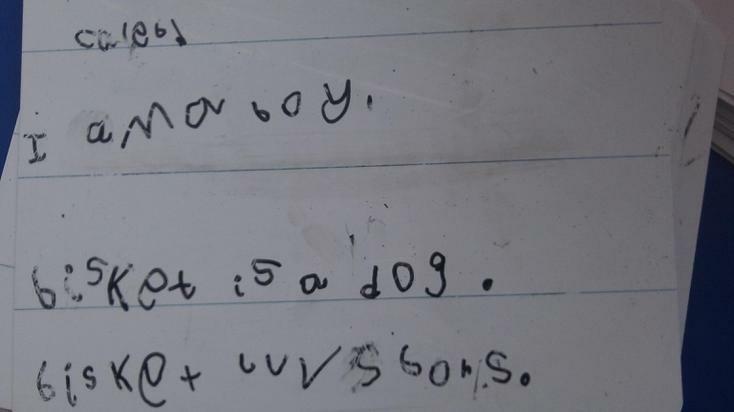 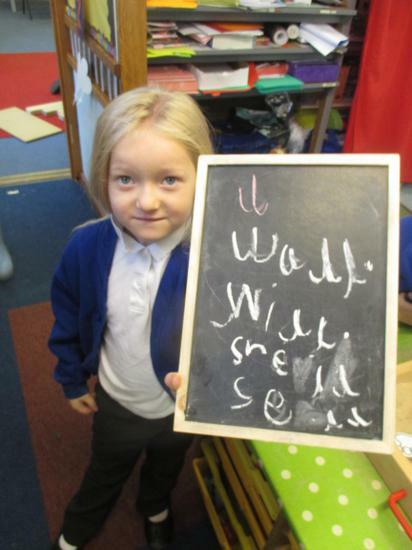 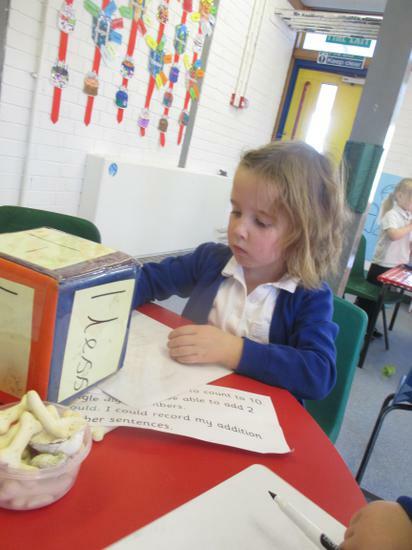 We will develop our writing through increasing confidence and independence, allowing us to write some super sentences. 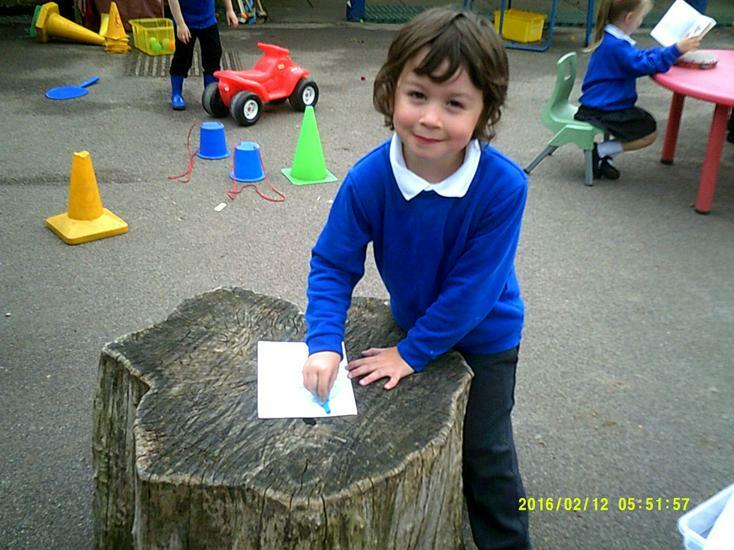 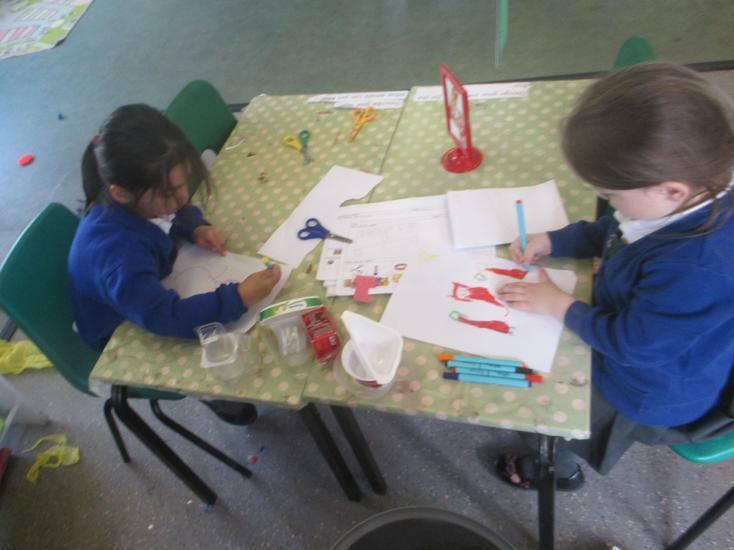 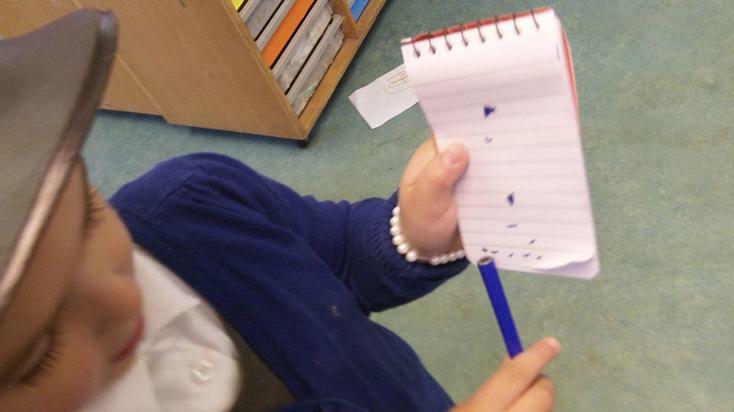 The children will be writing about the things they have learnt, what they have enjoyed doing and inventing their own stories. 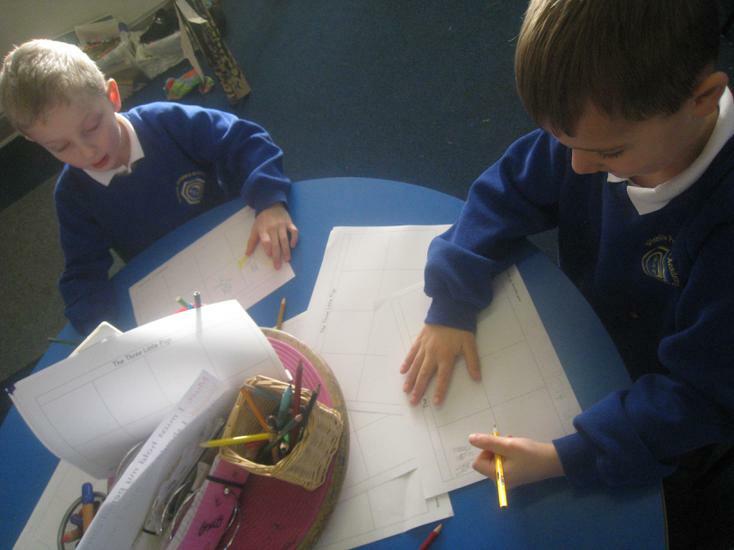 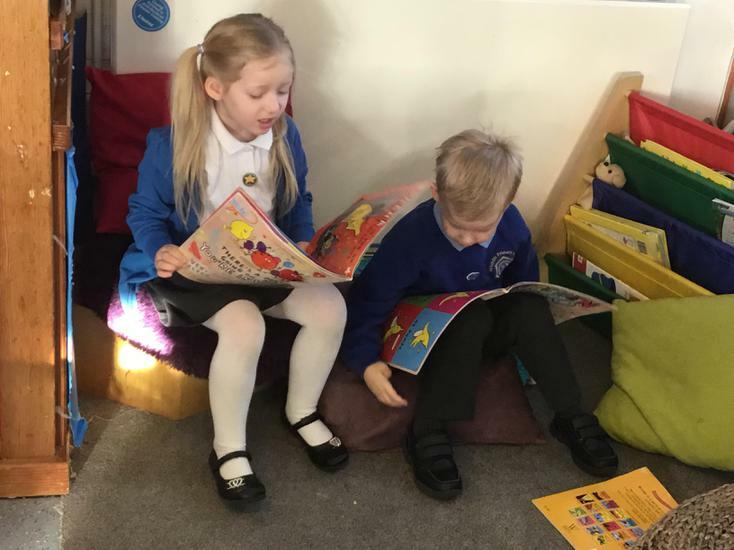 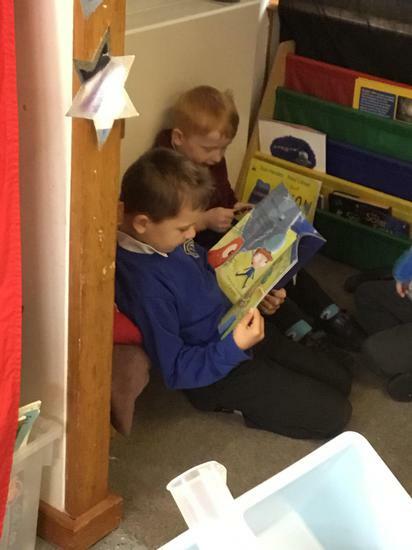 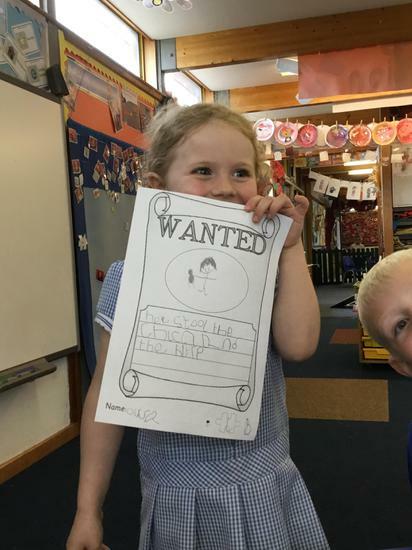 We will also continue our shared writing through exploring different books, creating story maps, writing about them, acting them out and creating our own versions. 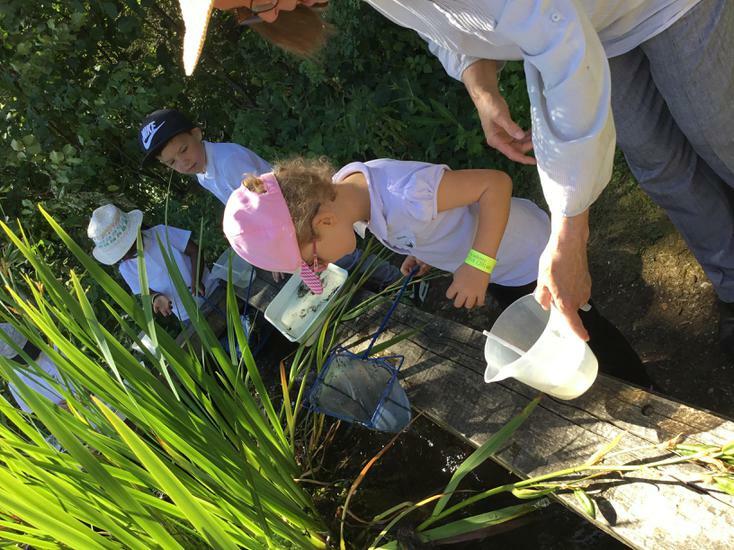 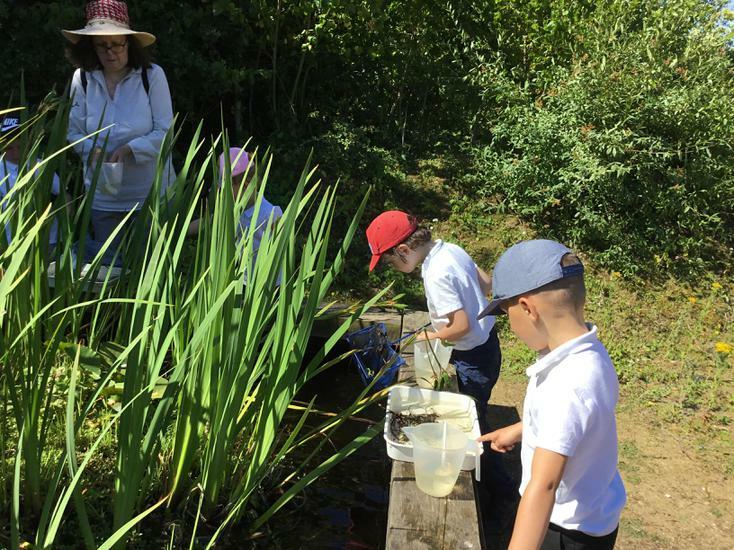 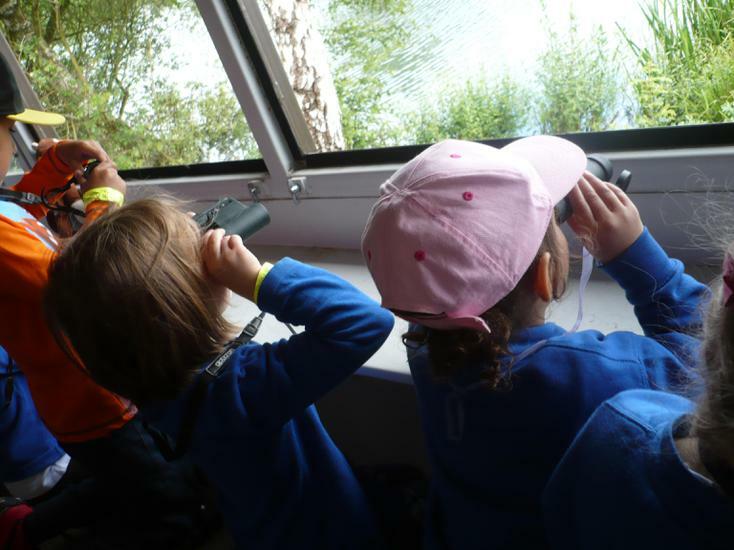 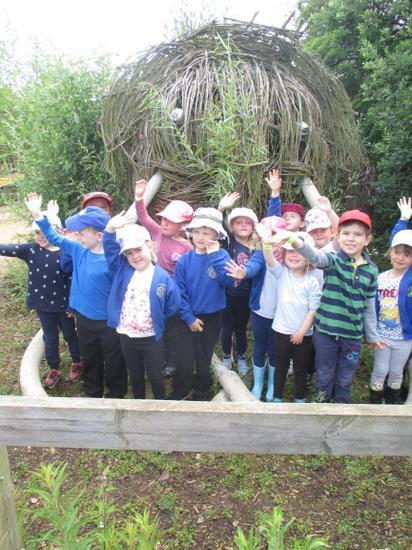 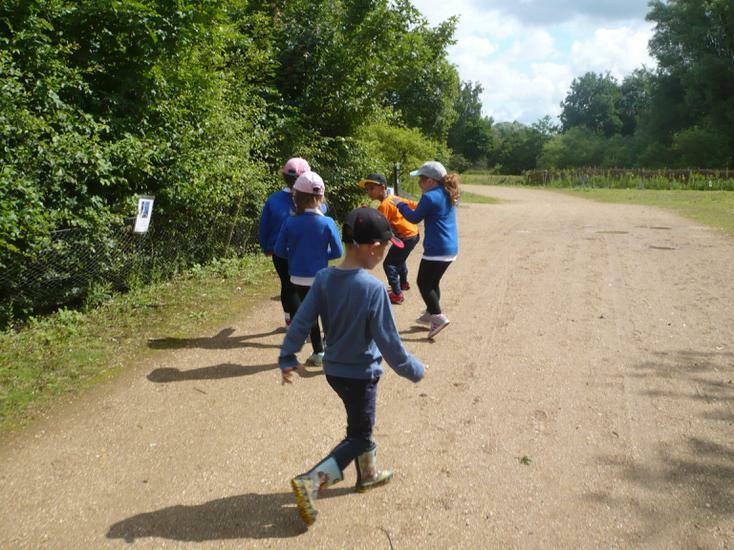 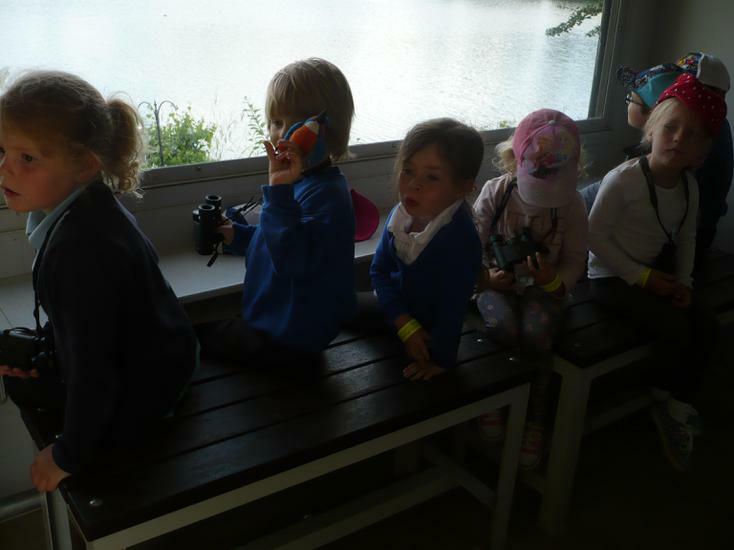 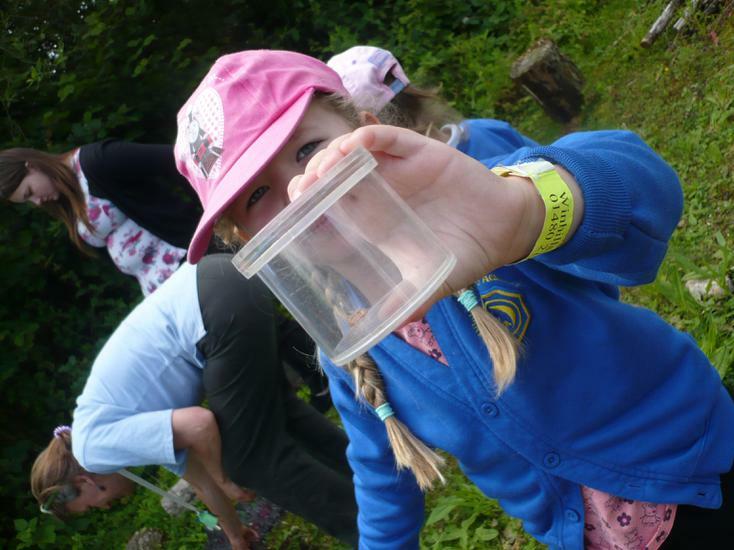 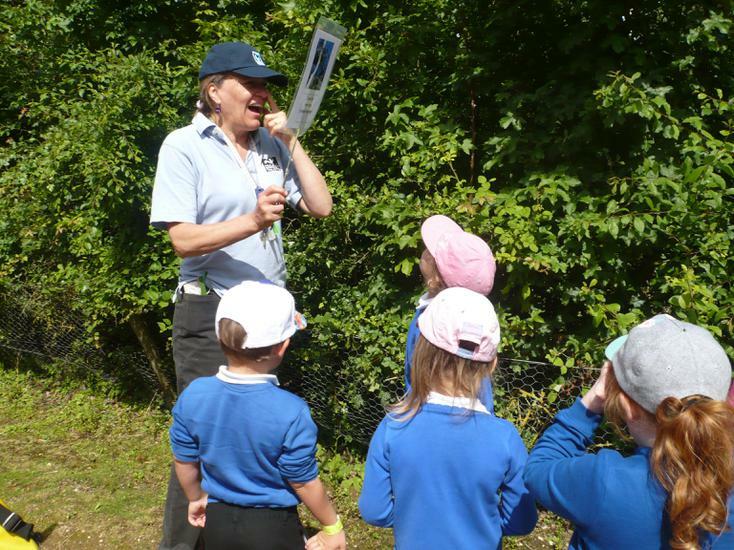 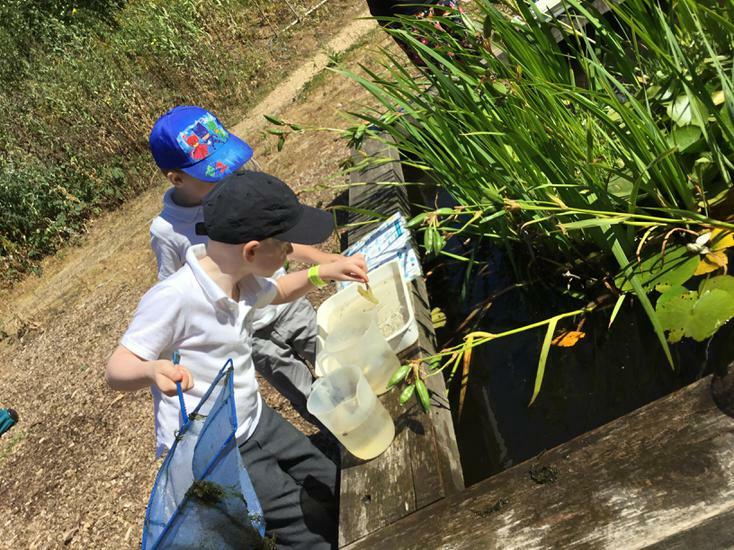 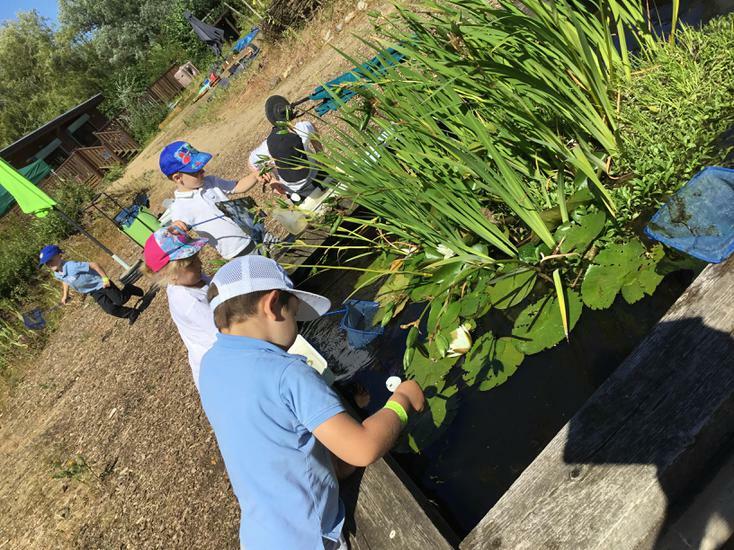 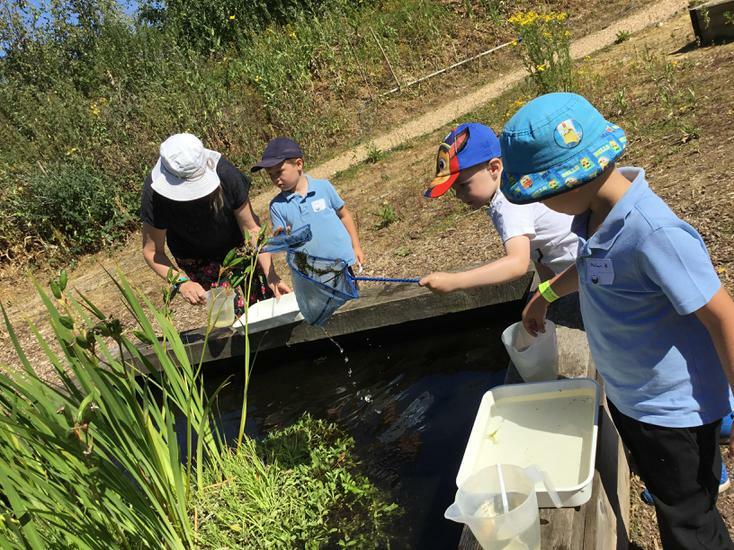 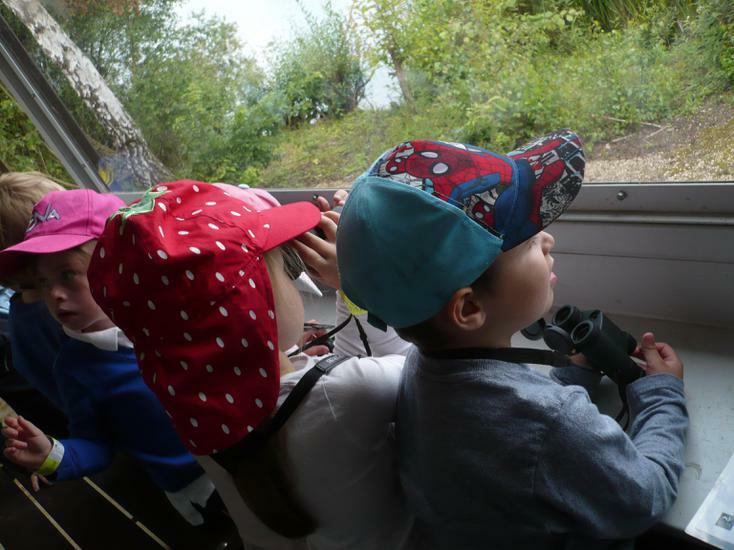 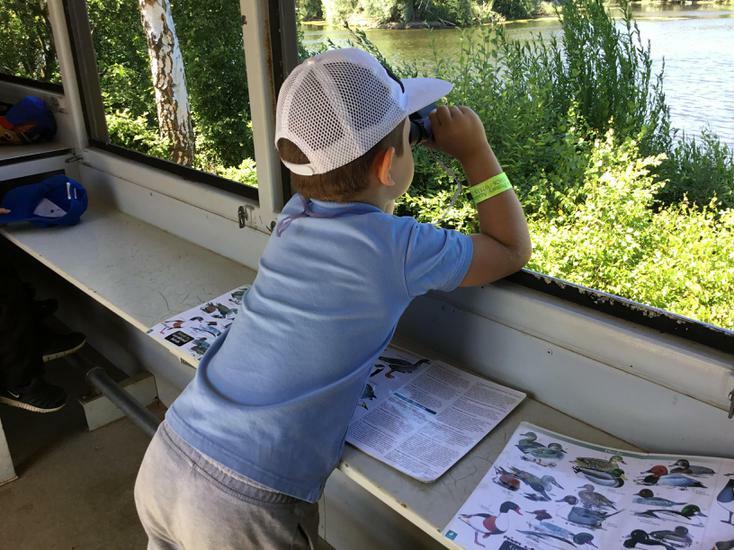 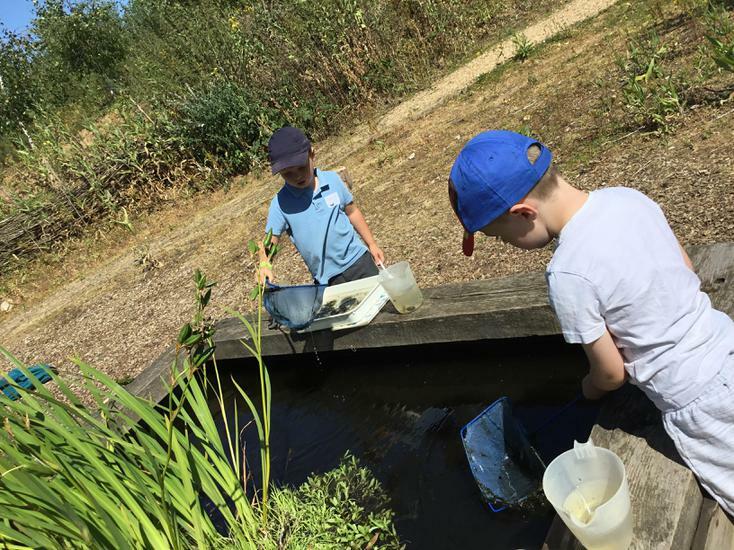 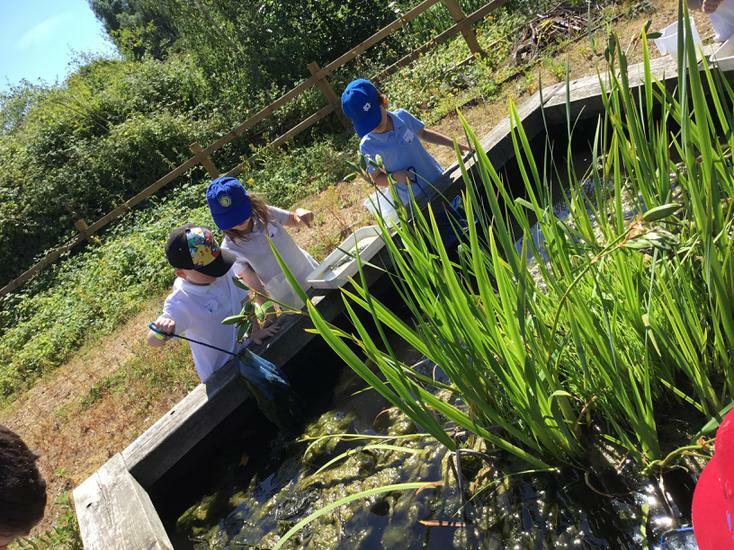 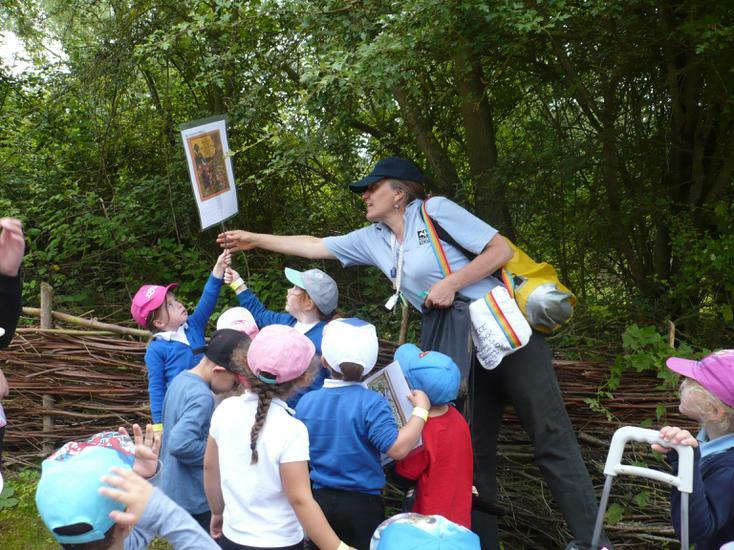 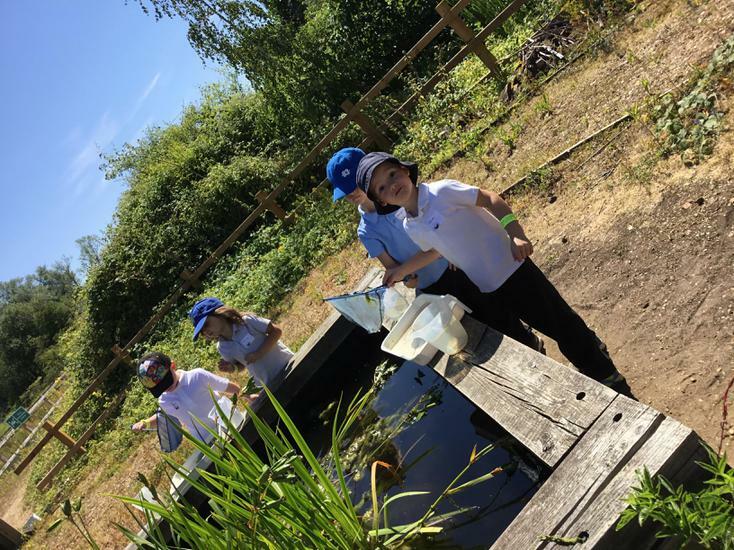 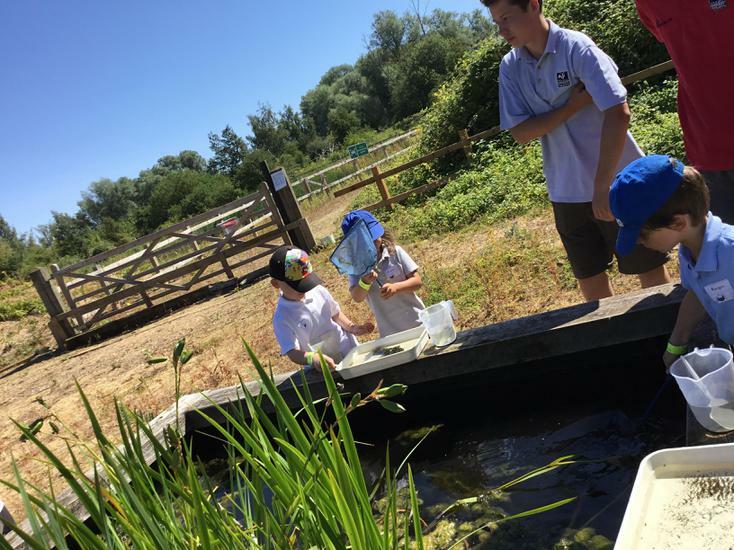 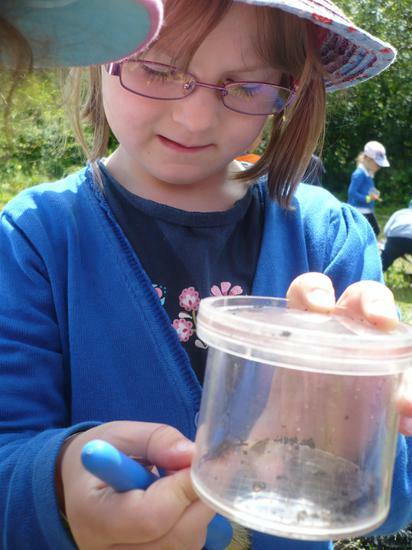 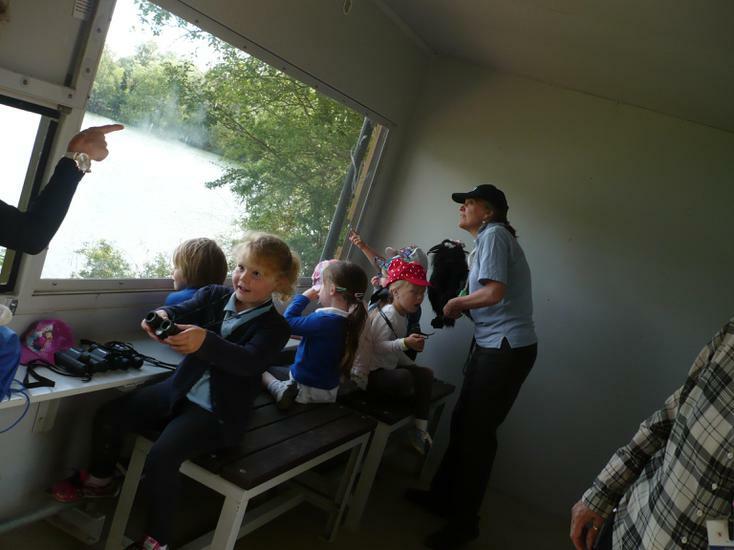 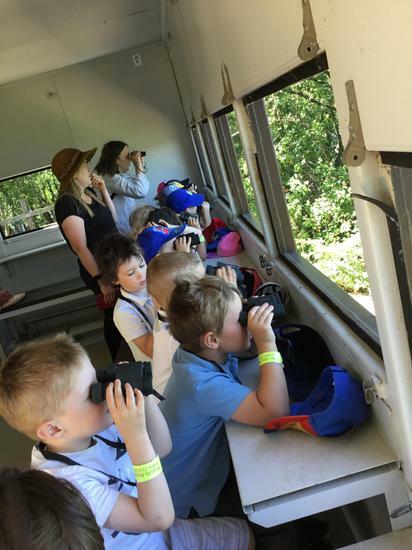 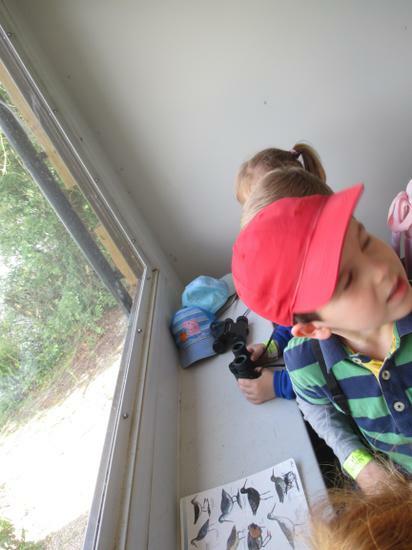 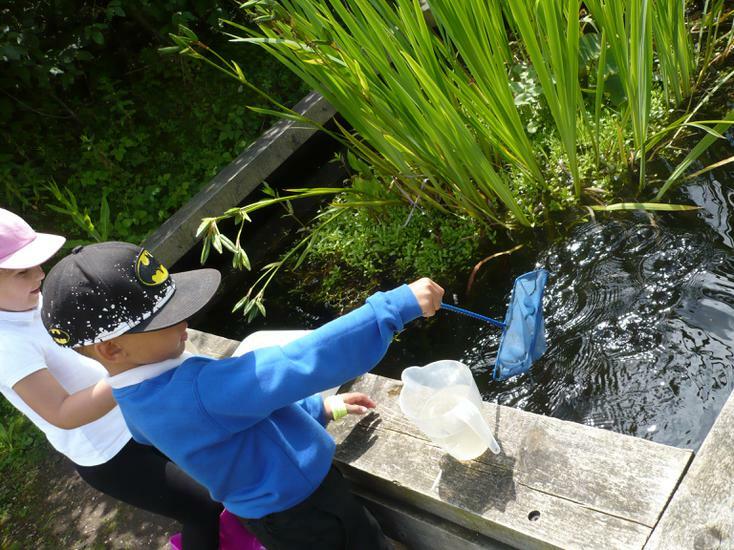 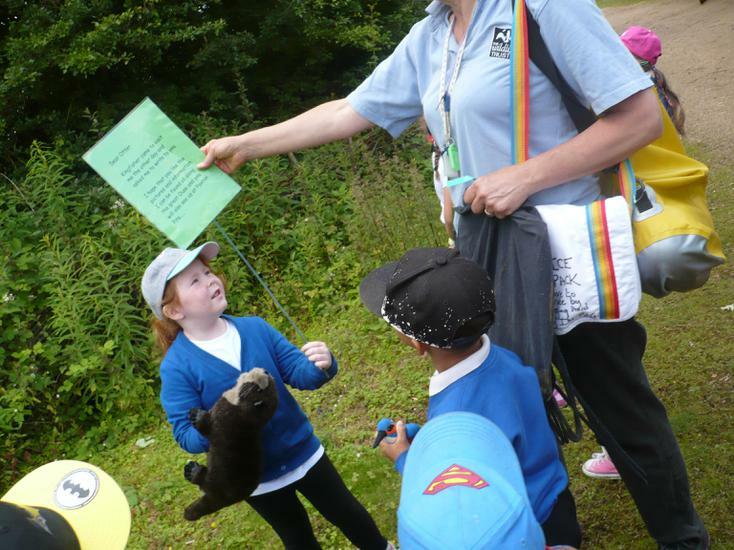 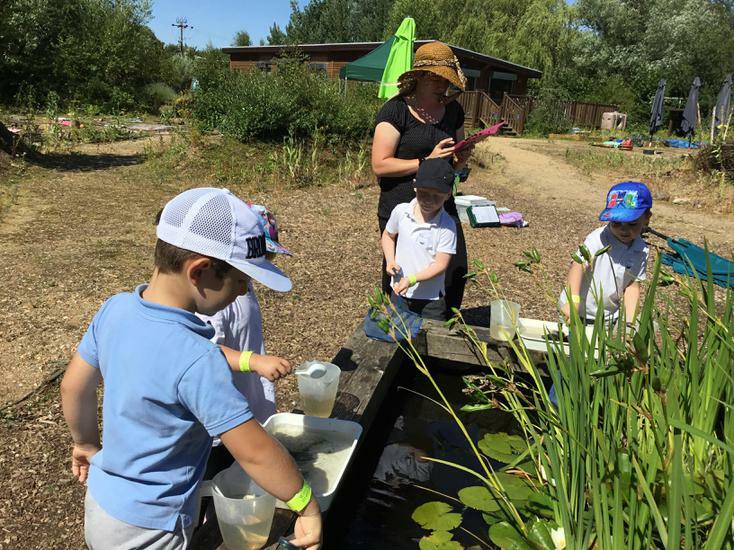 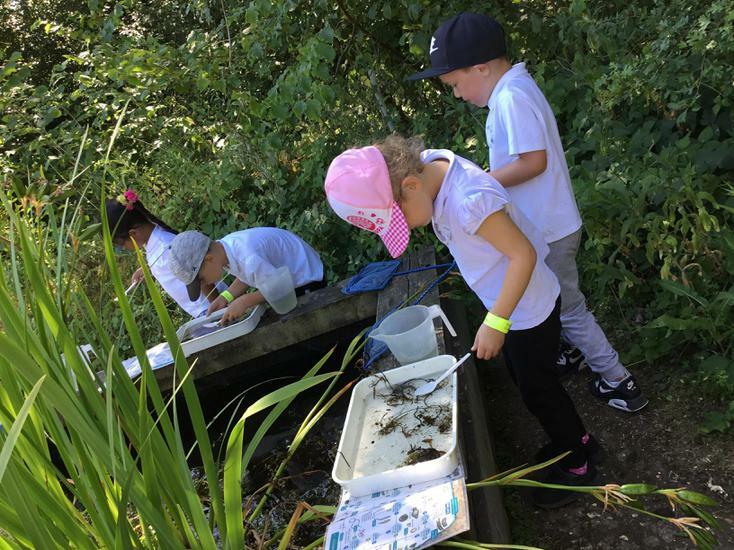 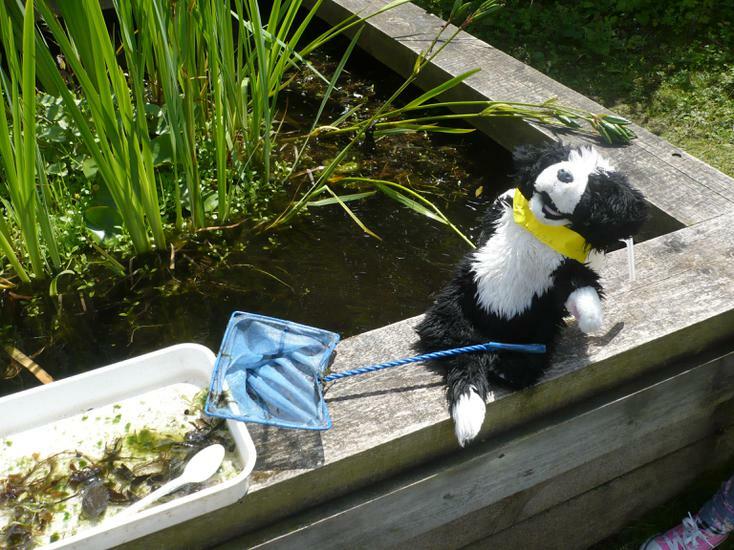 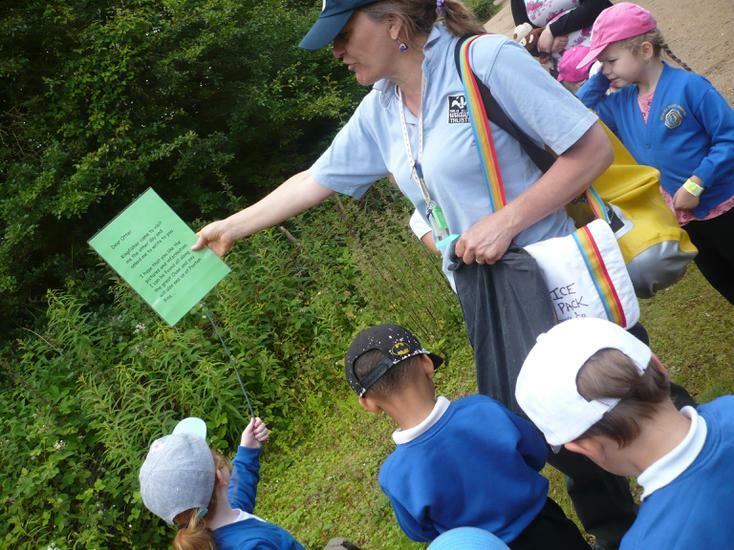 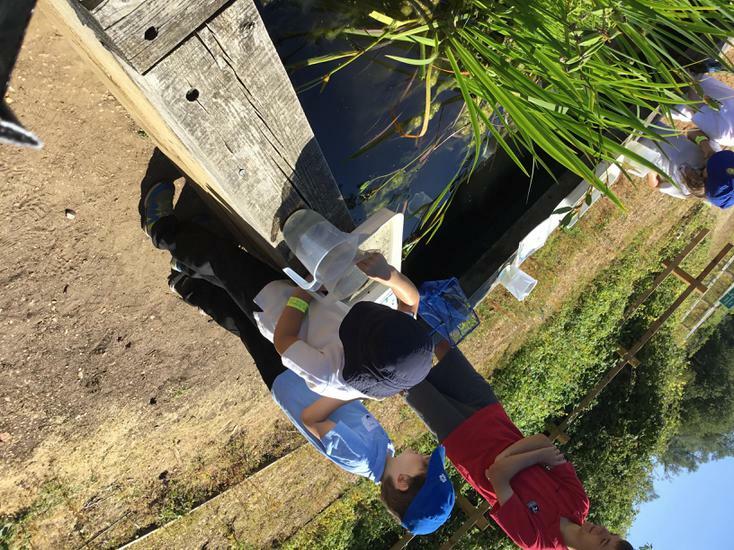 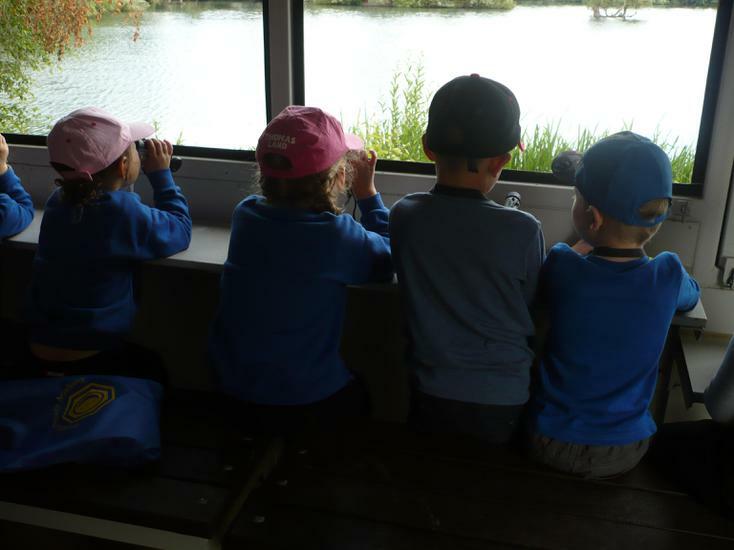 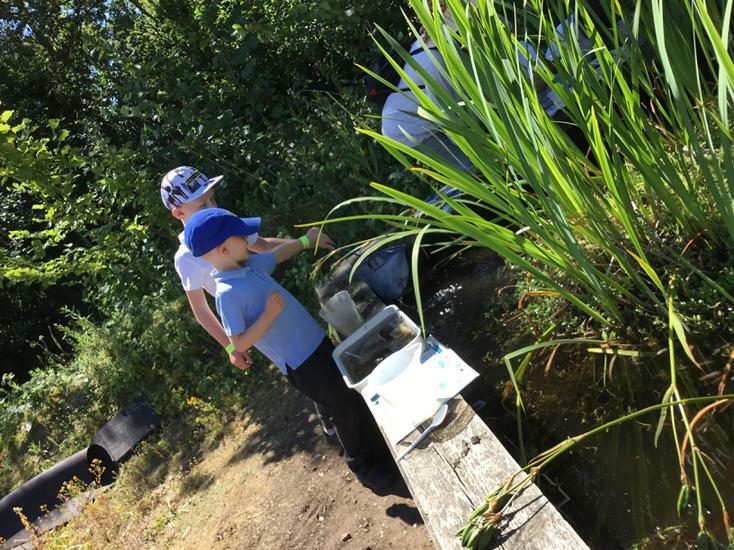 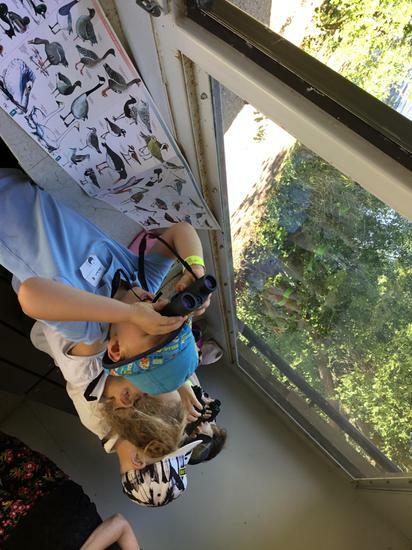 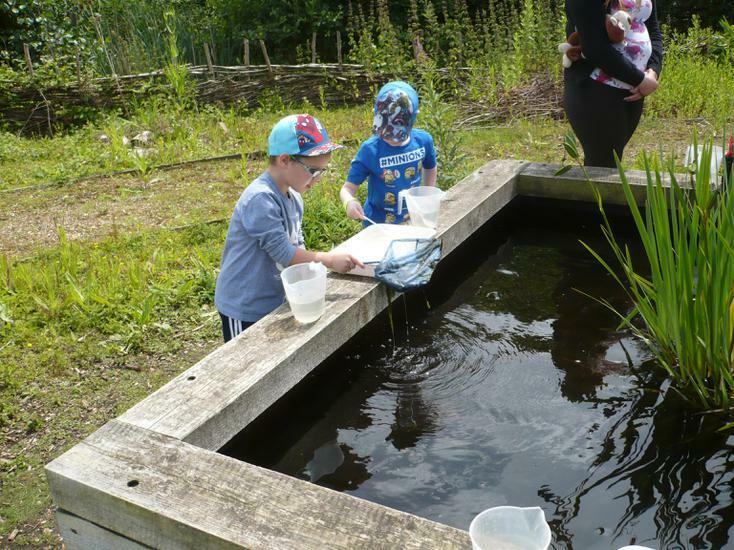 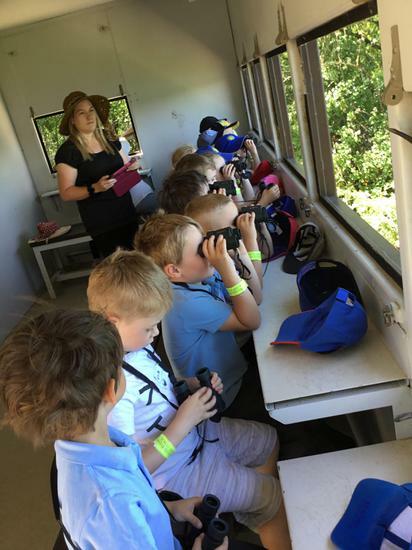 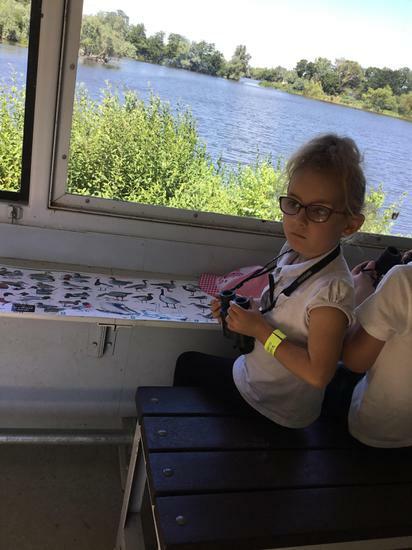 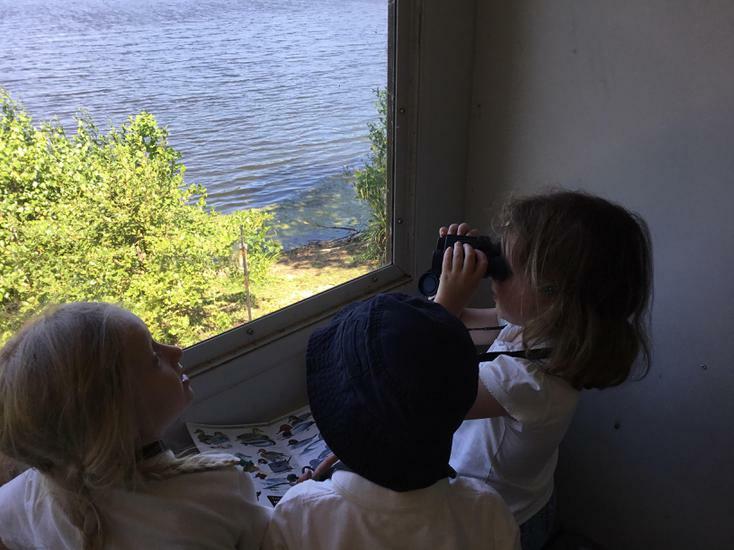 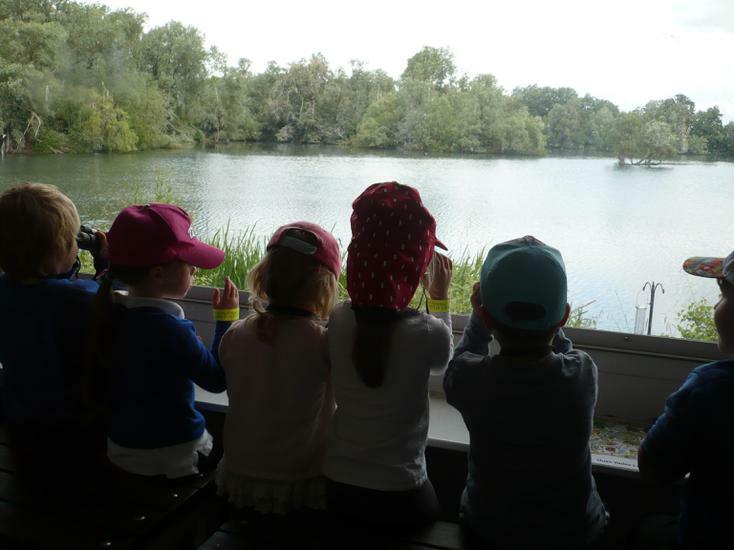 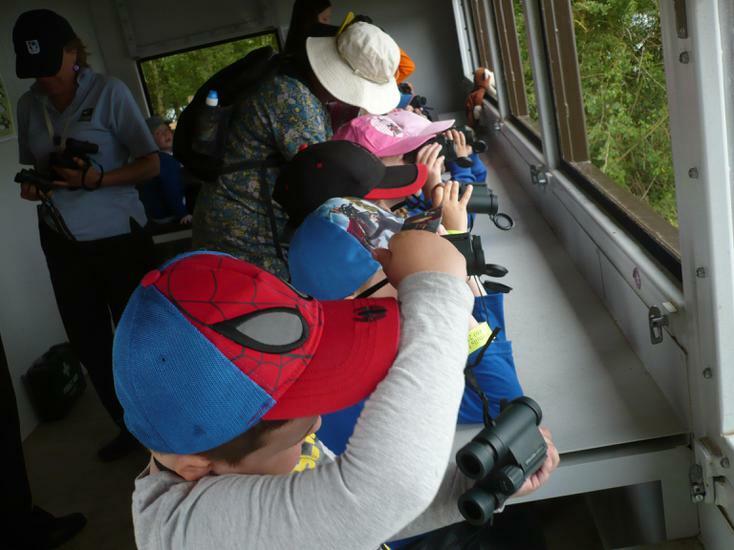 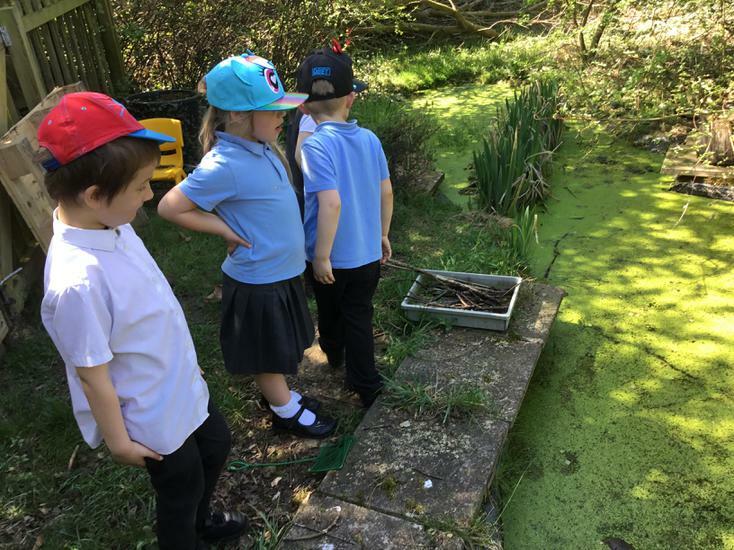 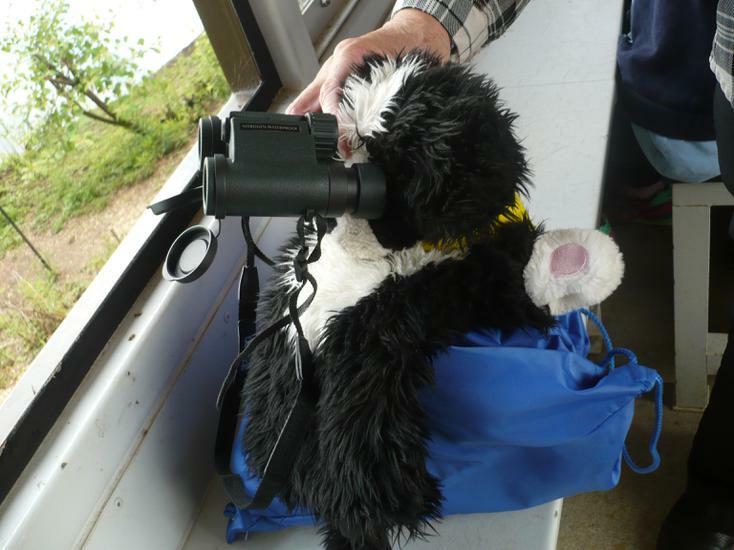 We will finish off our term with an exciting trip to Paxton Pits where we will be able to use our skills of observing and finding out about the environment and living things through bird watching, bug hunting and pond dipping. 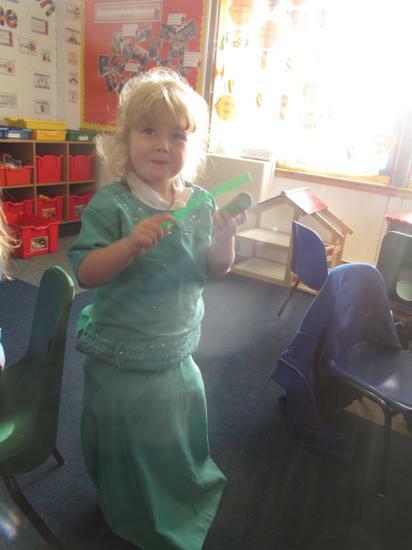 Welcome to Topaz class. 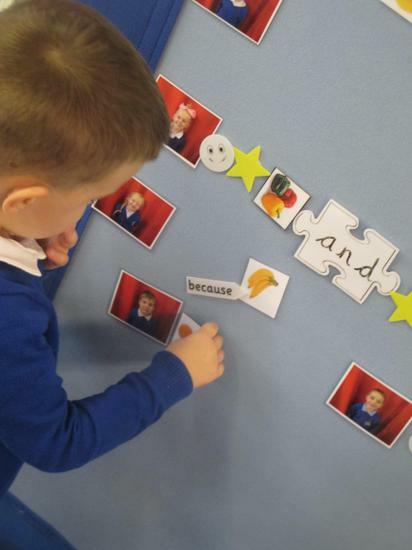 This term our theme is 'ourselves'. 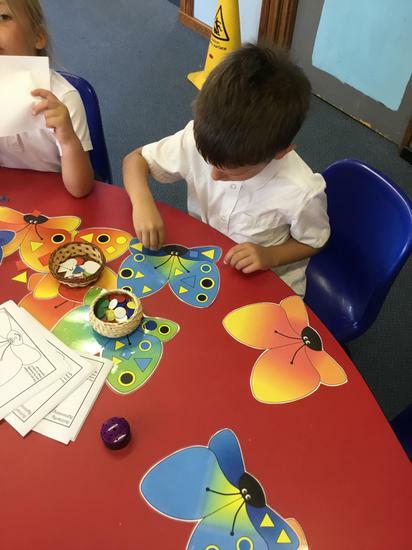 We will be learning all about our new friends, talking about our families and things that are special to us as well as how to keep ourselves healthy and strong. 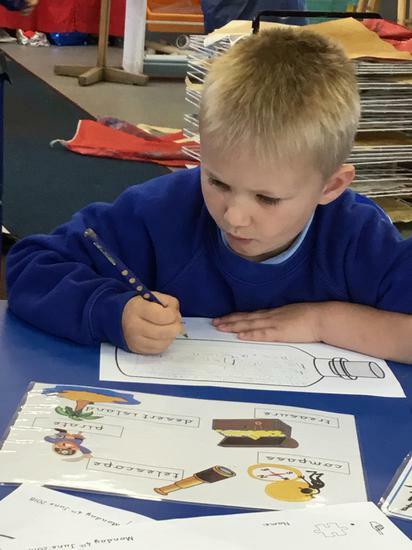 Please take the time to read our curriculum letter which outlines the terms learning in more detail. 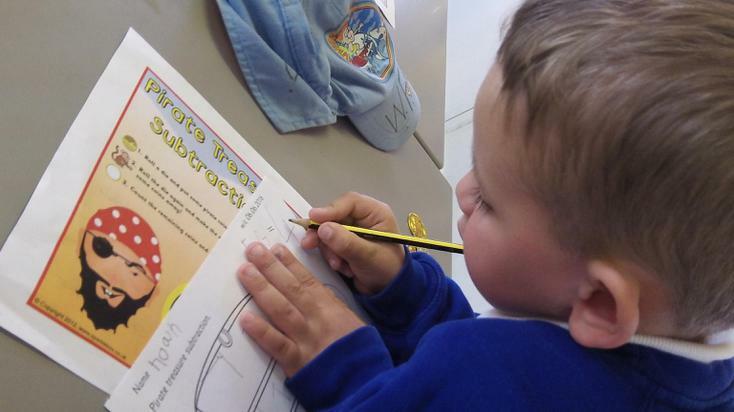 We have settled into the term with the fabulous 'Supertato' series by Sue Hendra. 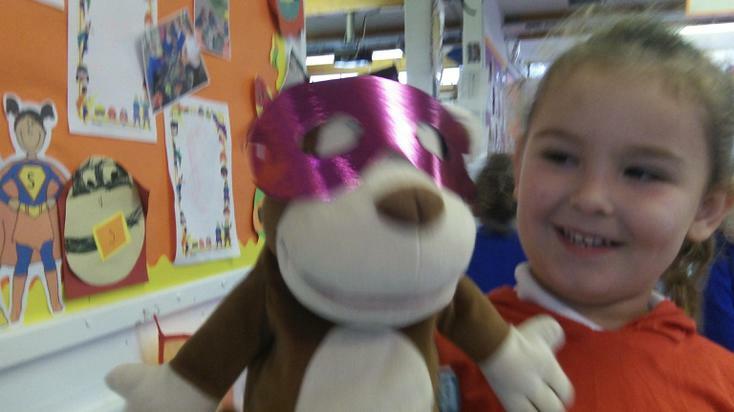 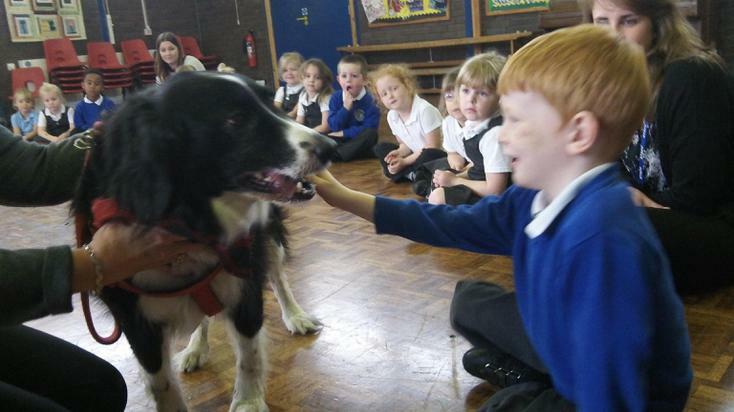 The children have dressed as superheroes and thought of ways to help their friends. 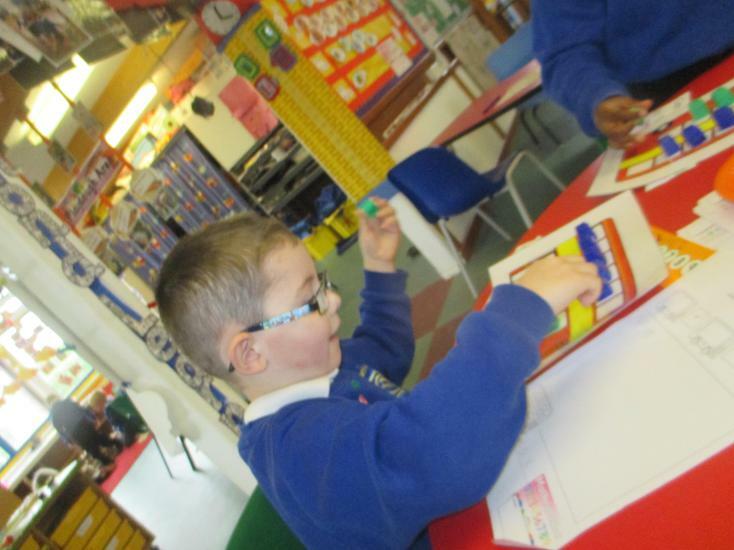 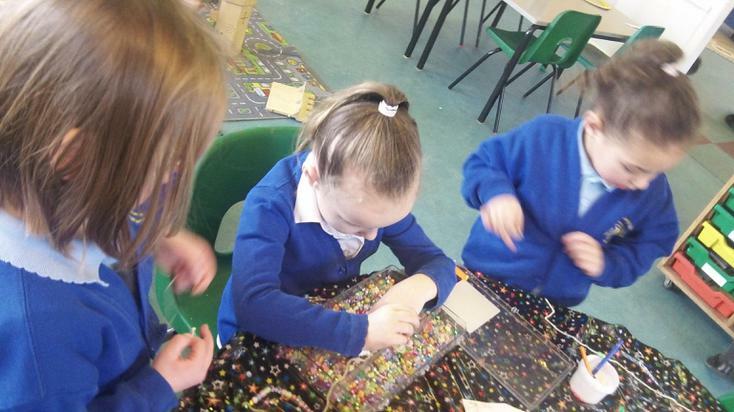 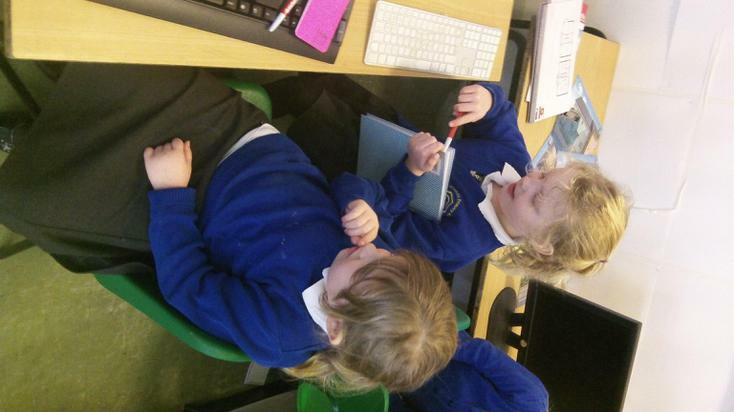 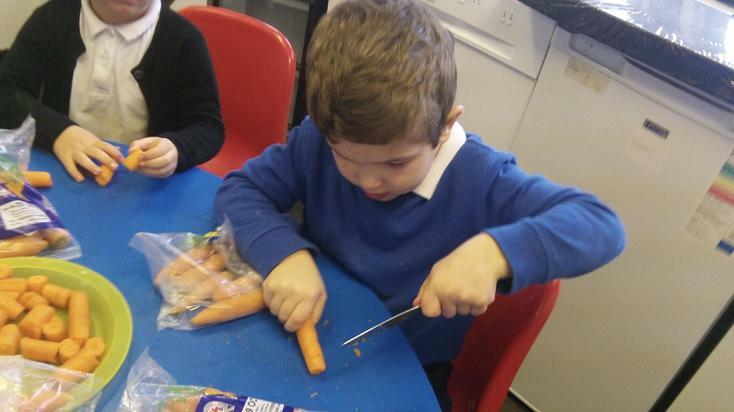 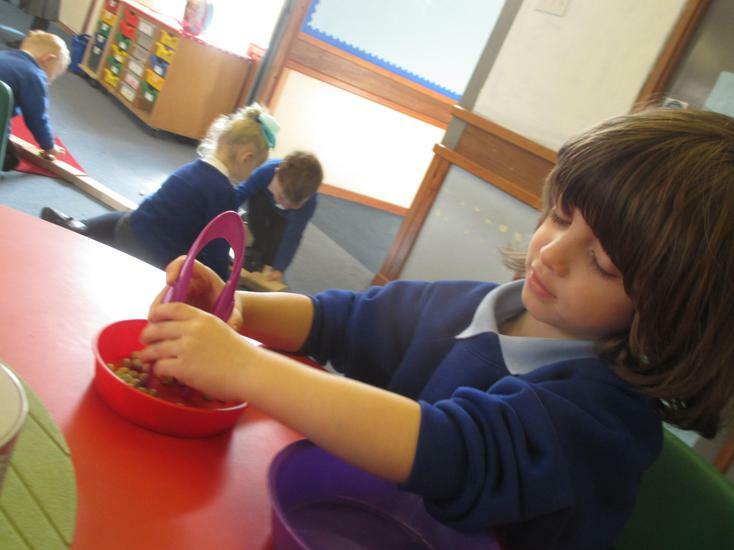 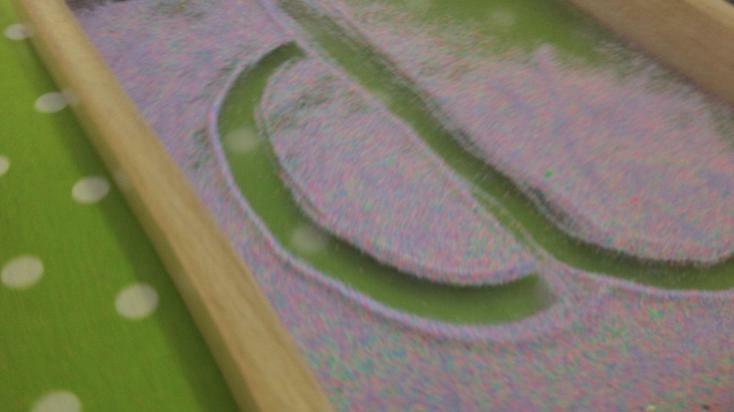 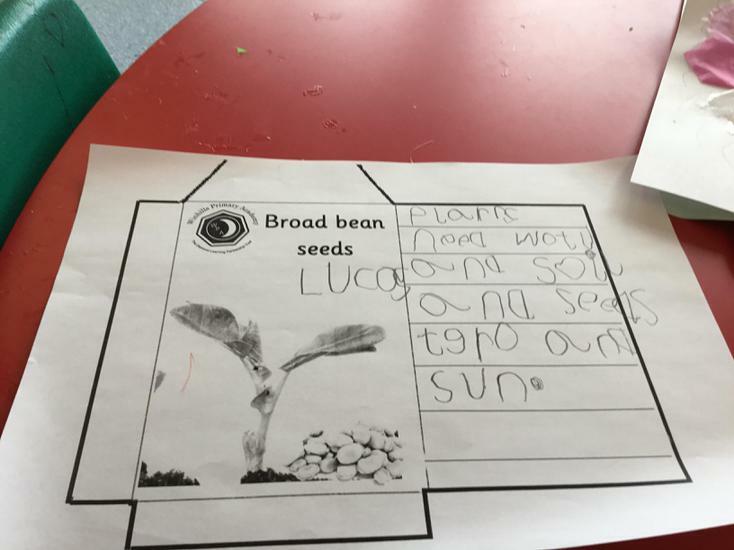 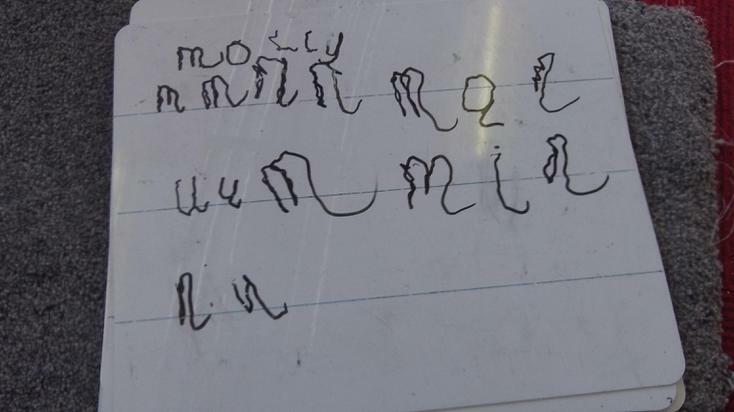 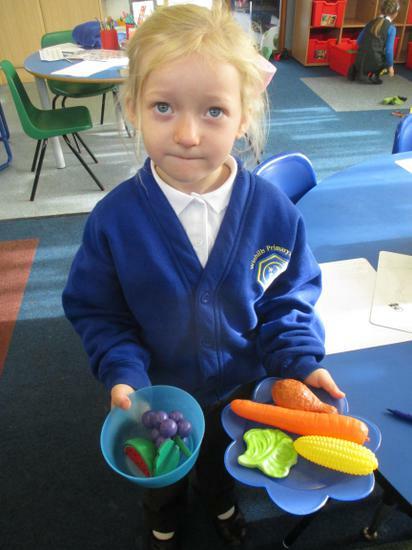 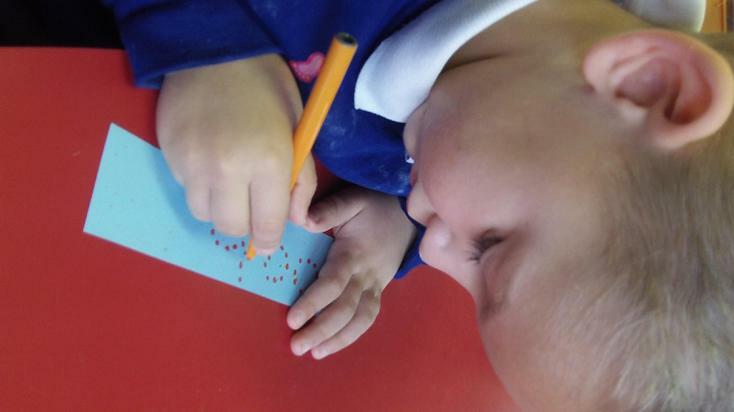 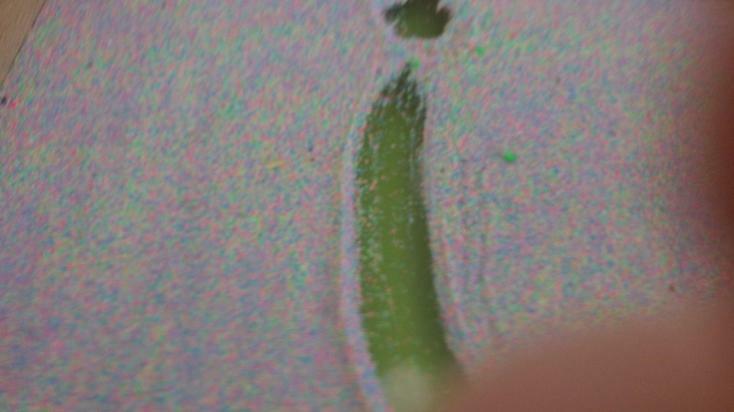 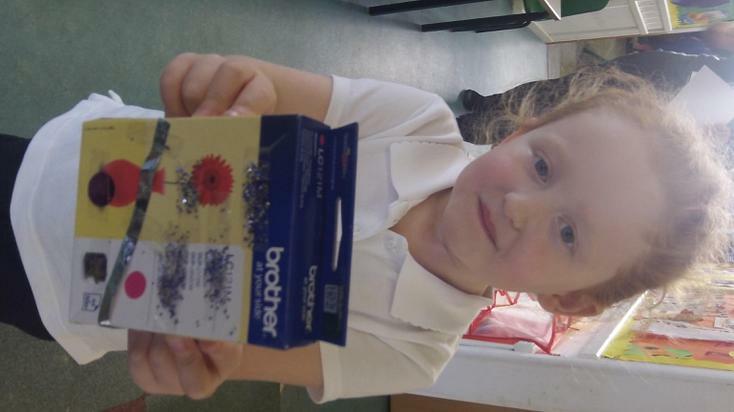 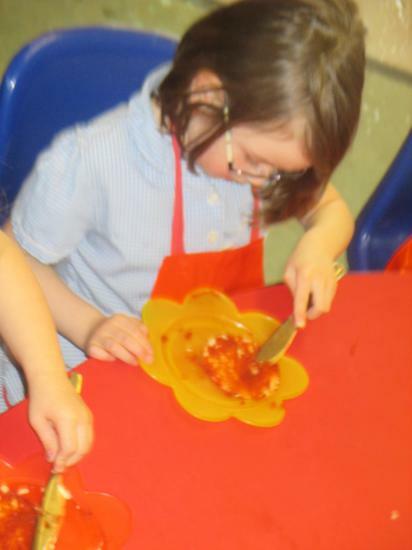 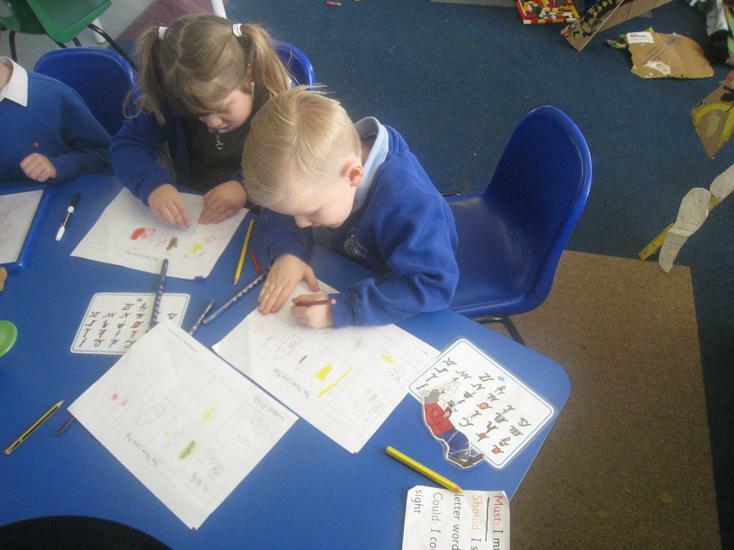 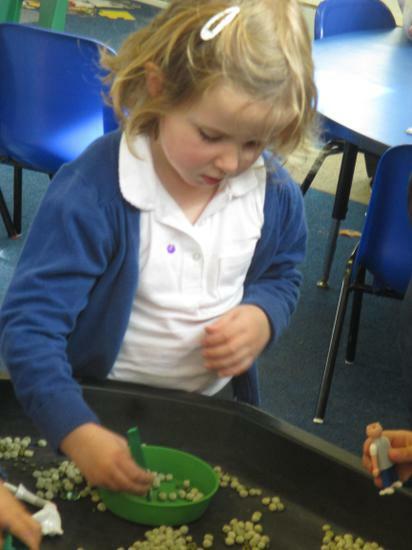 They have used tweezers to pick up peas which has given them super strong fingers, ready for writing. 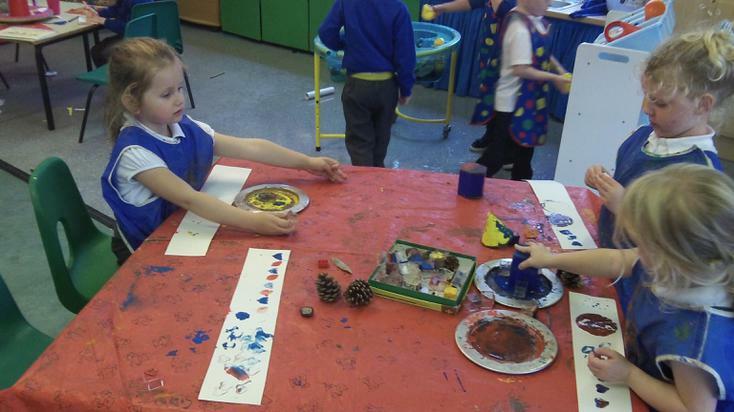 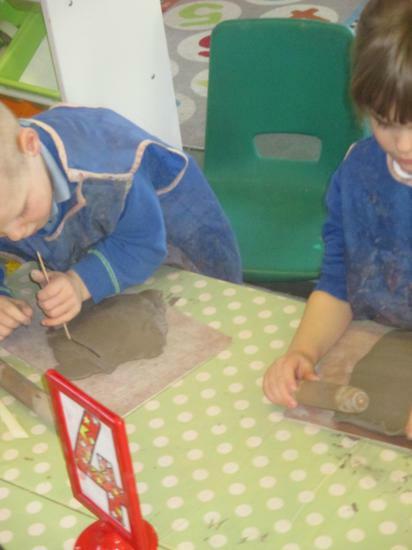 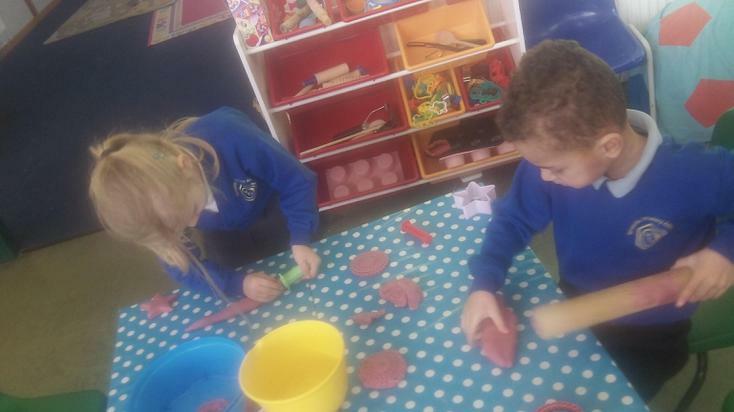 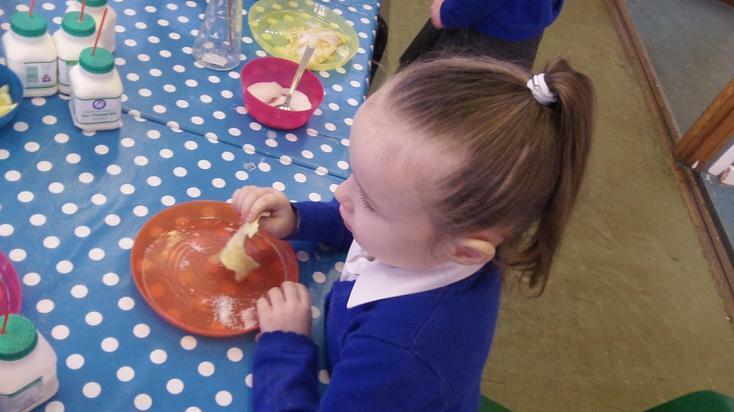 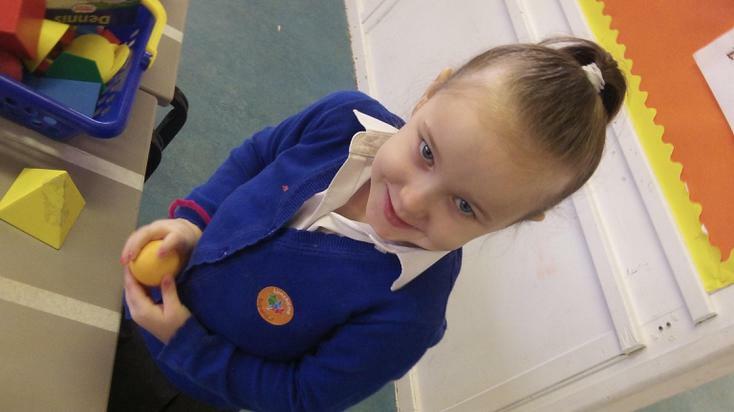 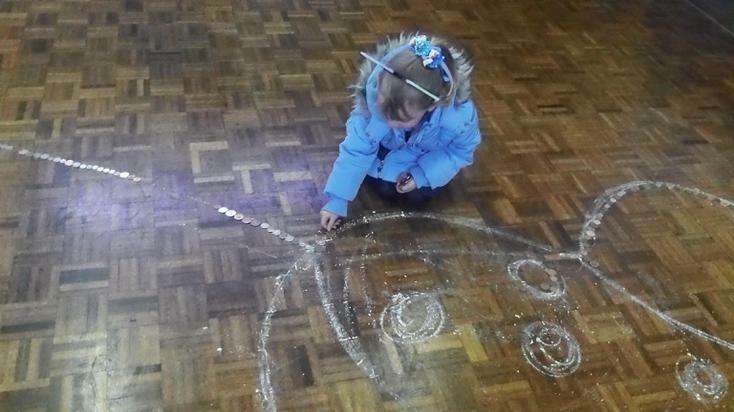 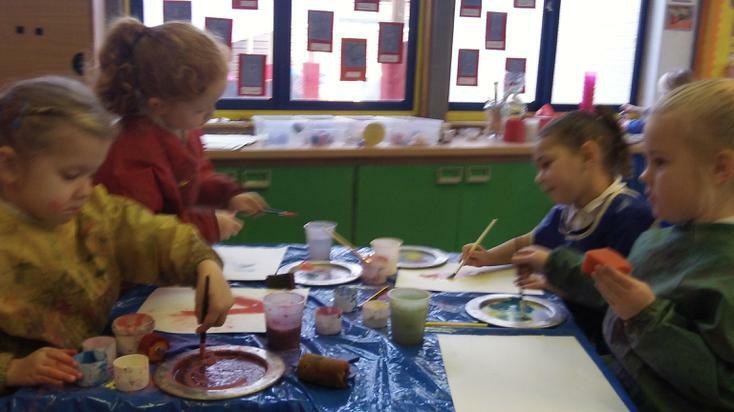 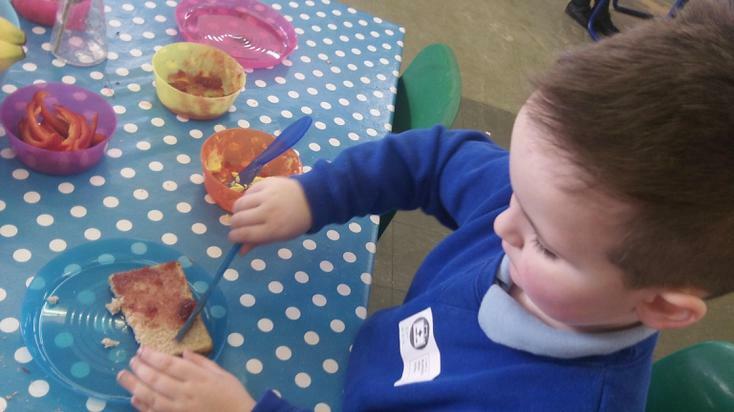 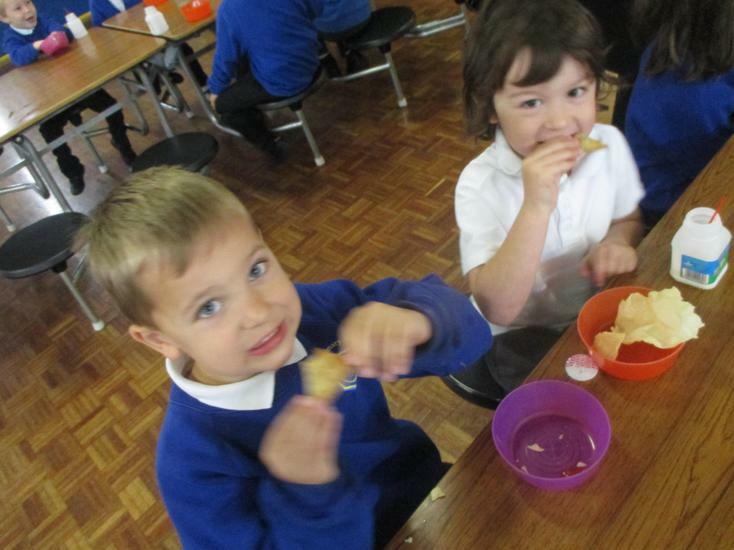 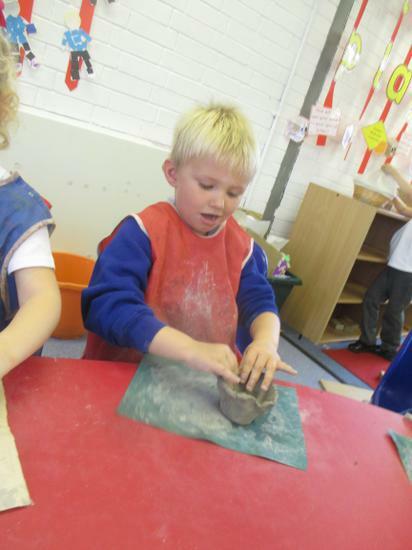 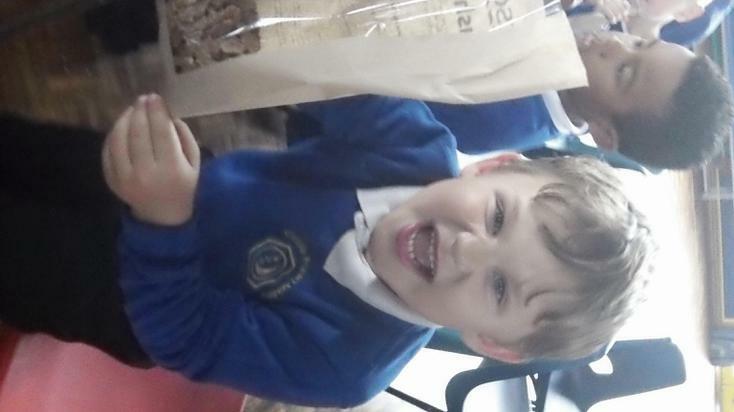 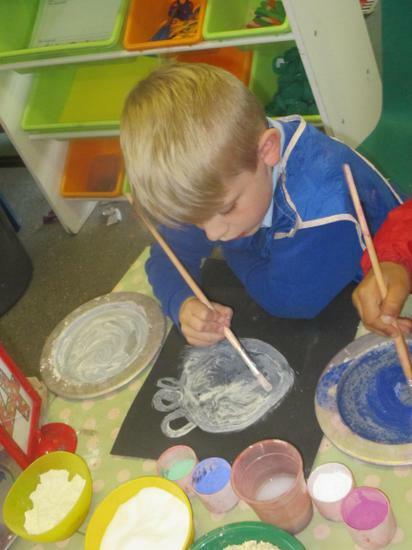 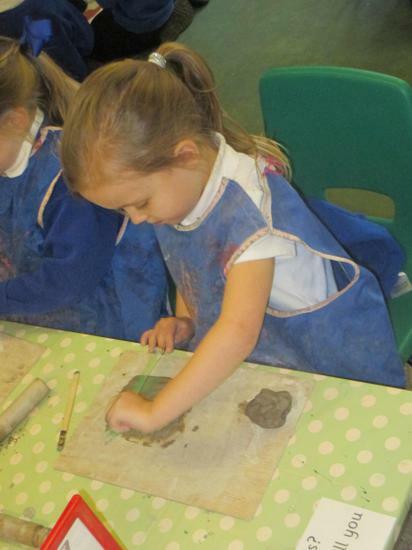 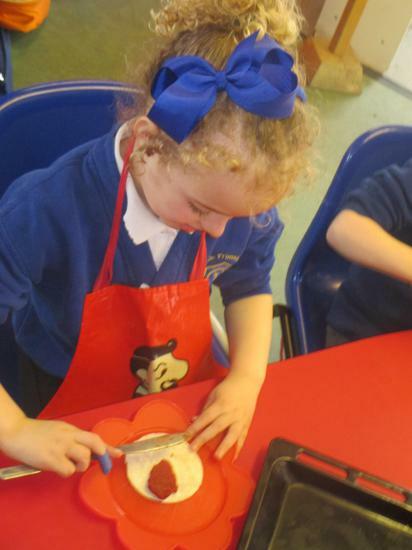 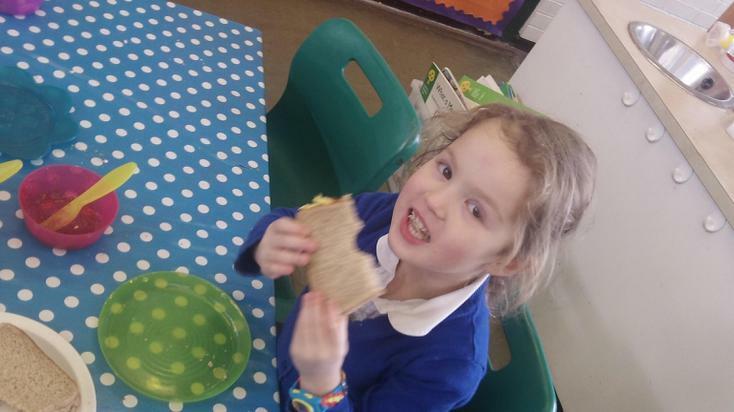 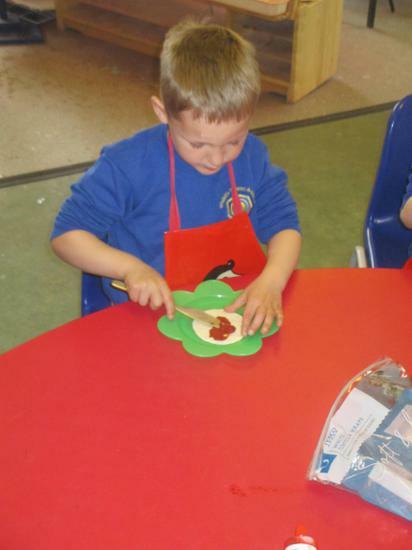 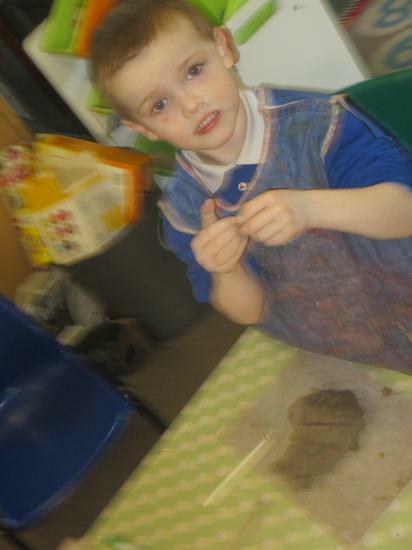 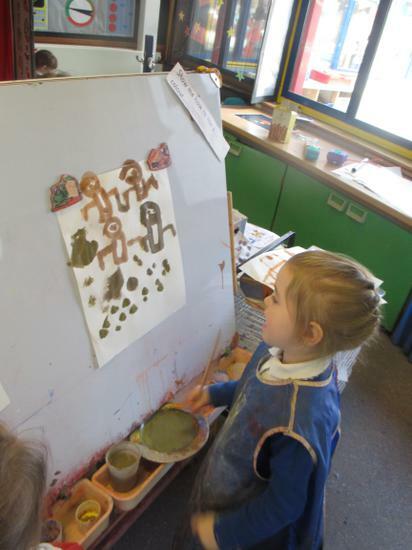 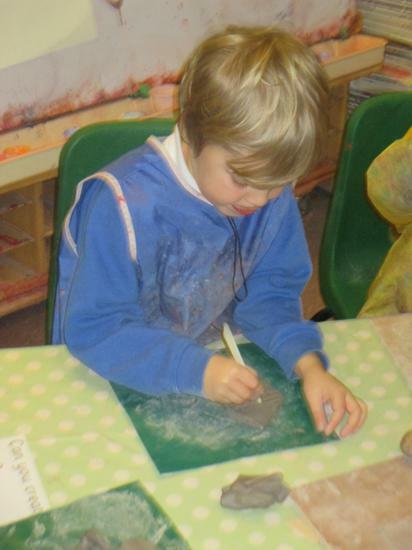 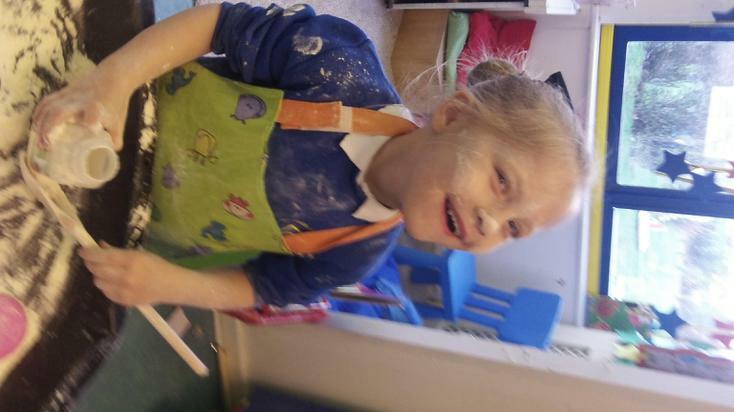 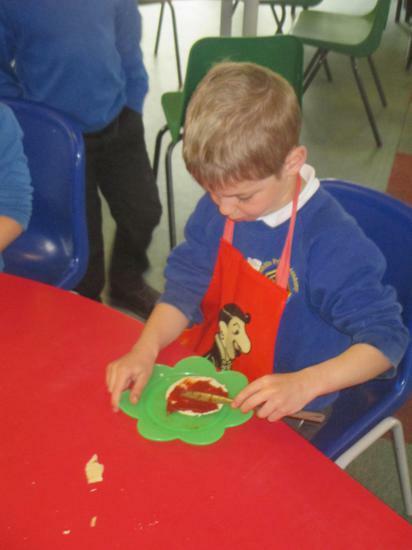 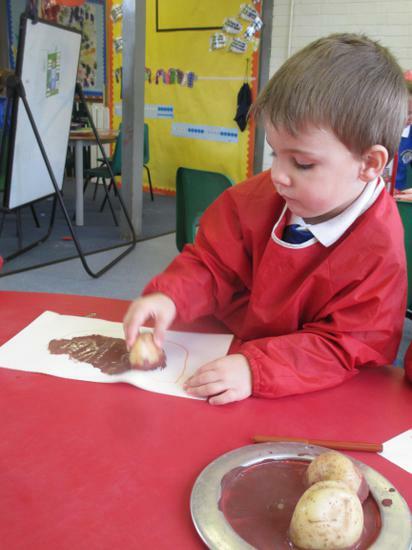 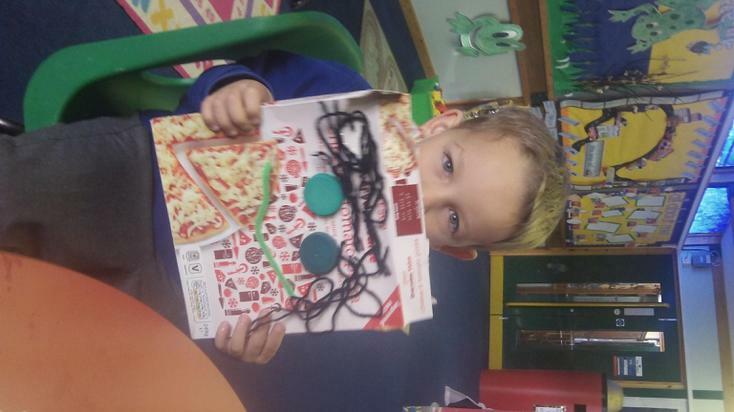 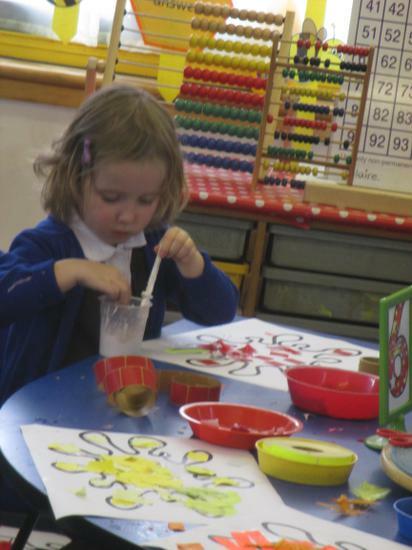 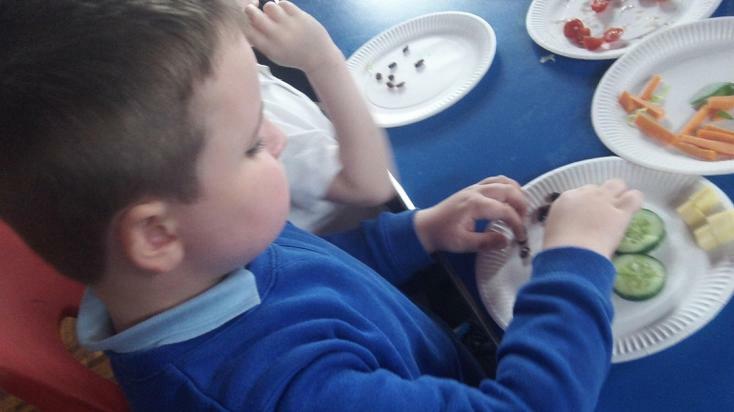 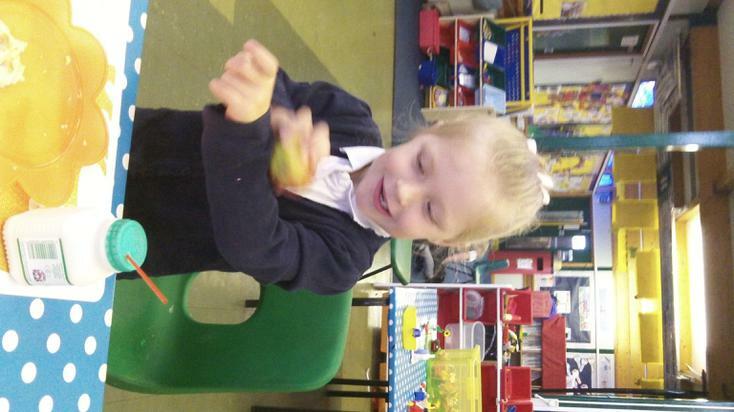 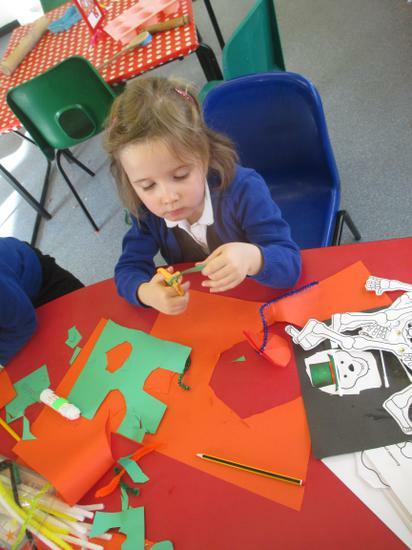 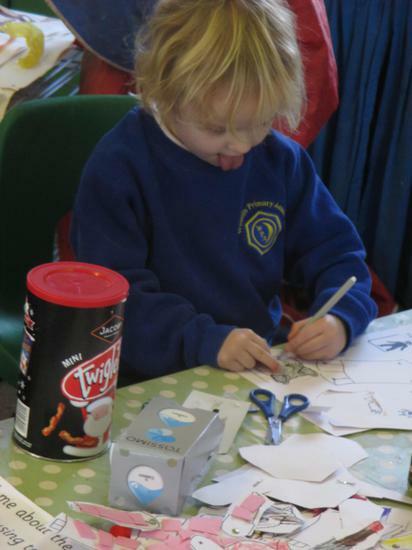 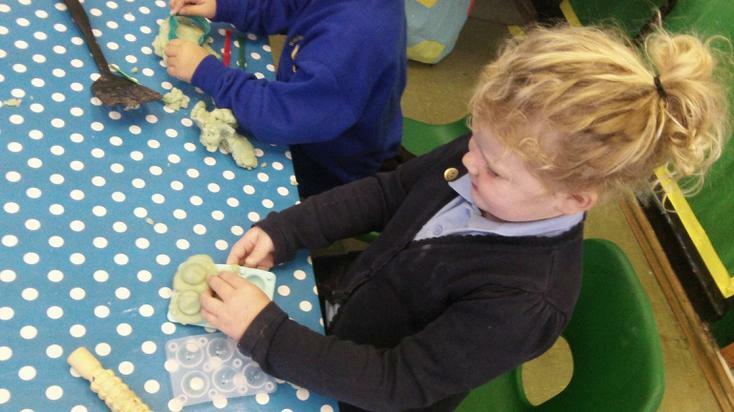 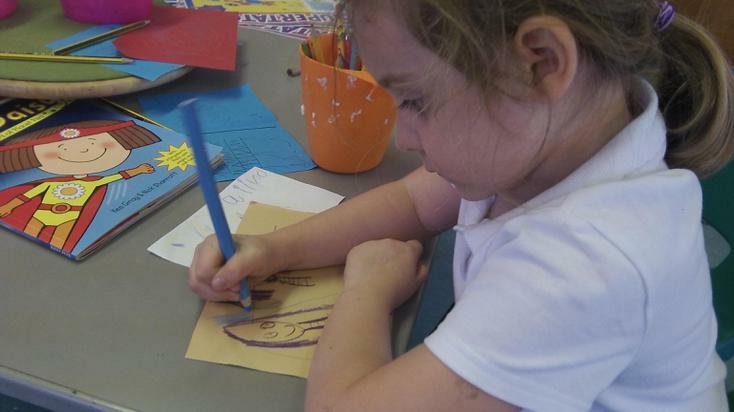 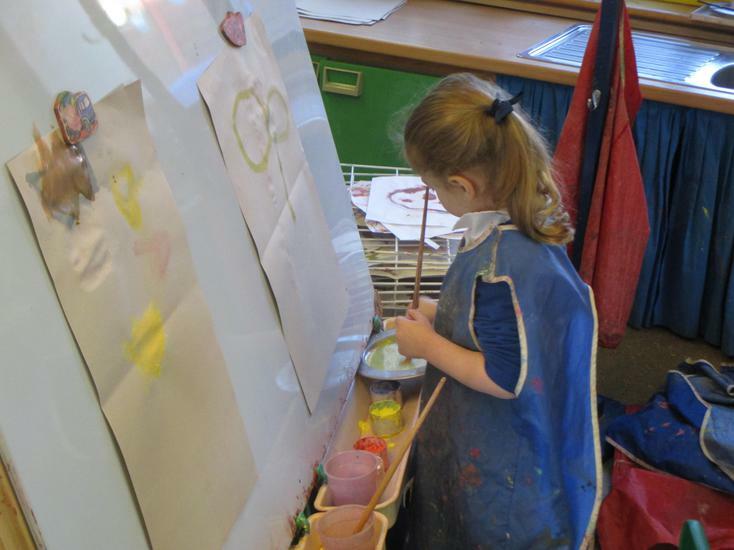 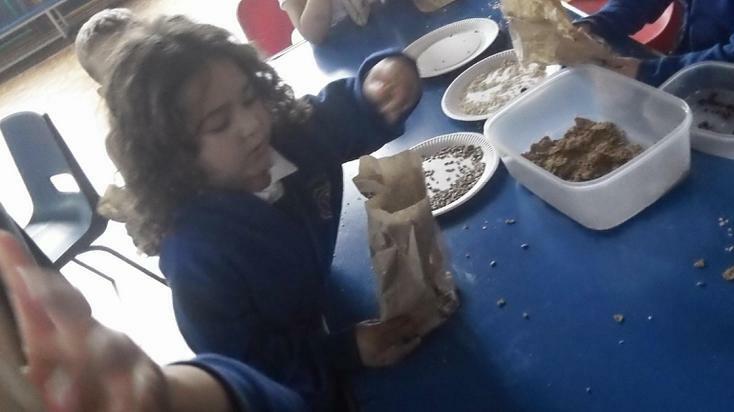 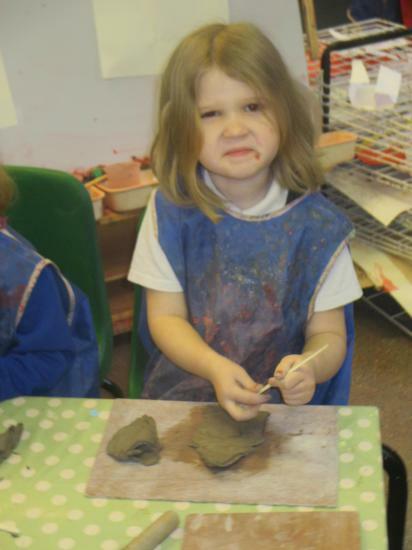 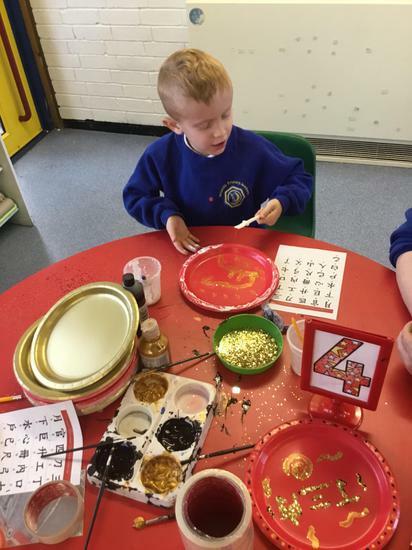 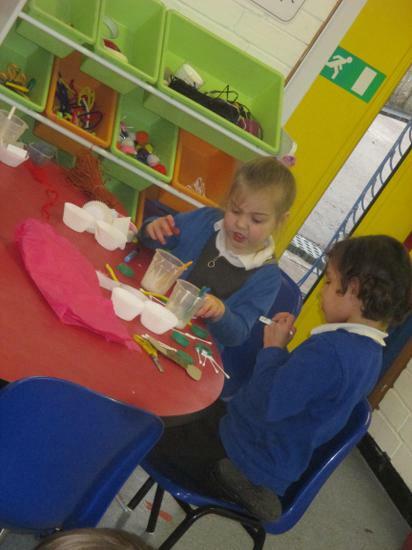 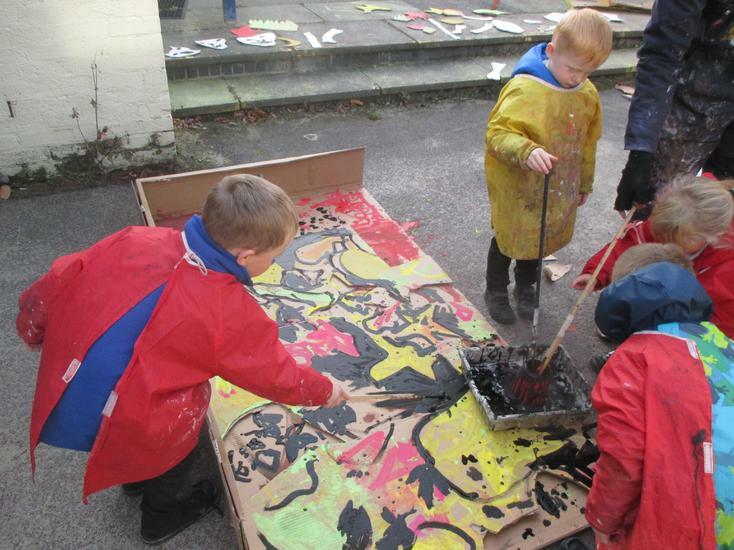 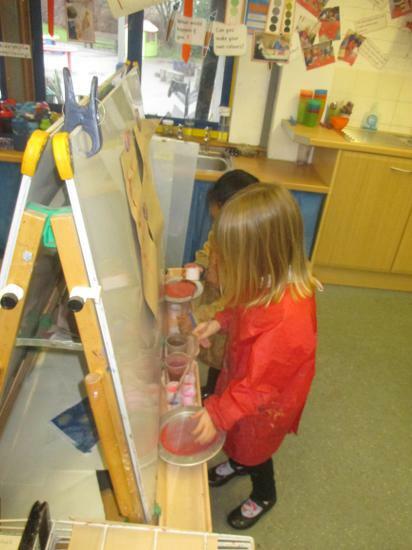 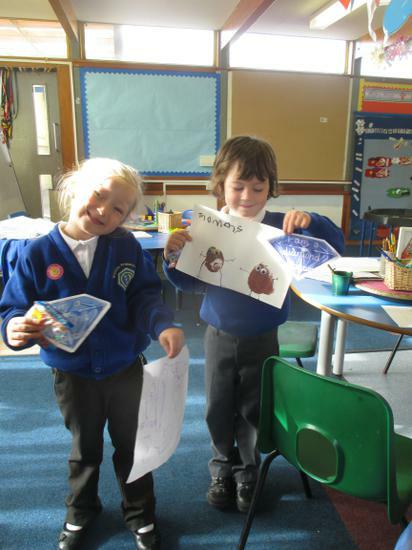 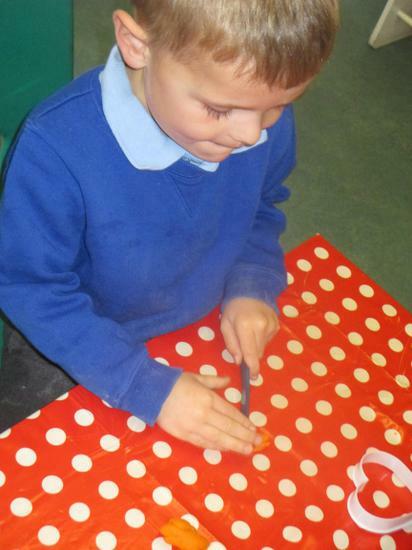 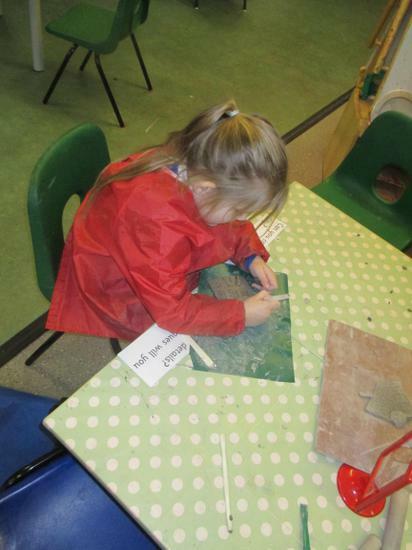 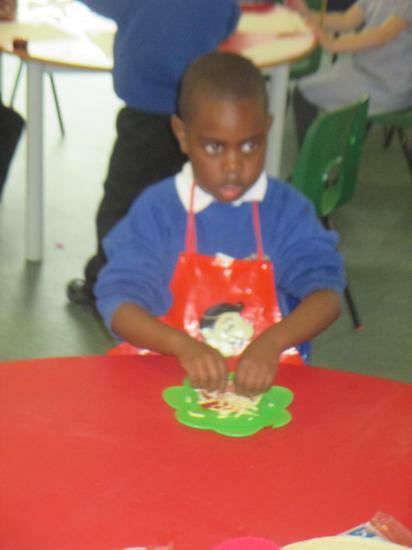 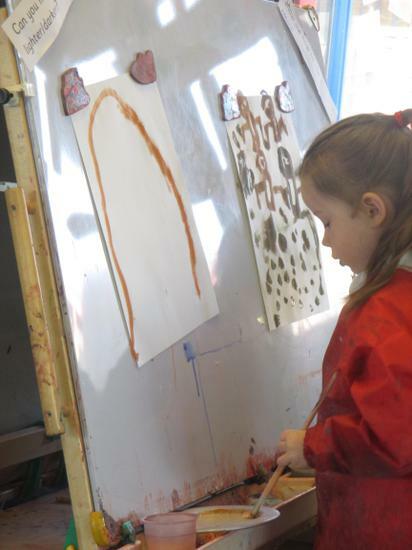 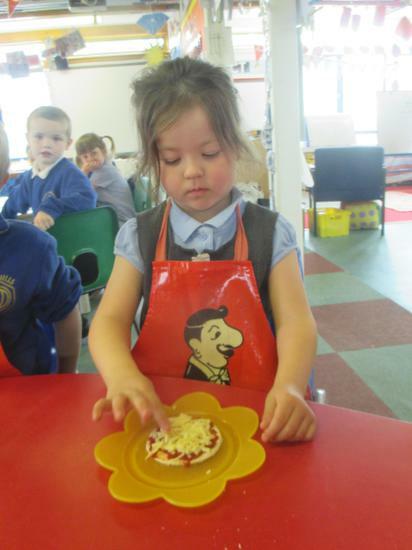 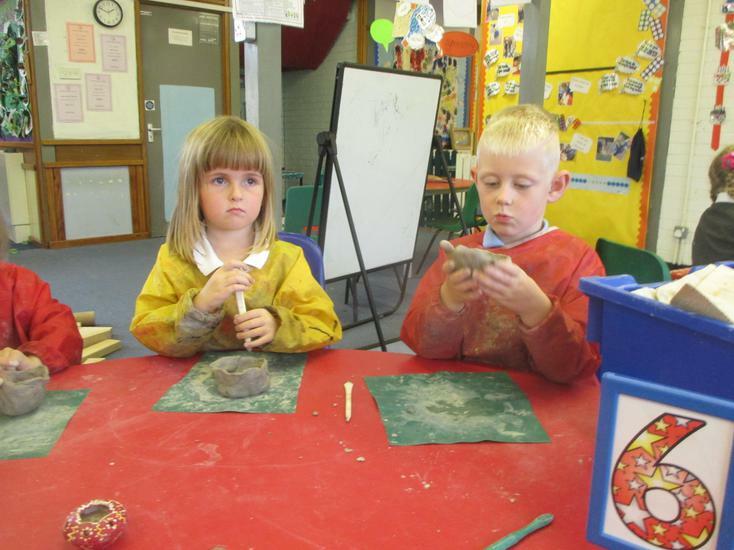 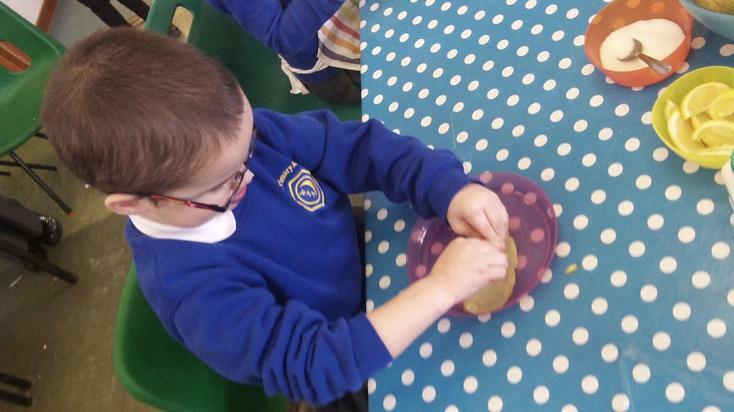 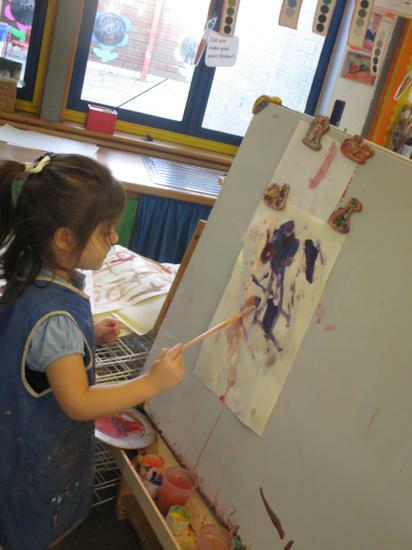 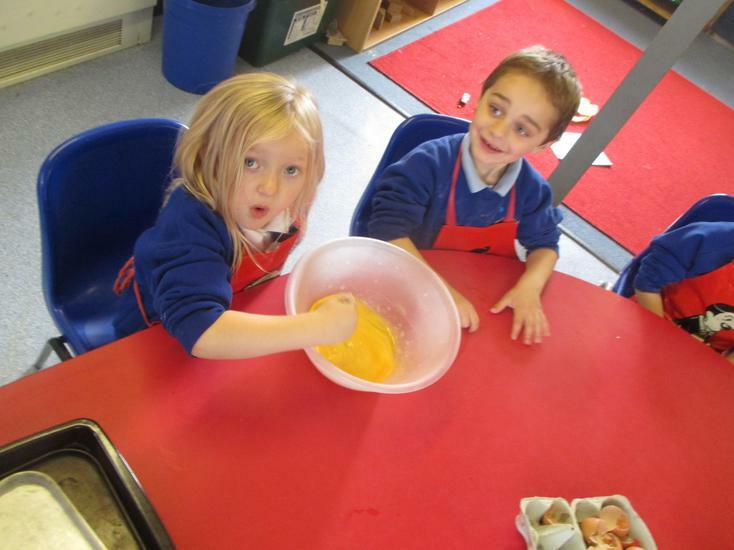 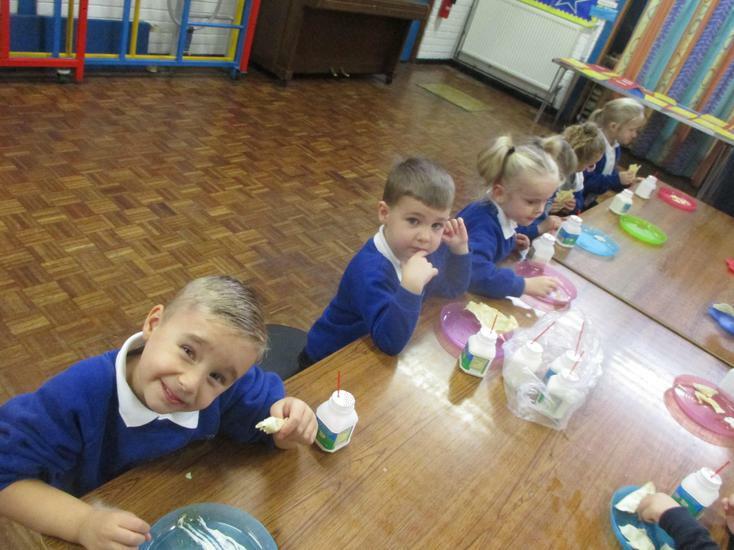 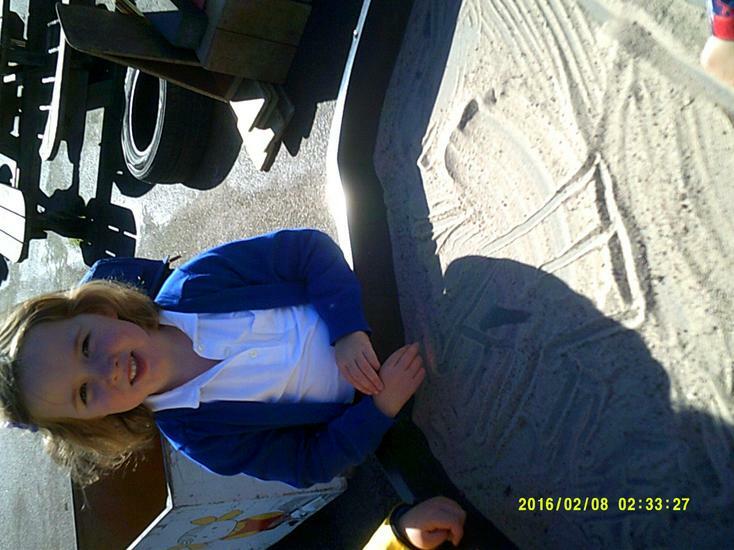 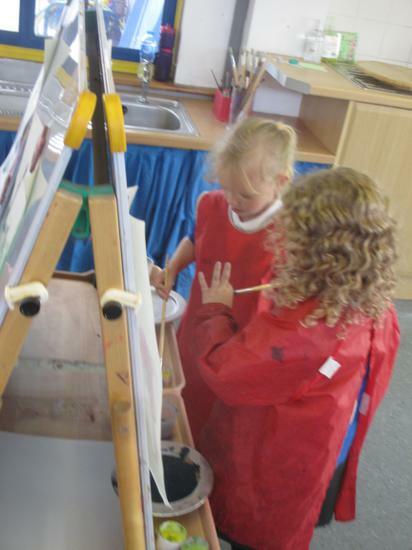 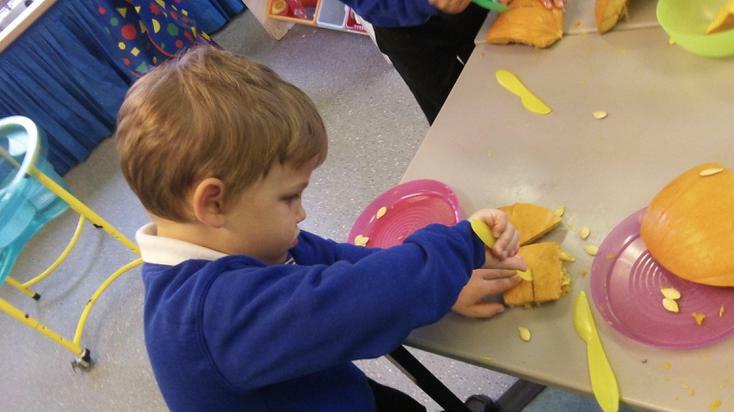 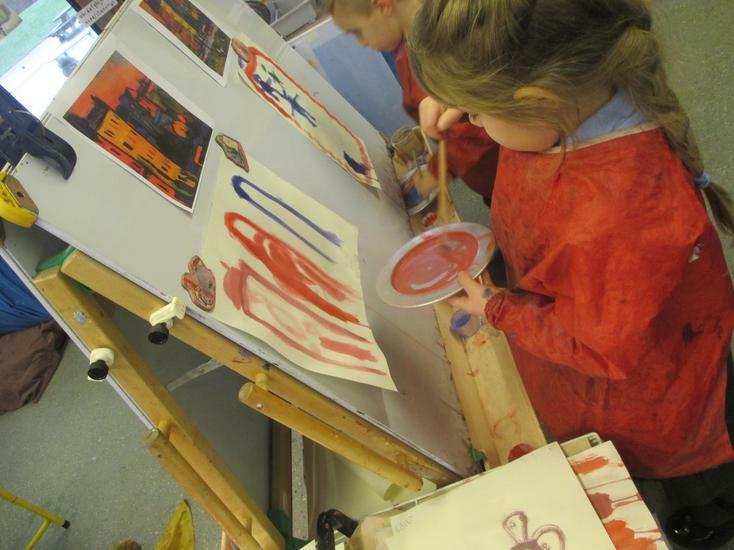 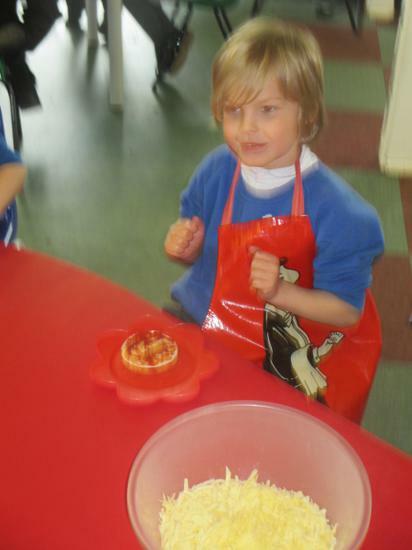 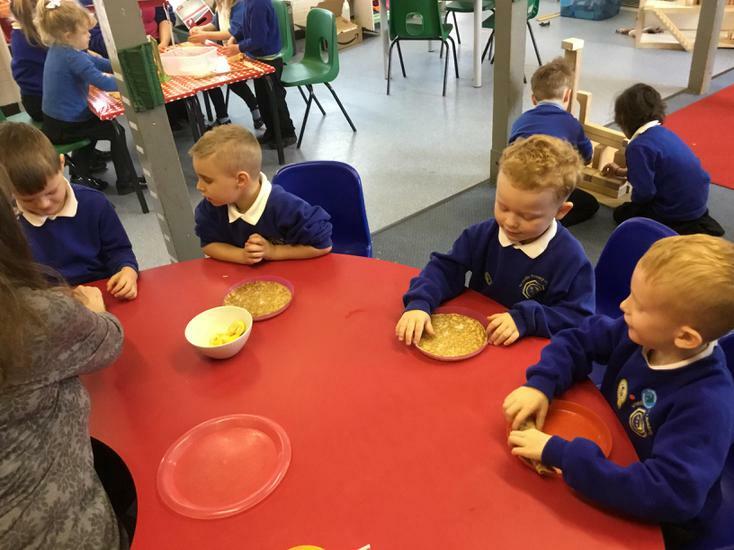 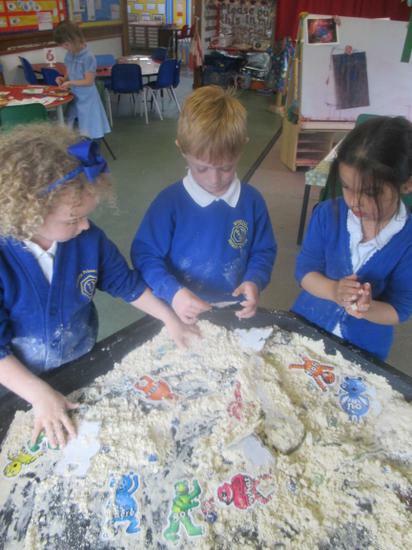 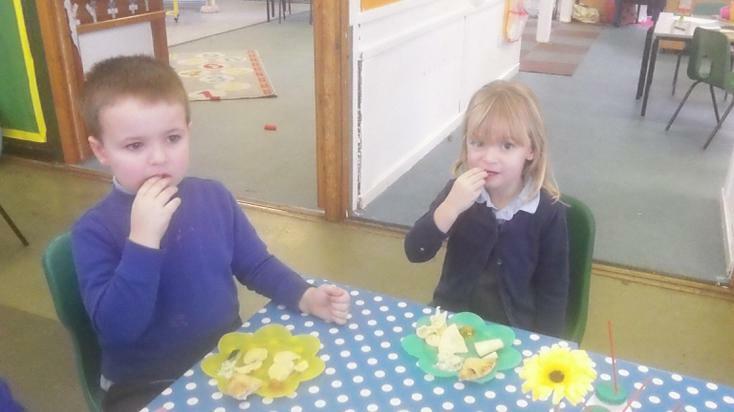 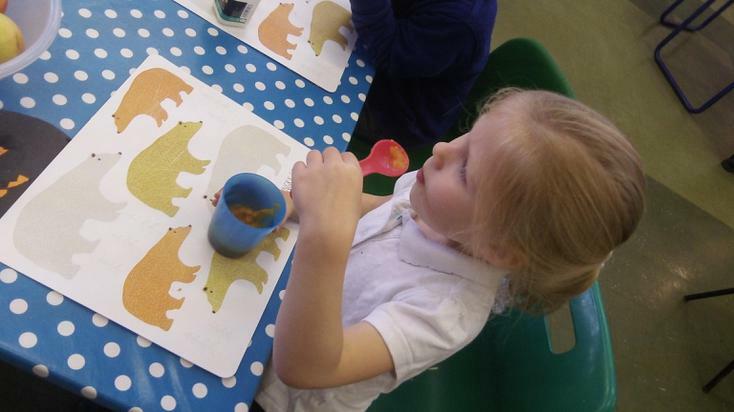 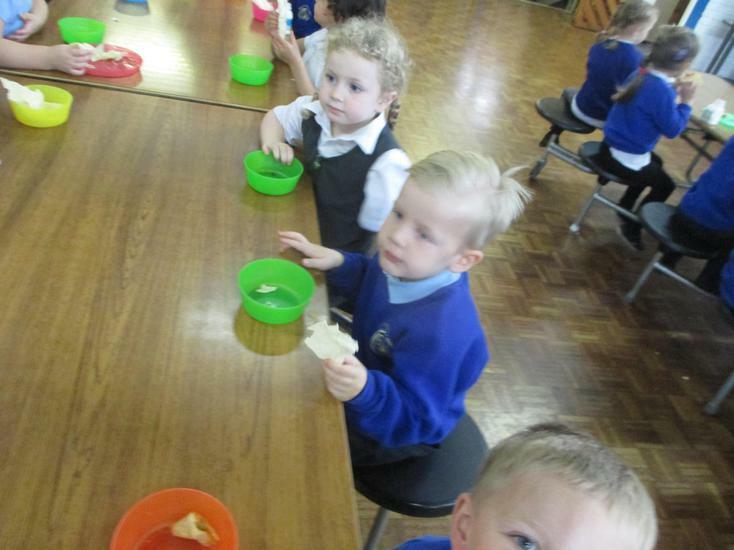 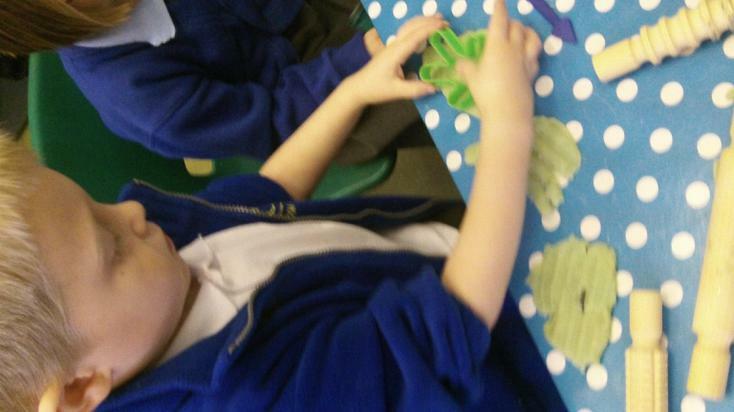 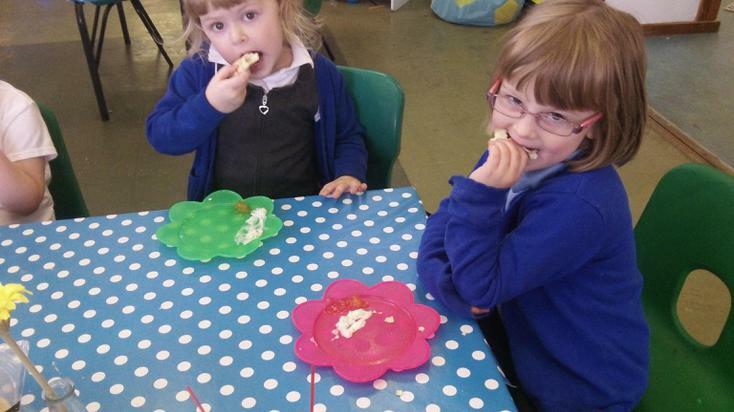 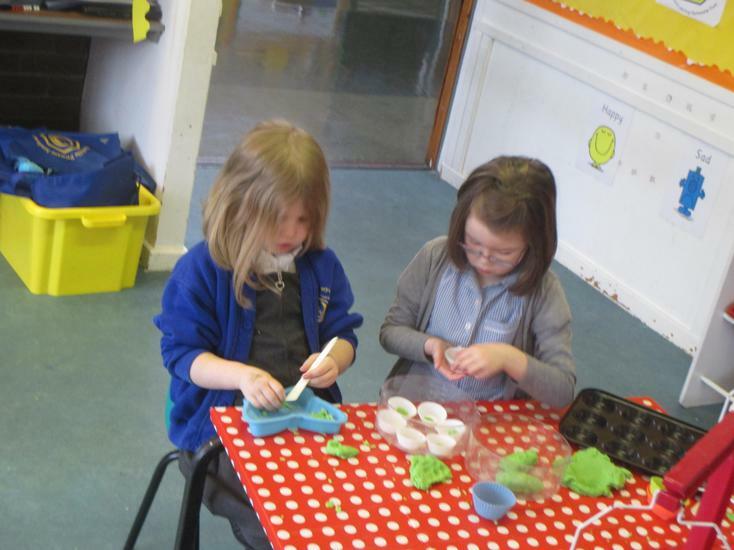 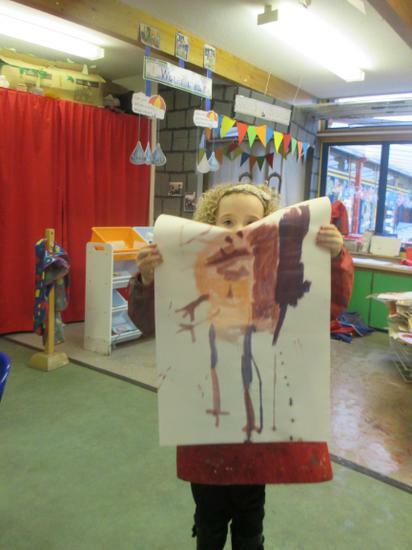 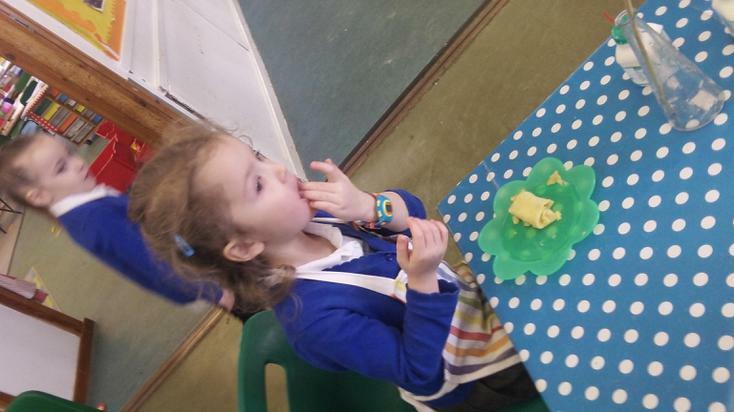 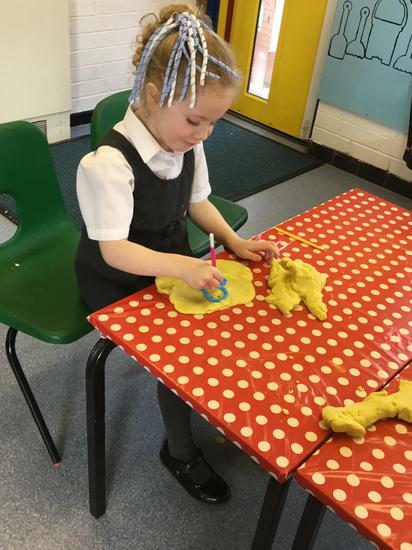 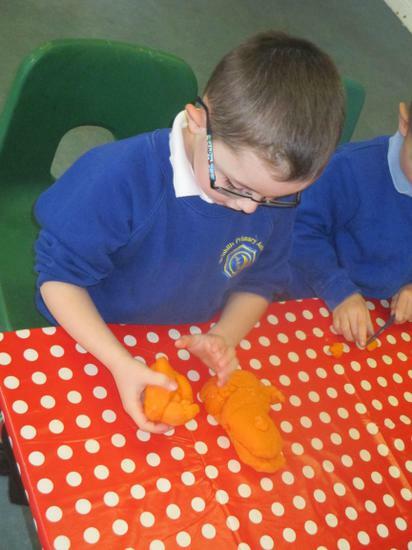 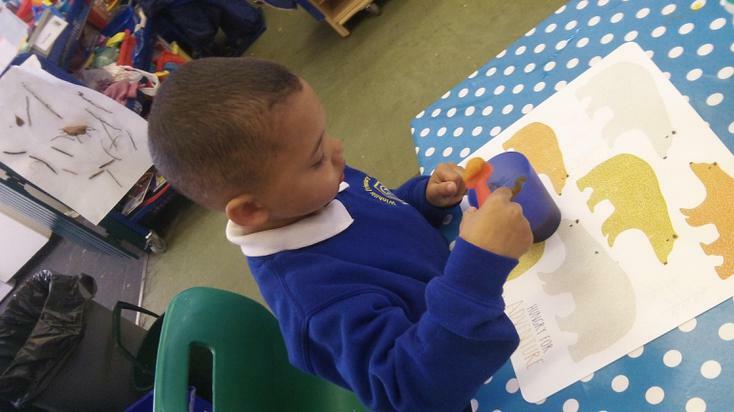 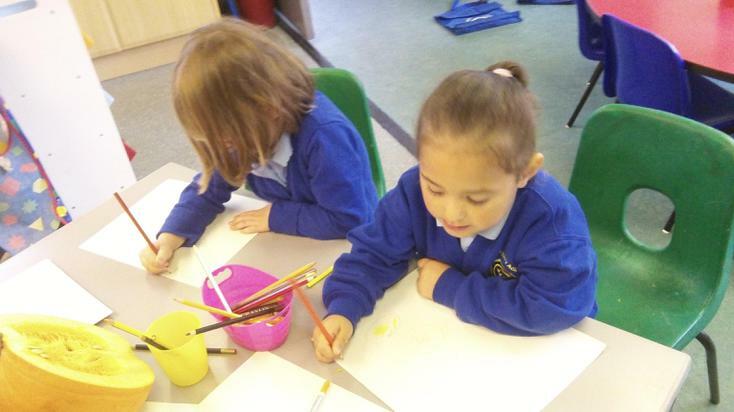 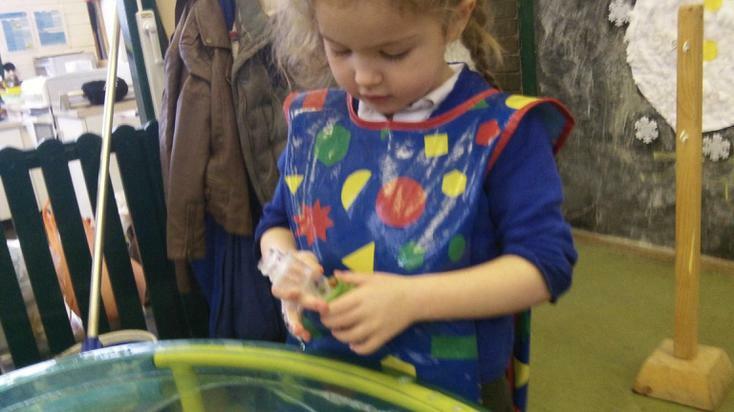 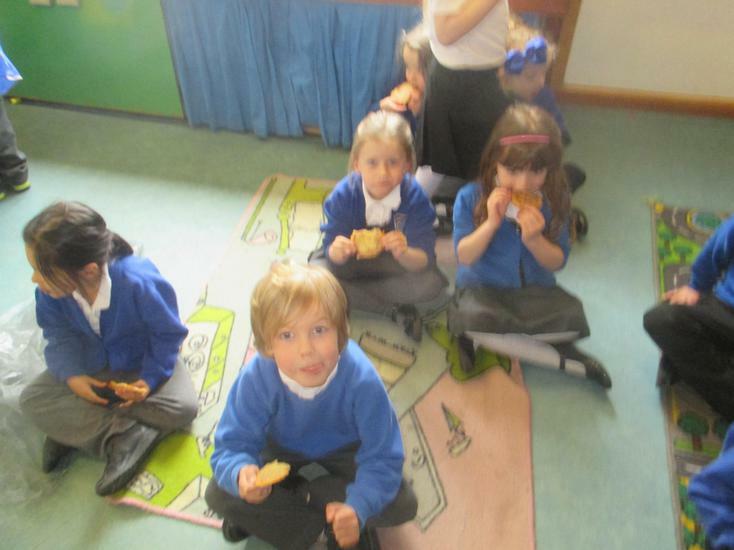 The children enjoyed potato printing their own Supertato; carefully drawing masks and capes. 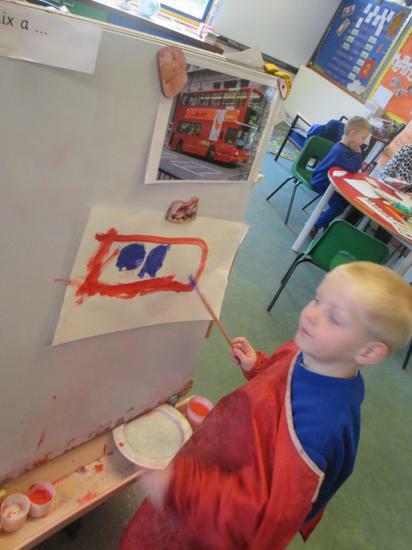 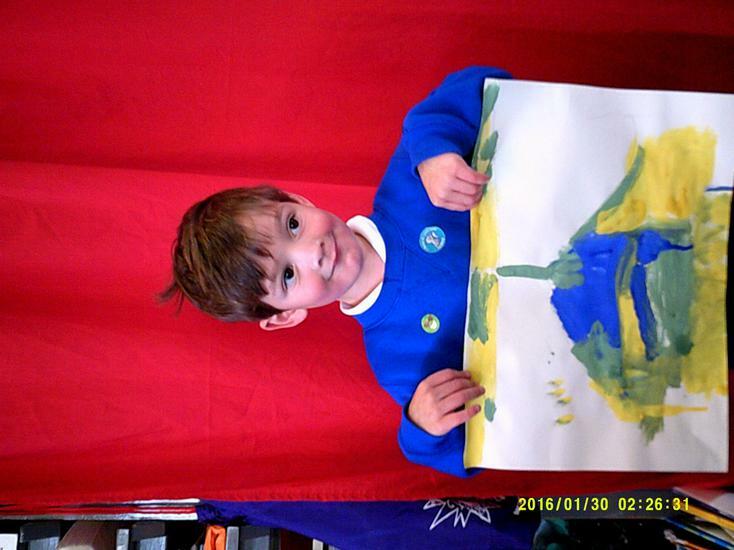 Oliver painted a plane; this was he fifth attempt! 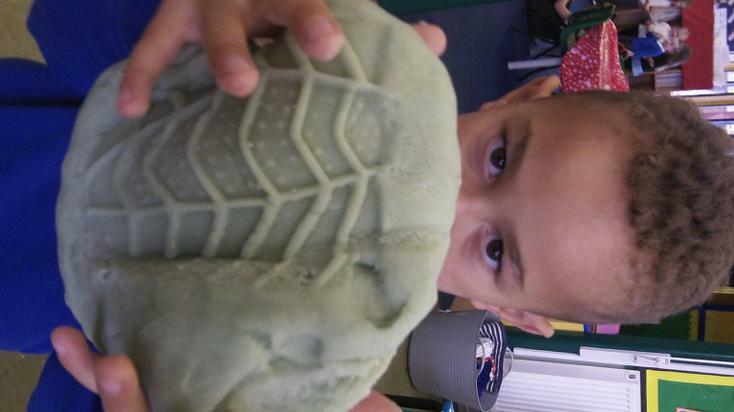 This potato print is really super! 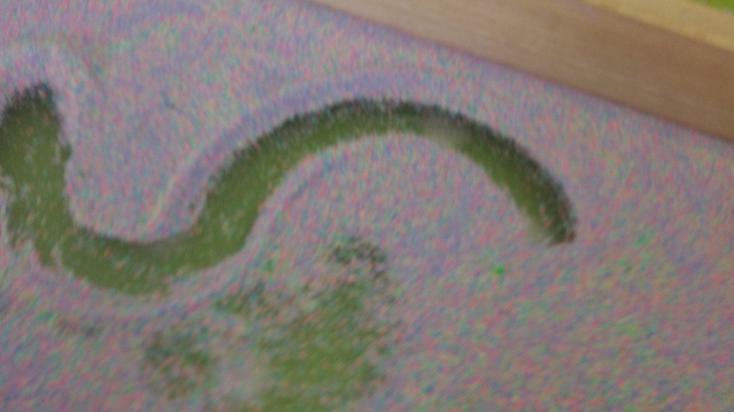 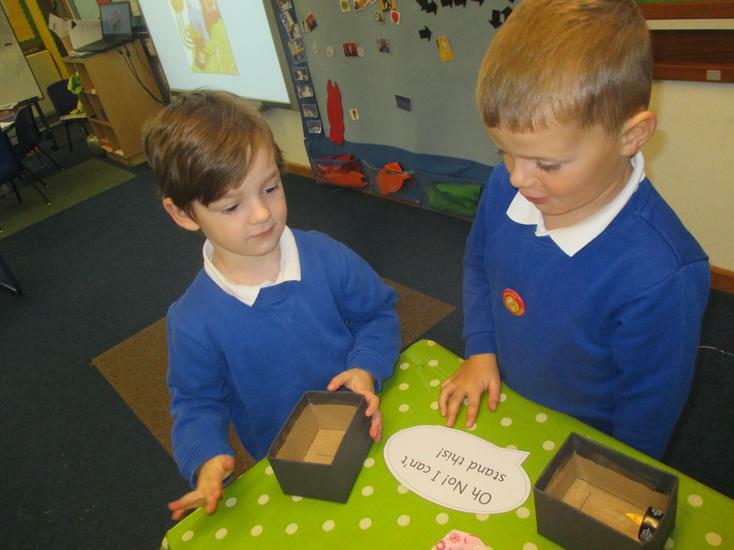 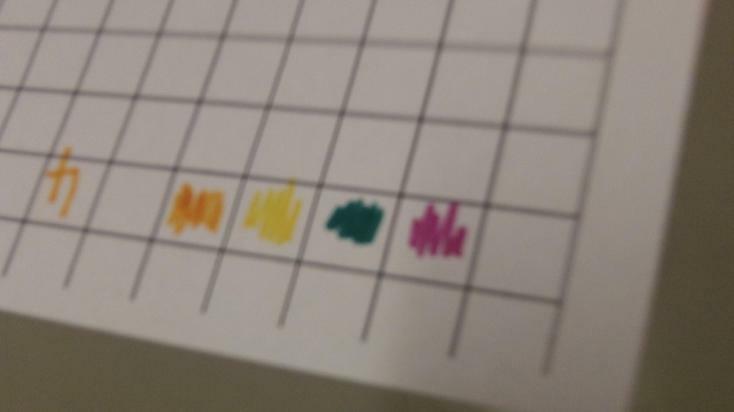 We learnt that our fingerprints are different. 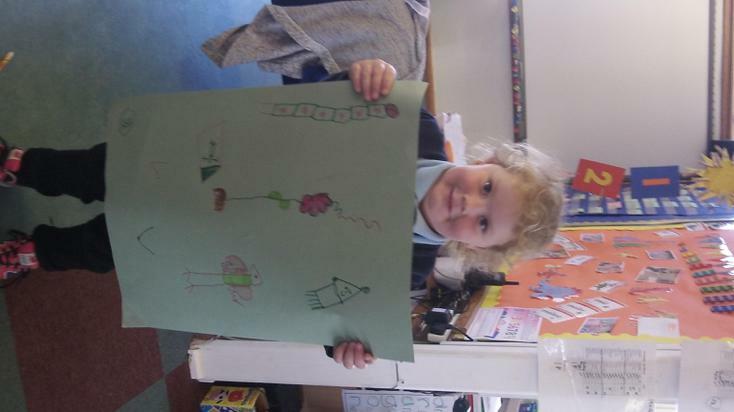 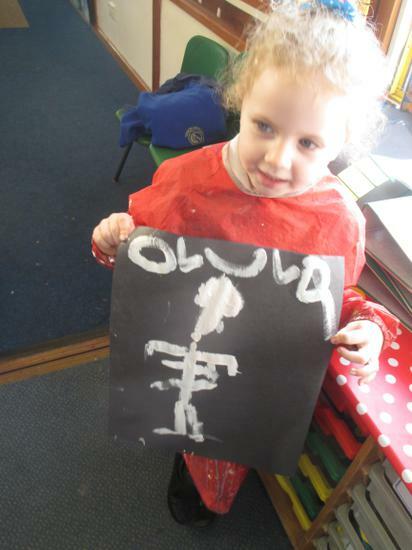 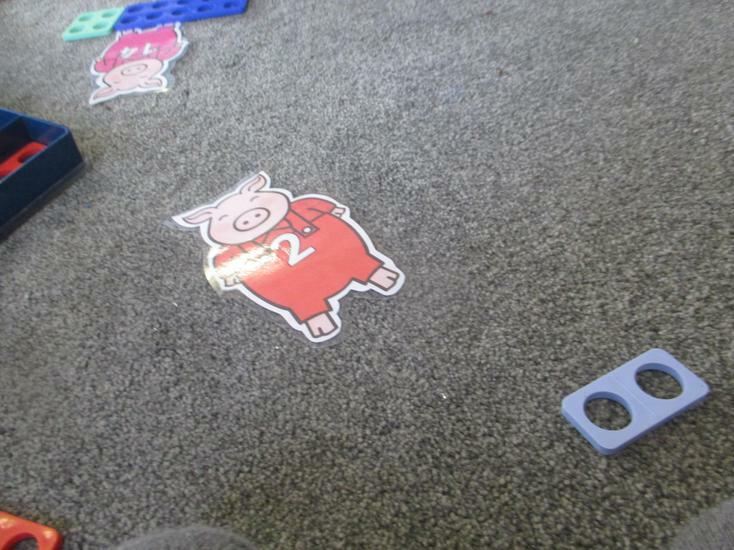 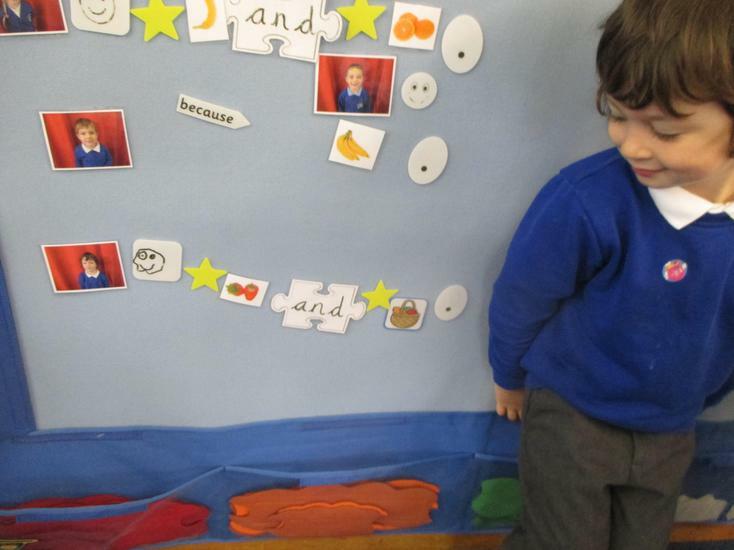 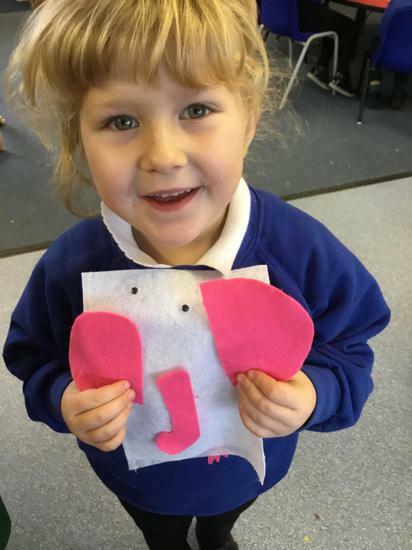 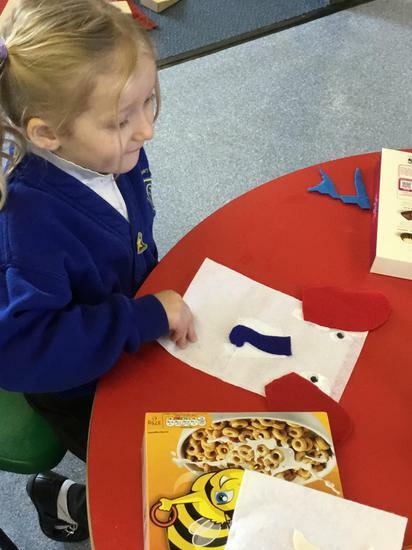 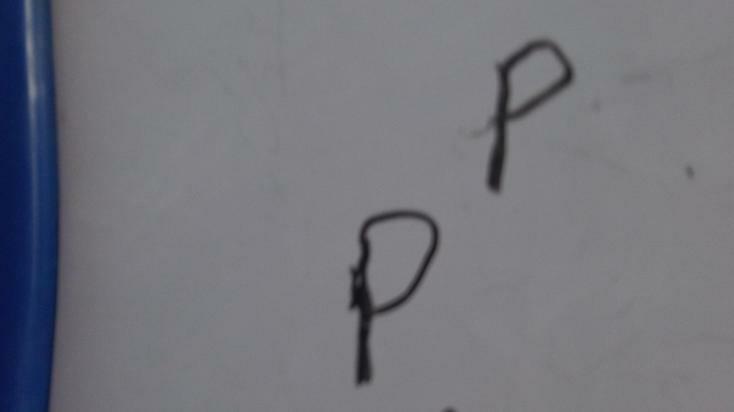 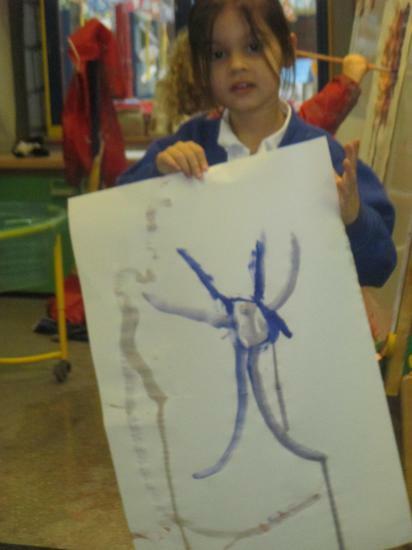 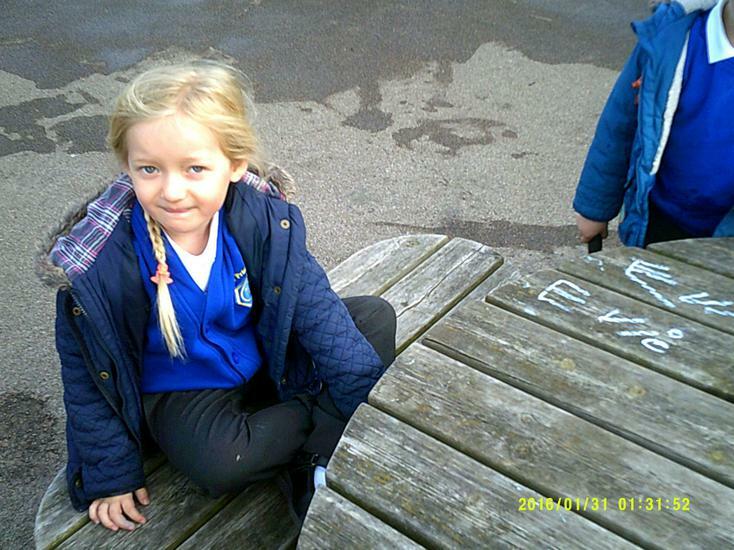 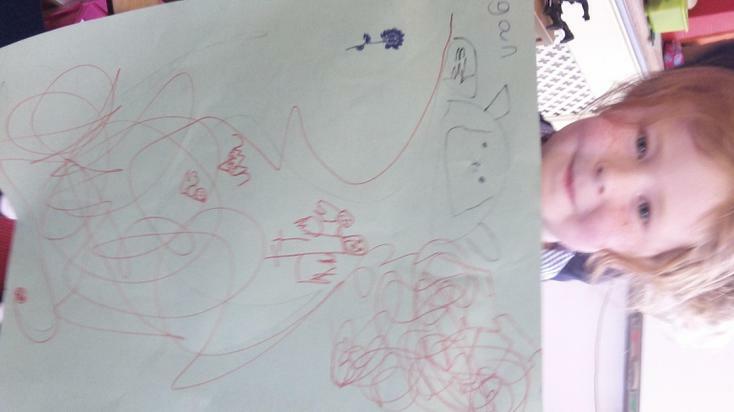 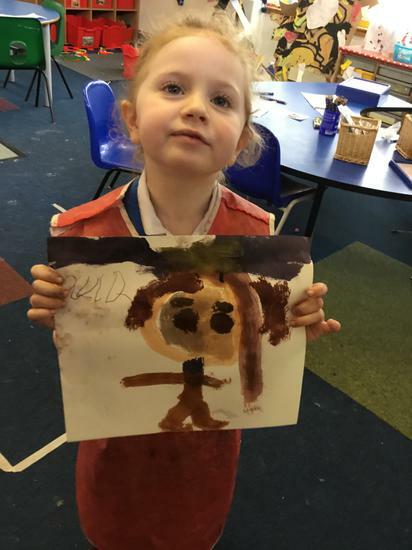 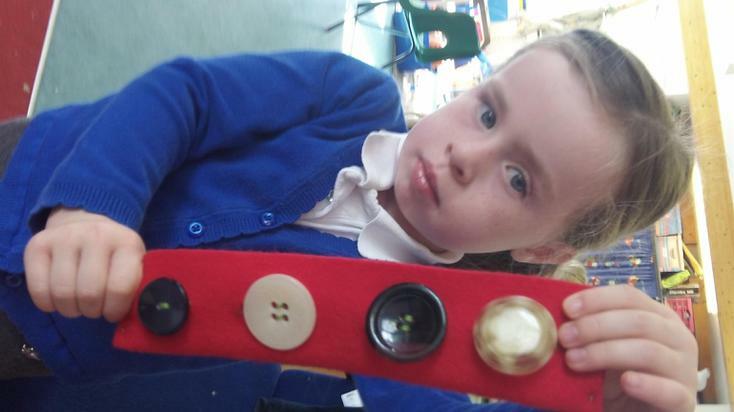 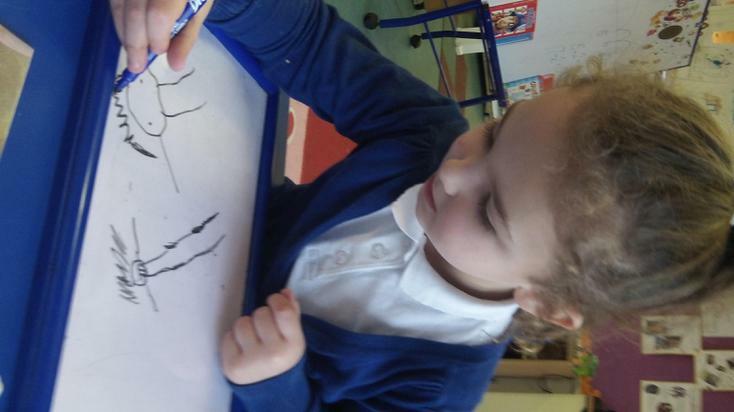 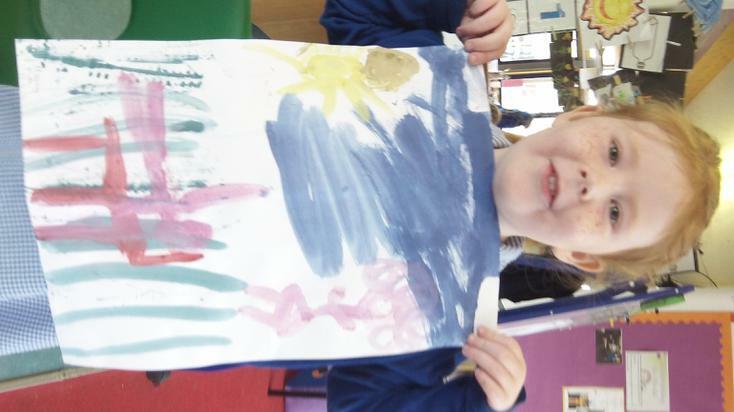 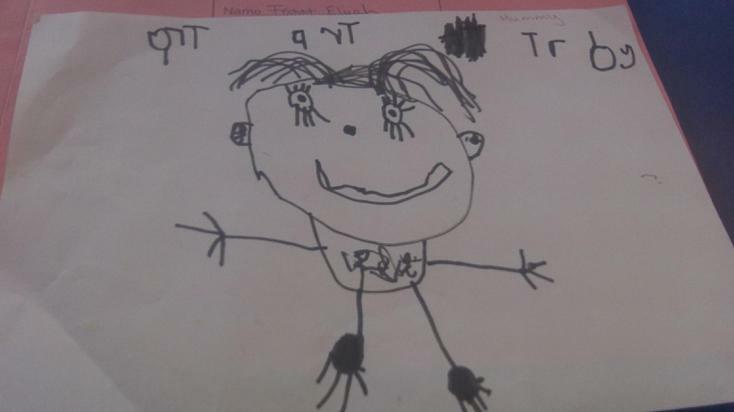 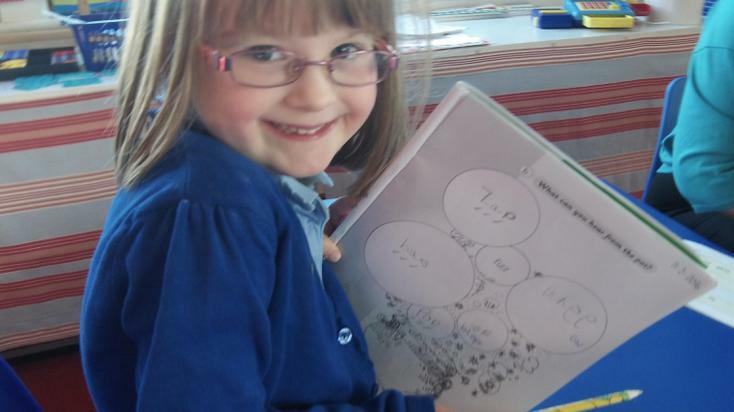 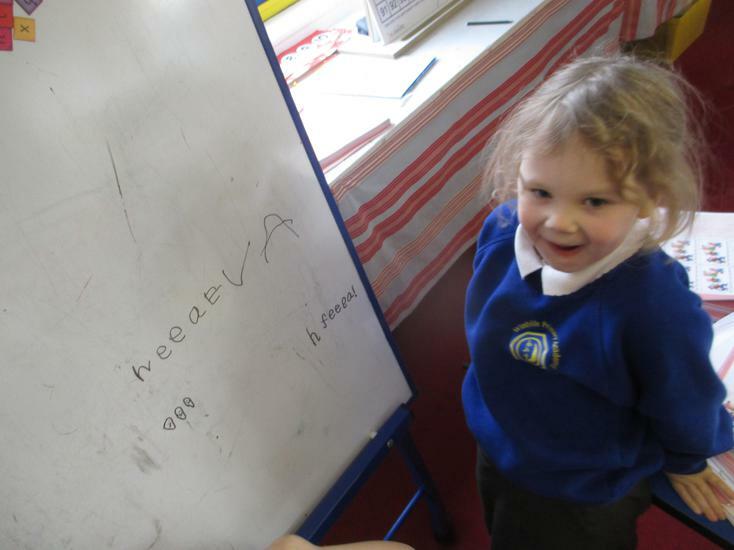 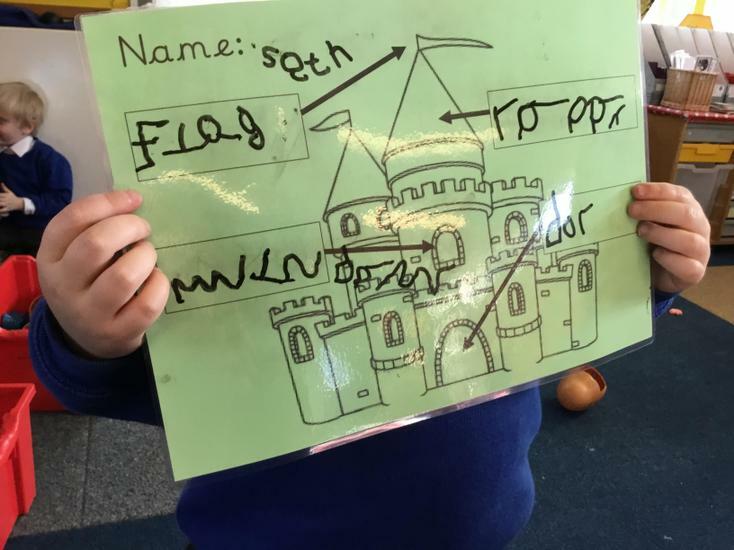 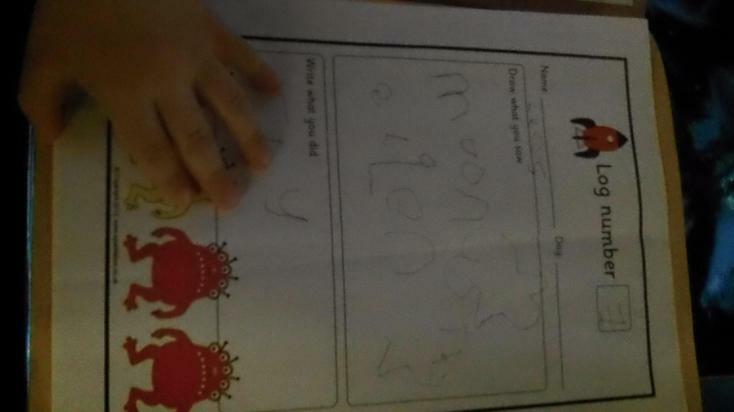 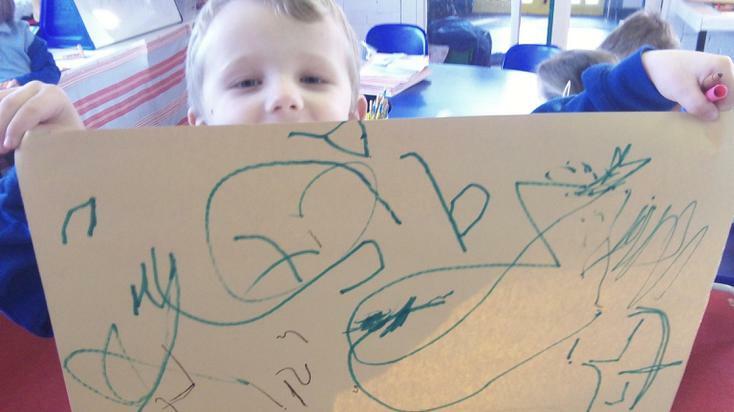 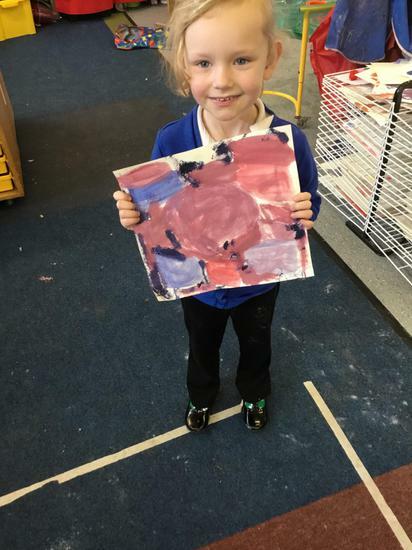 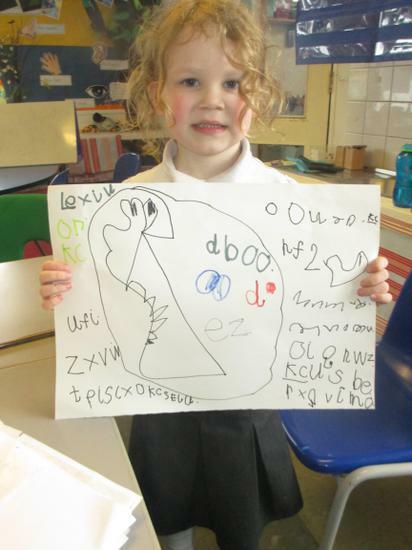 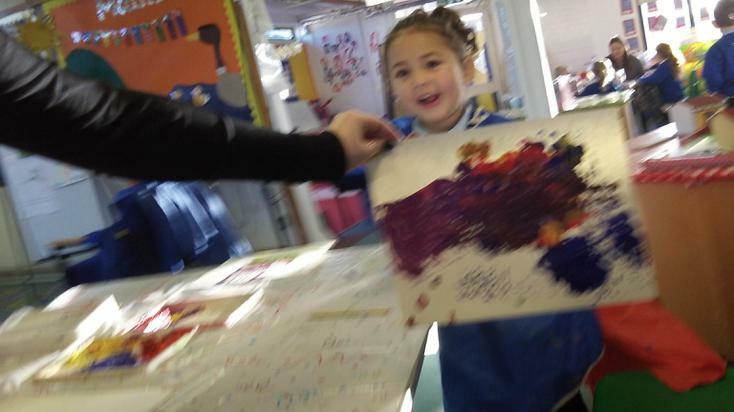 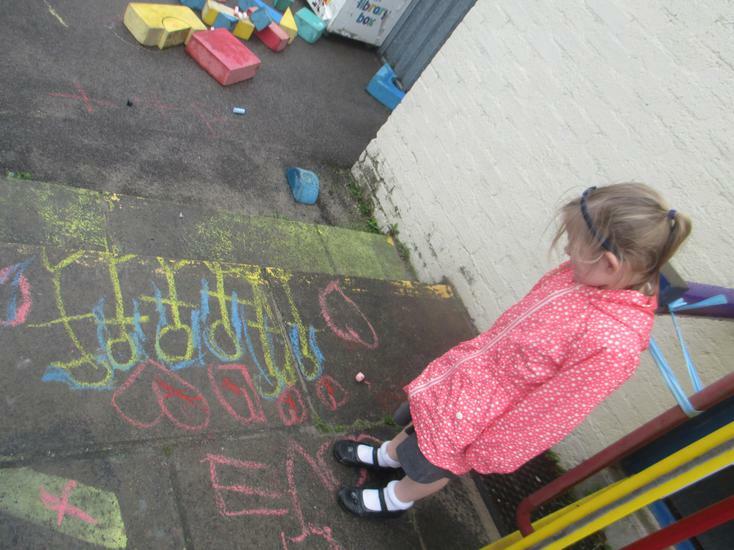 Evie labelled her picture with the initial sounds. 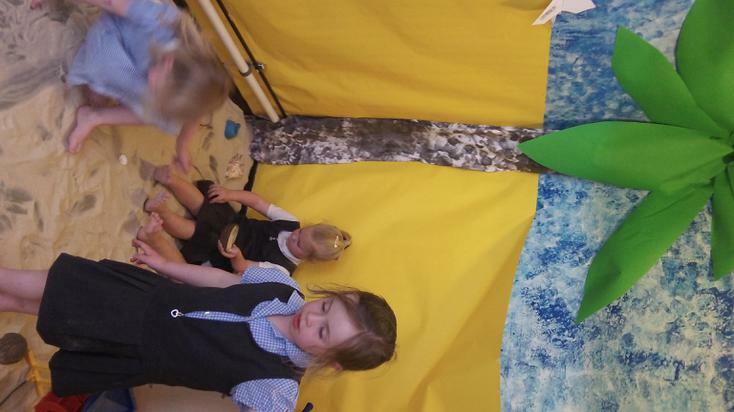 Welcome to summer term of Reception, we are really looking forward to learning around our main theme of 'Journeys'. 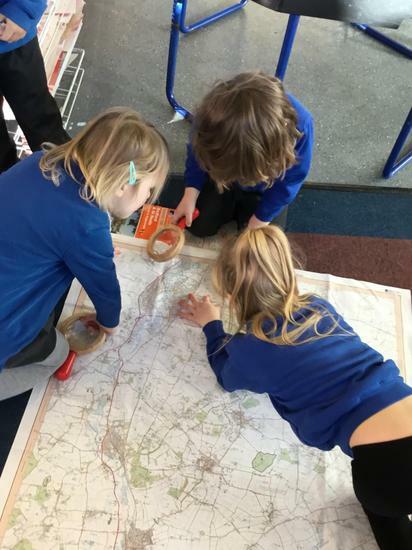 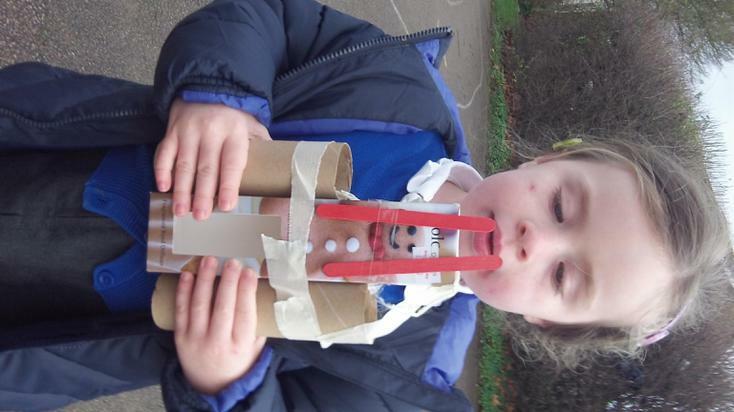 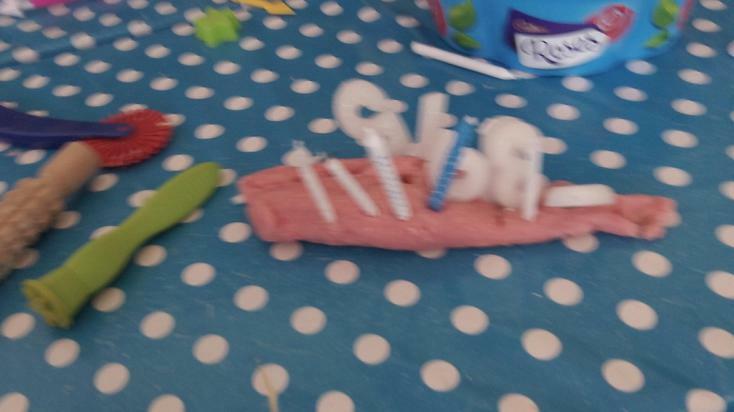 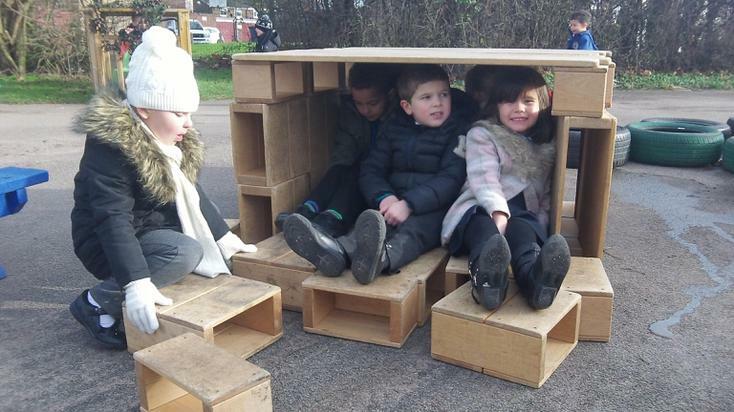 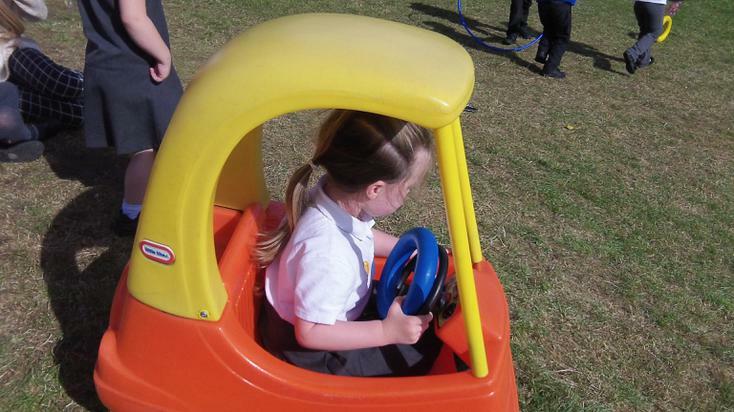 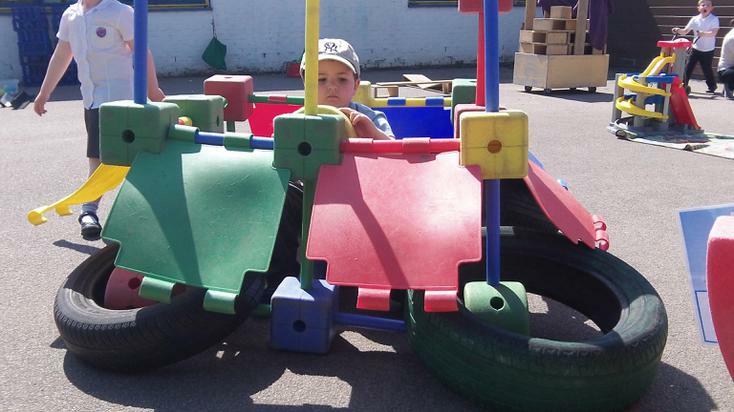 The children will be focussing on journeys of all different types - in a plane or rocket, on foot, by train, boat or car - and to lots of different places. 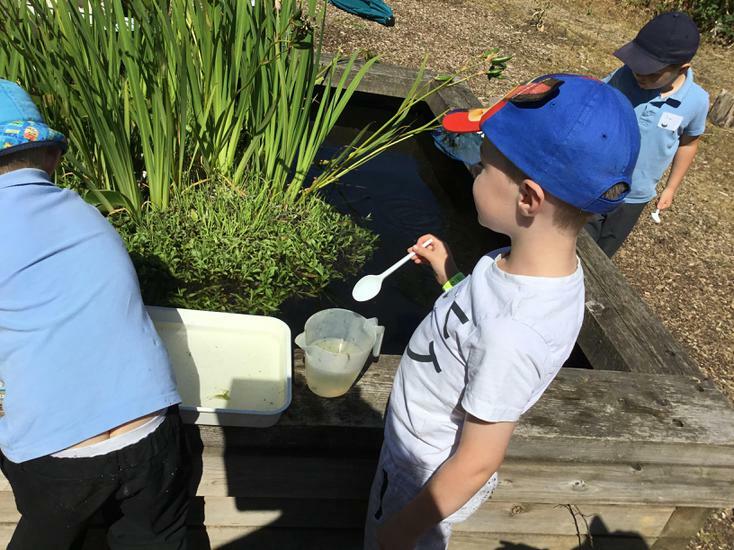 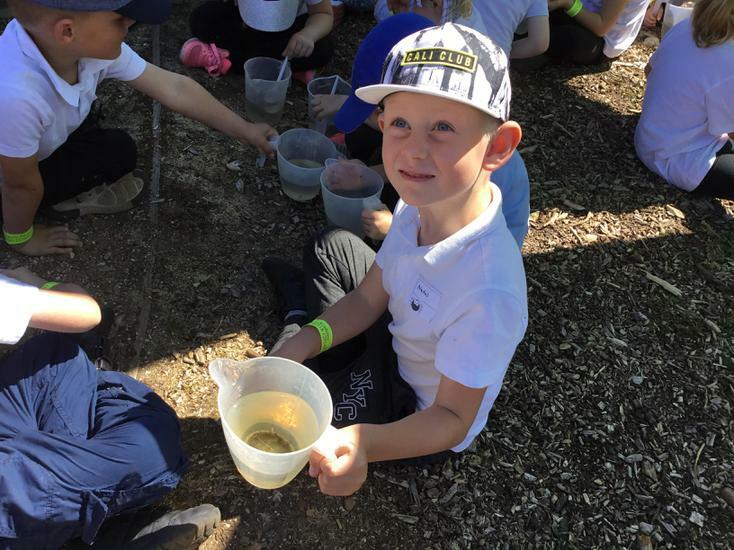 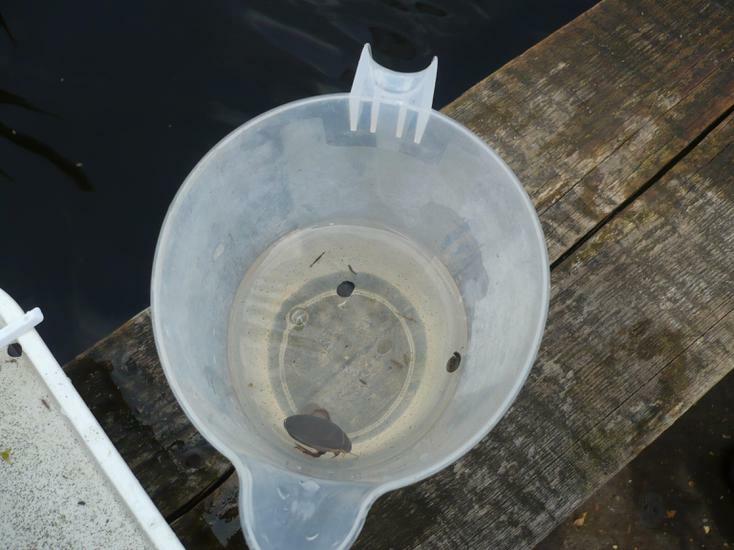 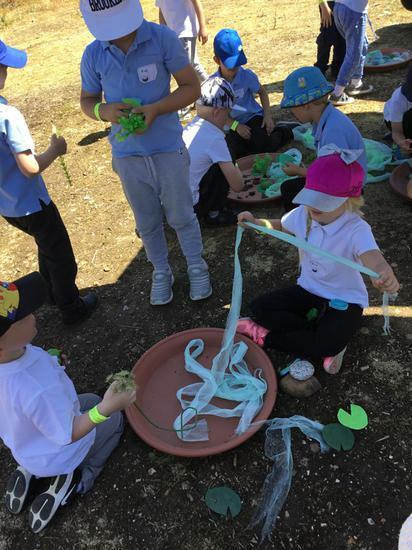 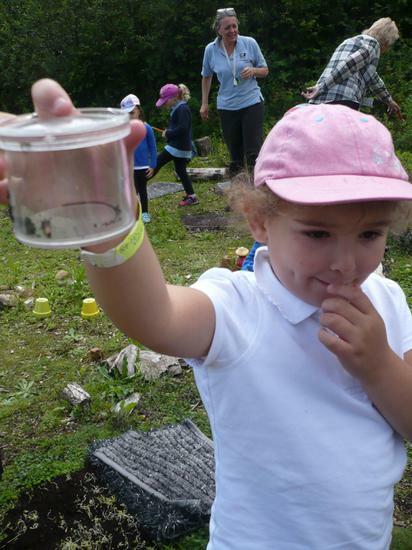 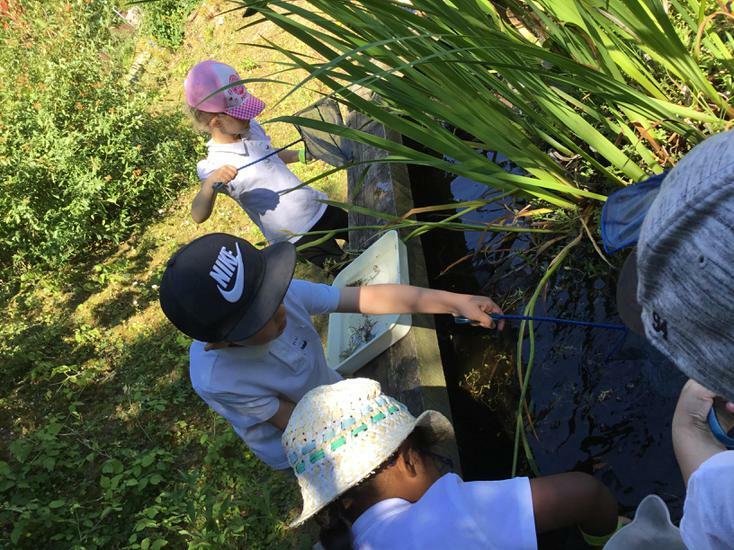 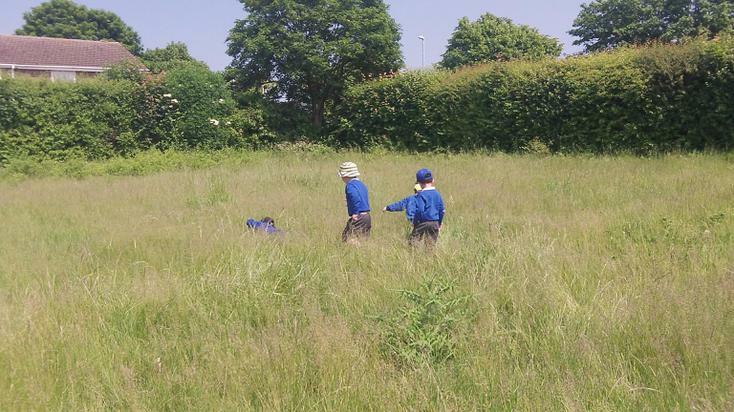 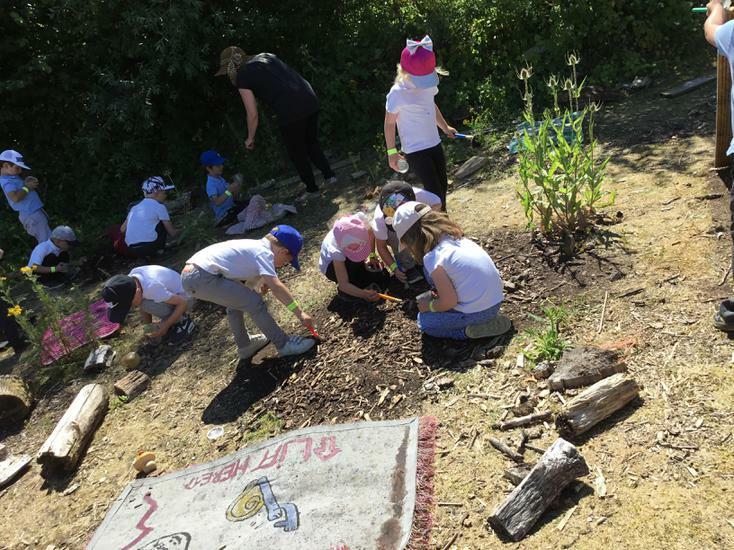 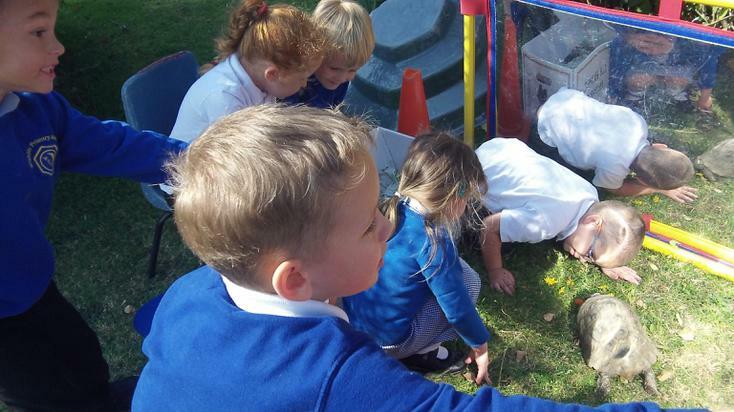 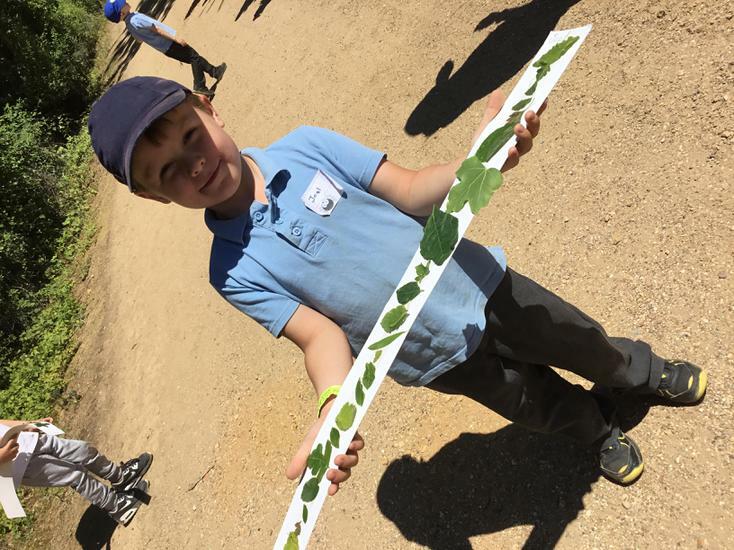 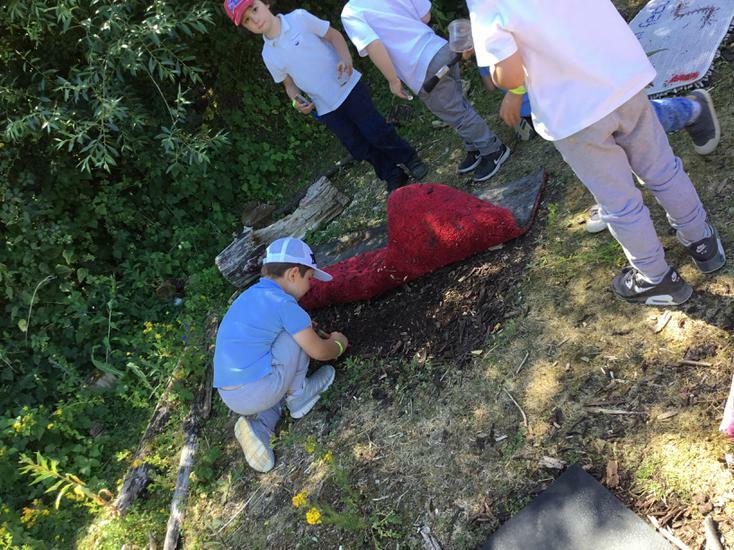 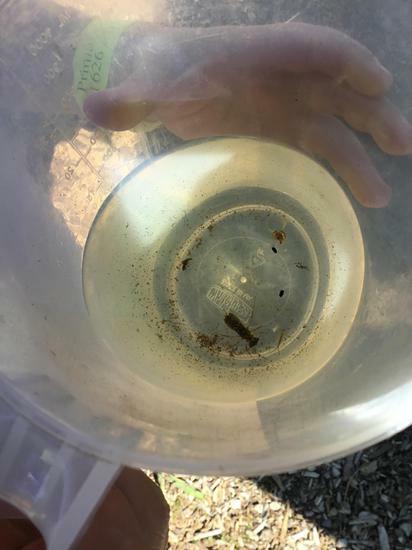 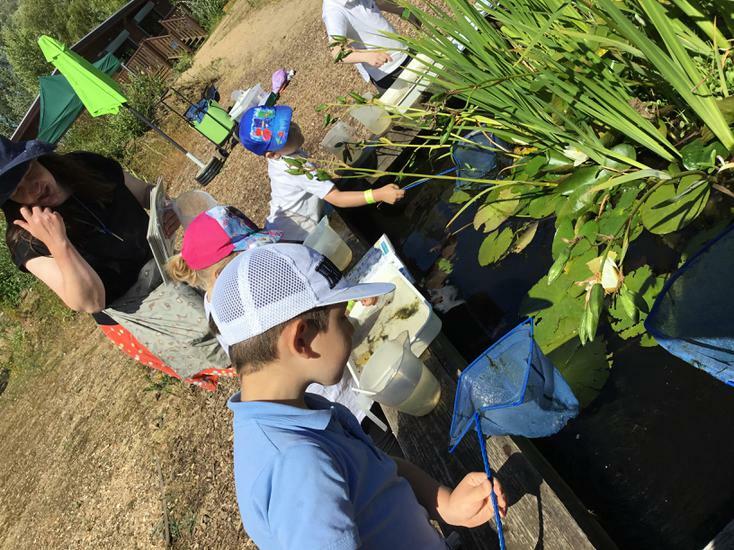 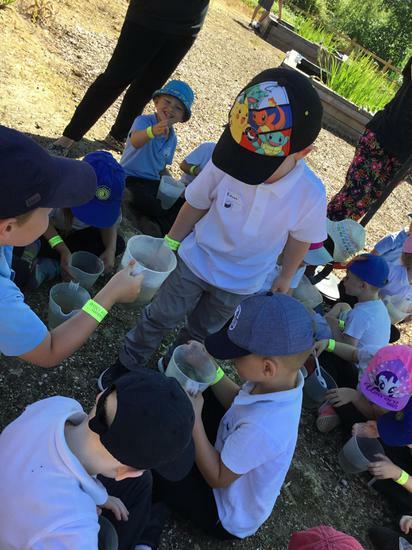 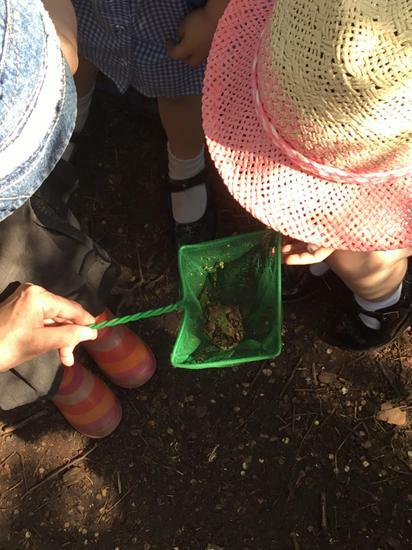 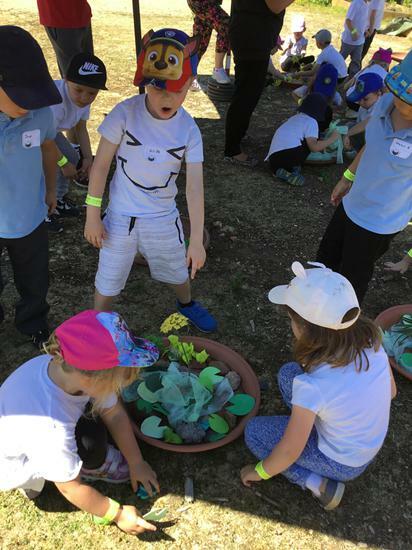 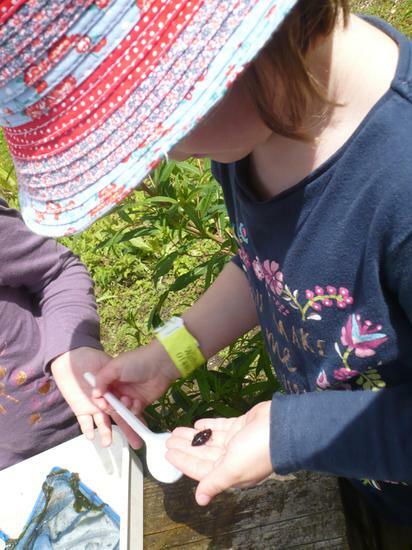 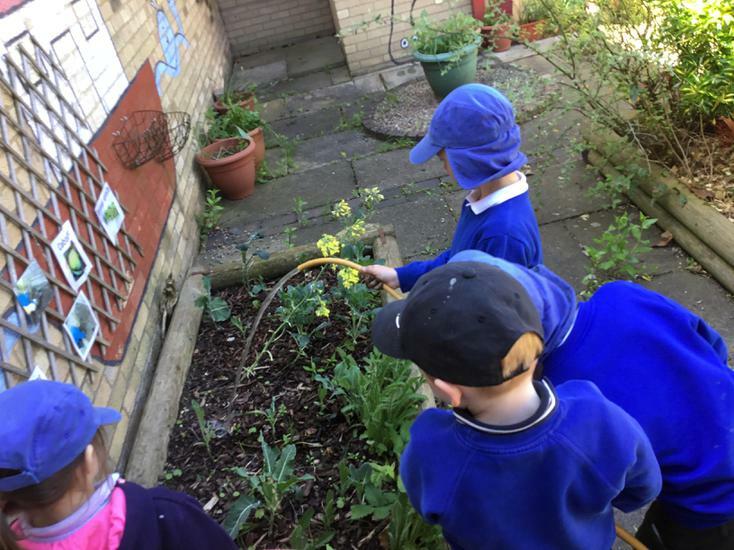 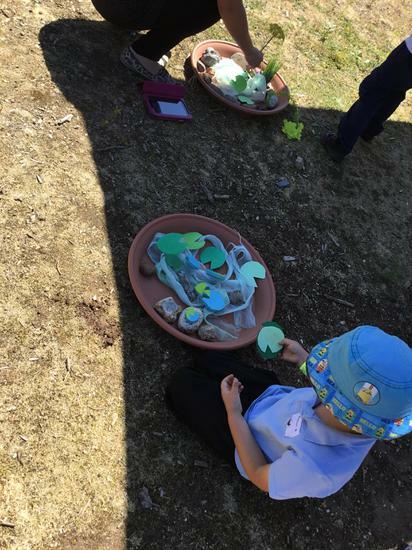 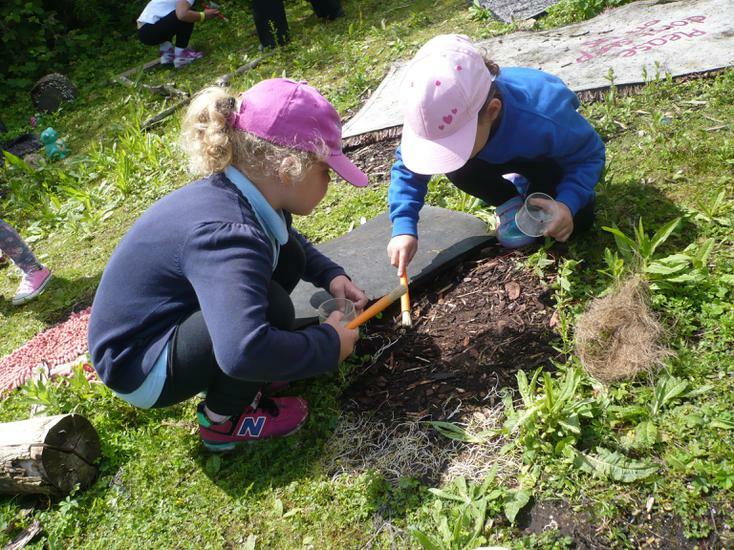 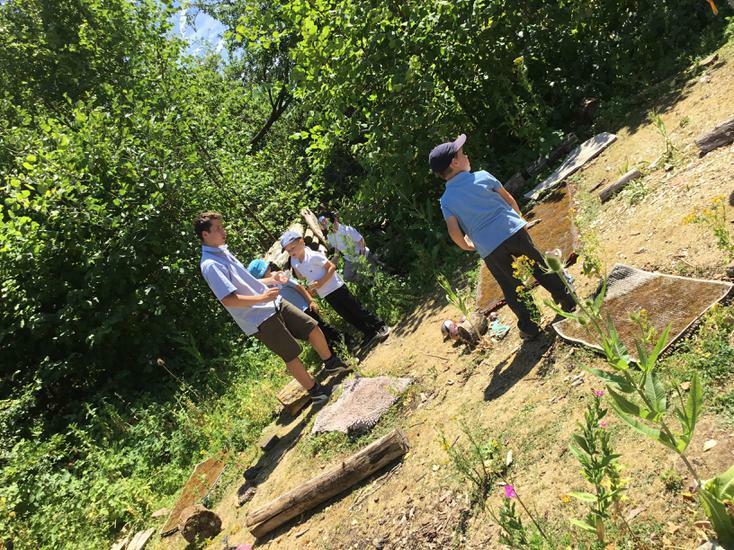 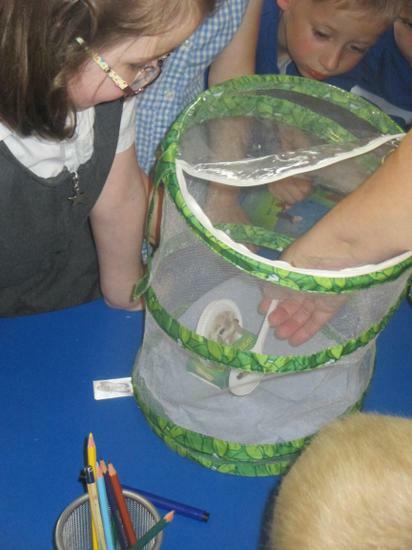 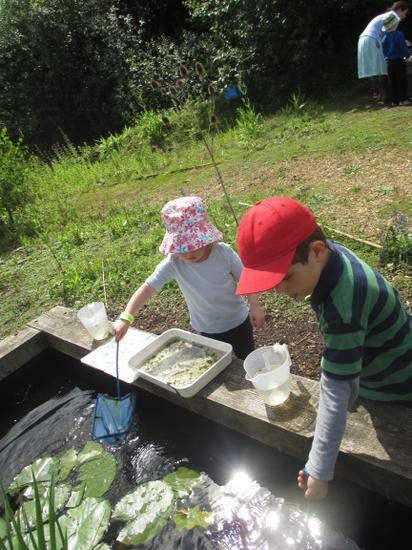 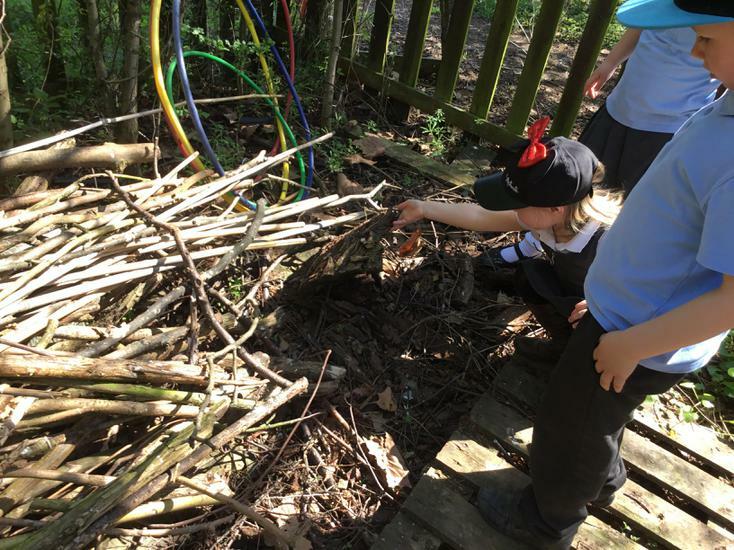 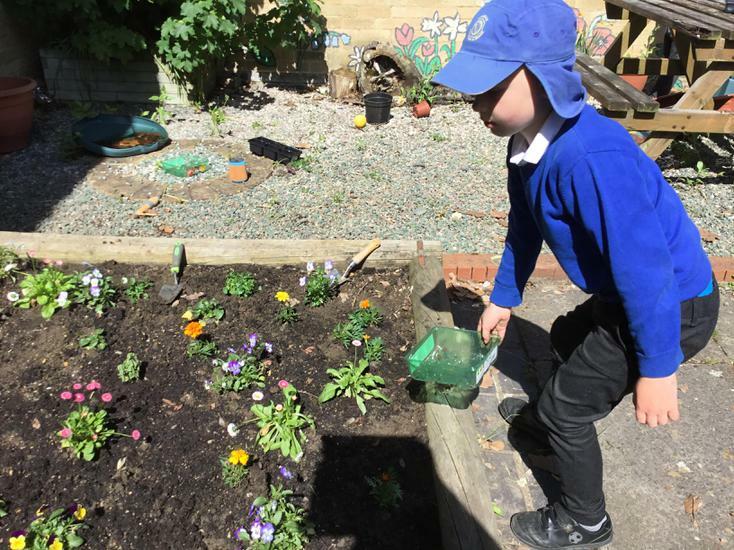 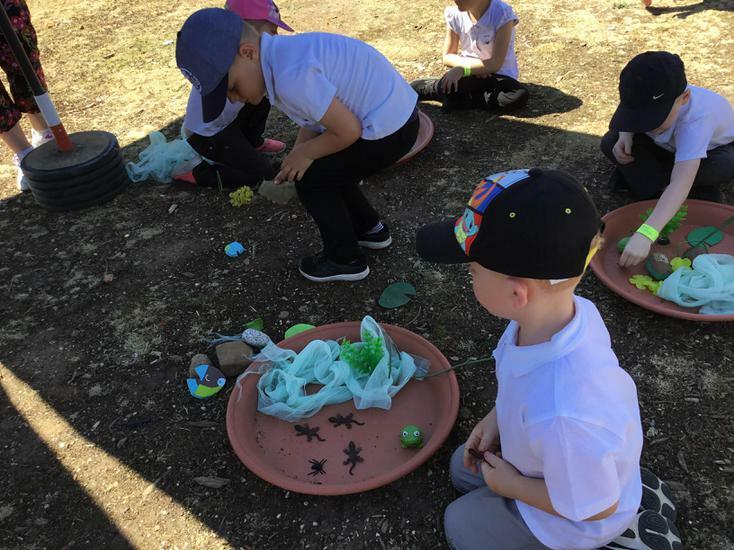 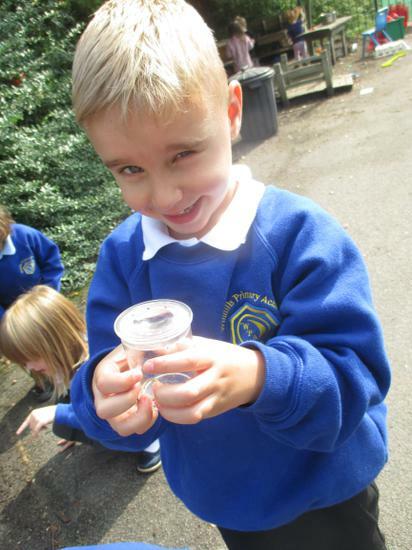 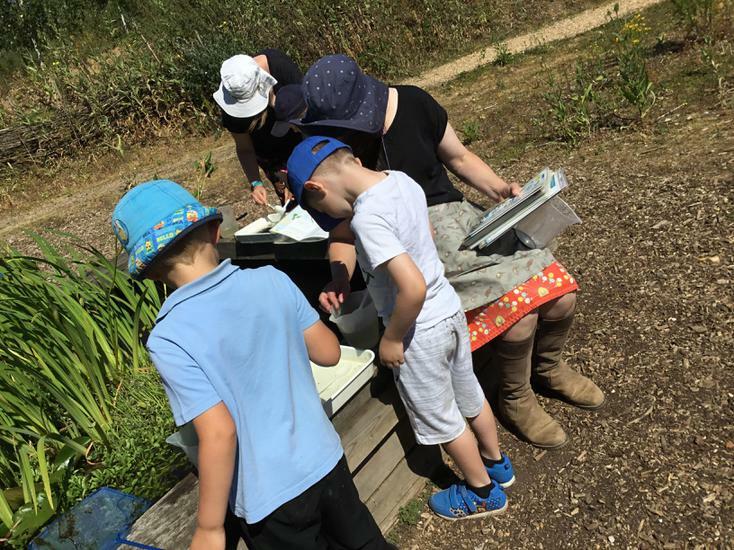 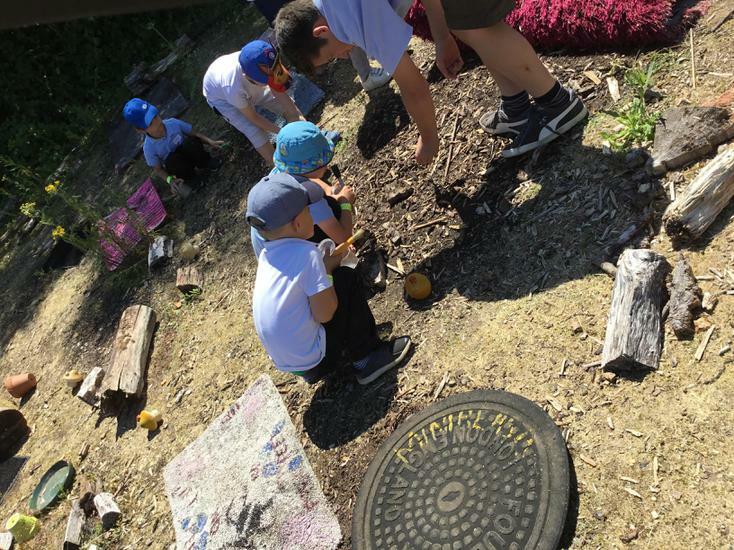 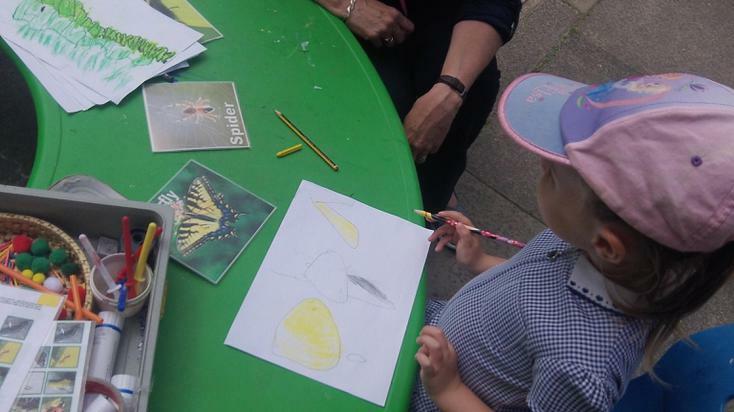 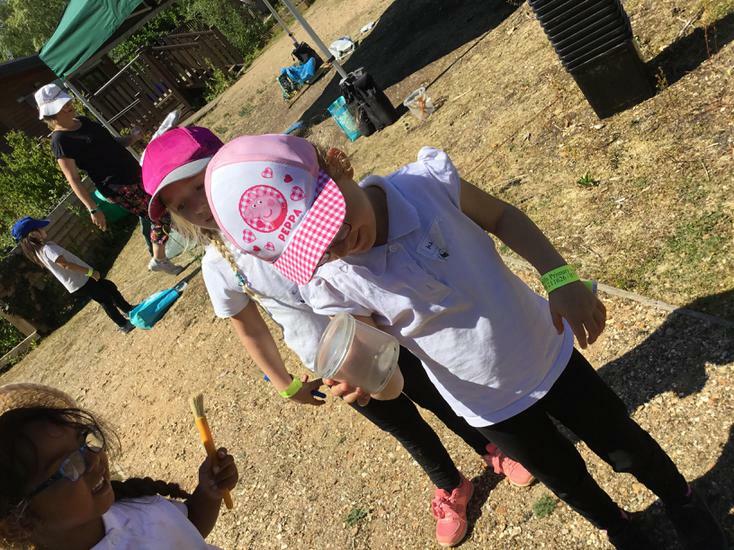 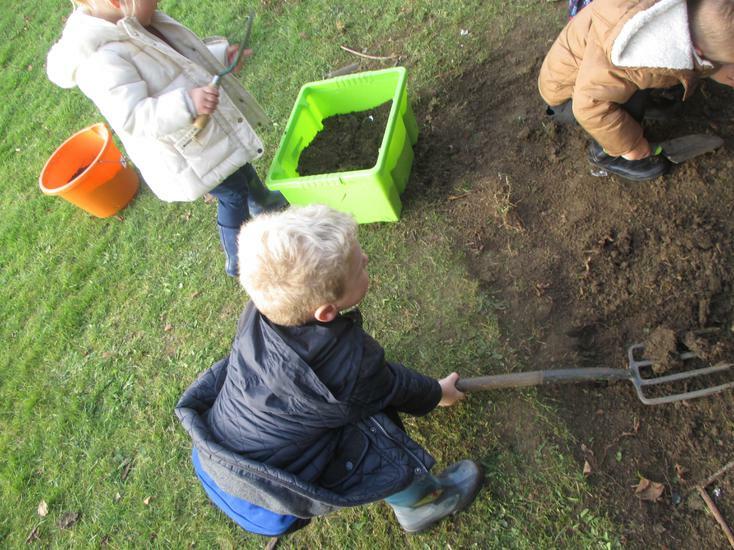 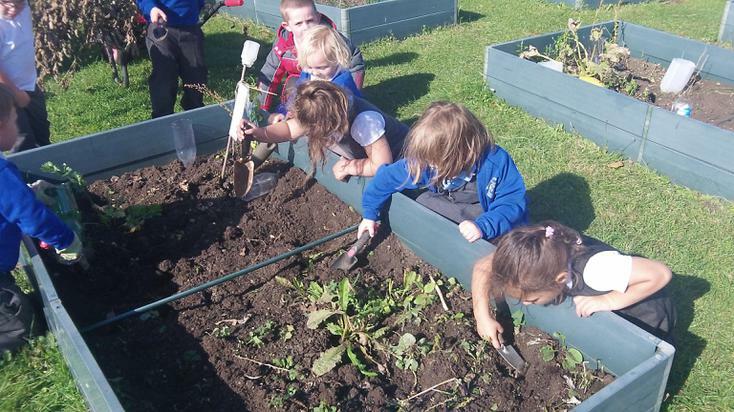 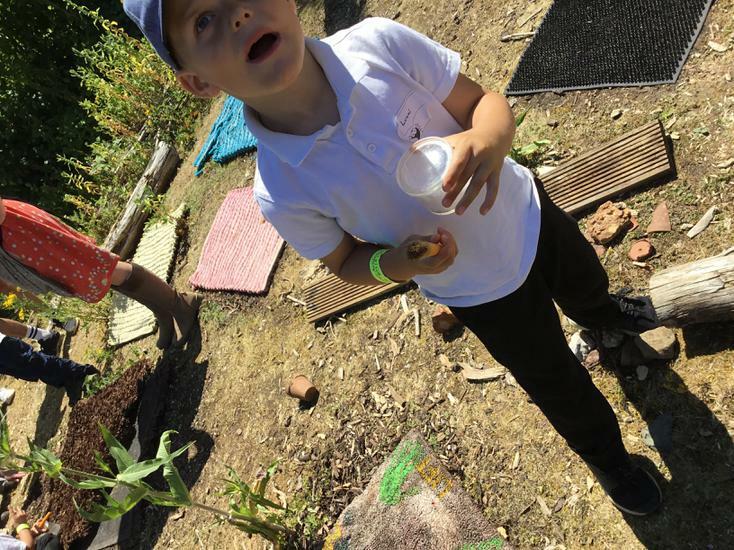 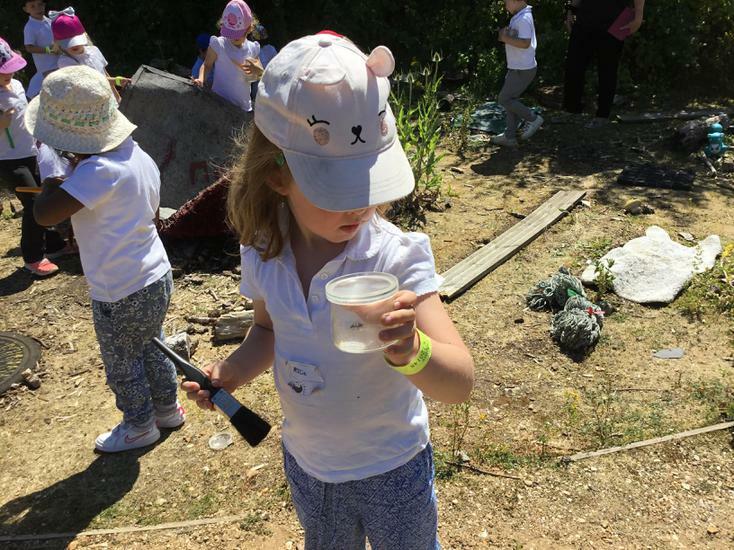 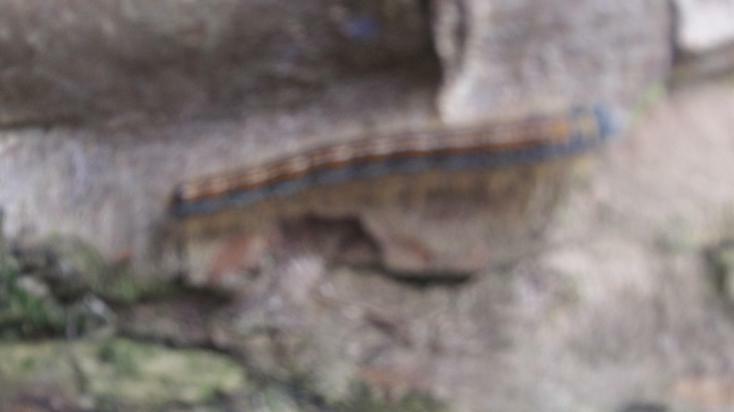 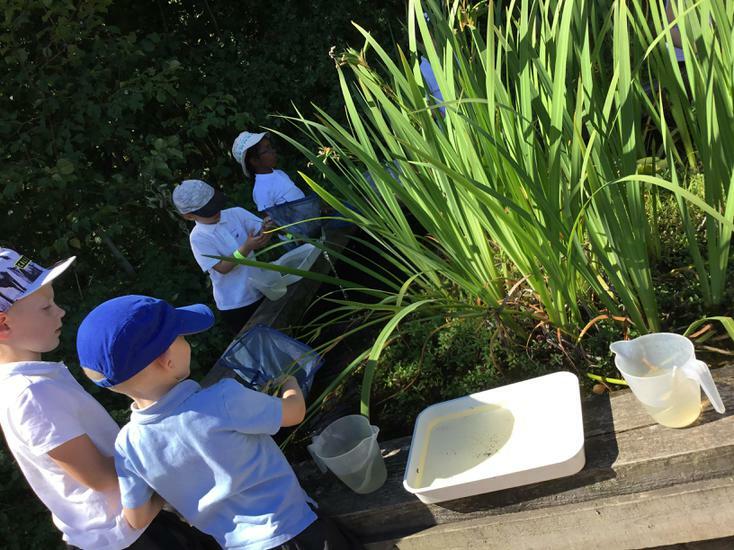 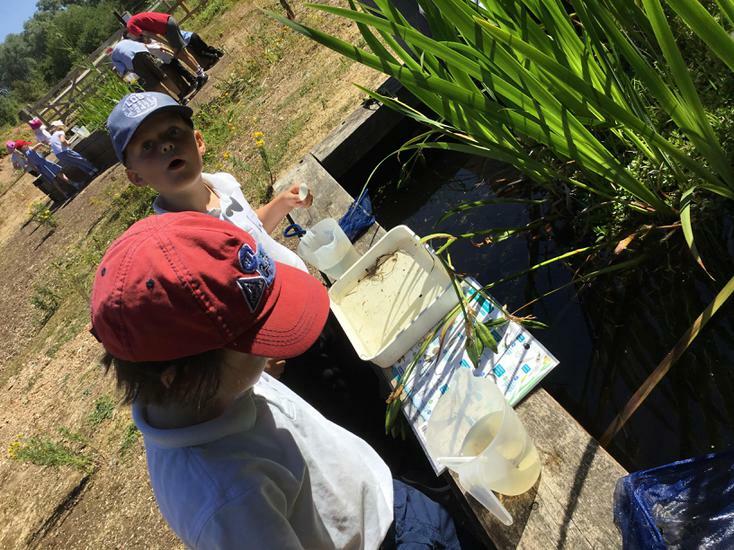 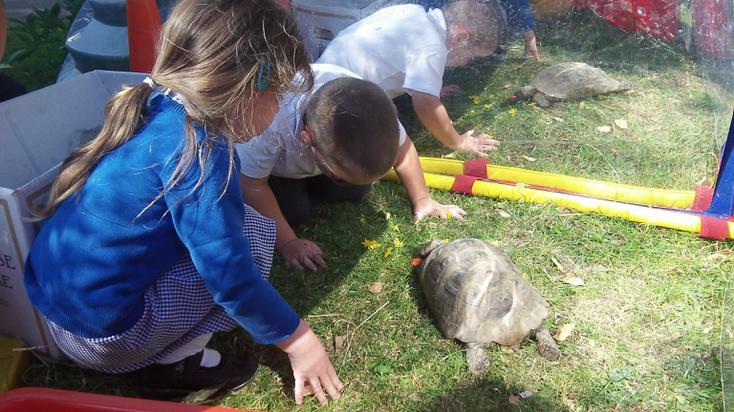 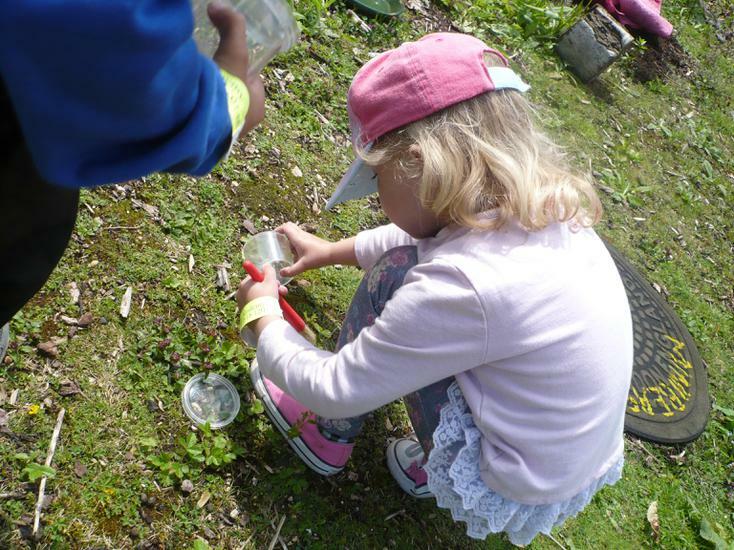 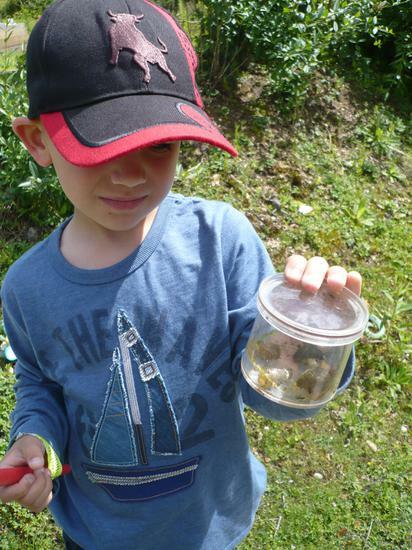 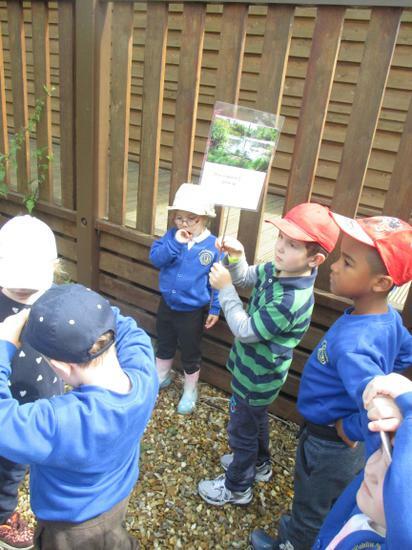 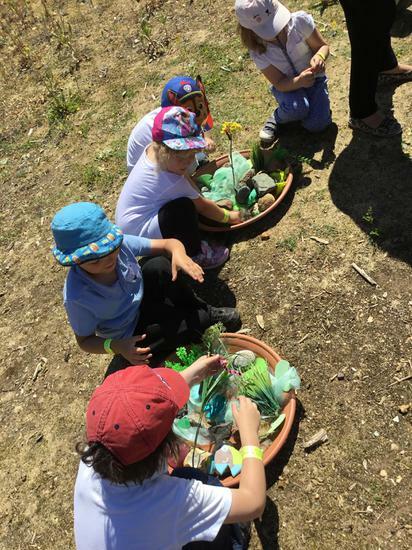 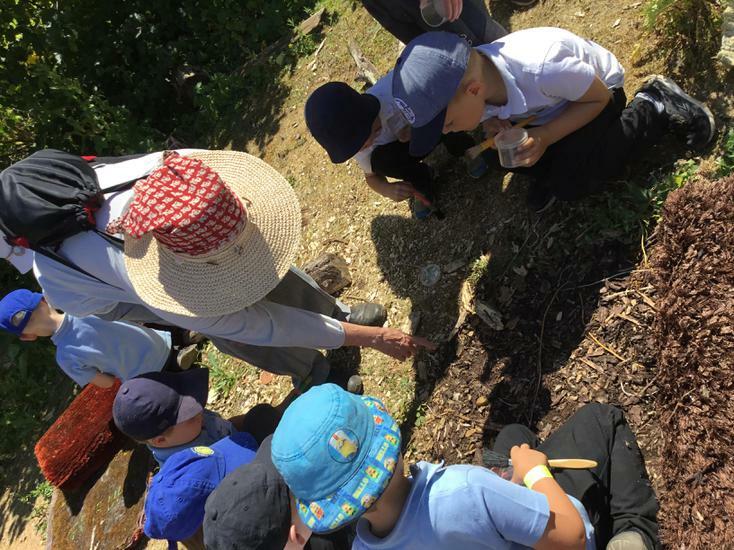 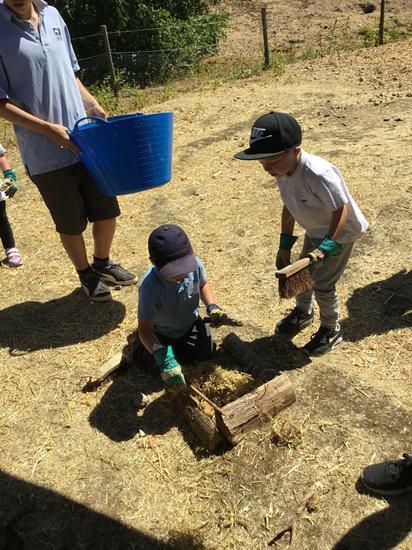 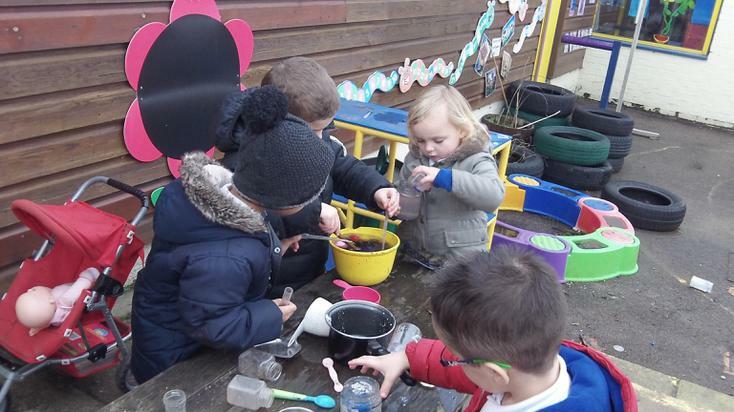 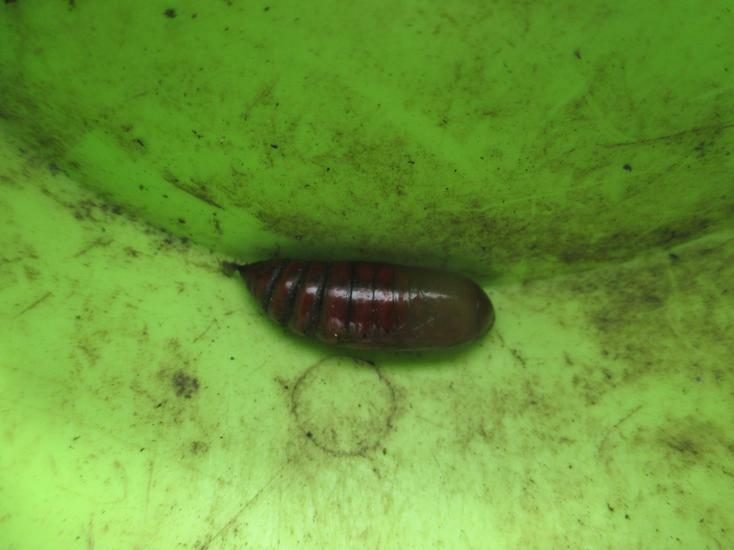 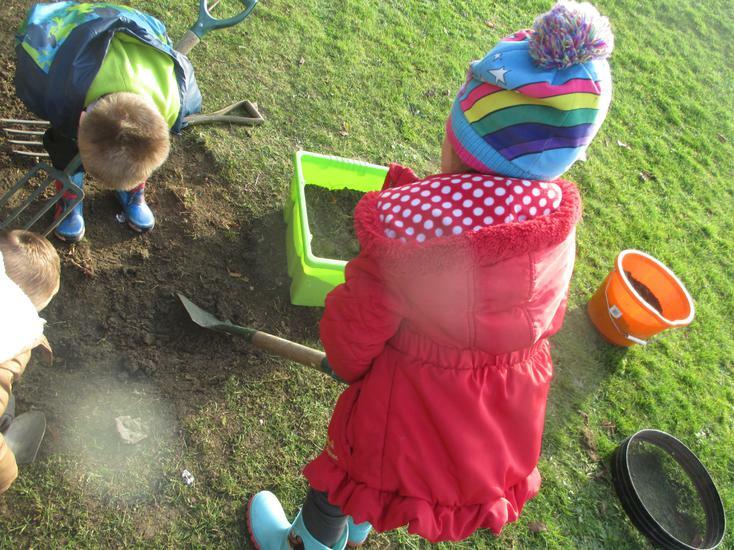 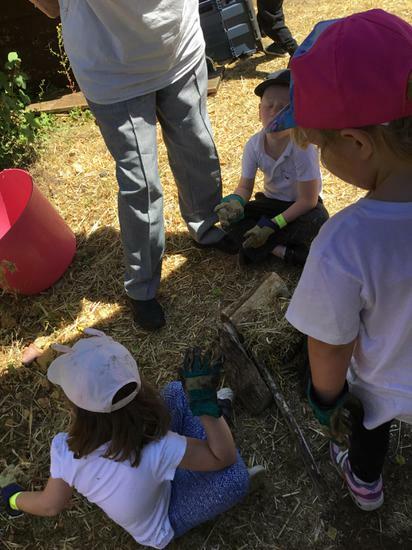 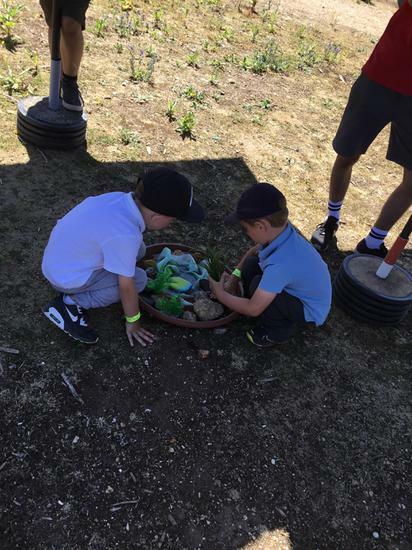 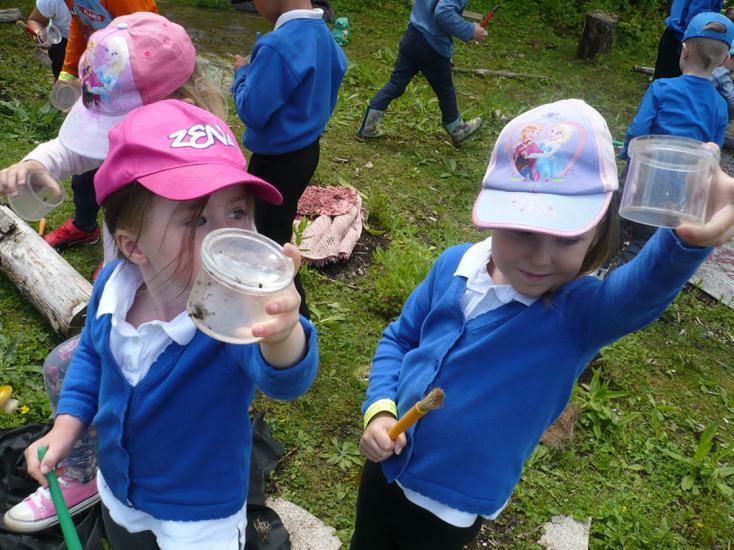 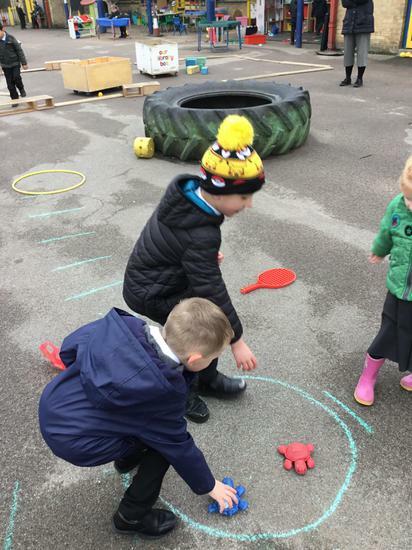 As well as this, we will be enjoying the outside environment as the weather is getting warmer, by digging and planting, bug hunting and bird watching, and looking at and explaining all the differences in the environment as the seasons change; including life cycles by hatching our own tadpoles and butterflies. 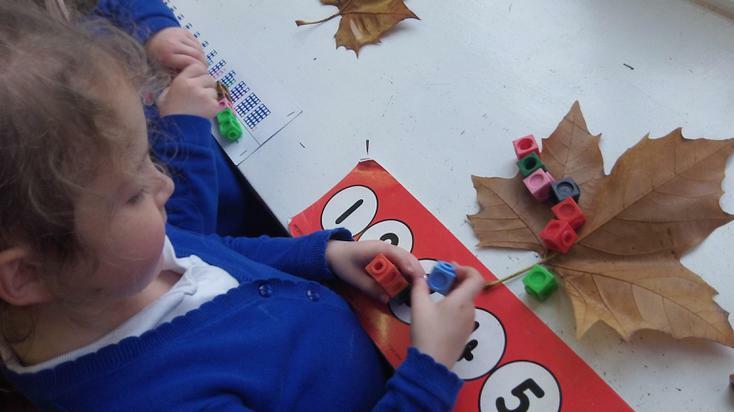 In maths we will be learning about doubling, halving and sharing in practical contexts as well as securing our existing mathematical knowledge of counting, addition, subtraction, shape and using mathematical language. 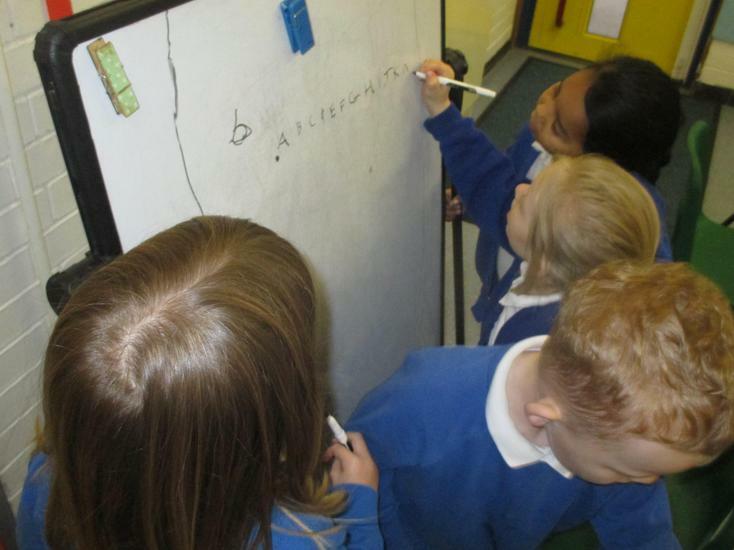 We will continue learning new sounds, and practising our segmenting and blending, as well as becoming more confident with our word walls. 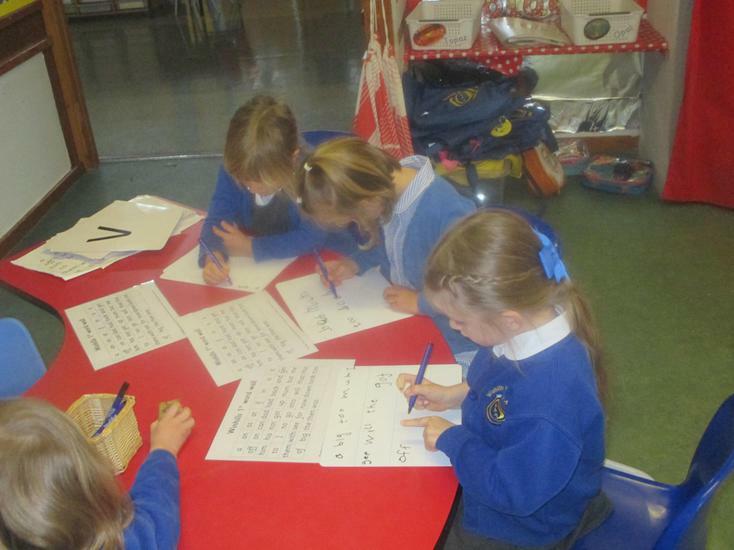 We will develop our writing through increasing confidence and independence, allowing us to write some super sentences. 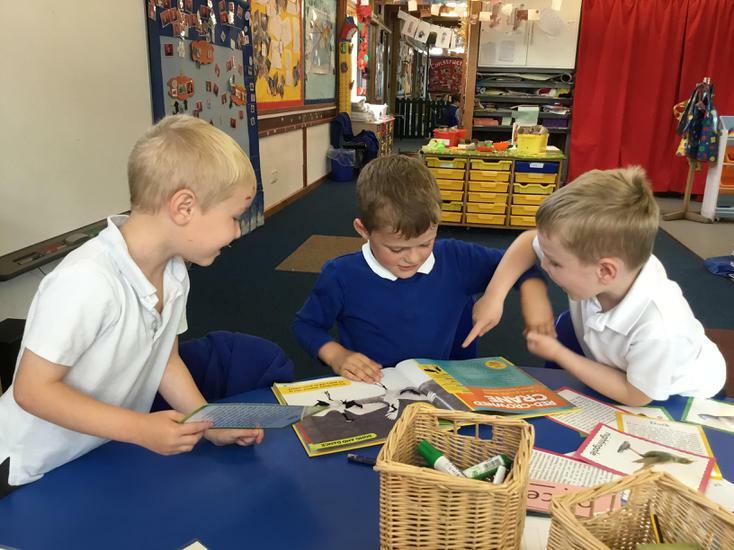 We will also continue our shared writing through exploring different books, creating story maps, writing about them, acting them out and creating our own versions. 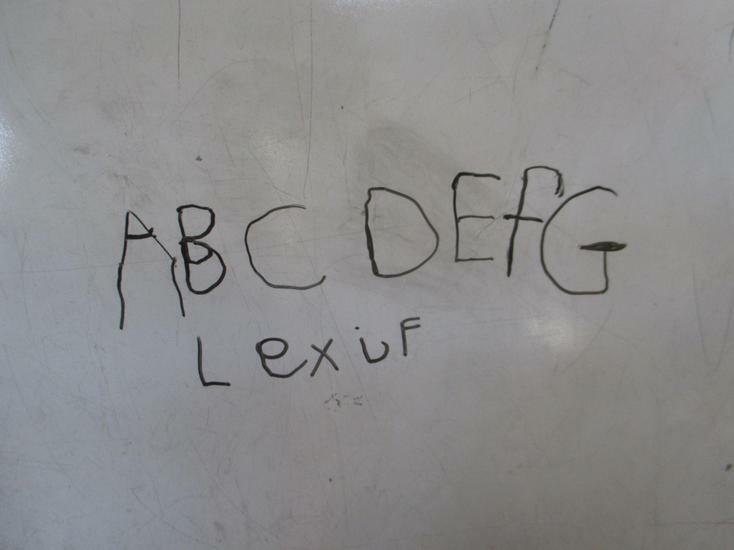 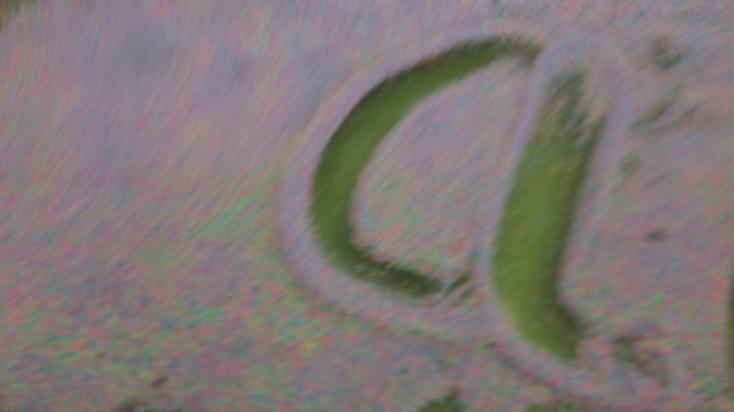 Welcome to the Spring Term. 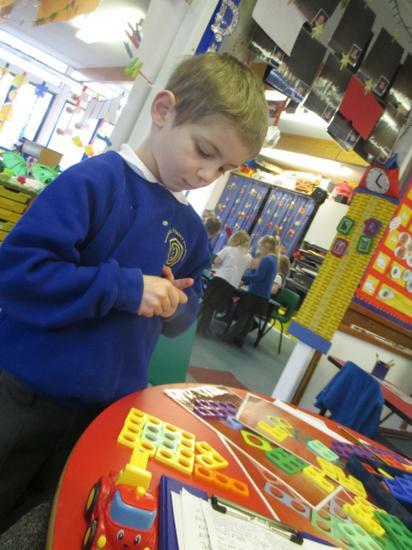 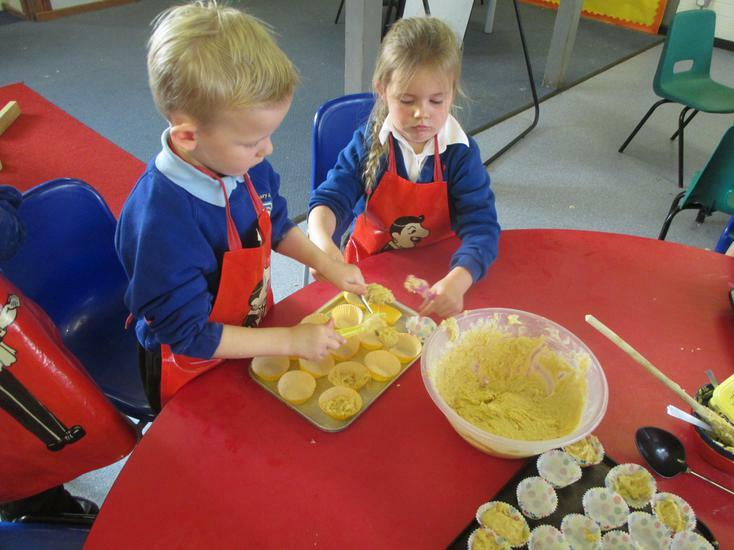 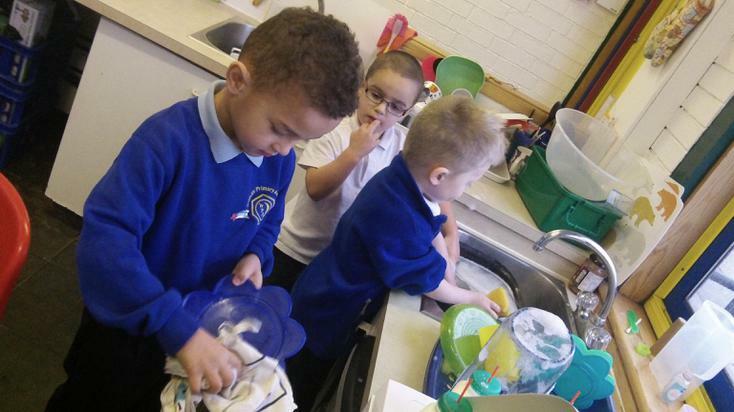 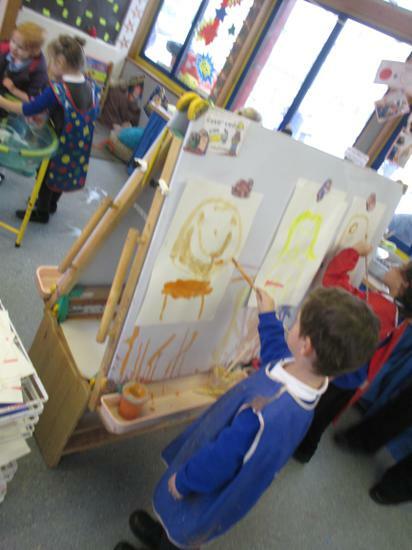 the children are growing in independence, skill set and knowledge. 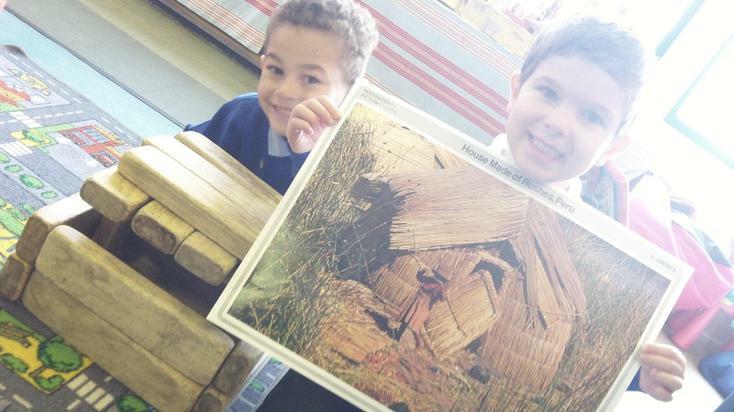 To reflect this our topic of 'Homes' aims to develop the children's knowledge and understanding of the world around them. 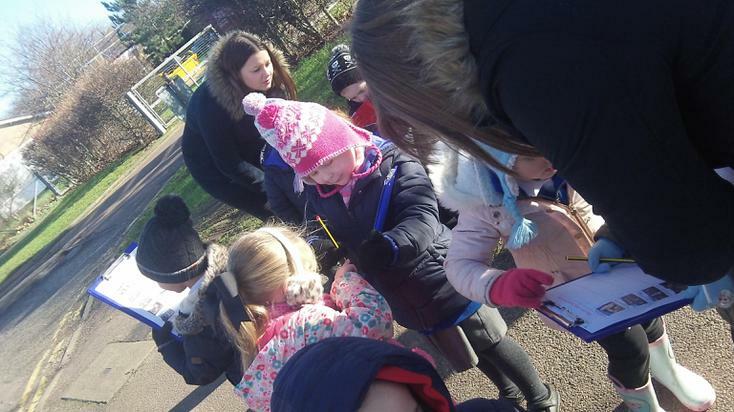 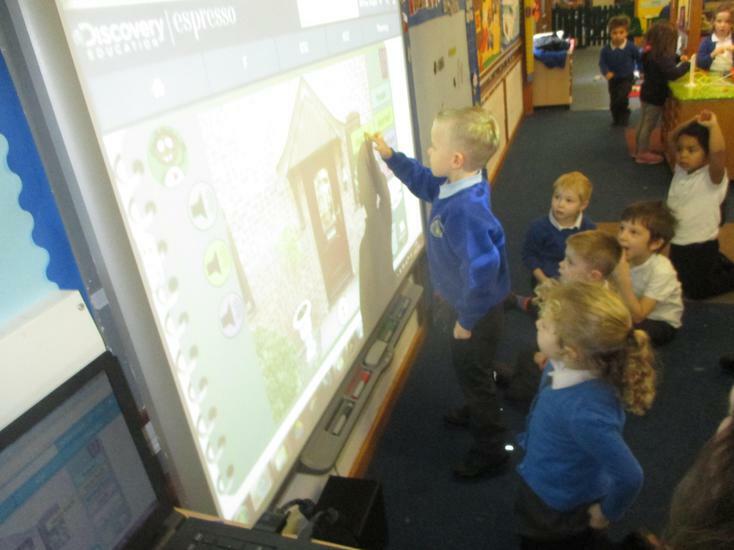 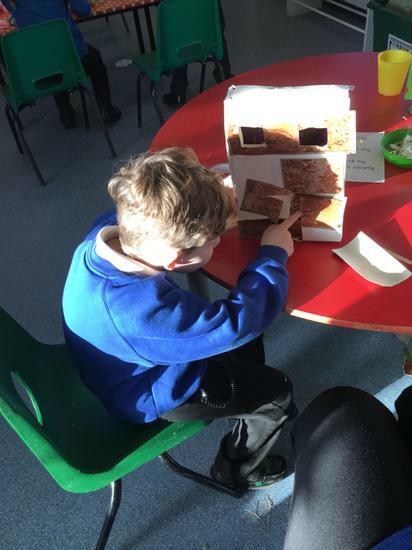 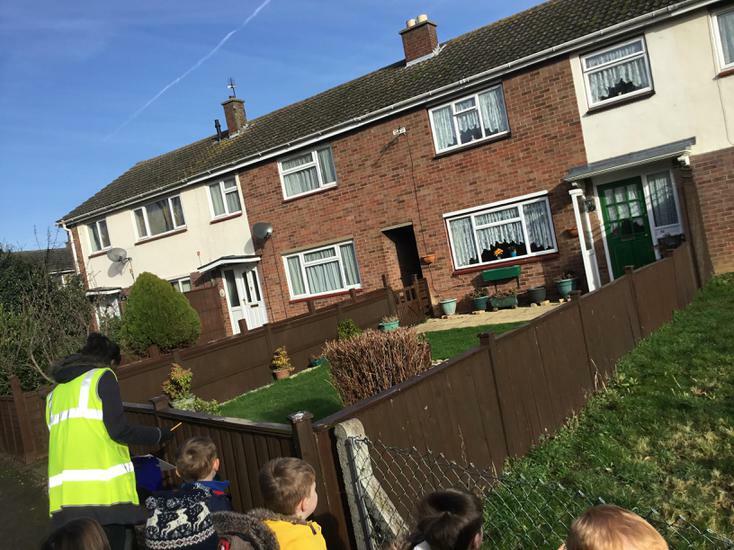 The children will take a tour of their local environment to learn about the different types of houses and will be visited by an Estate Agent. 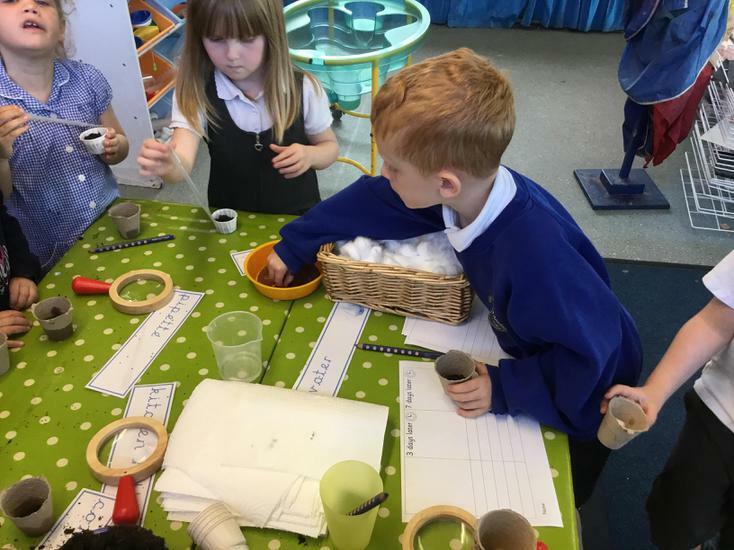 They will investigate materials and learn how to sort and describe them; they will observe similarities and differences as well as changes over time. 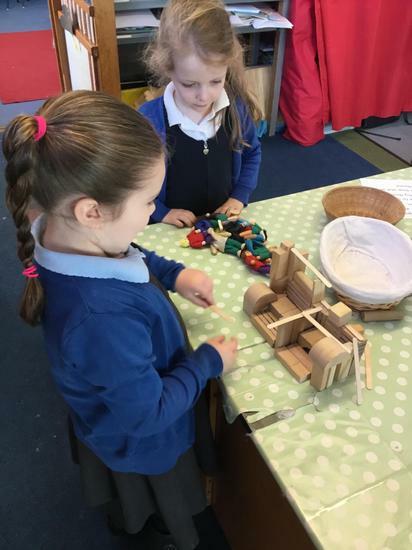 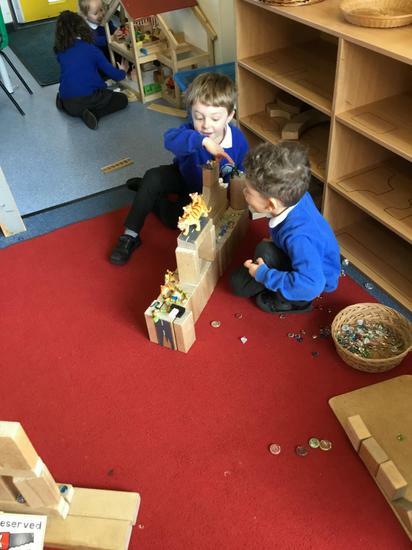 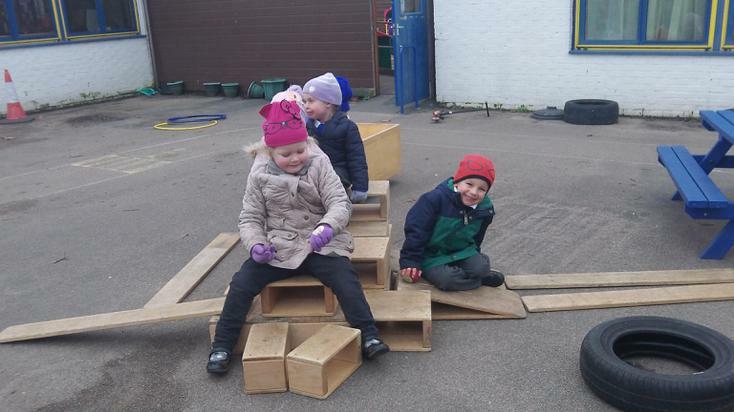 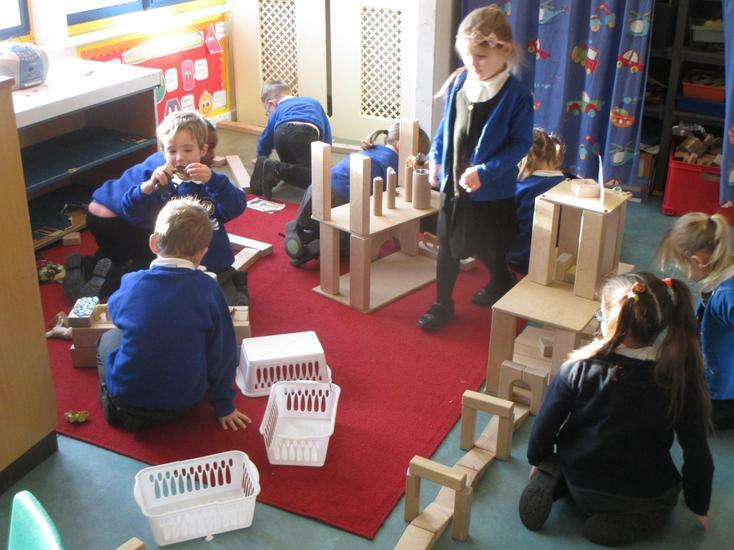 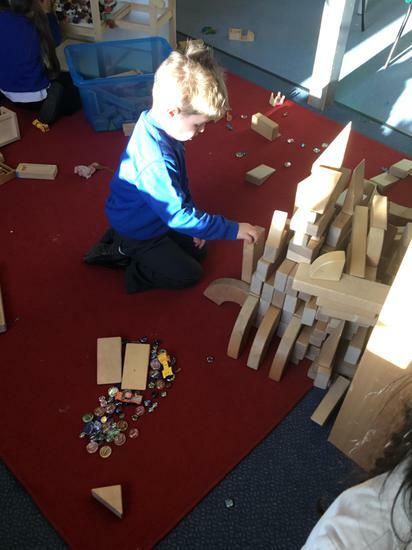 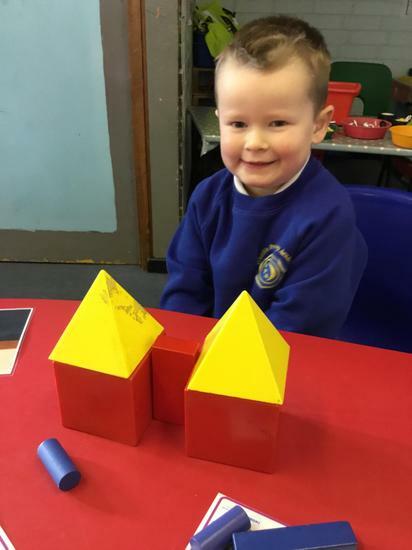 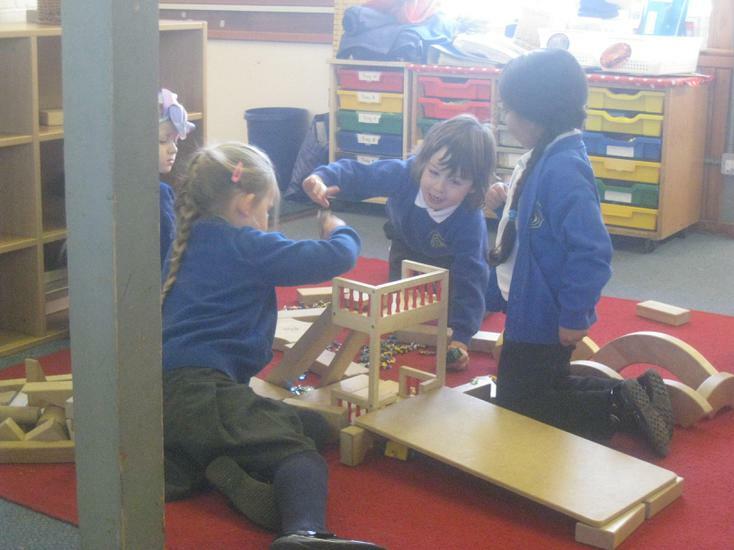 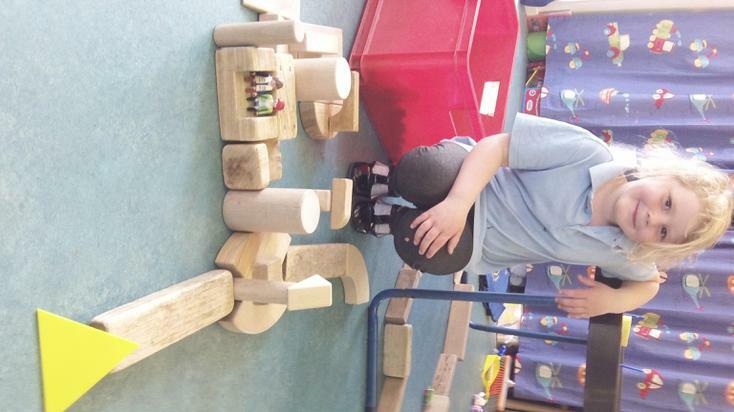 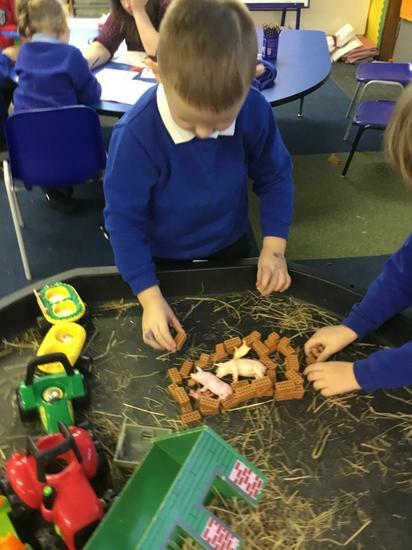 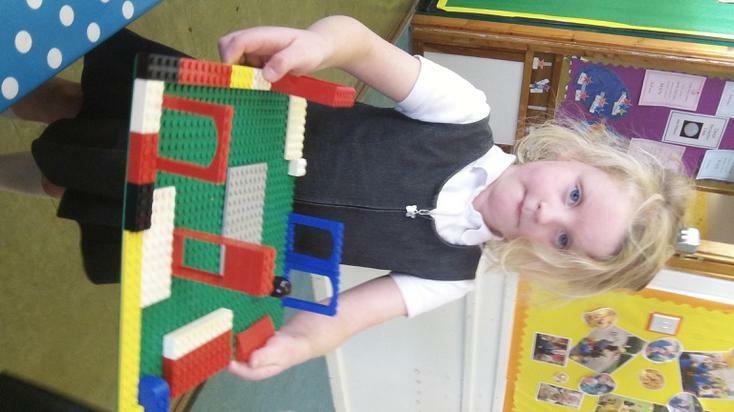 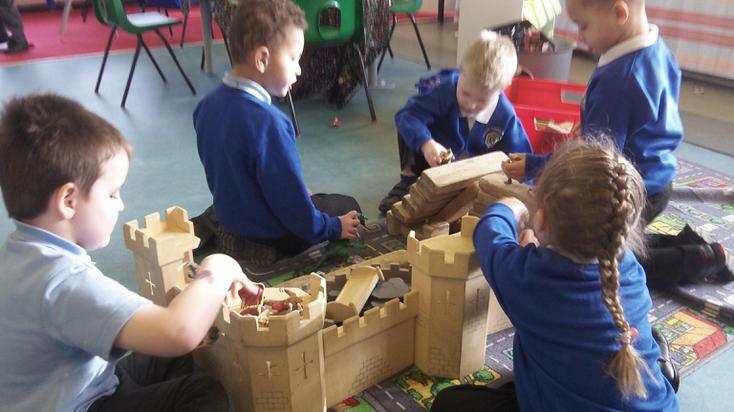 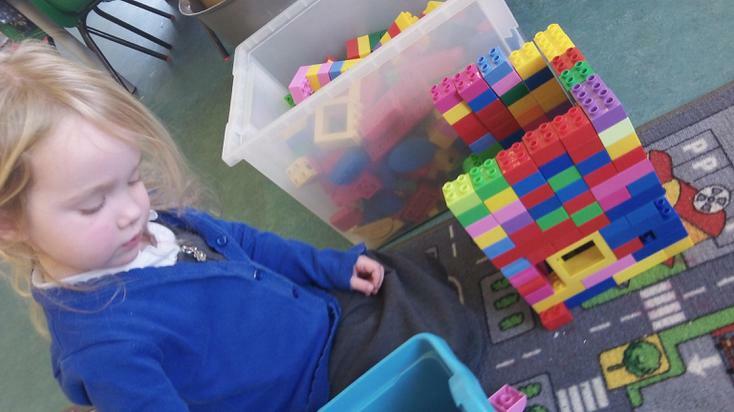 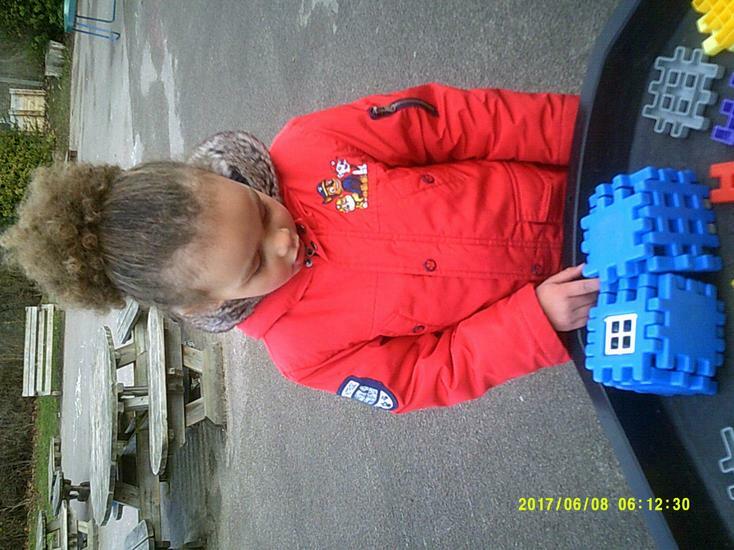 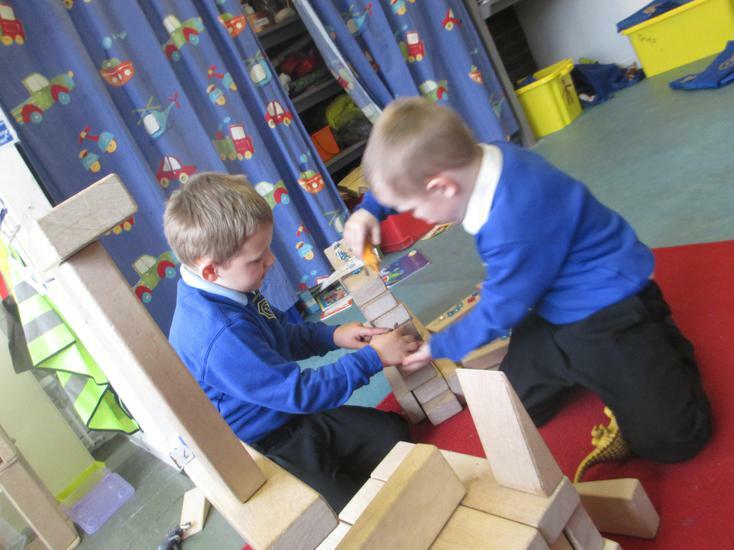 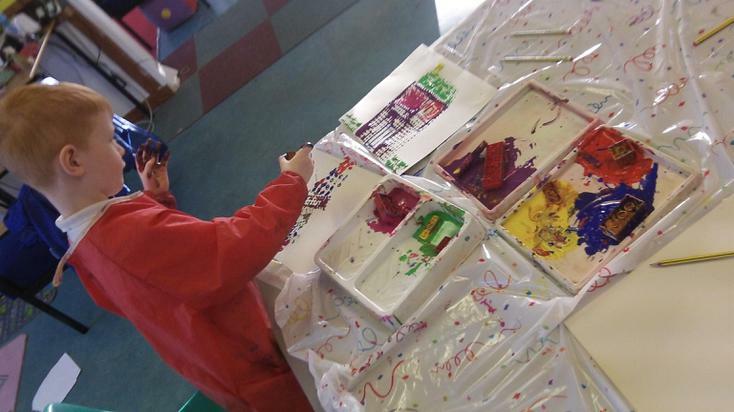 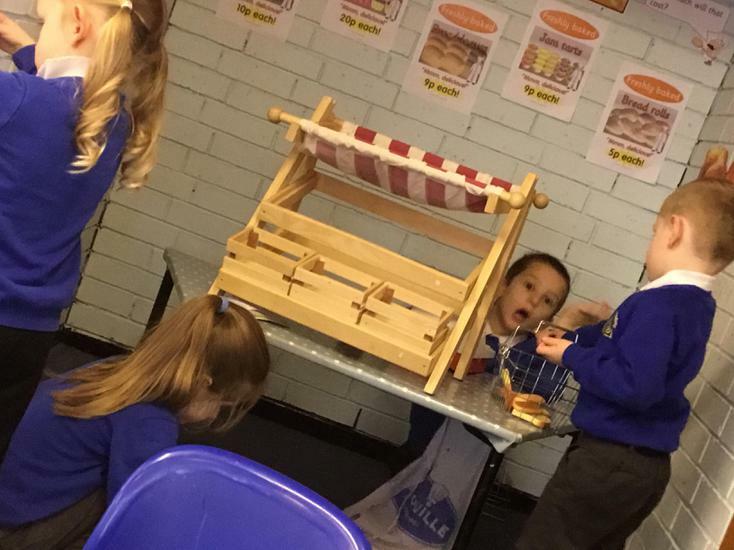 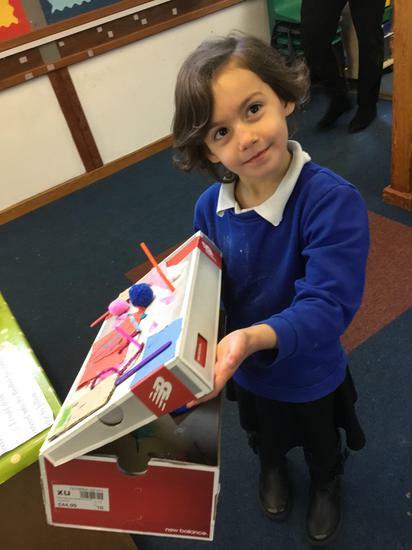 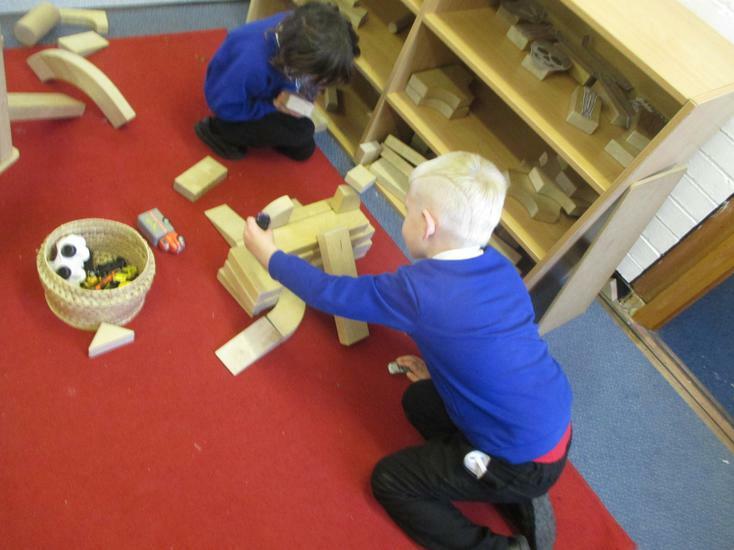 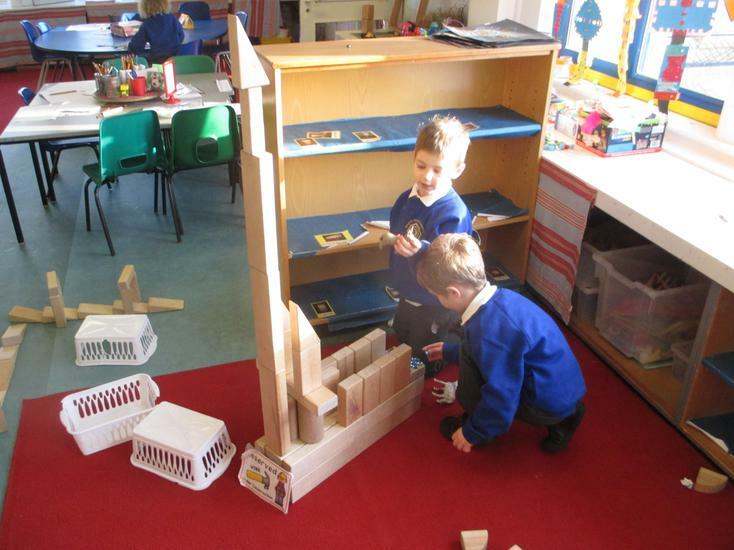 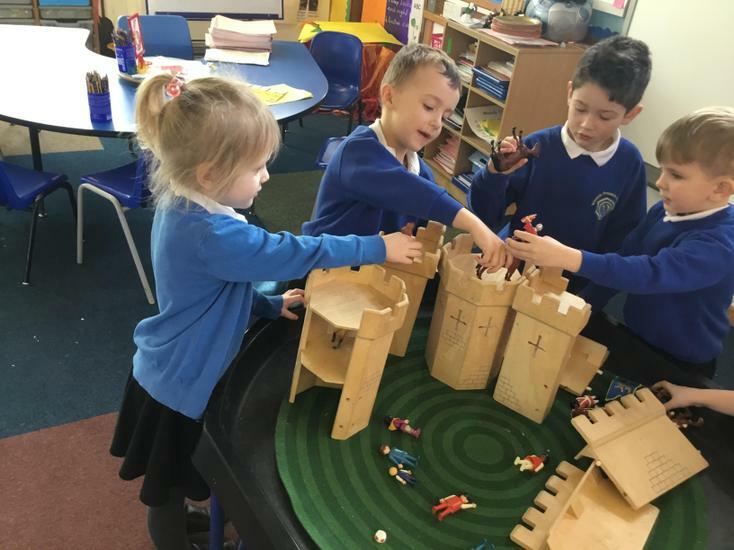 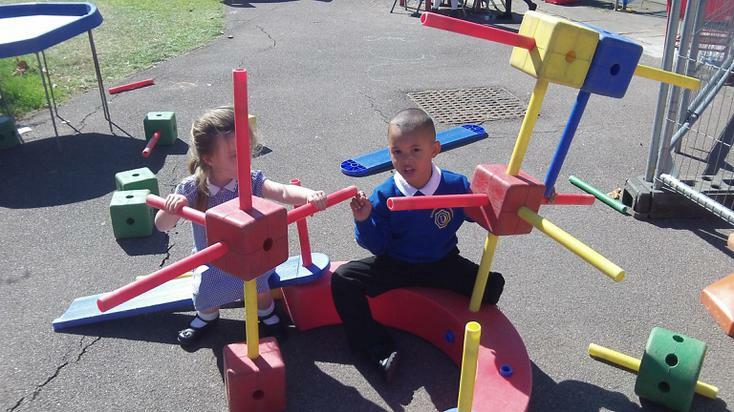 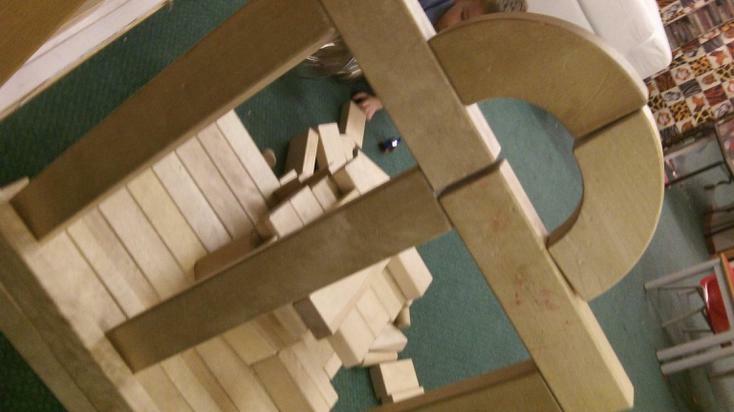 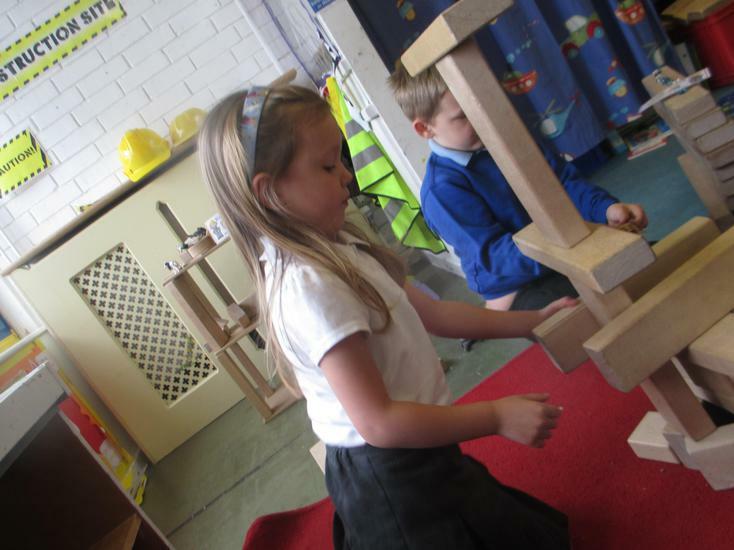 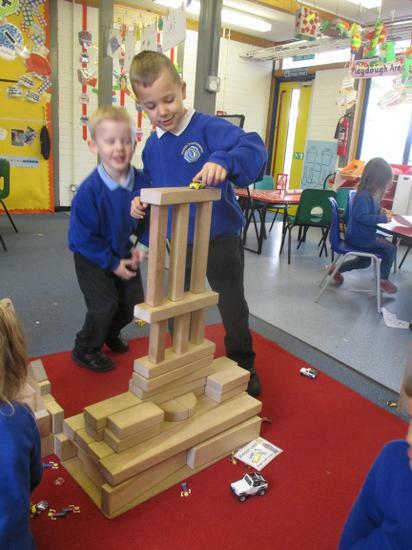 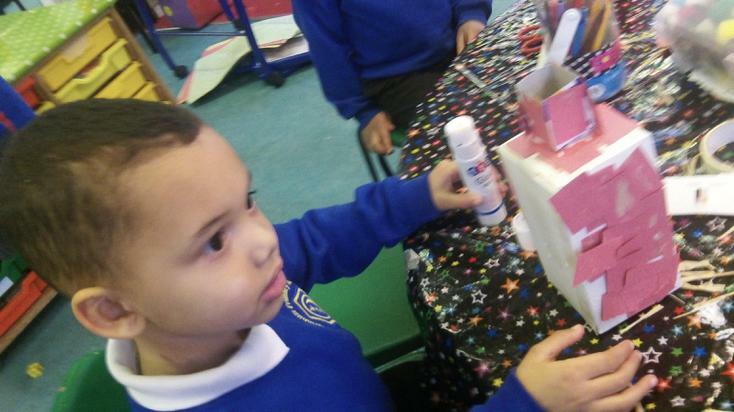 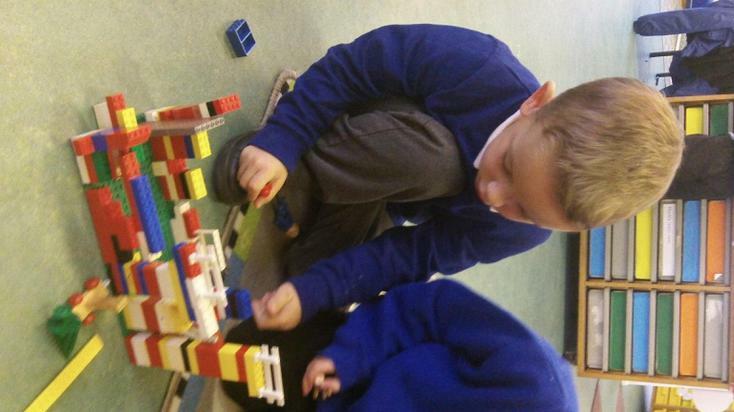 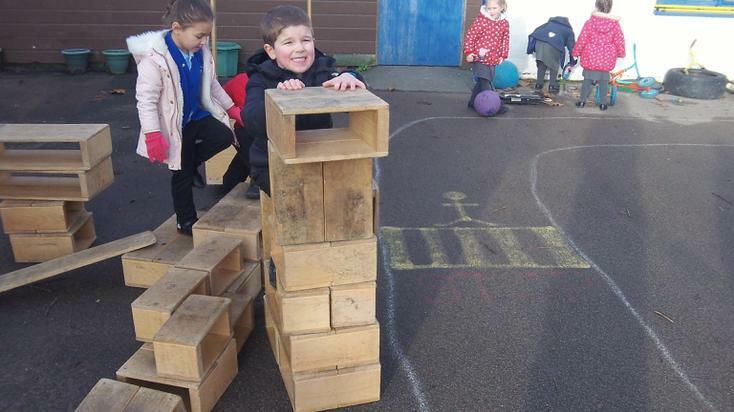 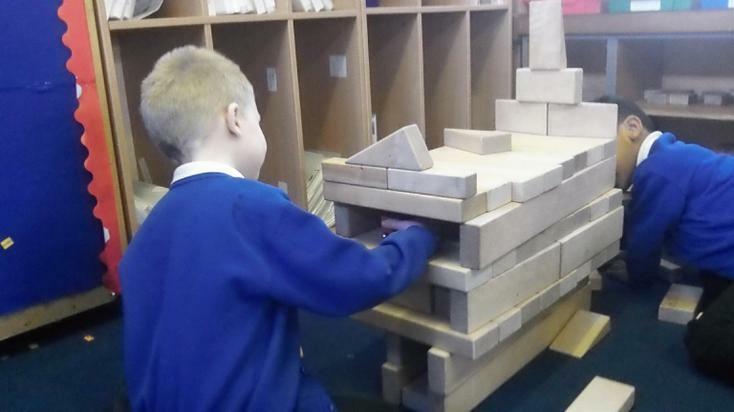 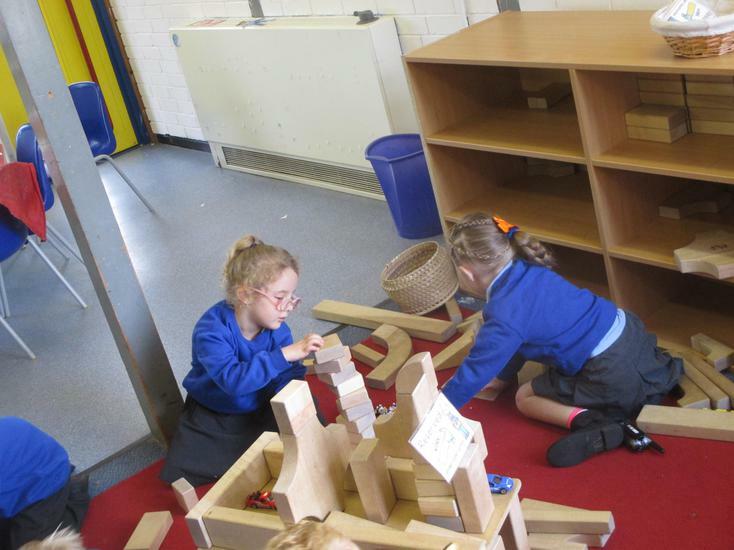 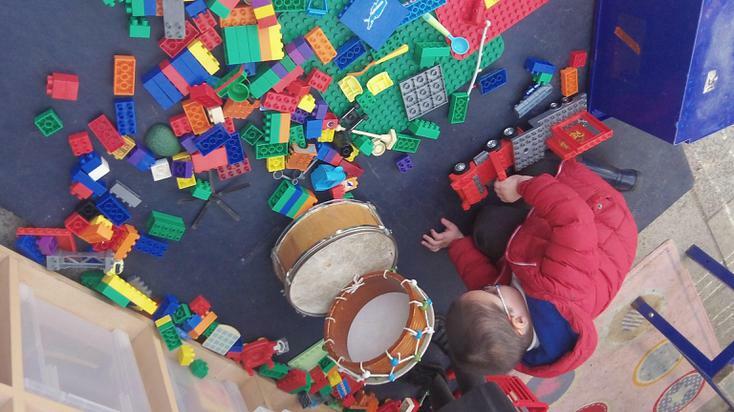 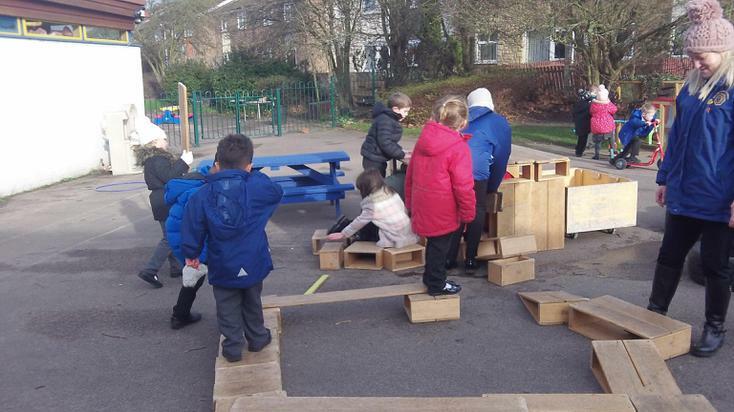 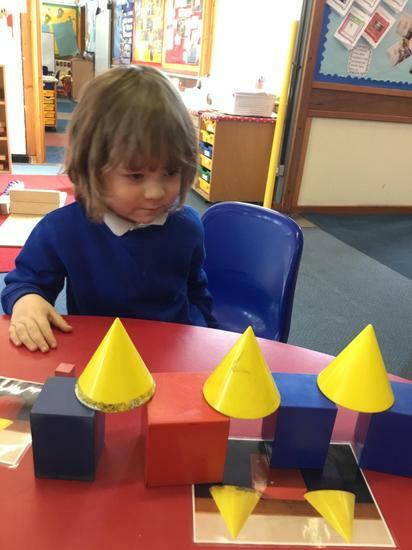 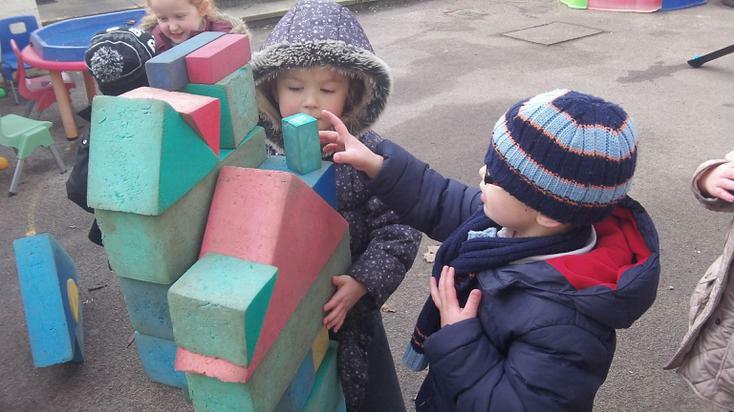 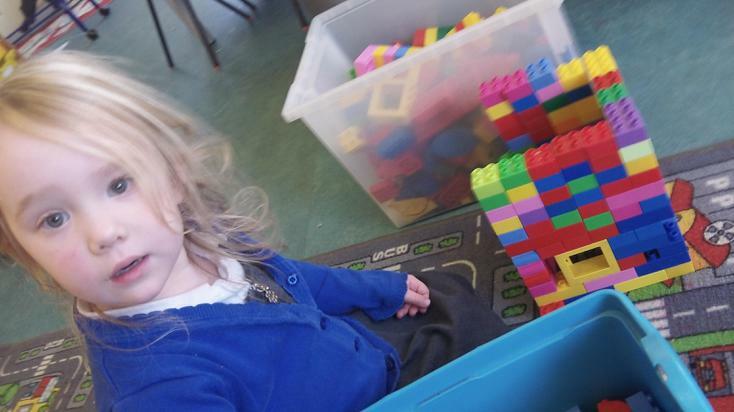 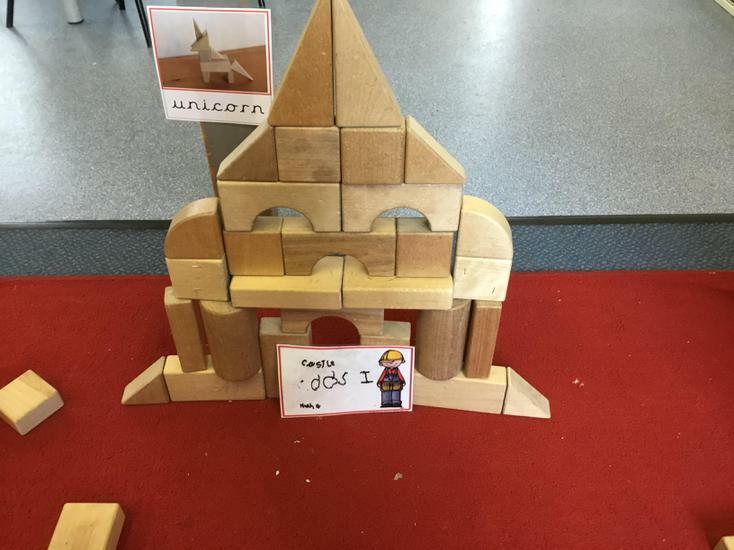 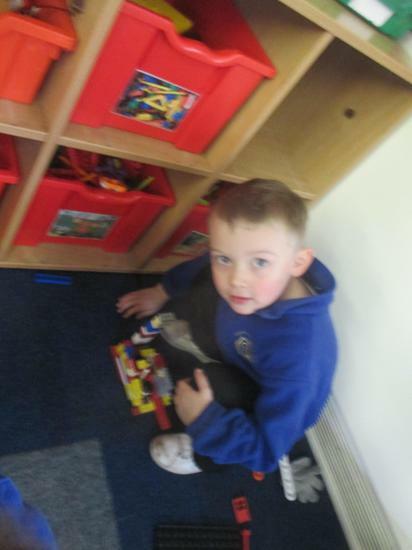 The children will continue to develop their skills with the much loved variety of construction kits by planning and building more amazing structures! 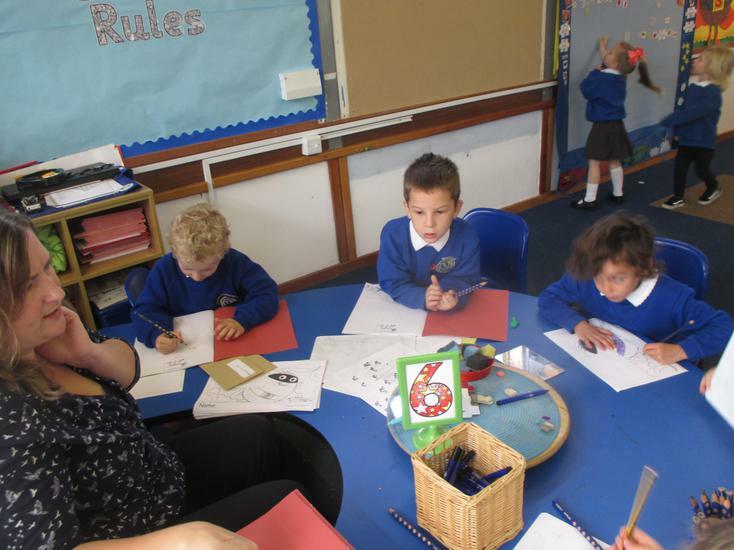 We welcome a new academic year with a fabulous new class of children. 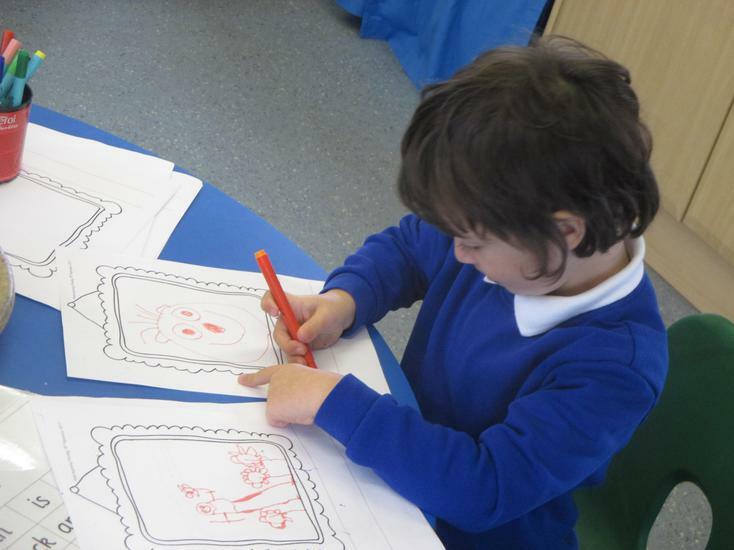 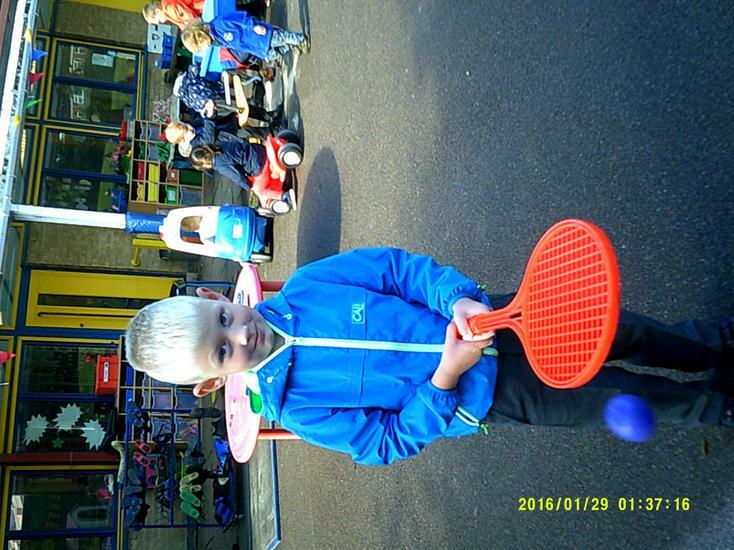 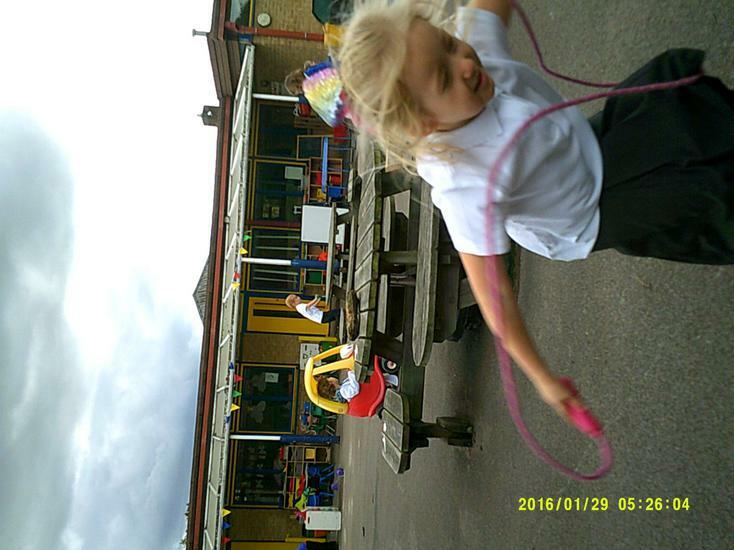 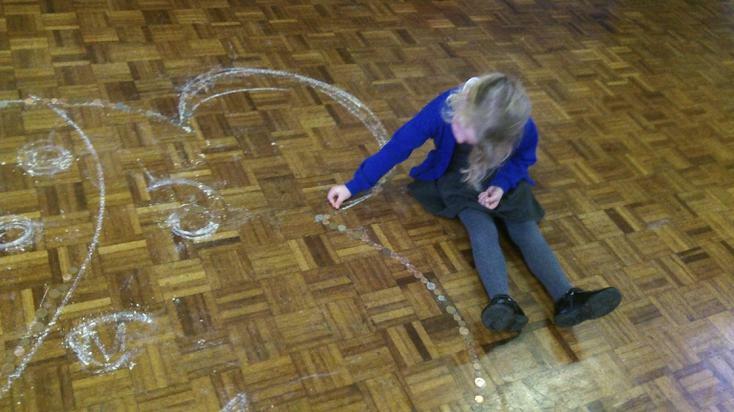 This term we learn all about 'Ourselves'. 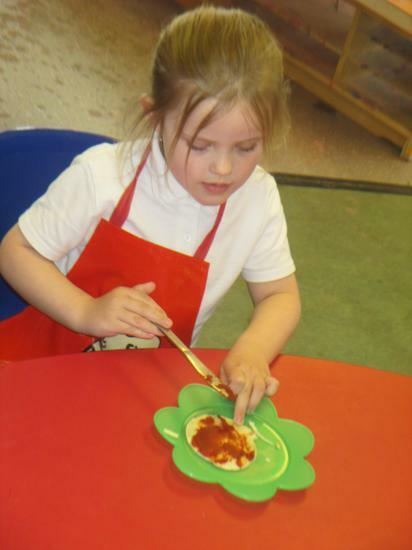 We will learn about our bodies and investigate our senses. 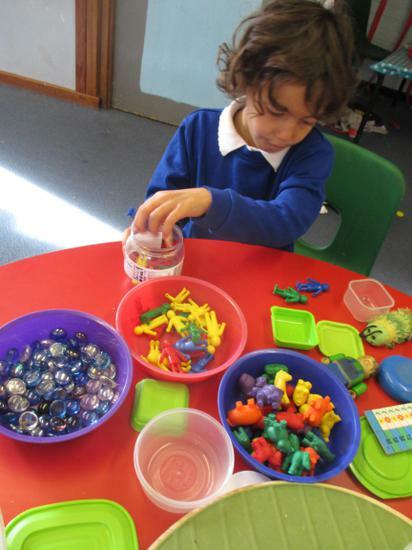 We will talk about our favourite things and our families, celebrating the ways we are different. 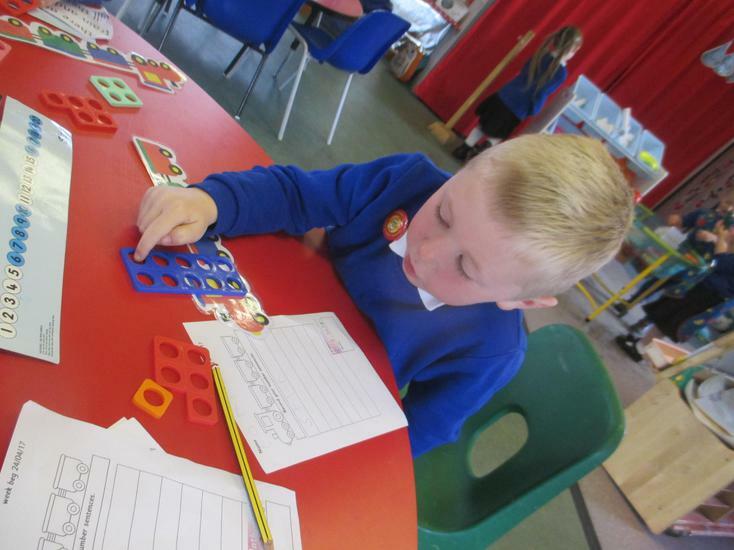 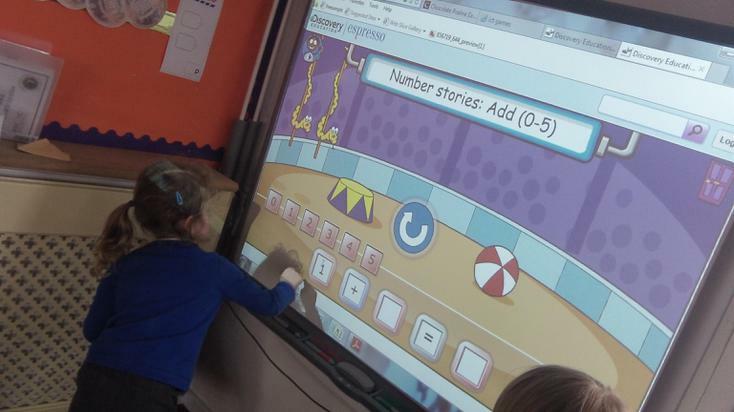 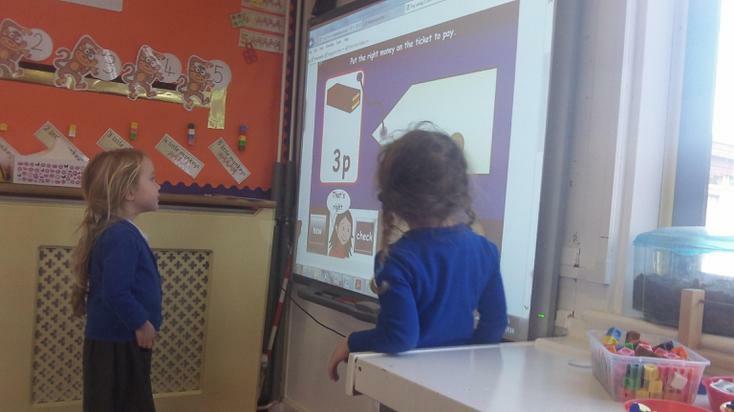 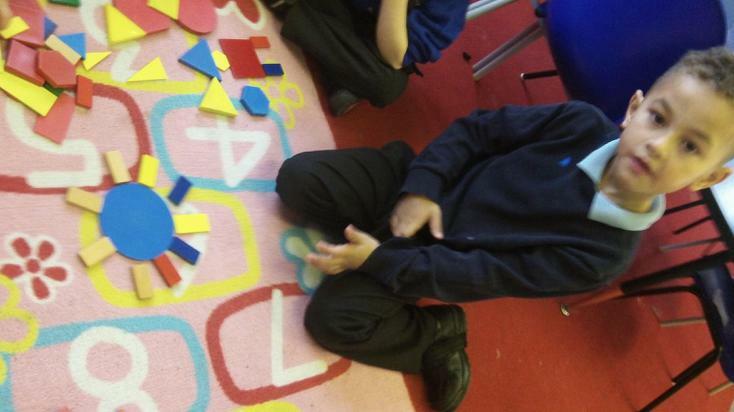 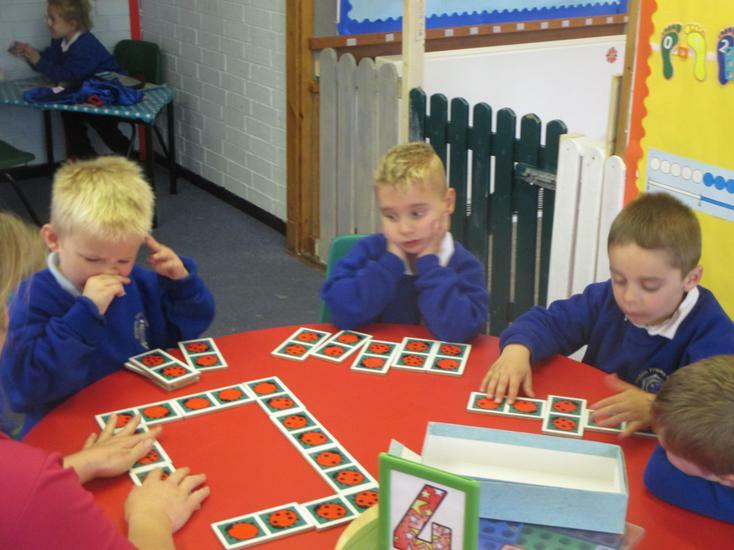 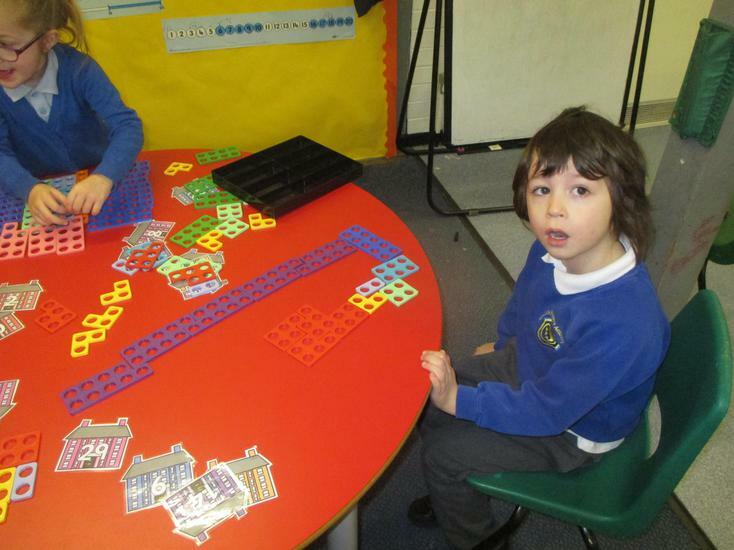 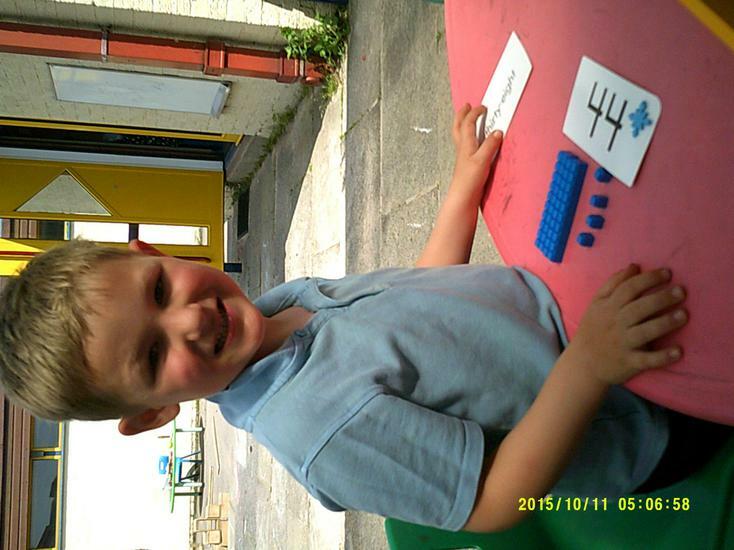 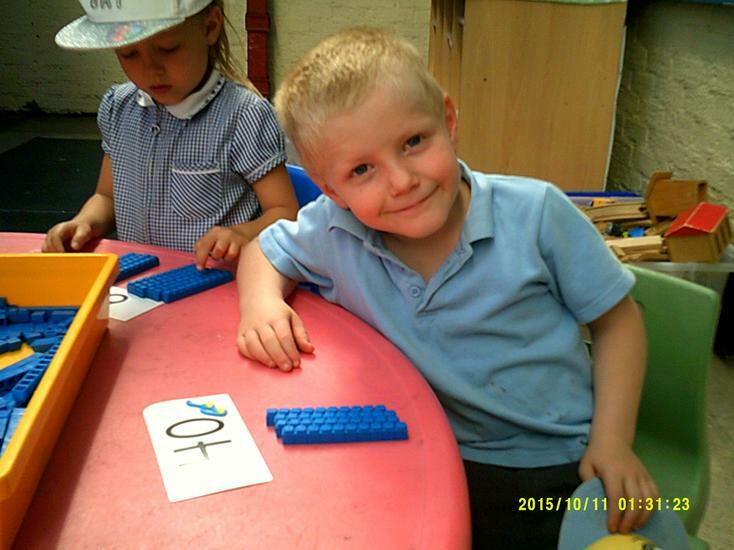 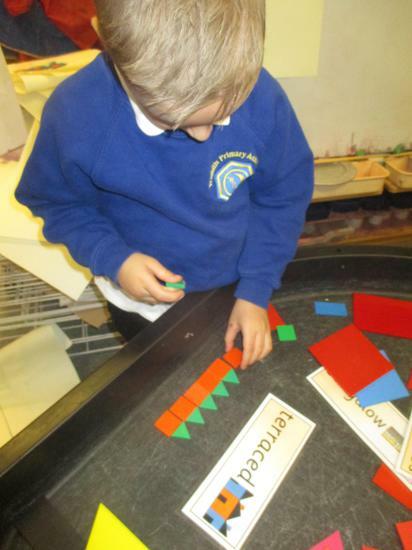 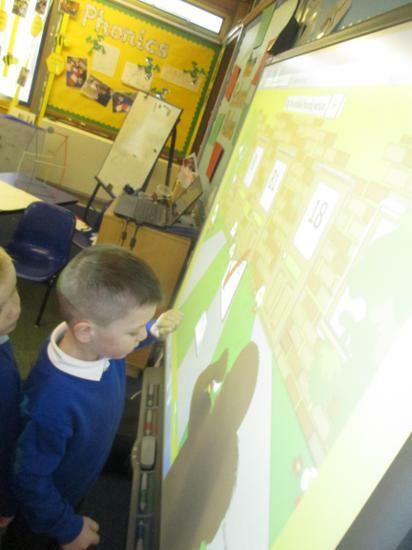 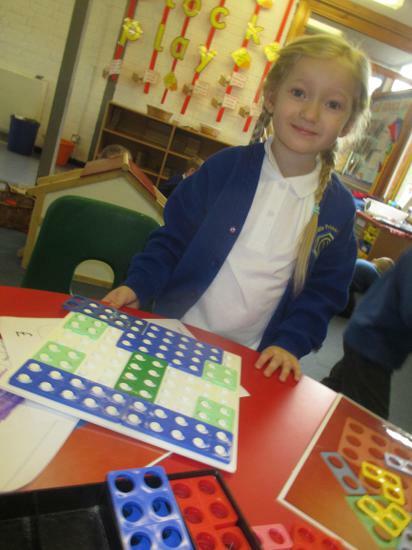 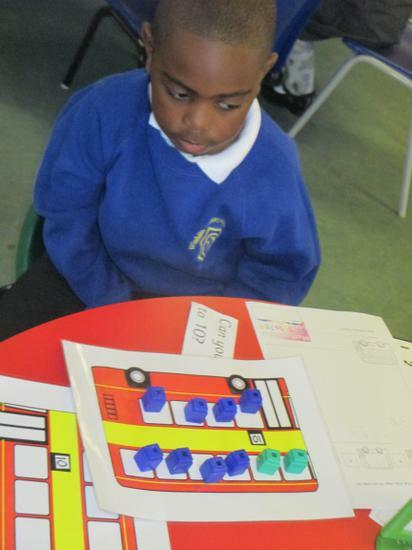 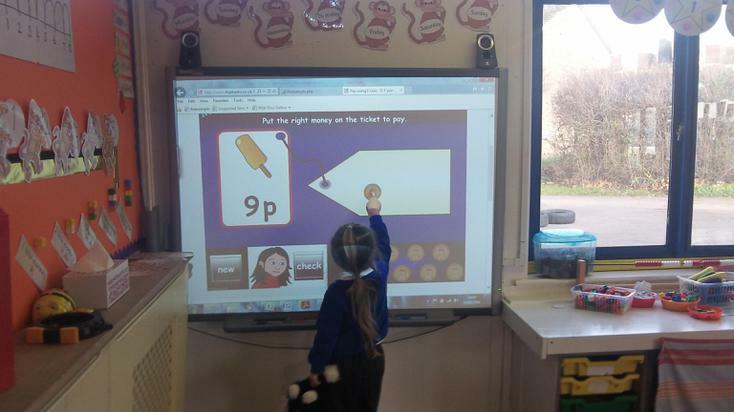 We will continue to develop our phonics and early maths skills, focusing on ordering numbers and addition. 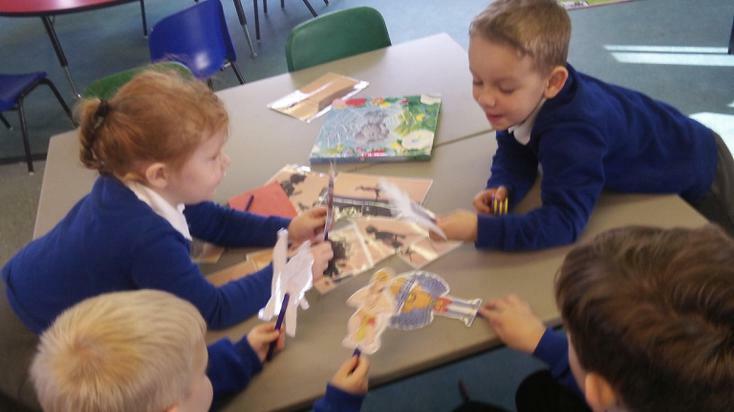 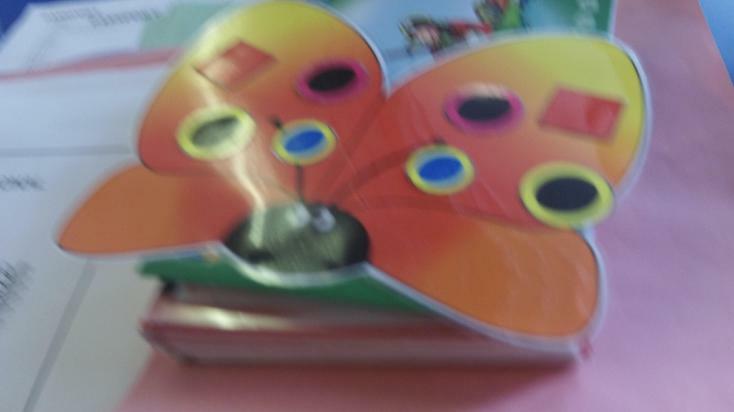 We will be sharing superhero books and talking about our special powers and talents! 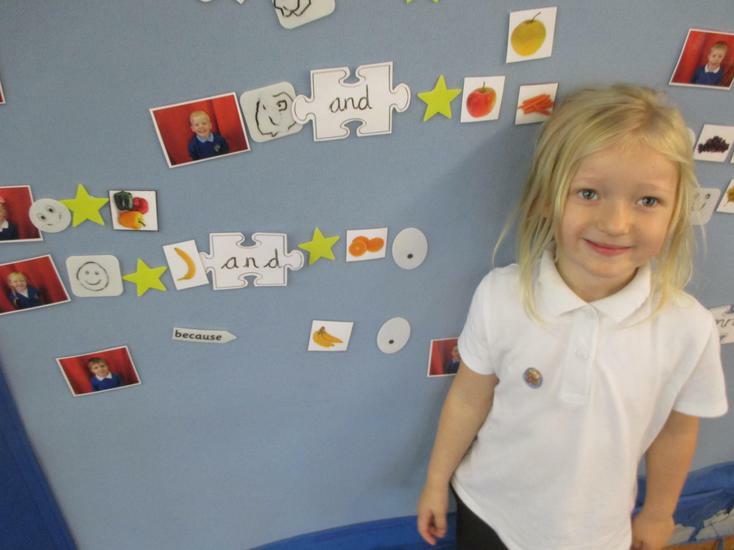 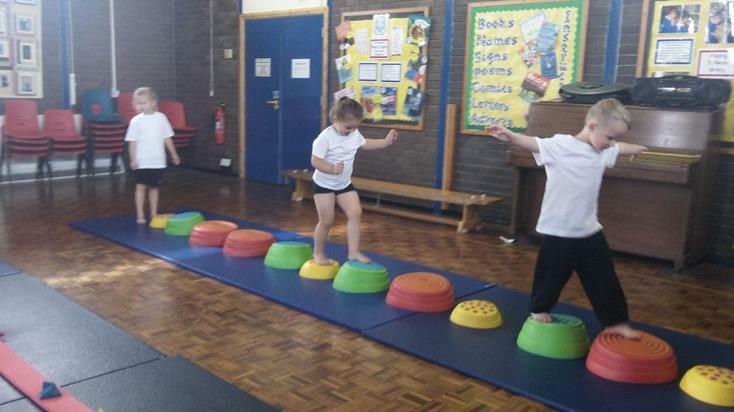 This term we are continuing our journey towards our early learning goals and beyond. 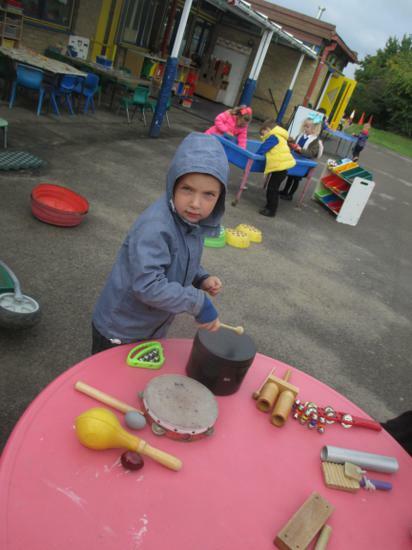 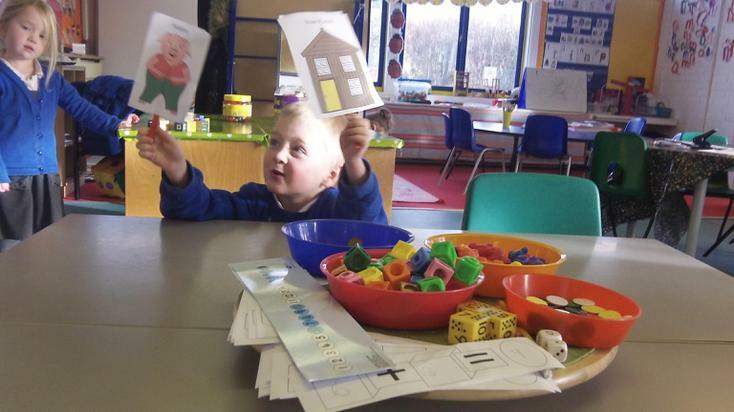 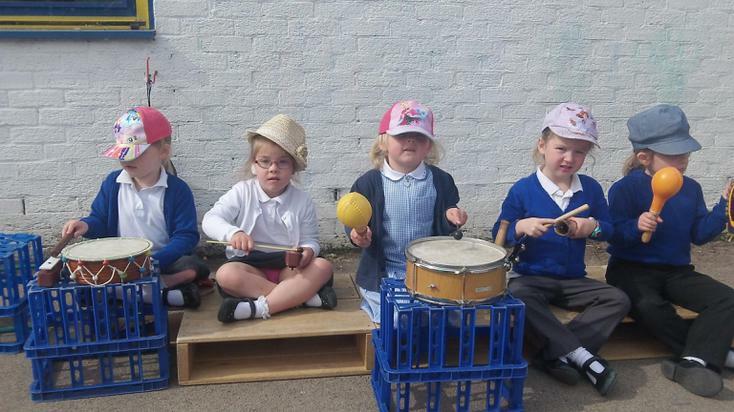 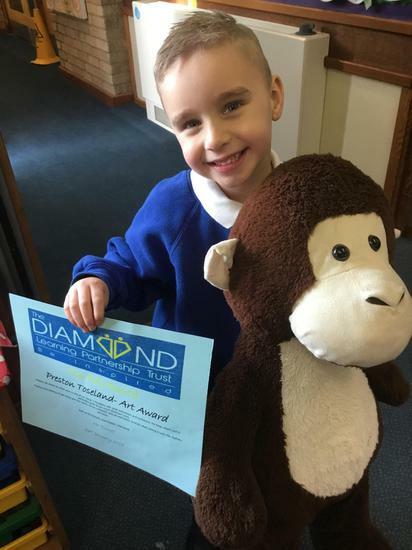 Use the link below to 'Development Matters' to see how you can support your child to fulfil their potential. 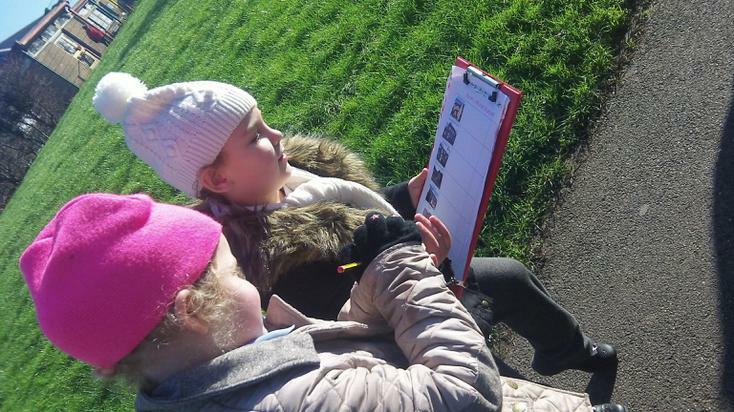 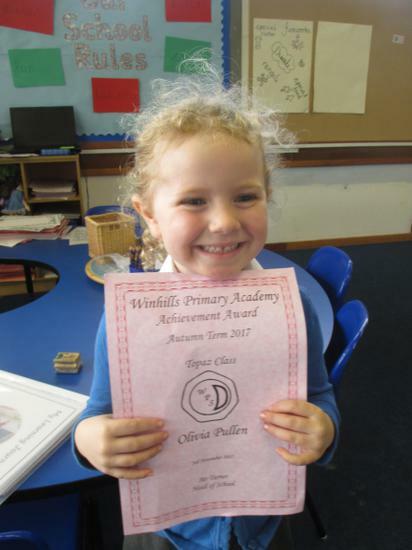 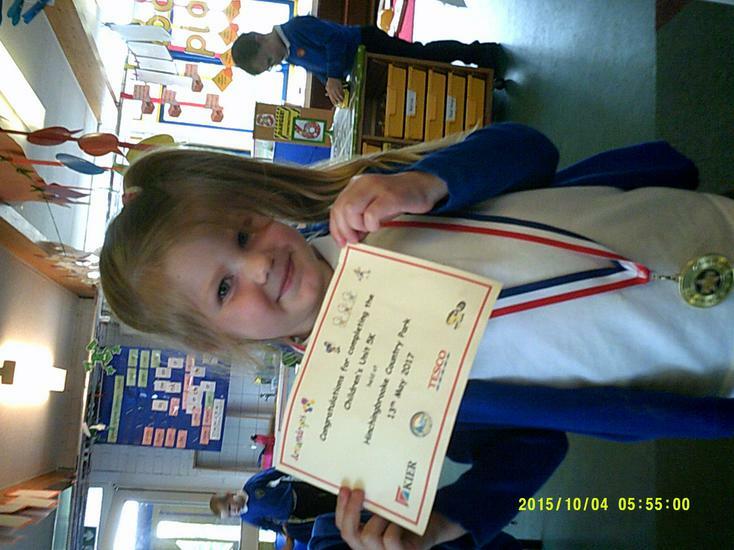 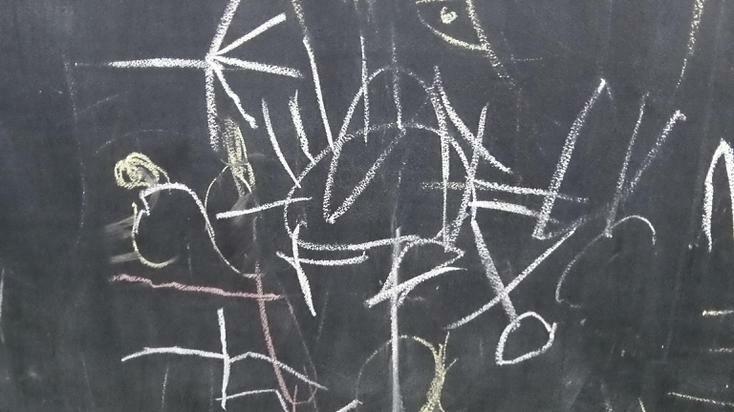 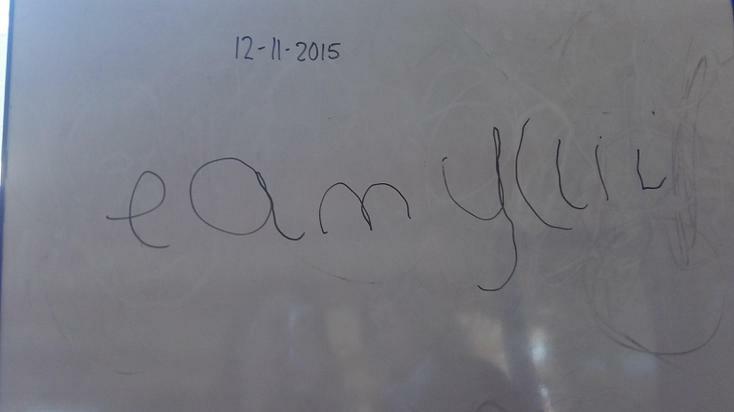 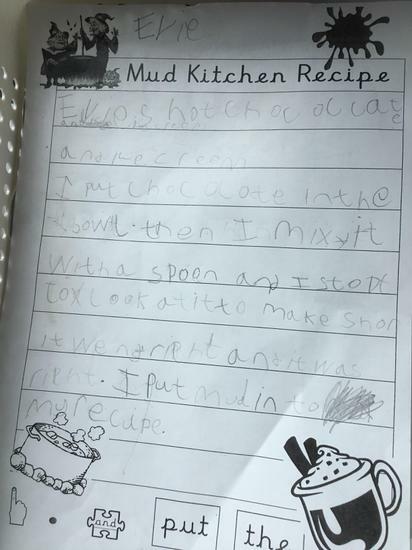 Remember you can add to your child's learning journal; just send us a photograph or share your proudest moments with us. 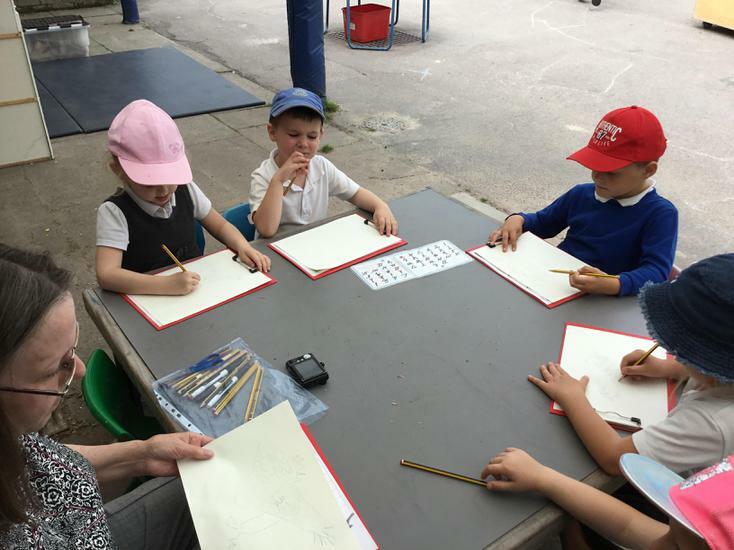 Welcome to the summer term! 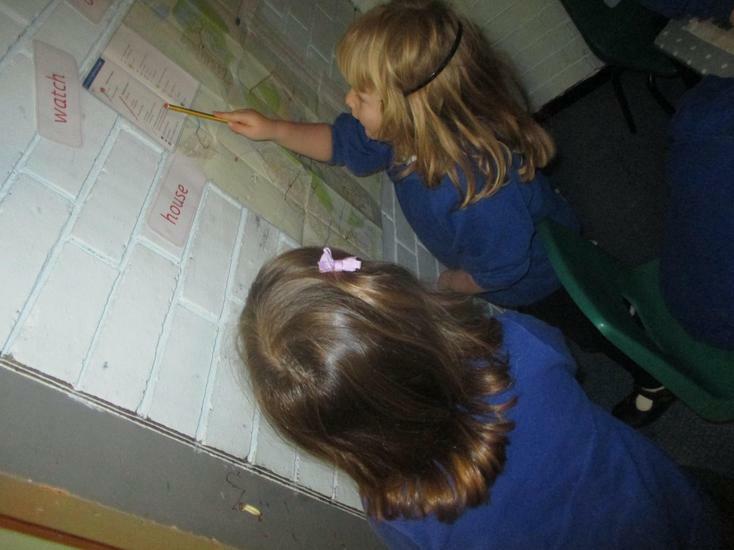 This term we are learning about journeys. 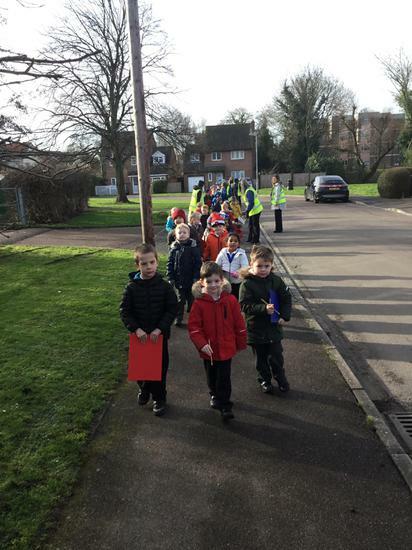 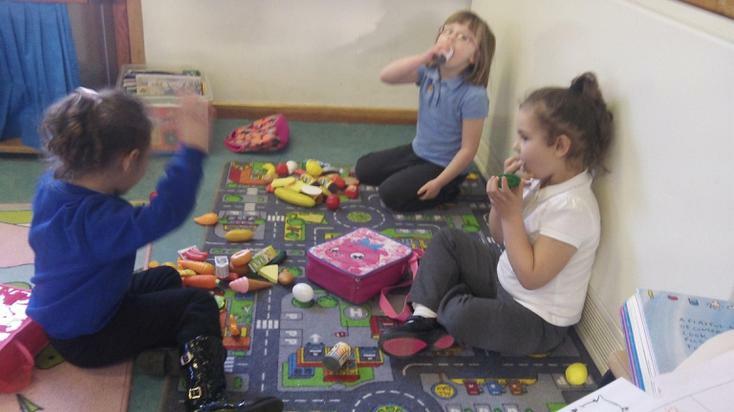 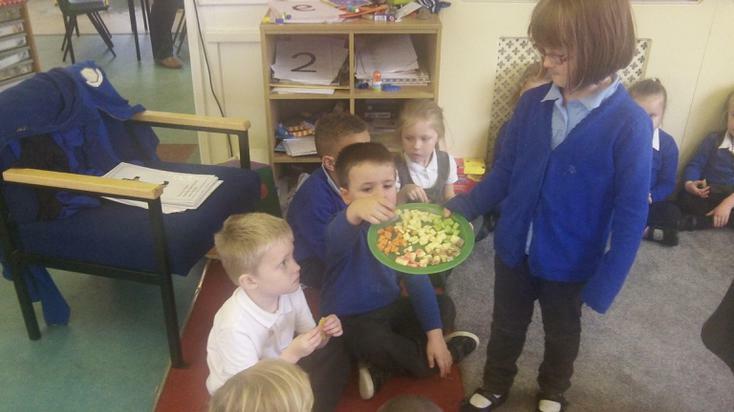 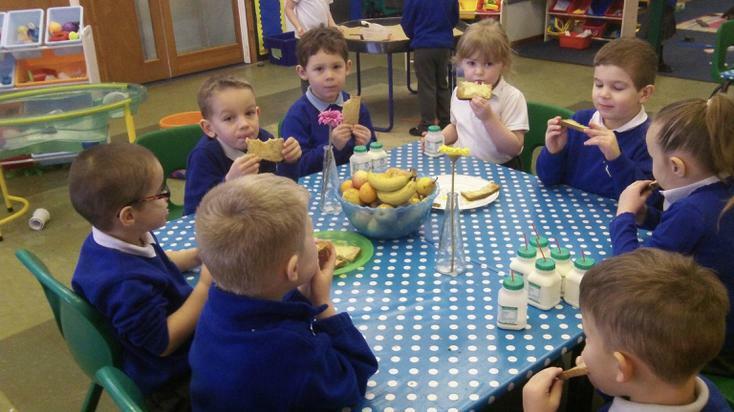 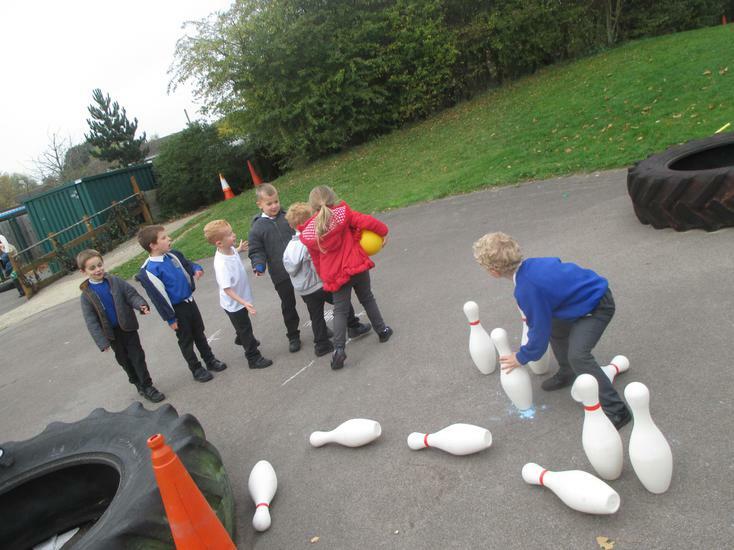 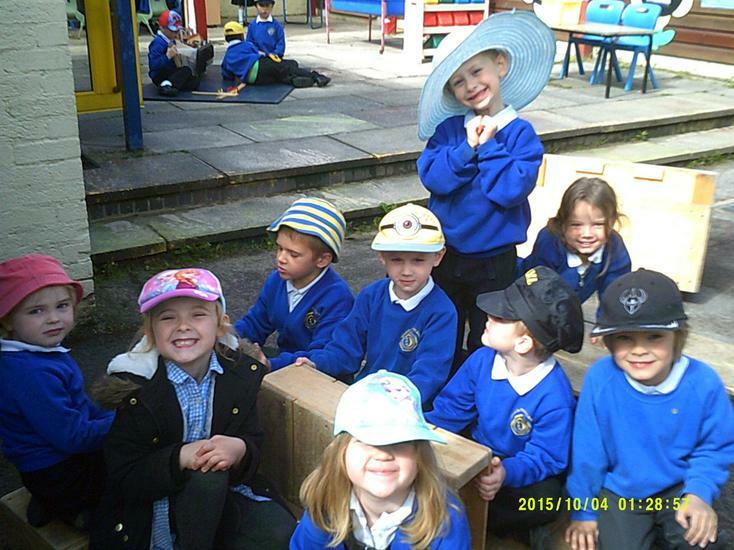 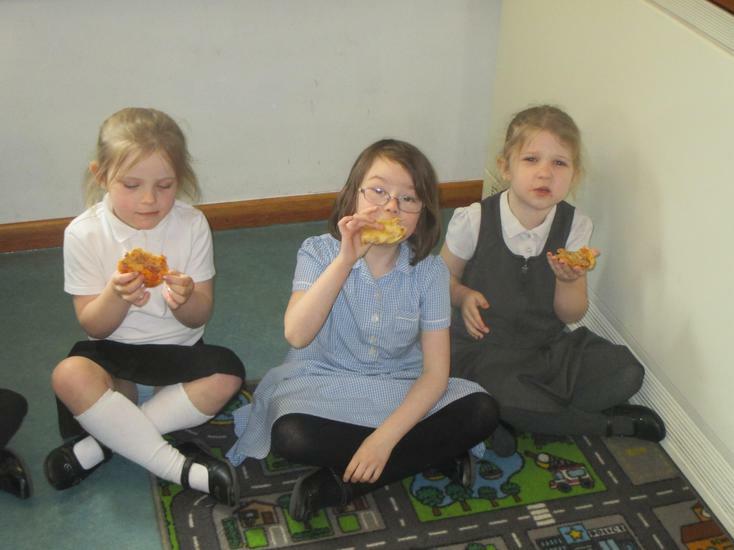 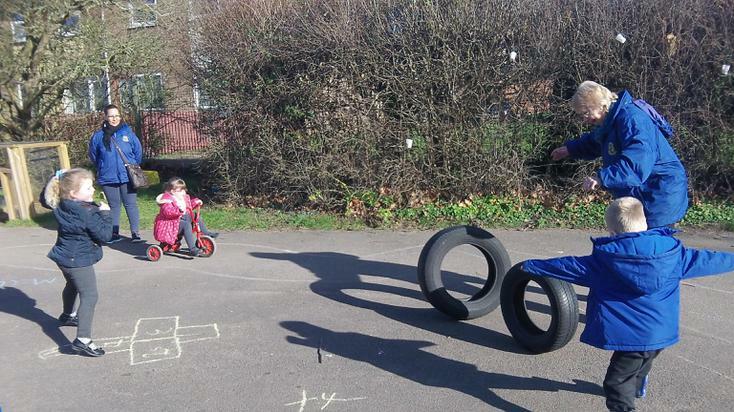 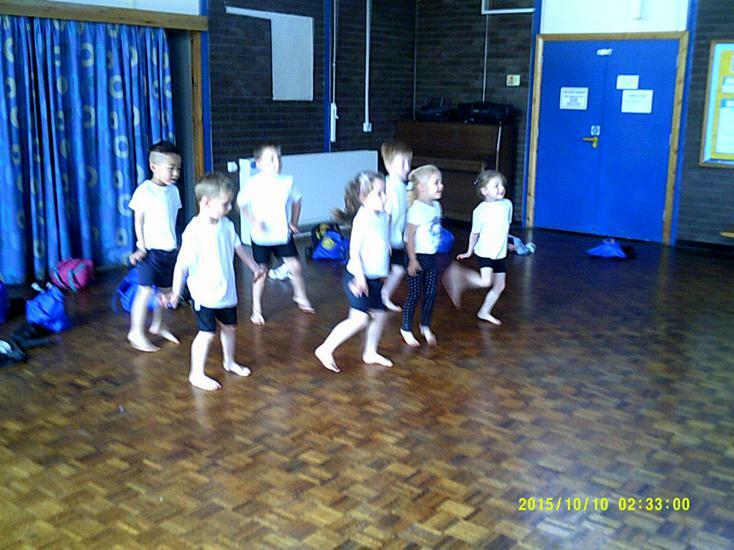 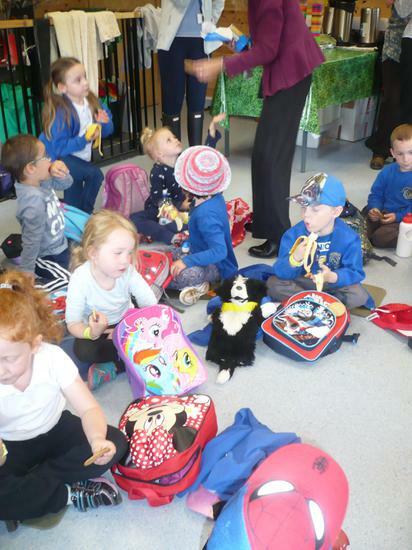 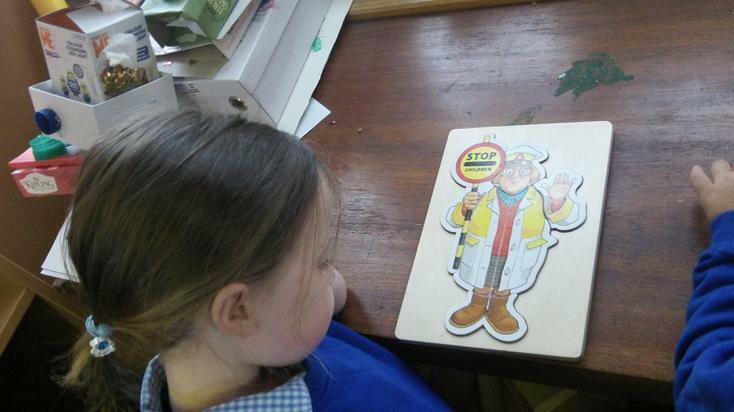 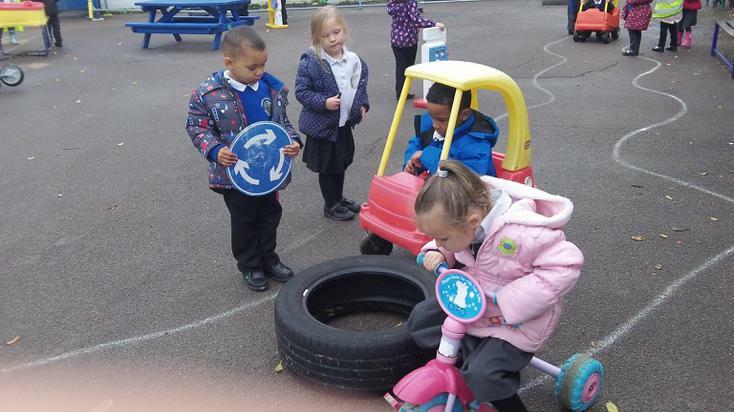 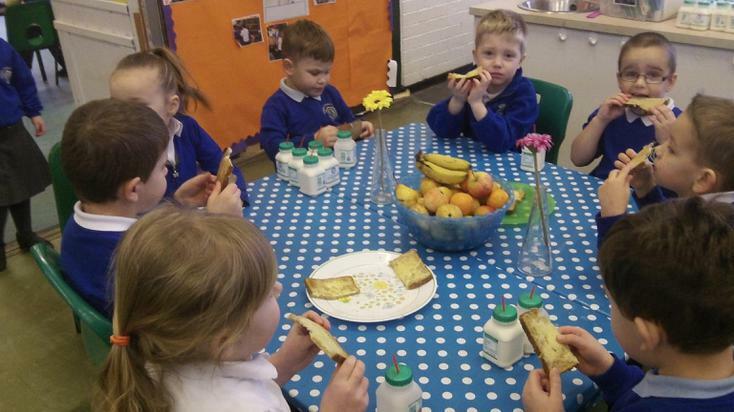 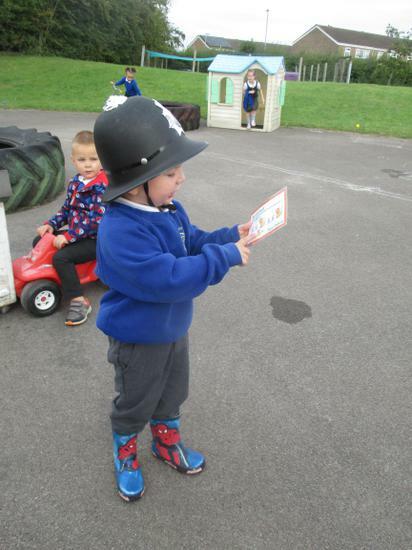 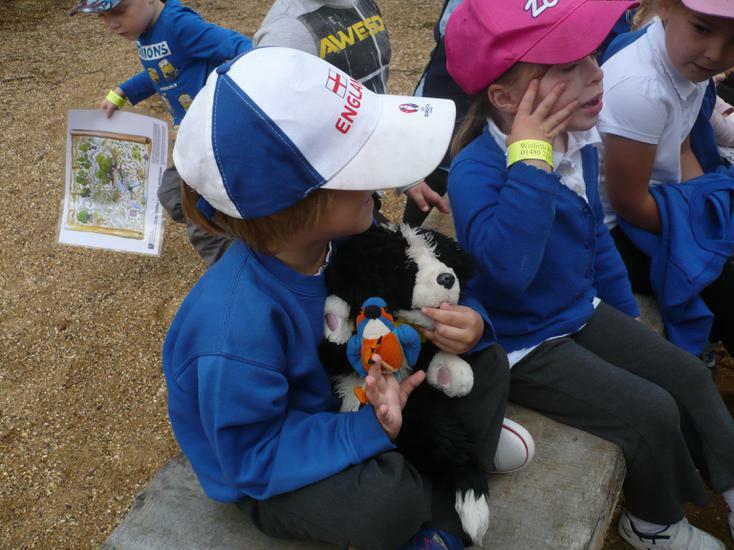 We will plan and take more walks around the local area; preparing picnics and learning more about road safety. 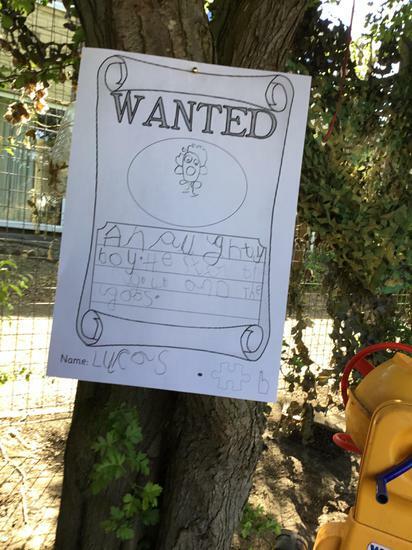 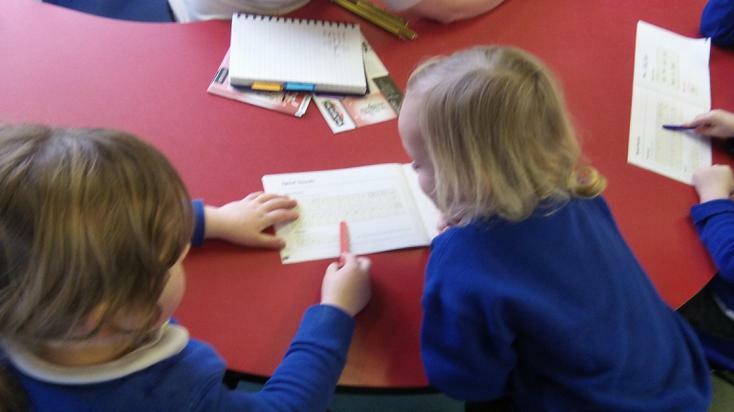 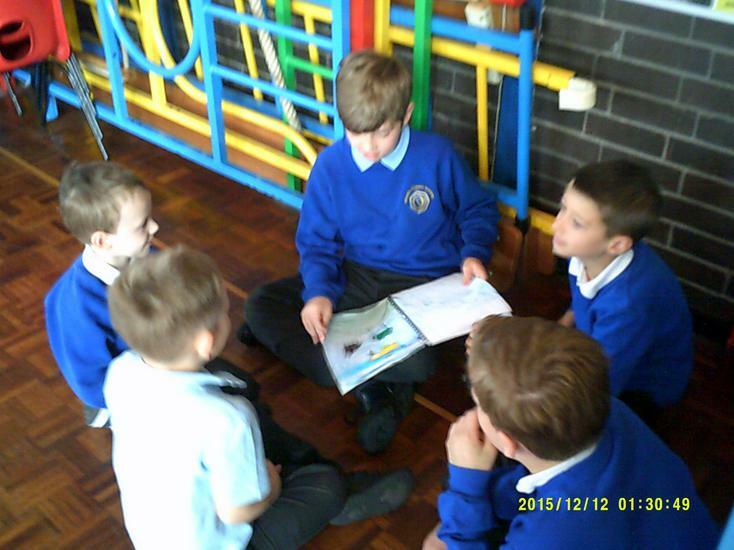 Our shared writing will focus on adventure texts which will develop our skill of story mapping. 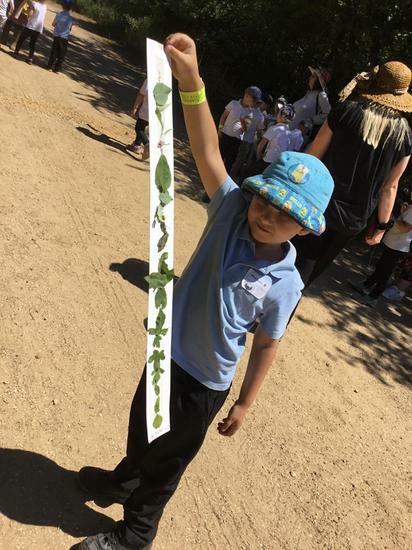 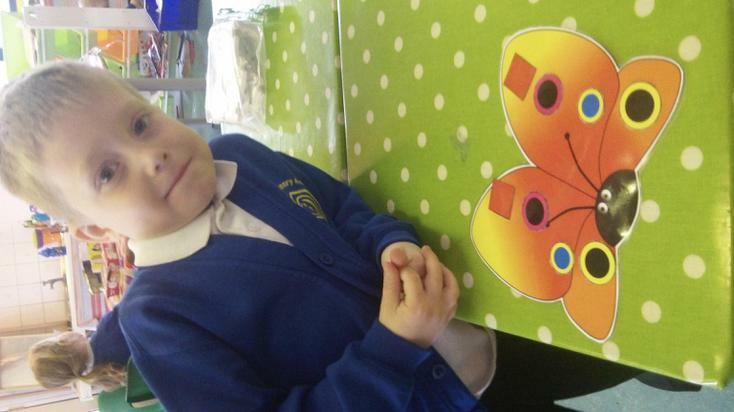 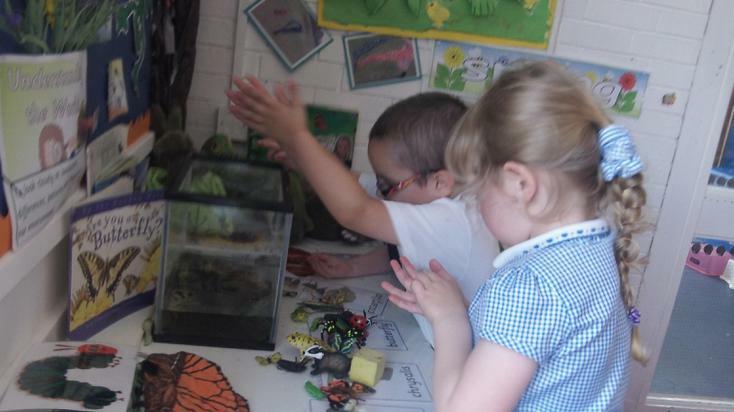 We will follow tadpoles and caterpillars on their journey to becoming frogs and butterflies. 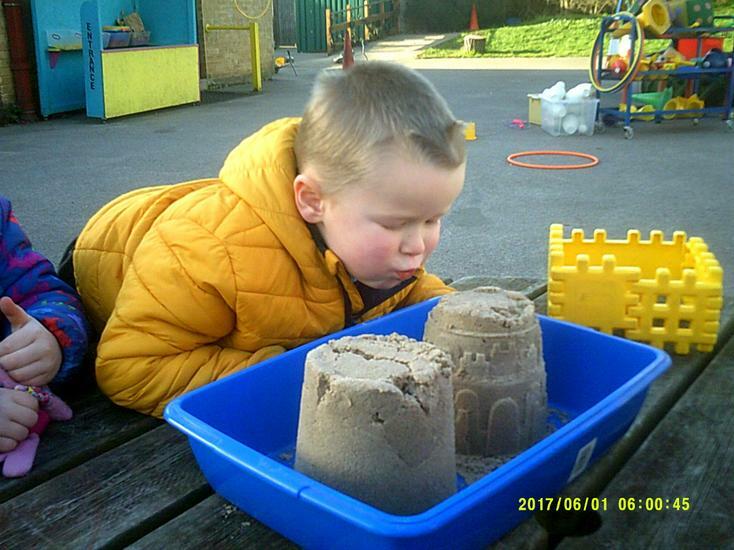 We will share stories of our holidays and favourite places to visit as well as reviewing what Biskit has been up to over the past year. 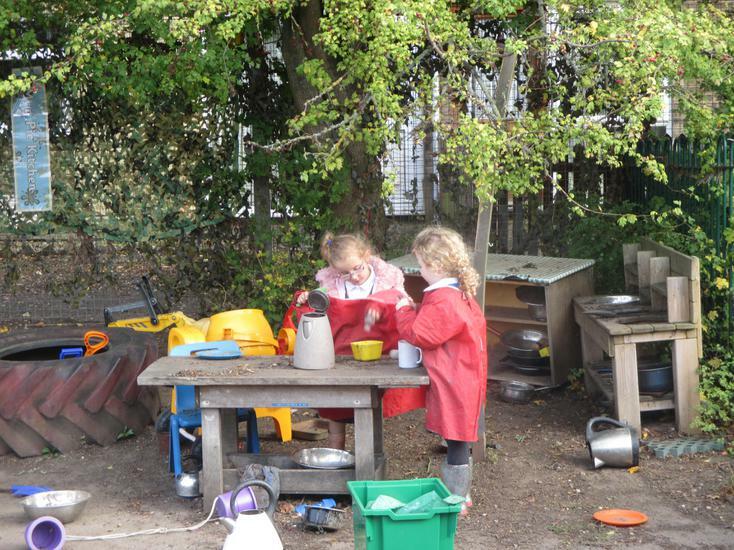 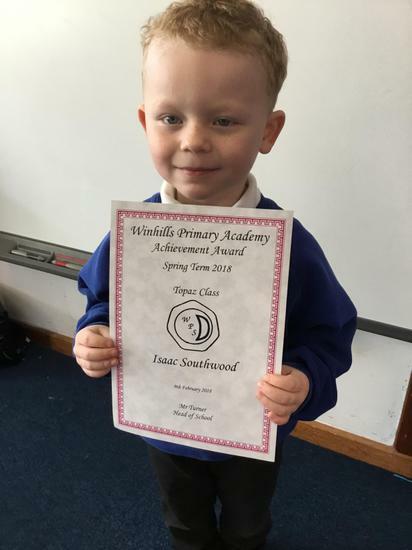 A very busy time ahead as we prepare for the next step to our journey at Winhills. 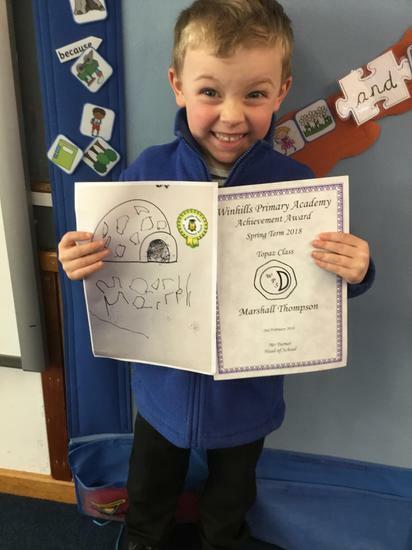 We are very excited to start our Spring Term 2016. 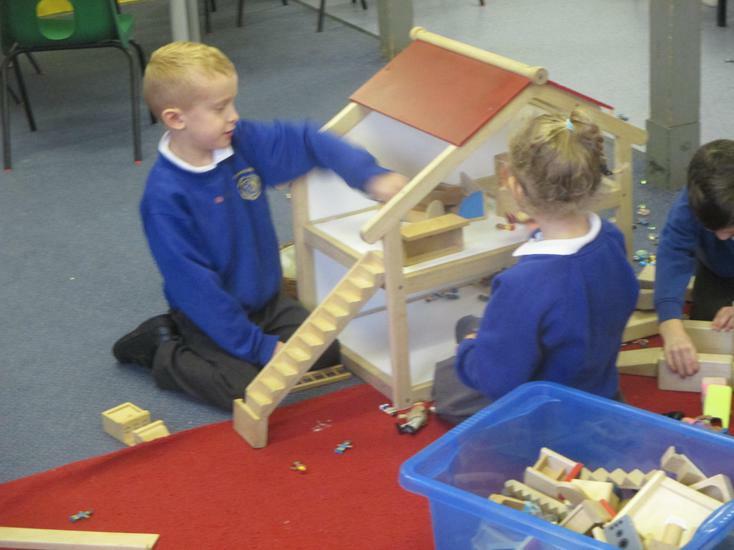 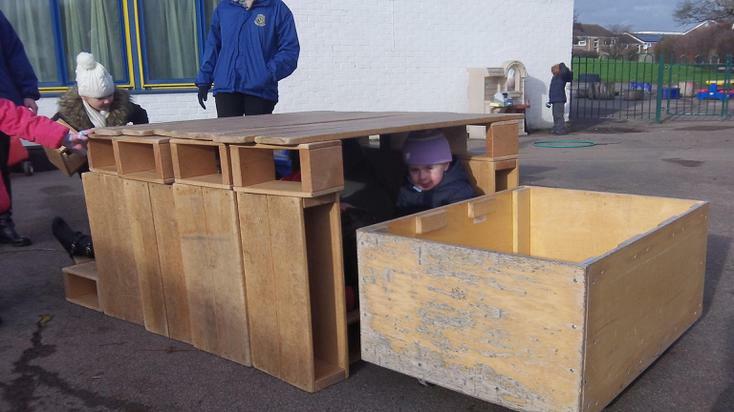 This term we are learning under the theme of 'Homes'. 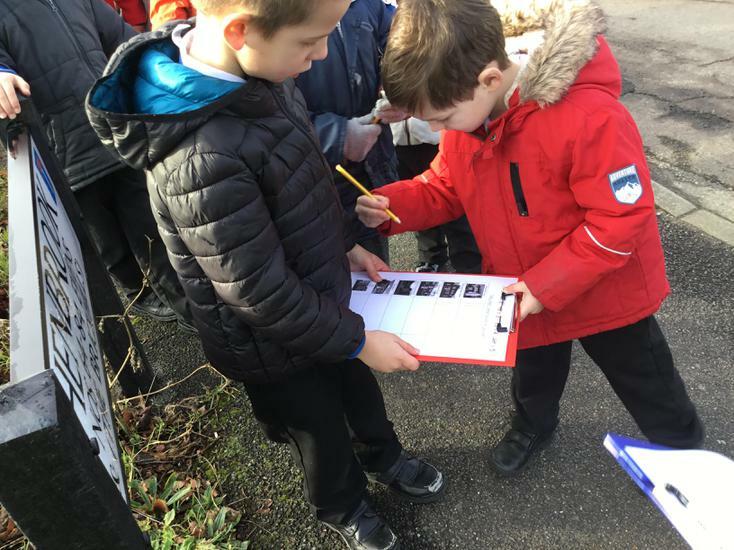 We will be walking in our local area to identify features of our own environment and compare those to homes in other countries. 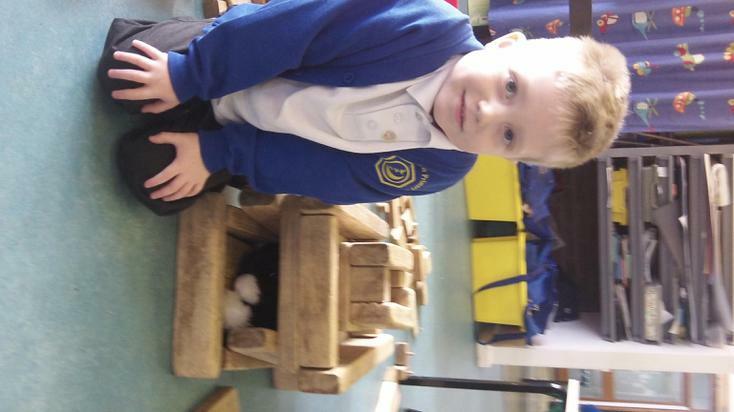 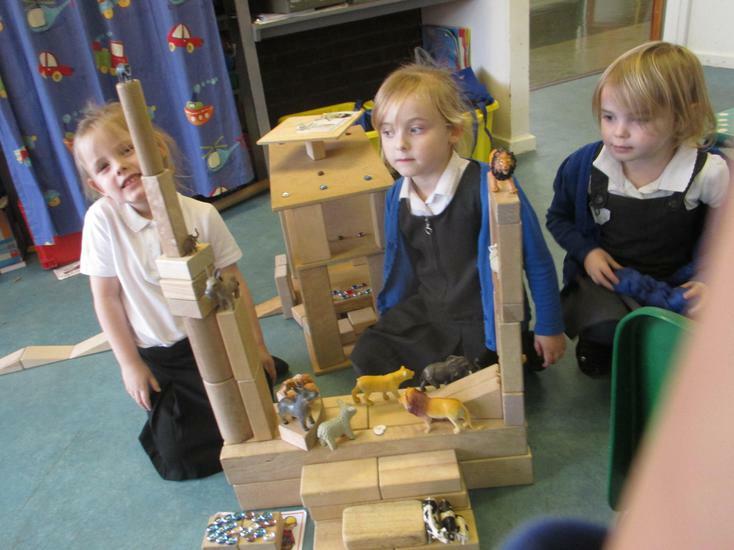 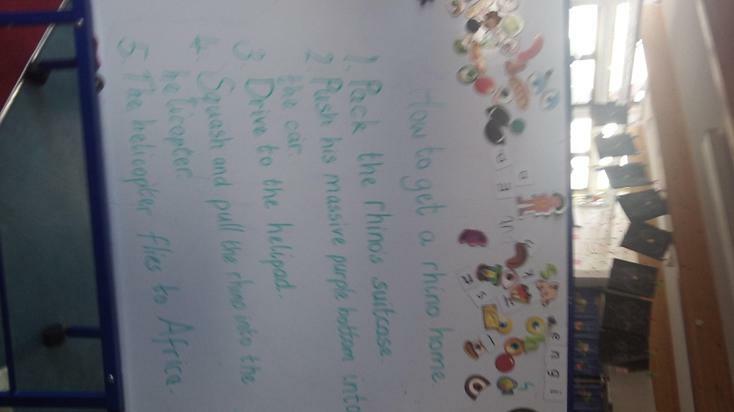 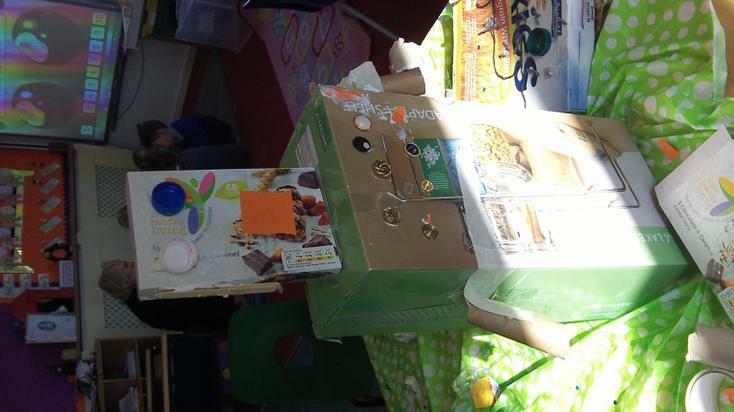 We will continue to expand our knowledge by looking at the homes of different animals. 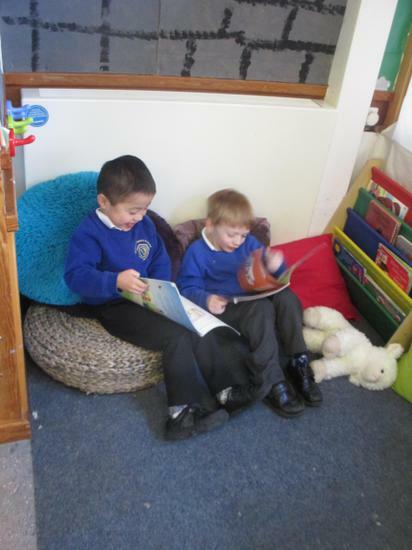 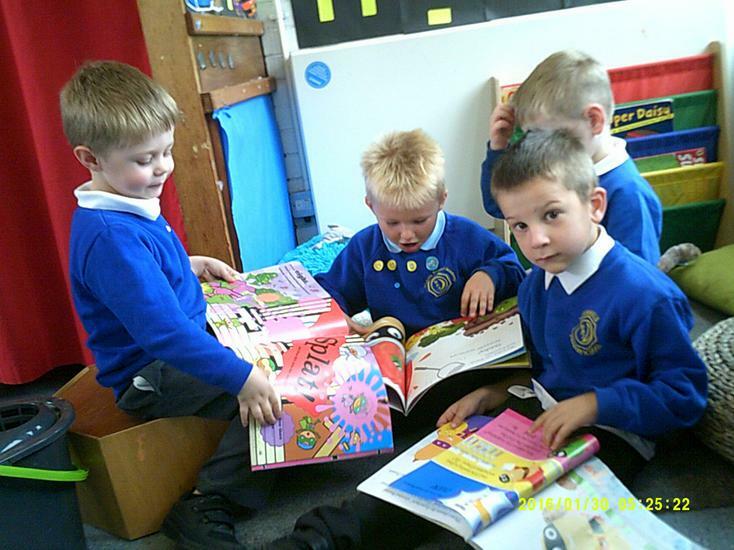 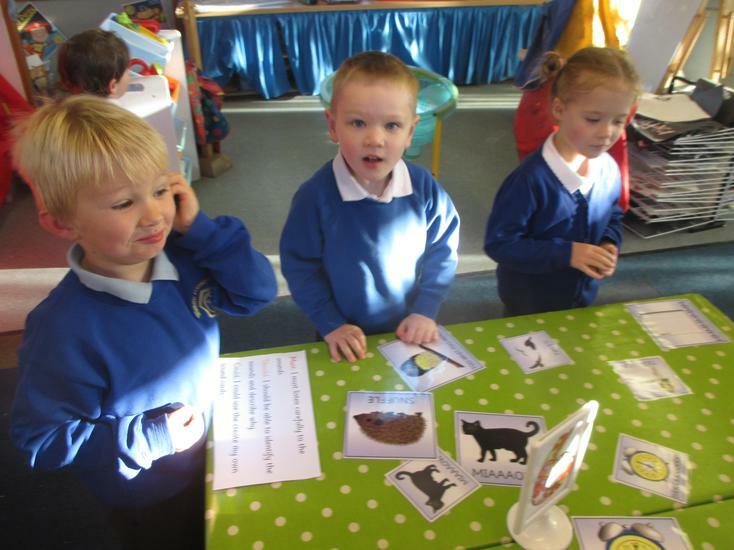 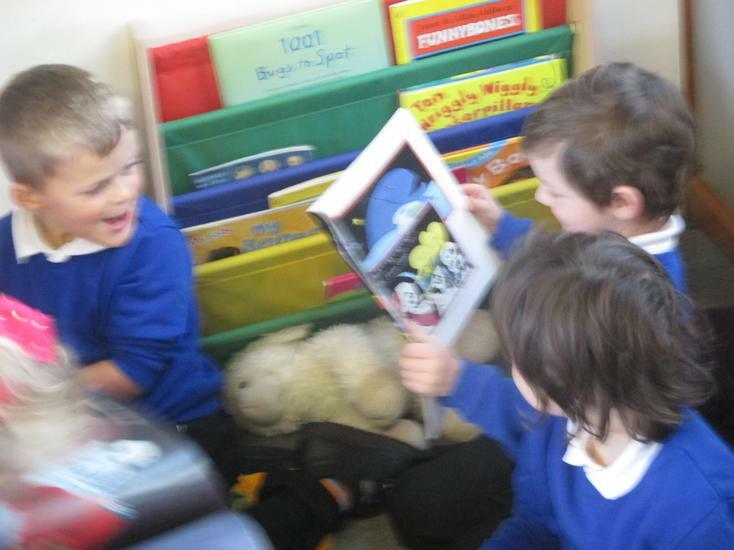 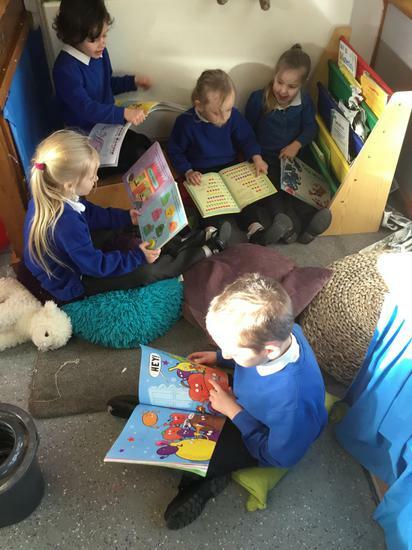 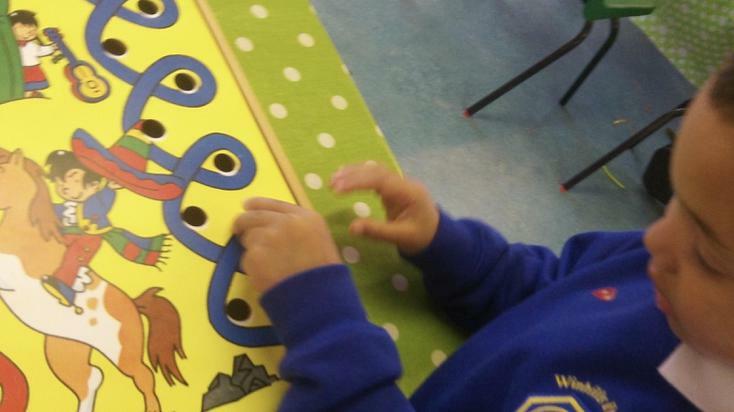 We will develop our reading skills, blending those sounds we have learnt and increasing our sight vocabulary. 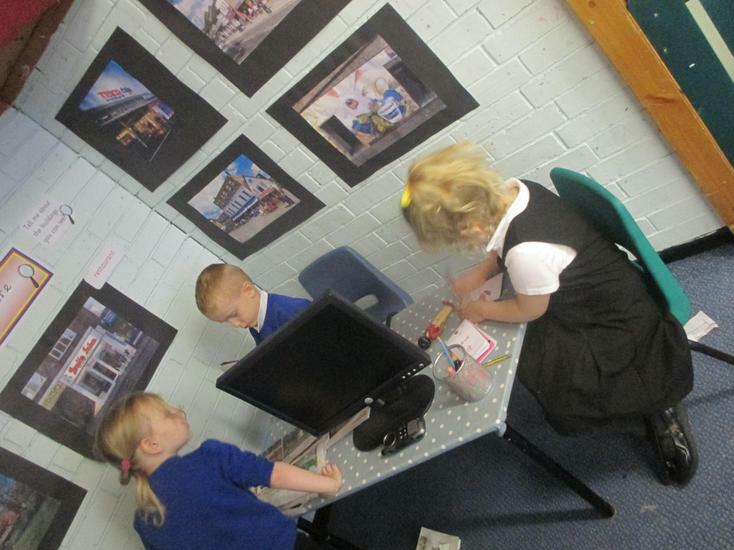 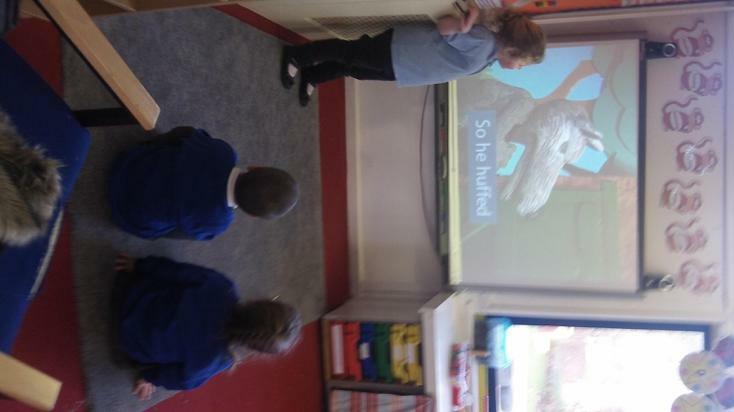 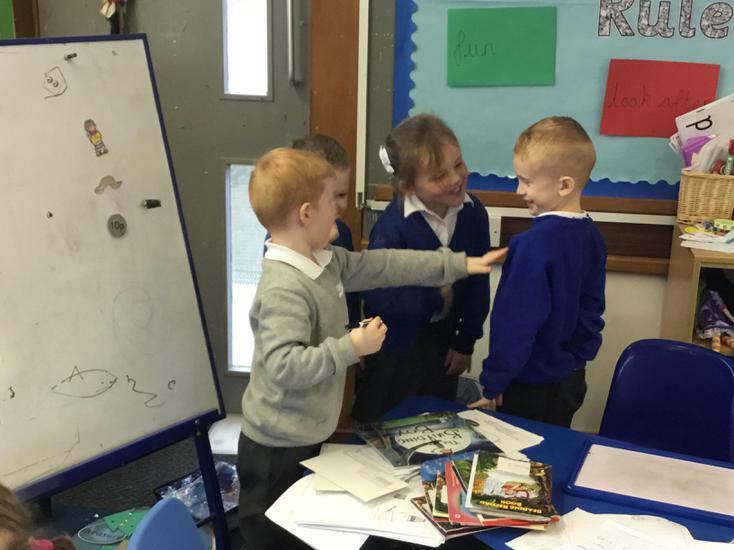 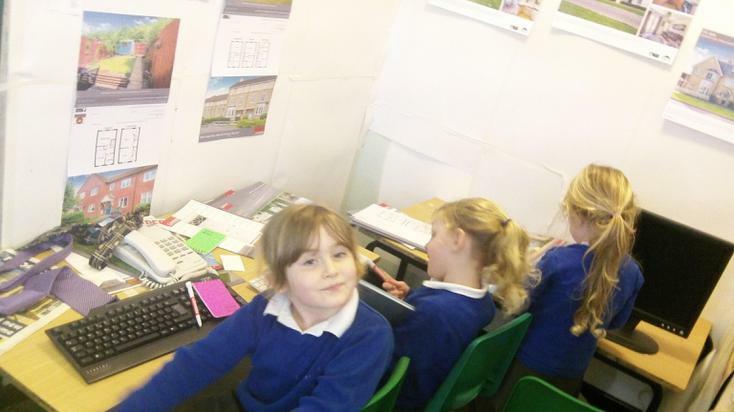 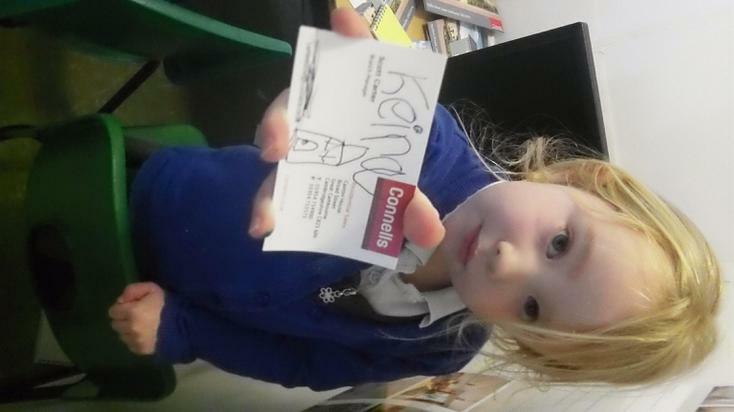 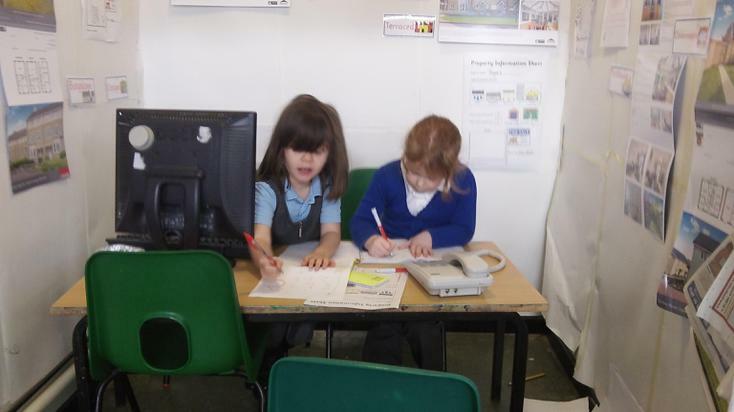 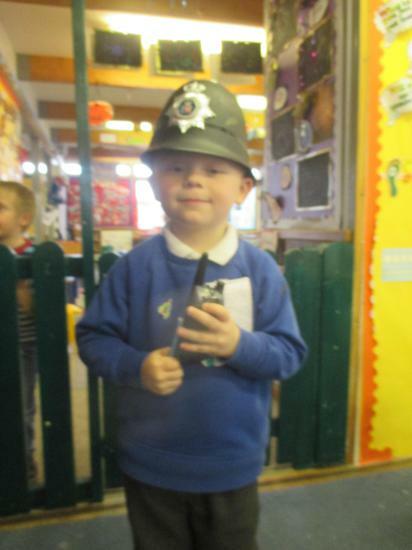 We will role play in an estate agents and quiz real estate agents that come into visit! 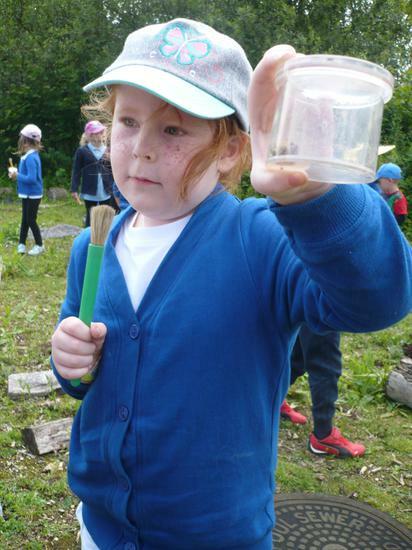 So much to look forward to! 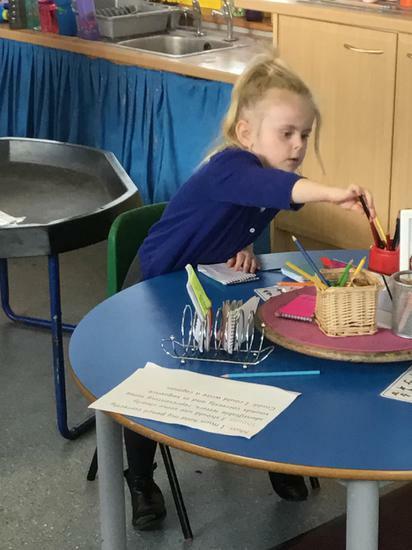 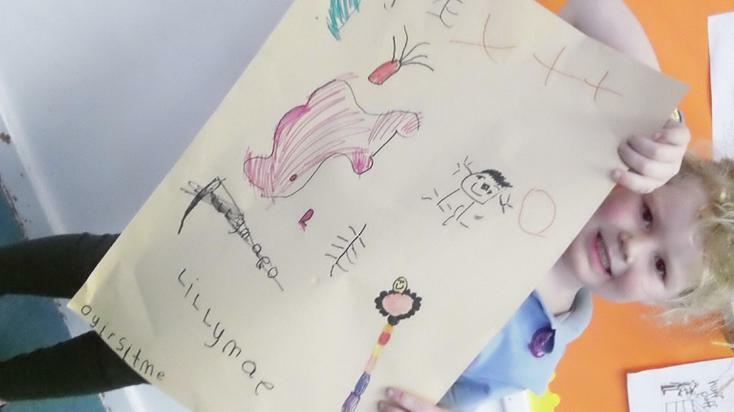 Early Years practitioners at Winhills Primary Academy follow the 'Development Matters' document to inform their planning, teaching and assessing.